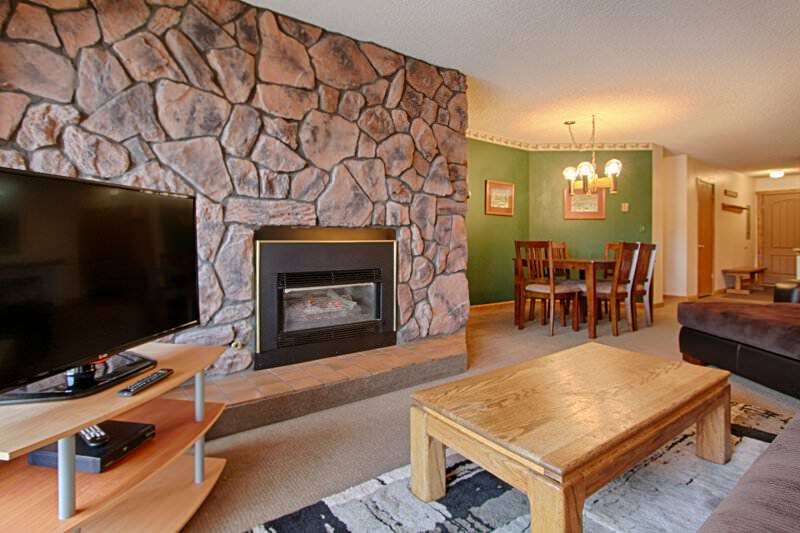 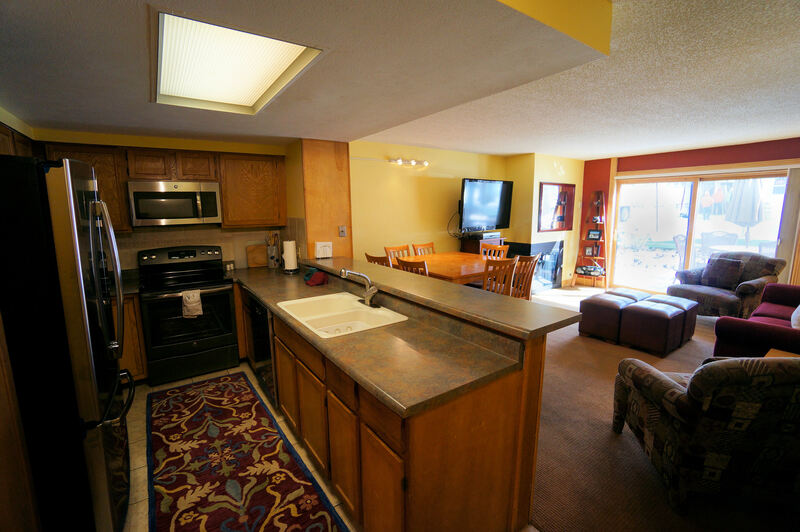 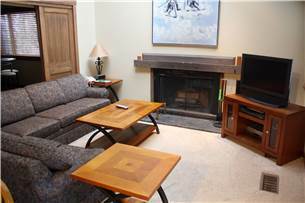 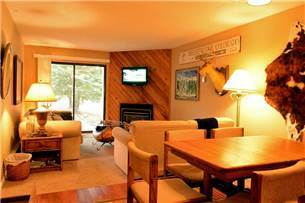 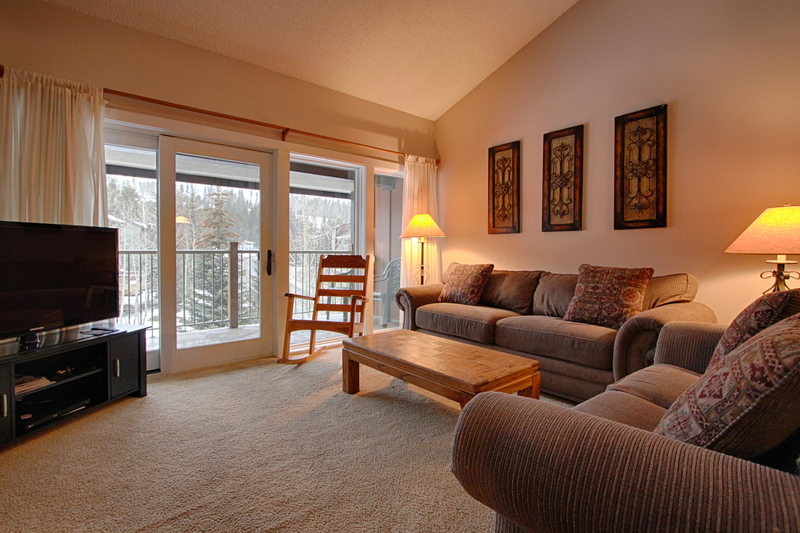 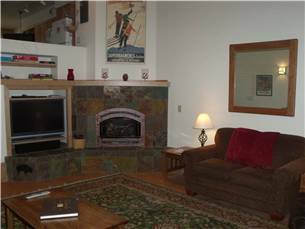 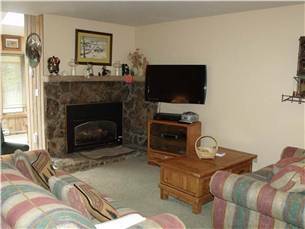 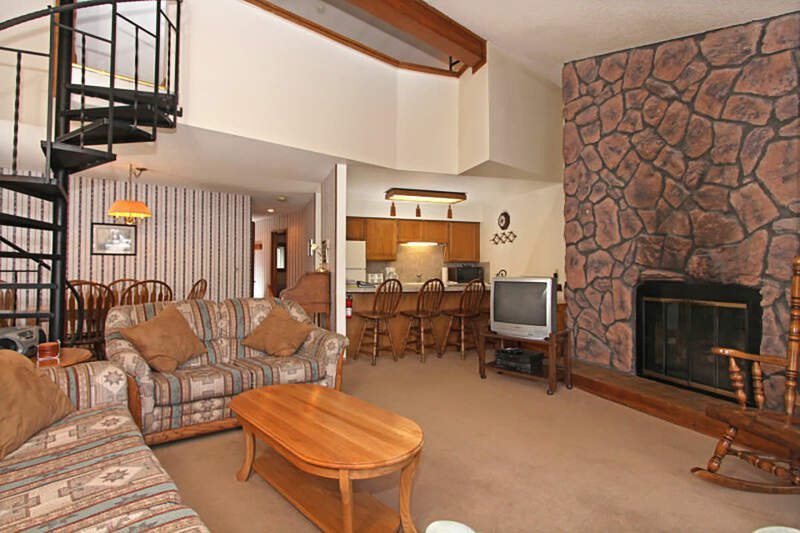 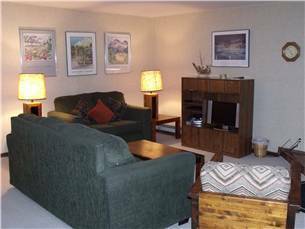 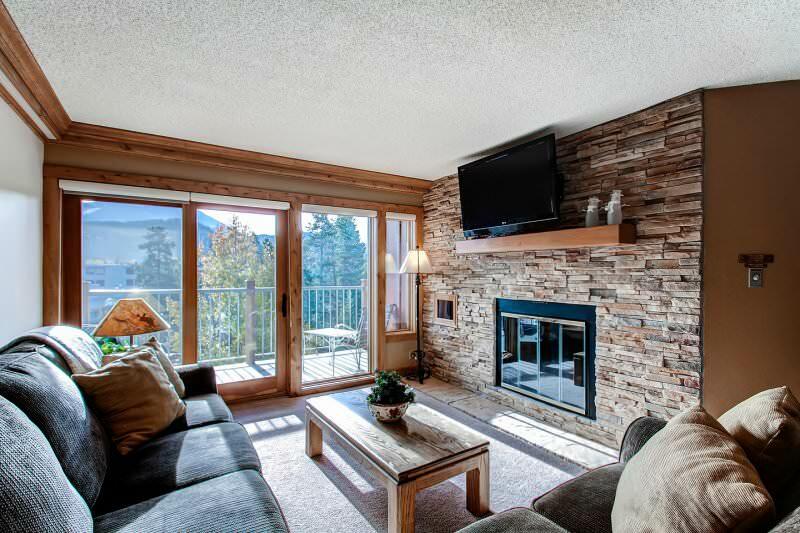 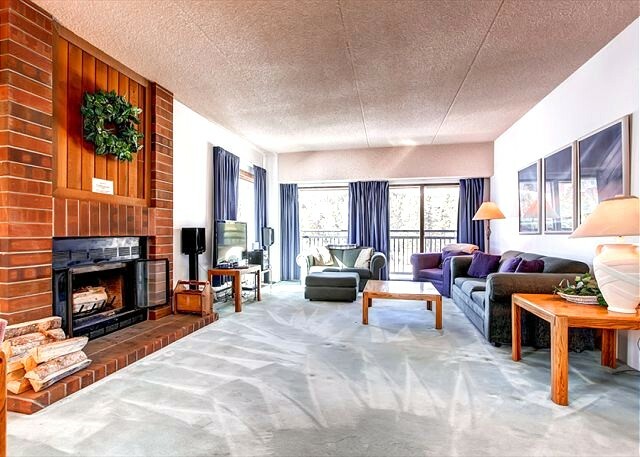 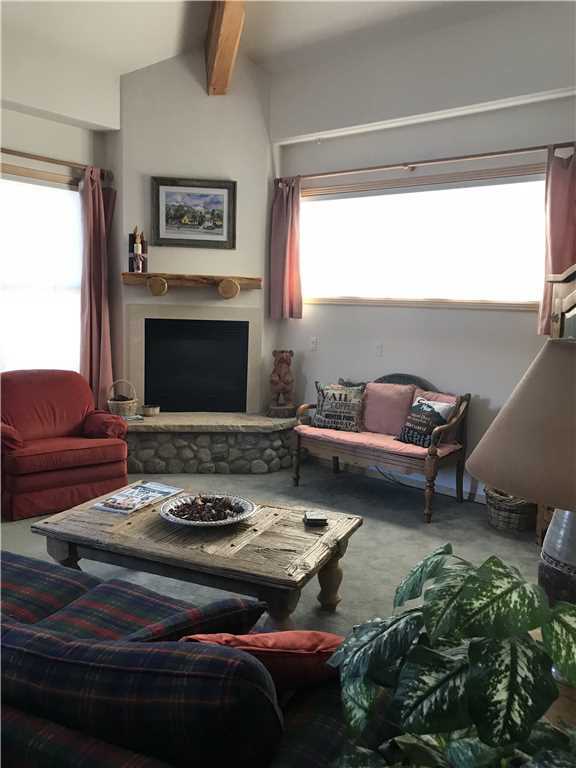 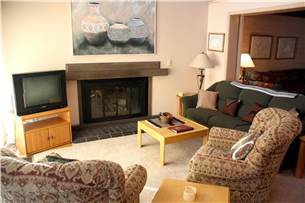 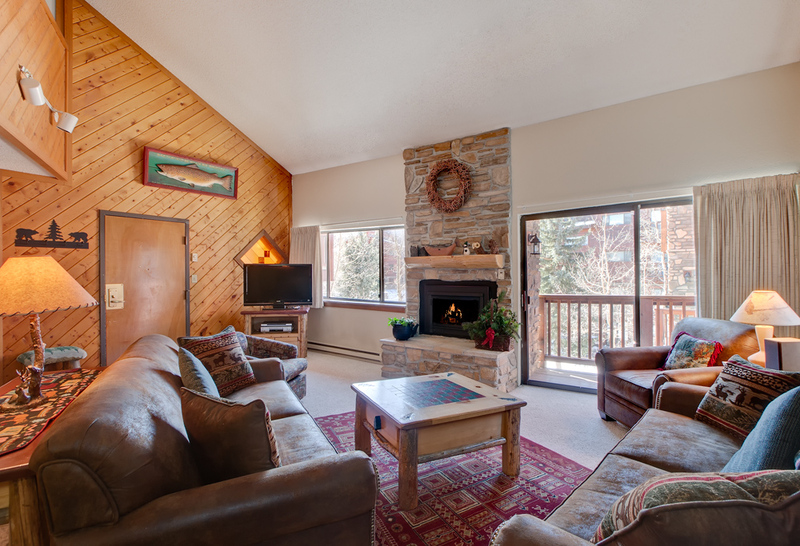 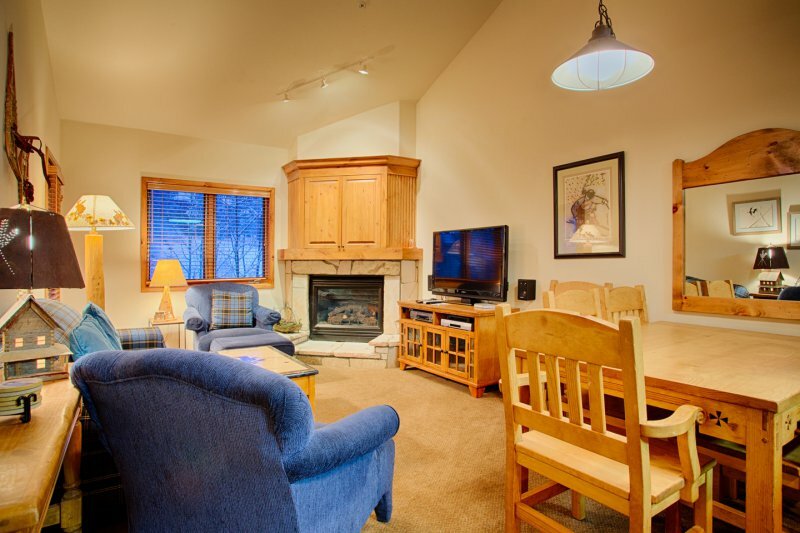 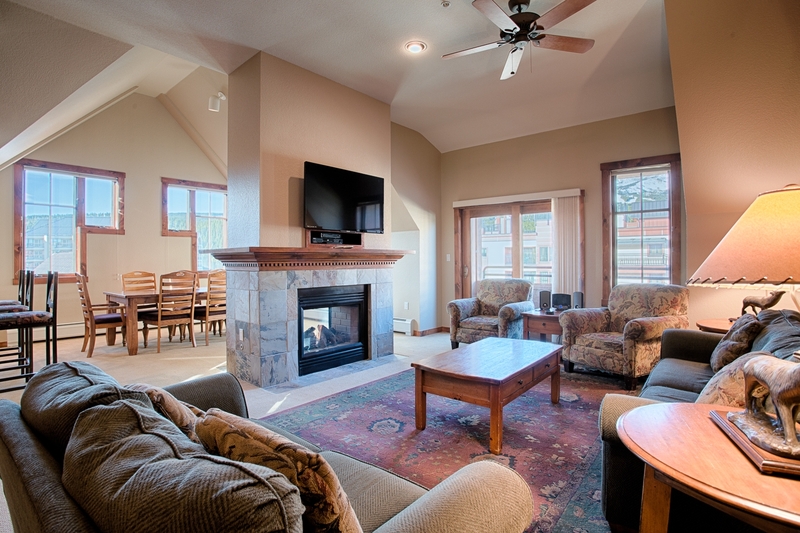 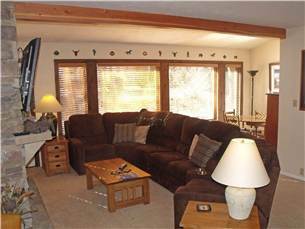 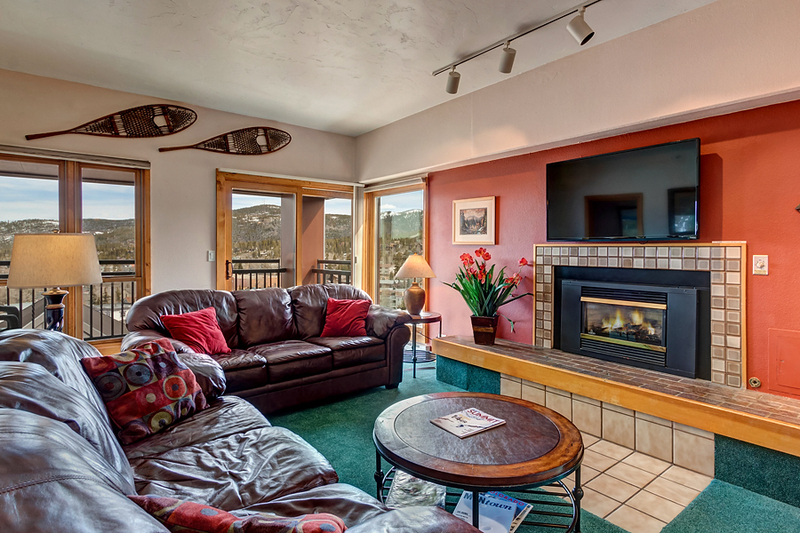 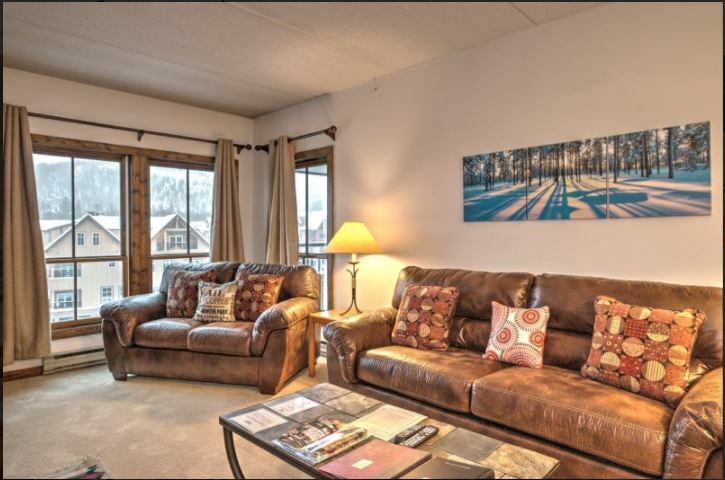 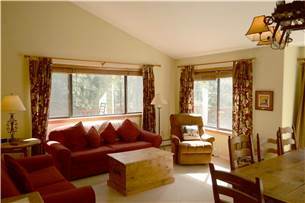 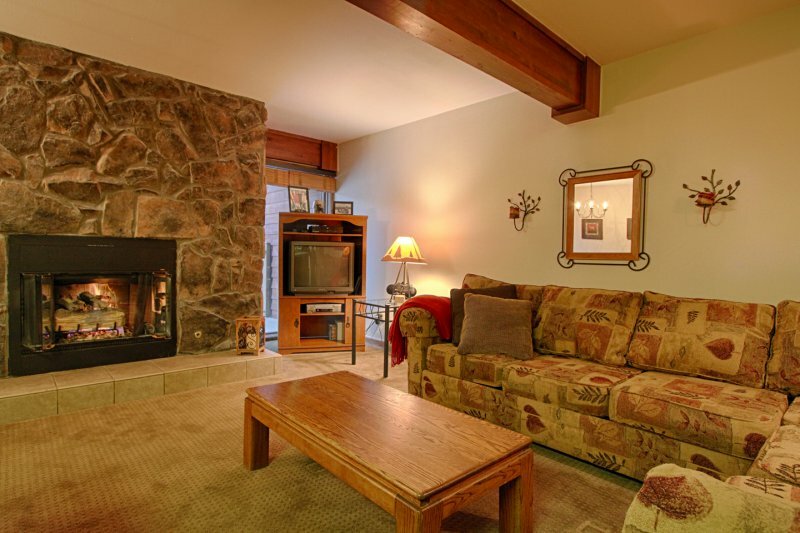 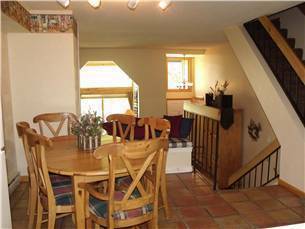 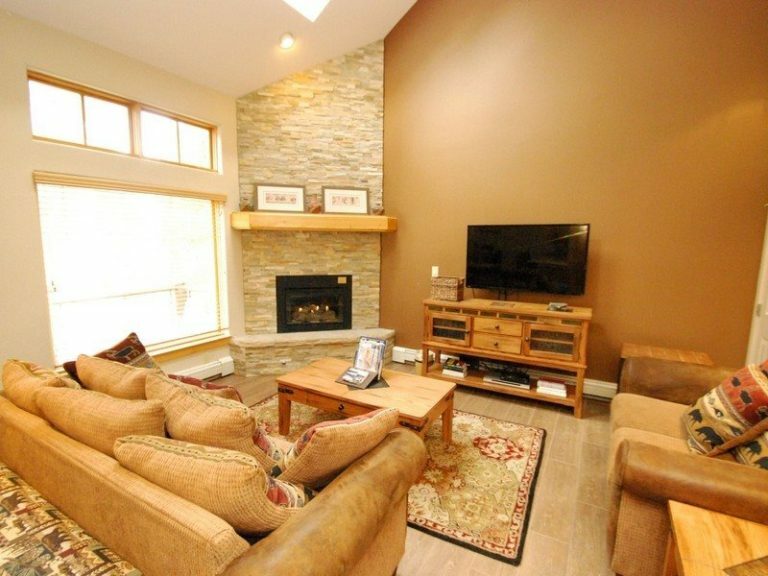 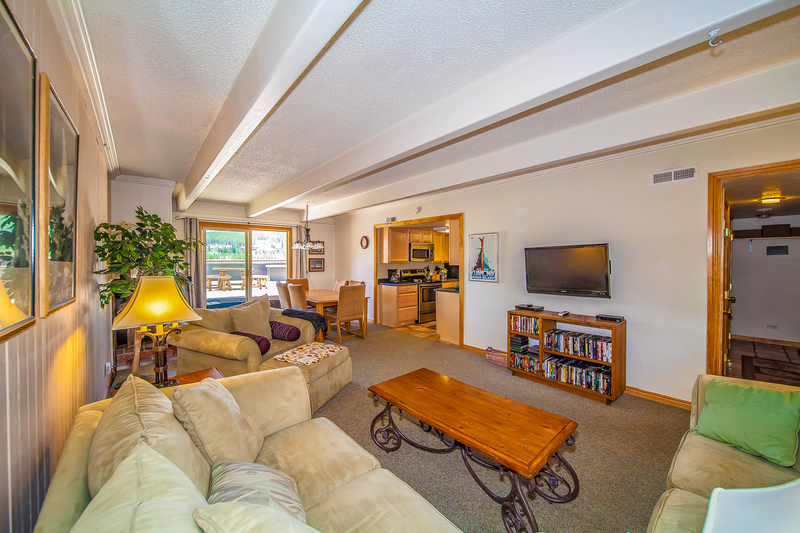 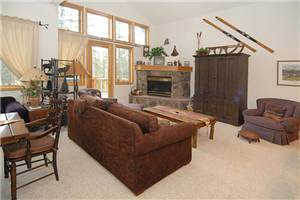 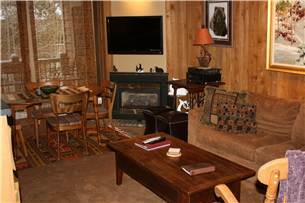 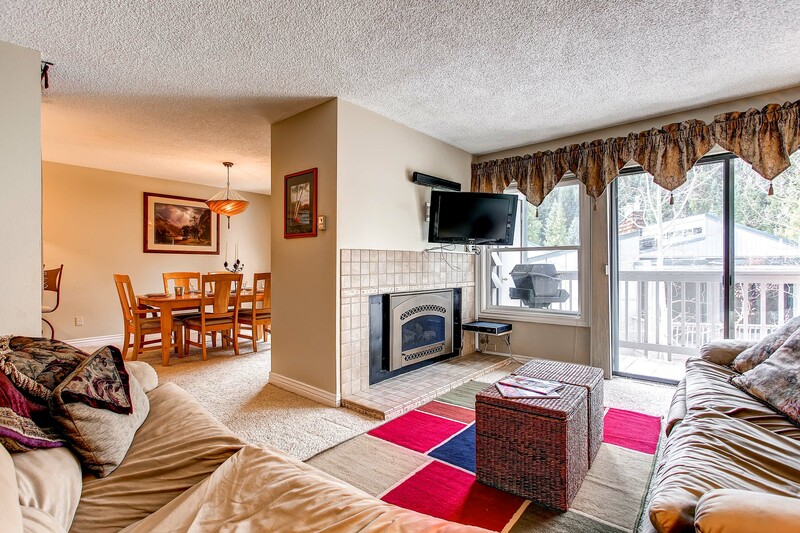 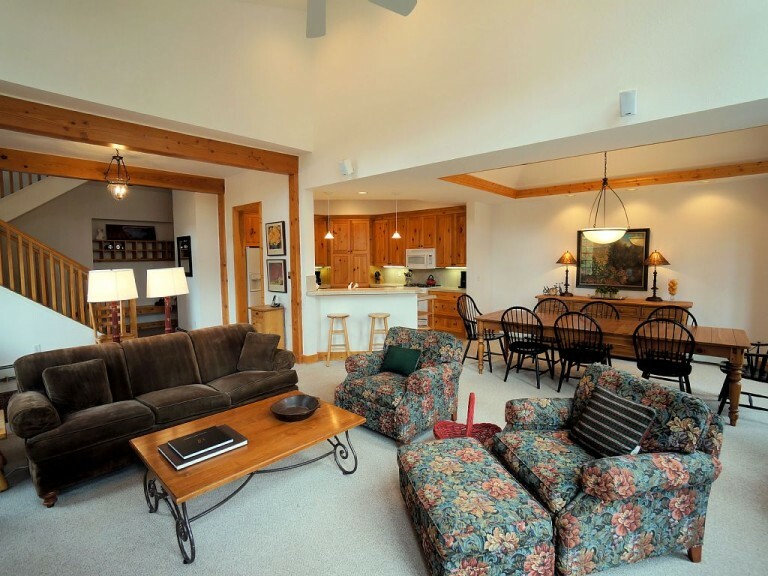 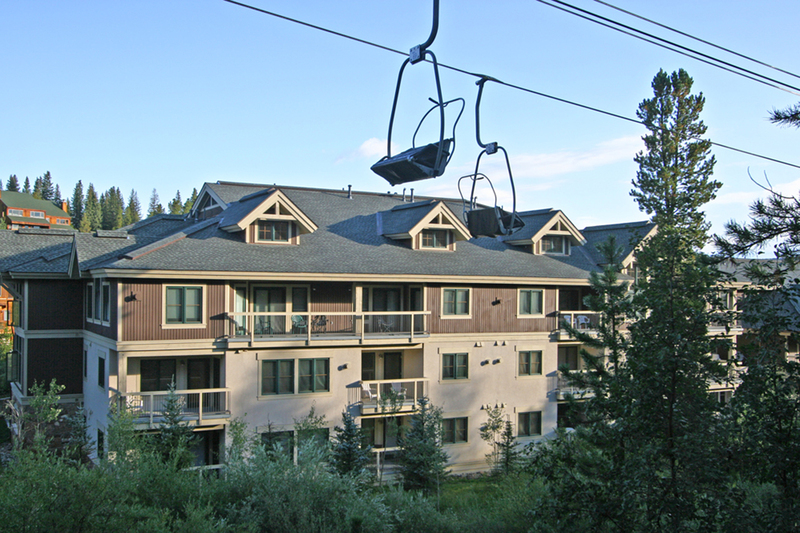 This comfortable studio condo is located in the heart of town with easy access to the Quicksilver chairlift and Ski School at Peak 9. 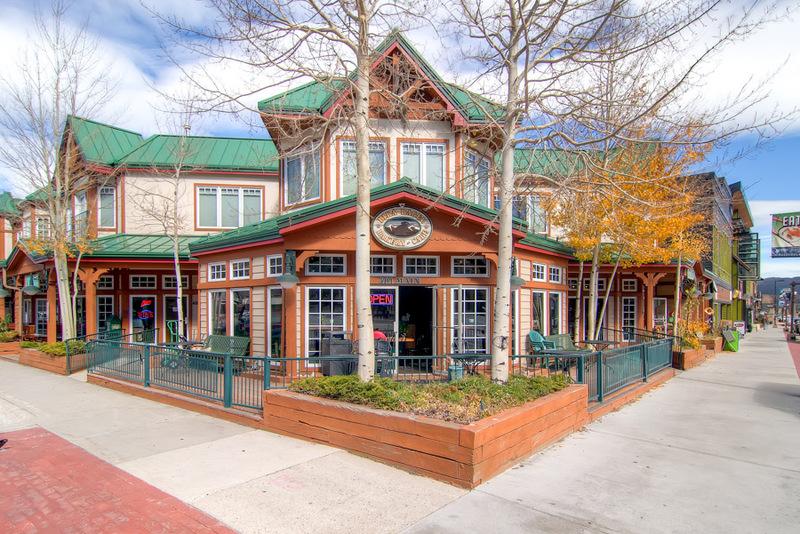 Located just upstairs from the popular Mi Casa Mexican Restaurant and directly across the street from The Village at Breck. 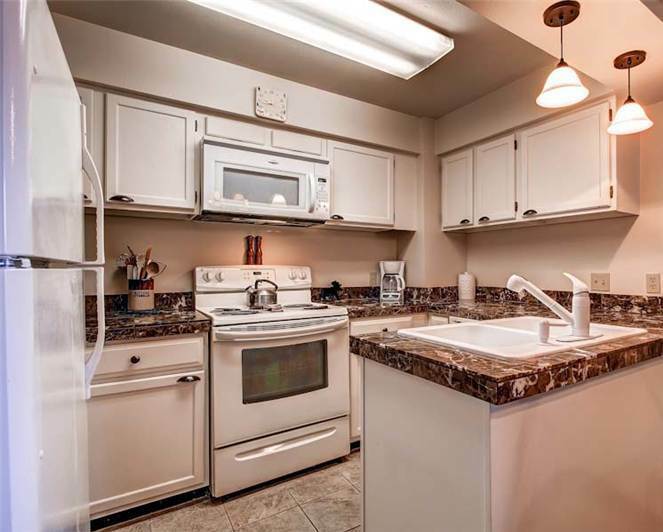 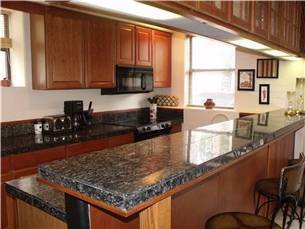 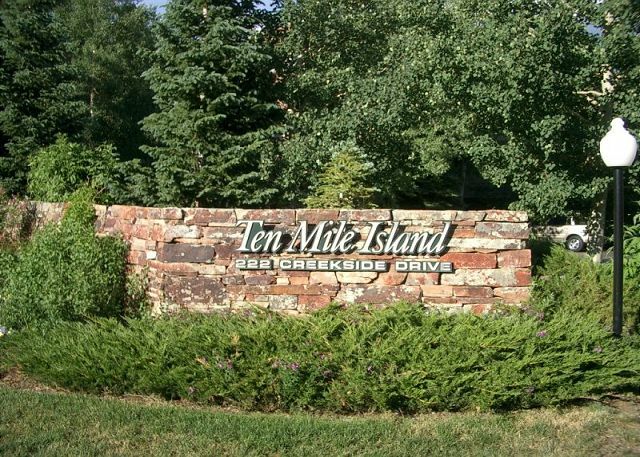 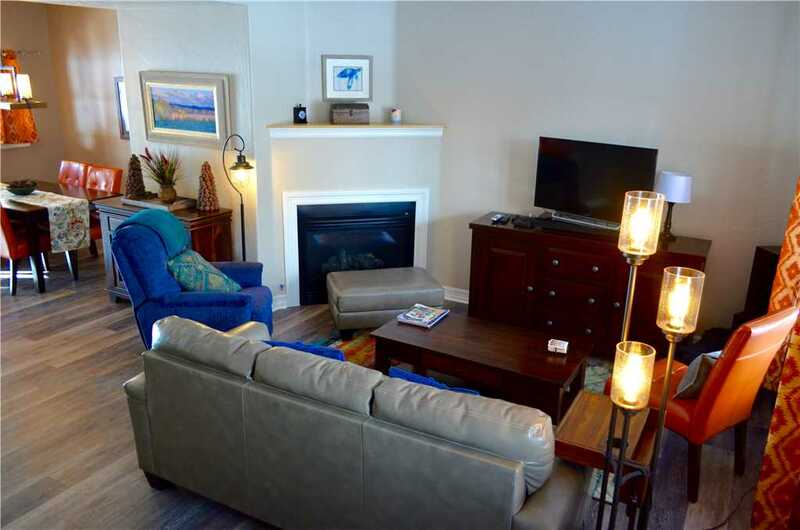 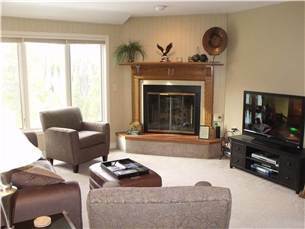 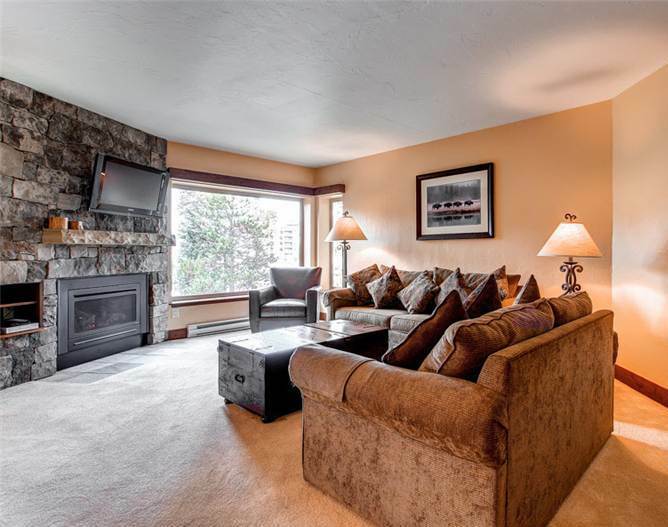 This condo features a wood-burning fireplace, modern TV, garage parking, elevator access, onsite laundry and an onsite outdoor hot tub. 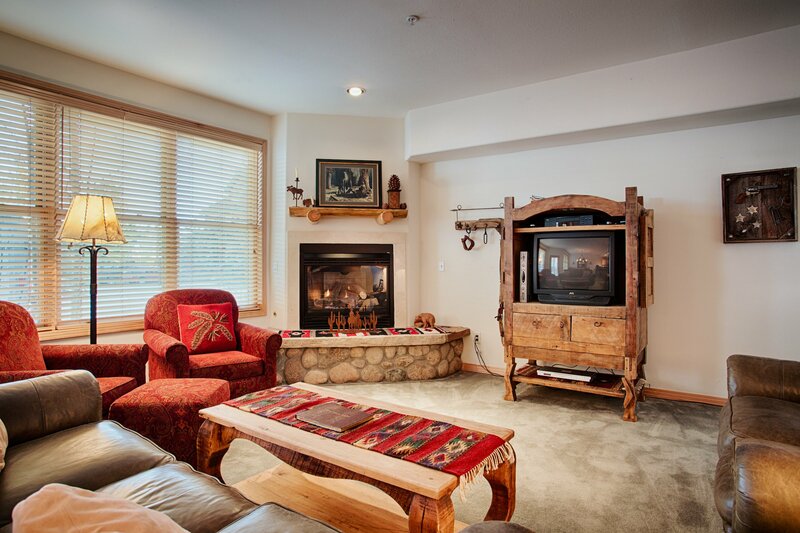 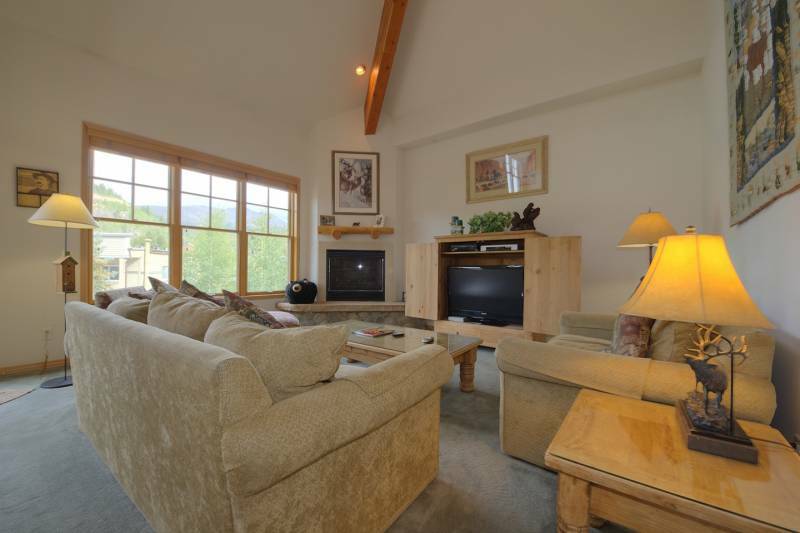 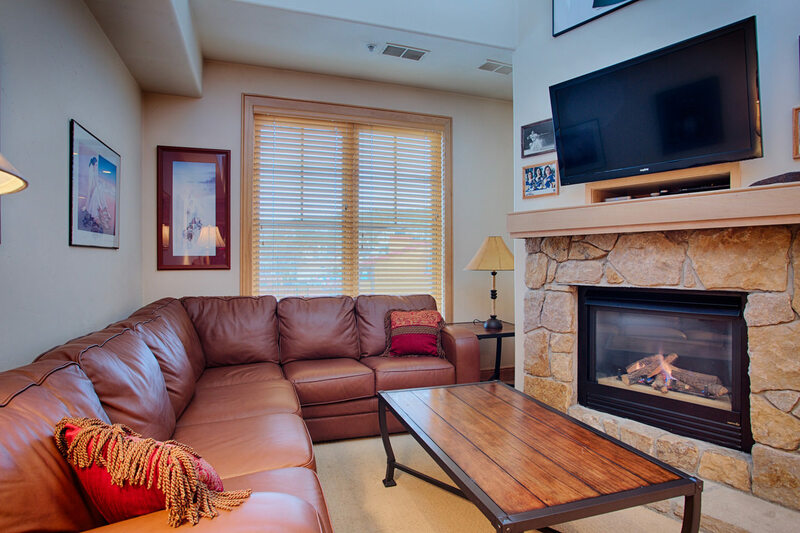 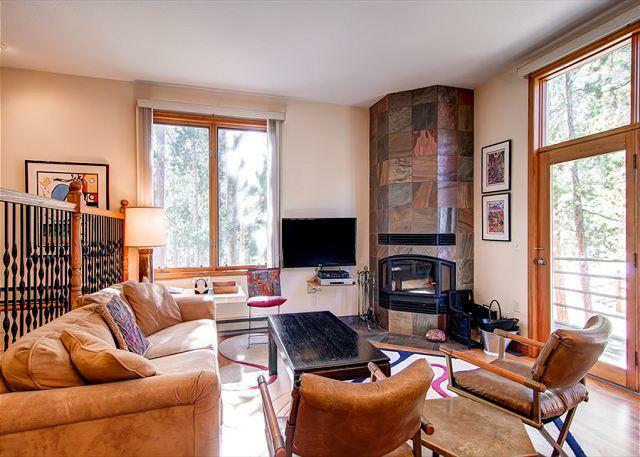 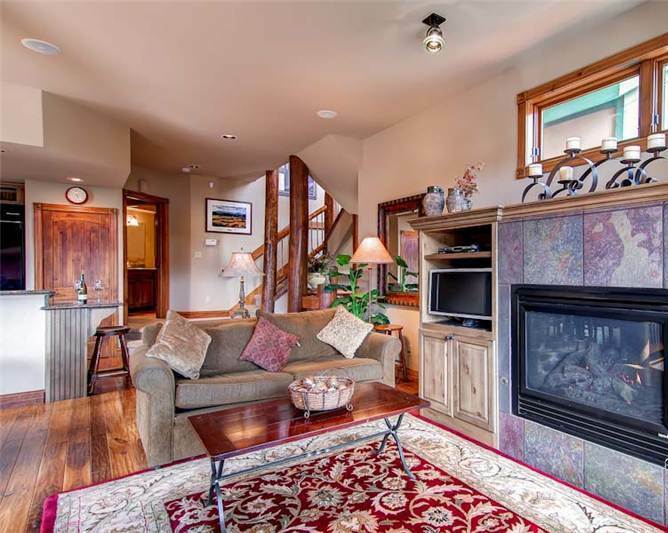 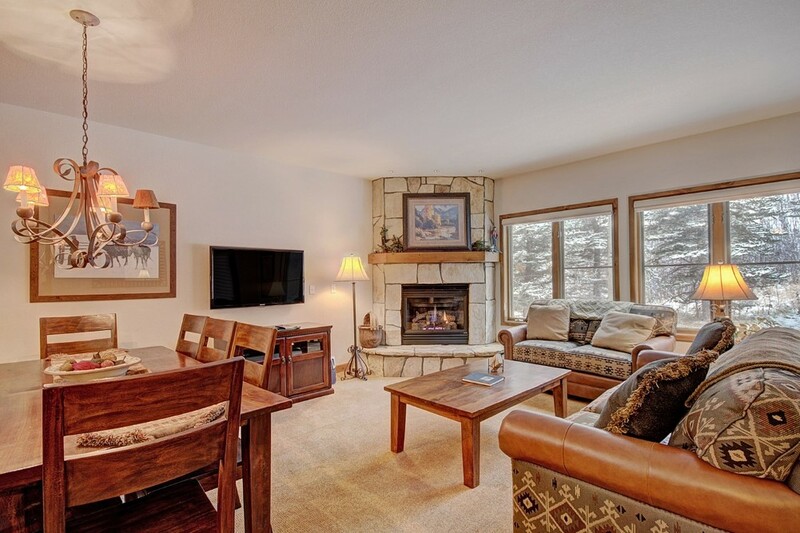 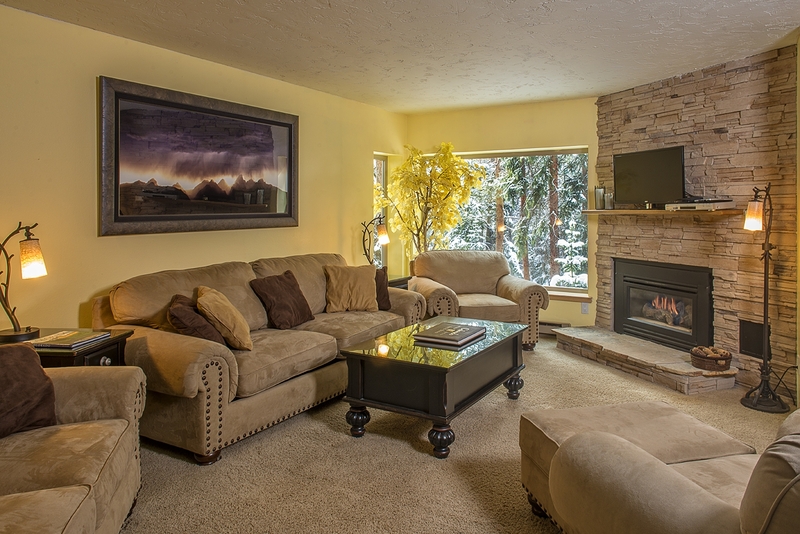 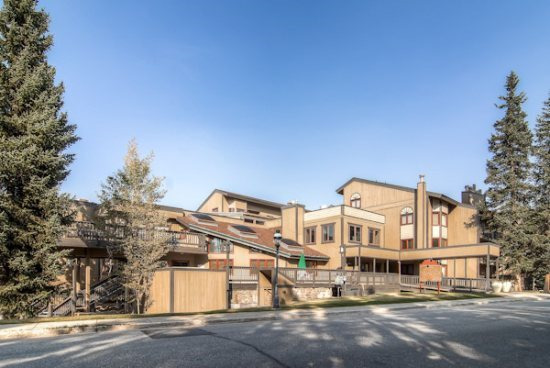 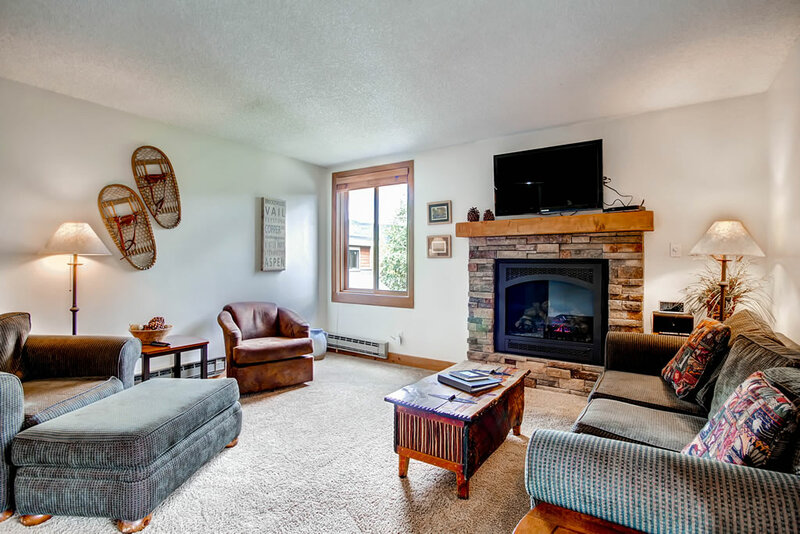 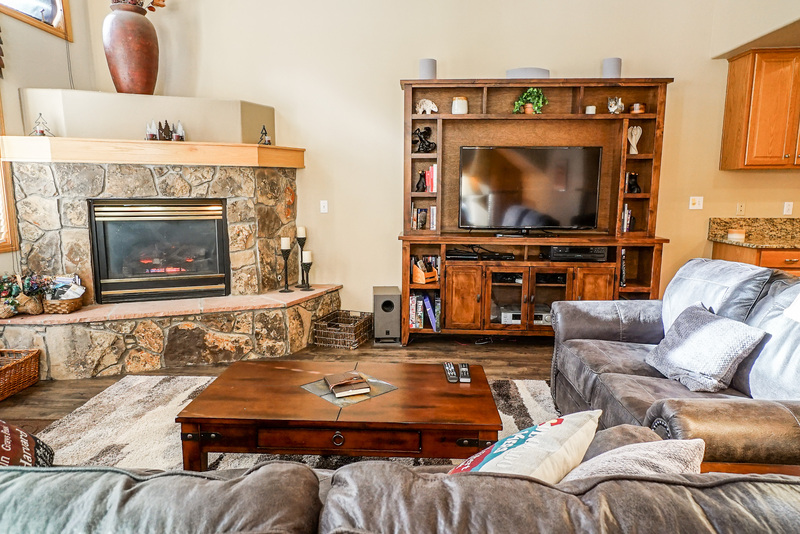 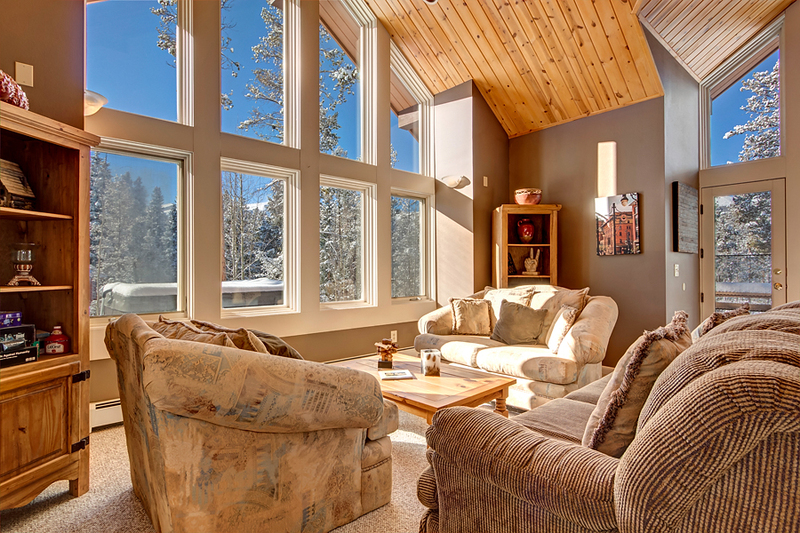 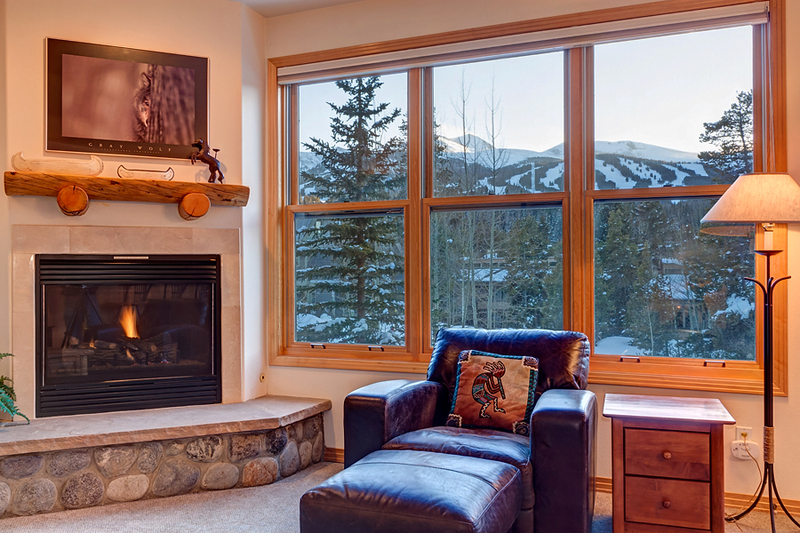 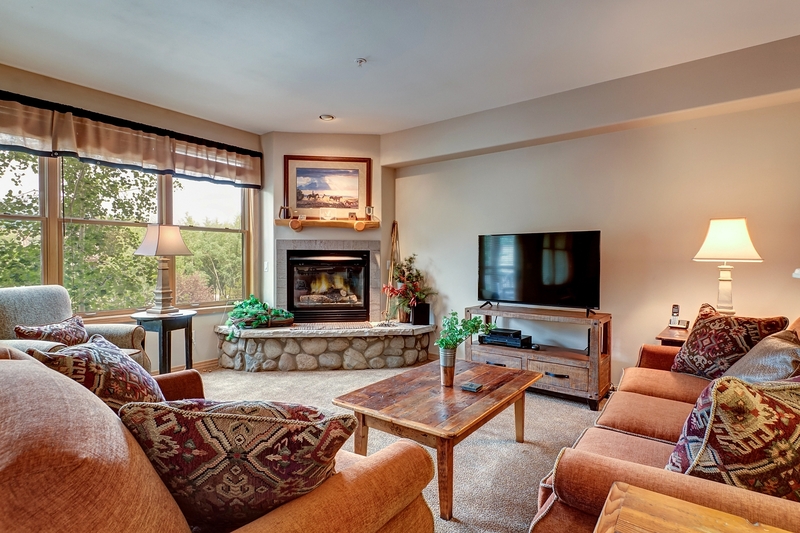 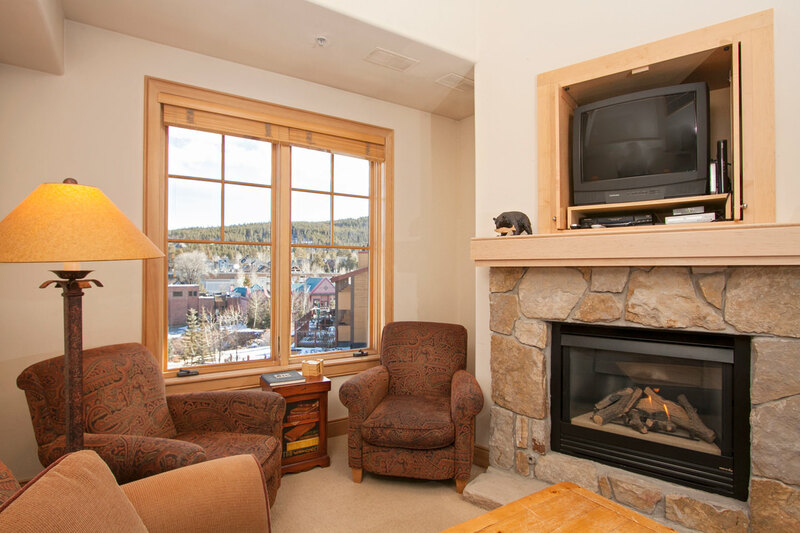 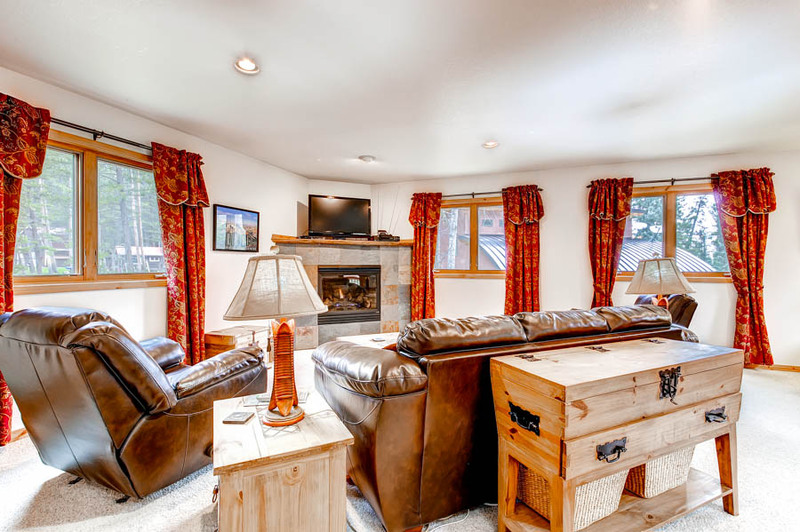 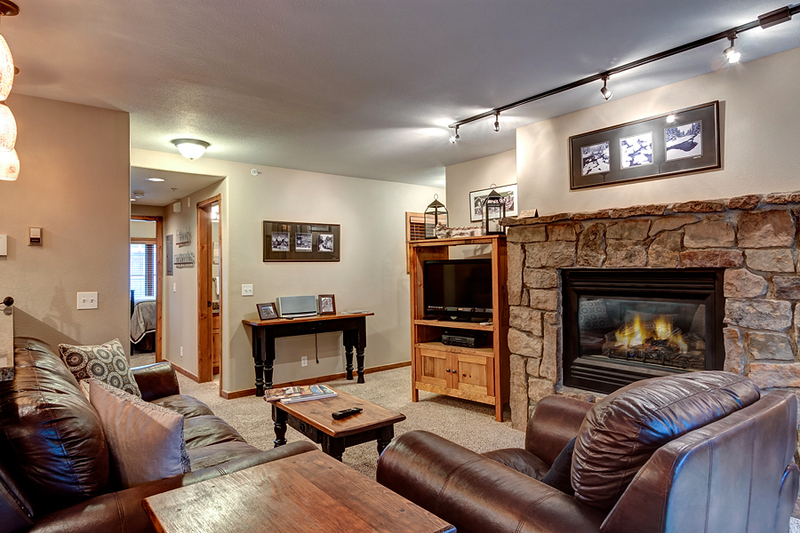 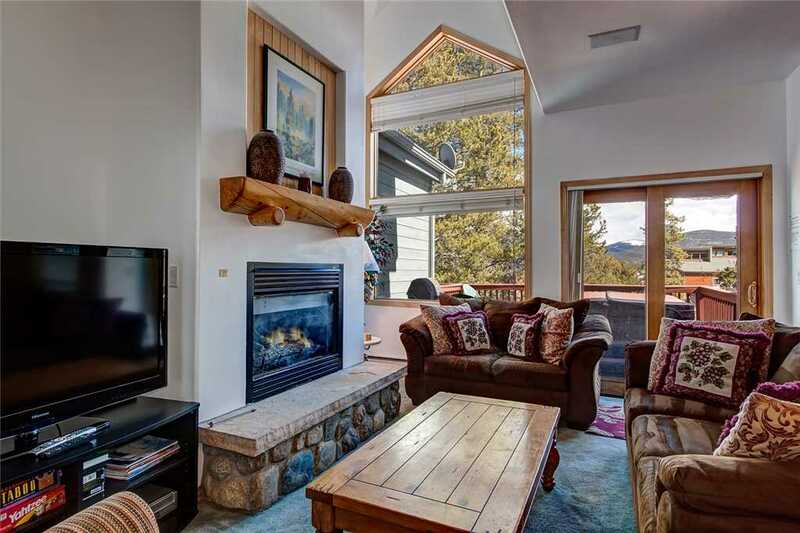 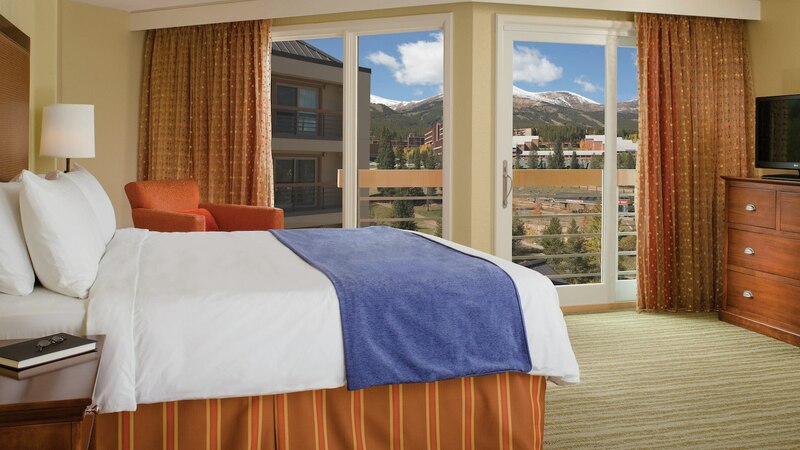 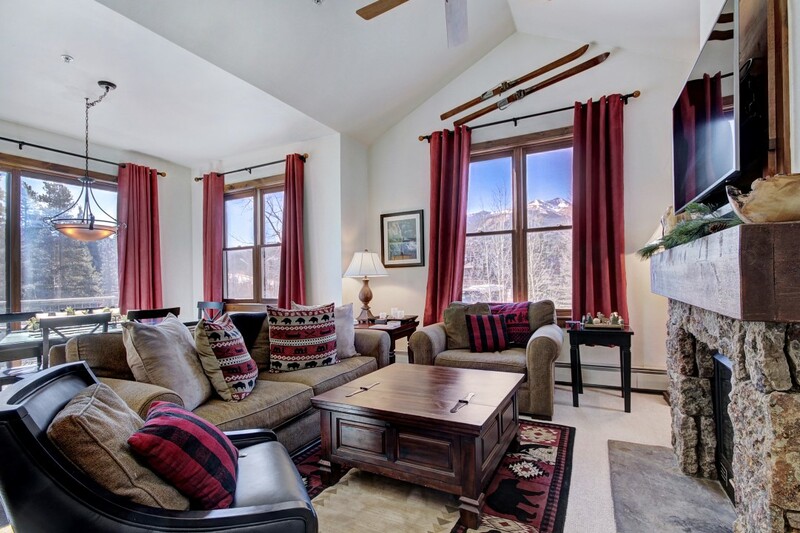 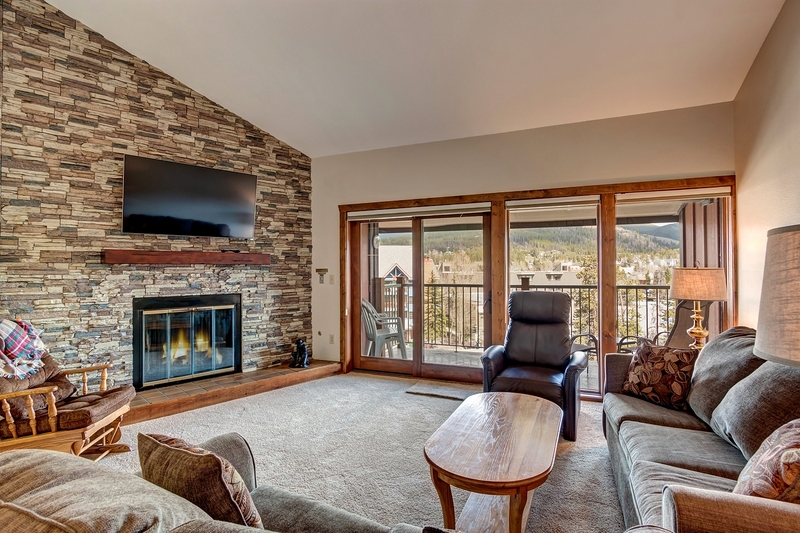 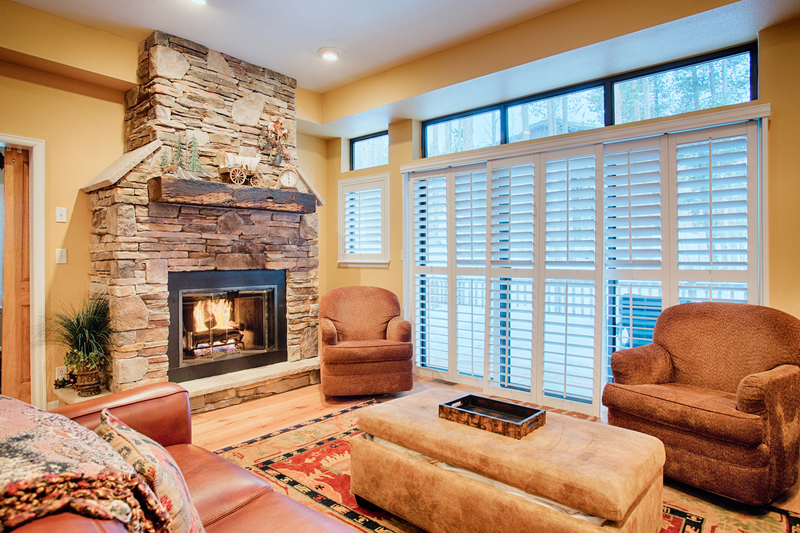 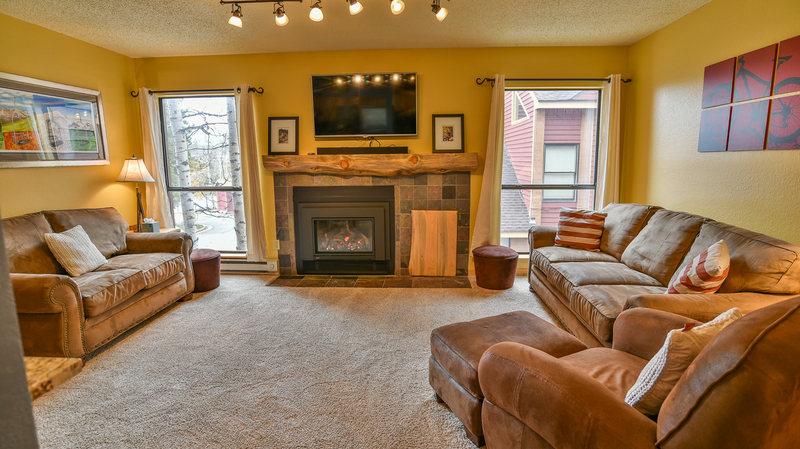 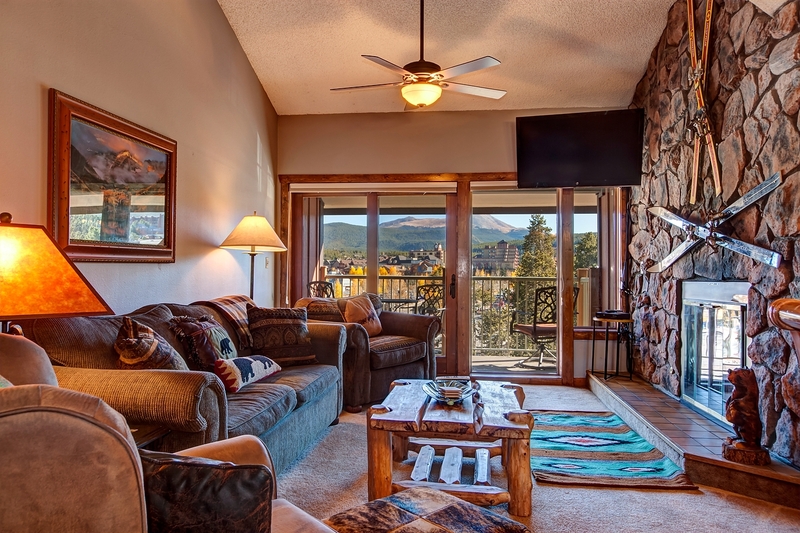 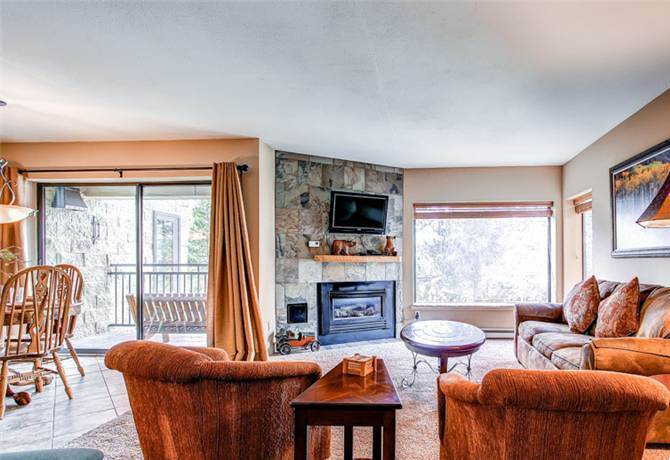 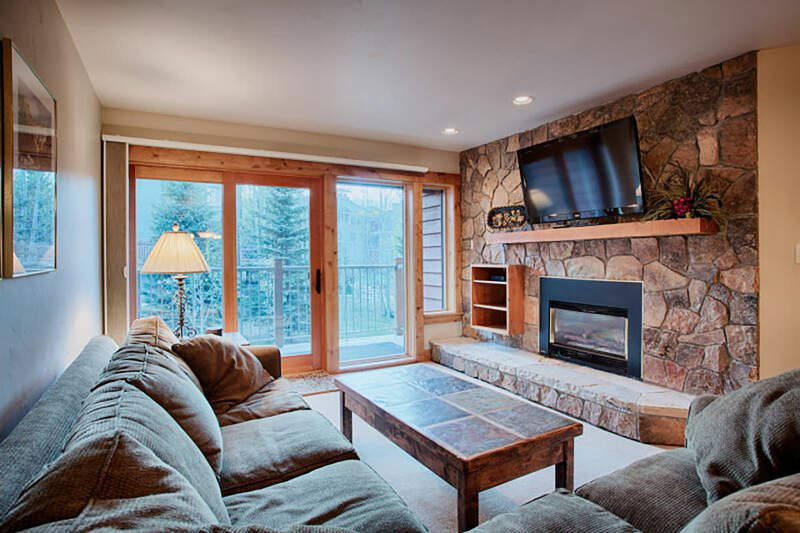 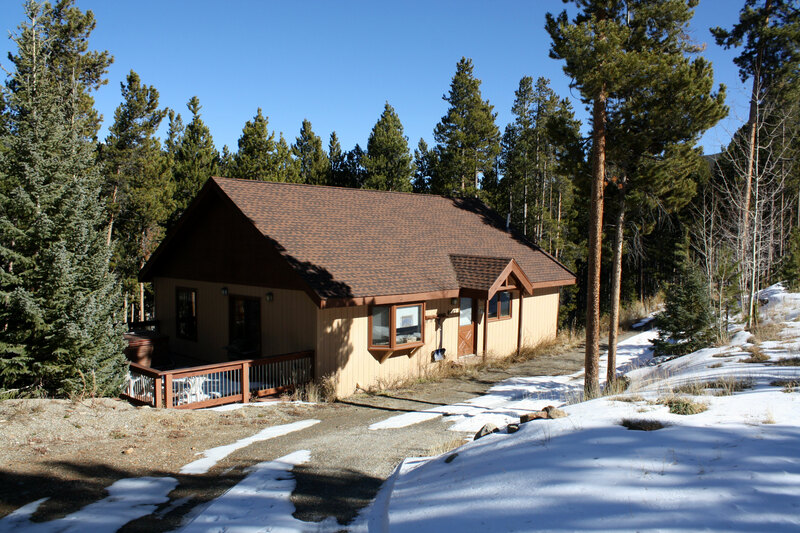 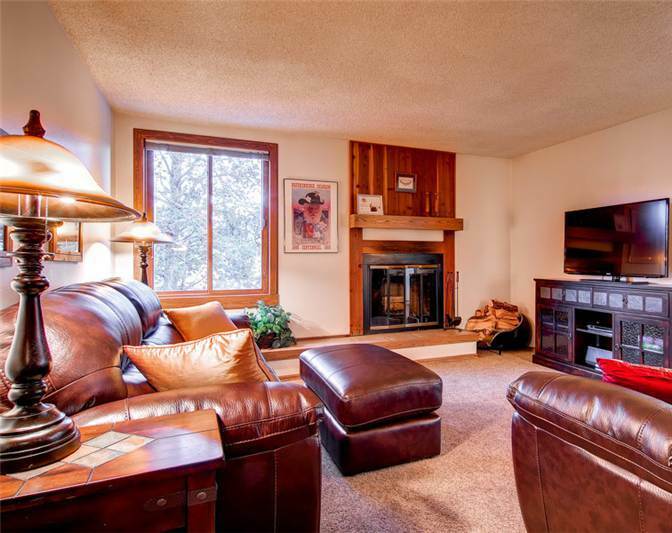 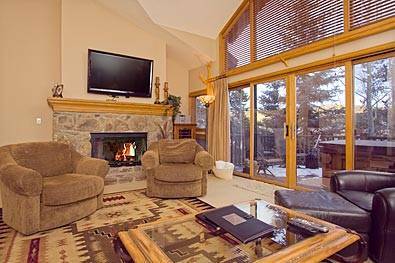 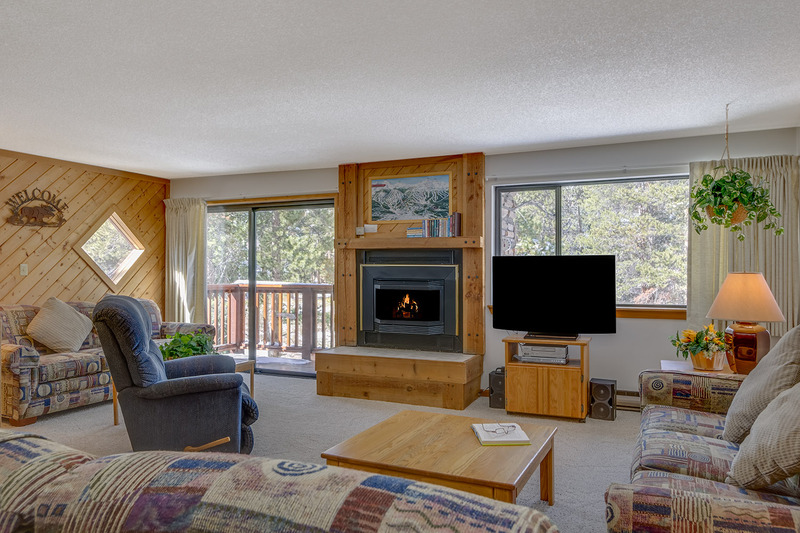 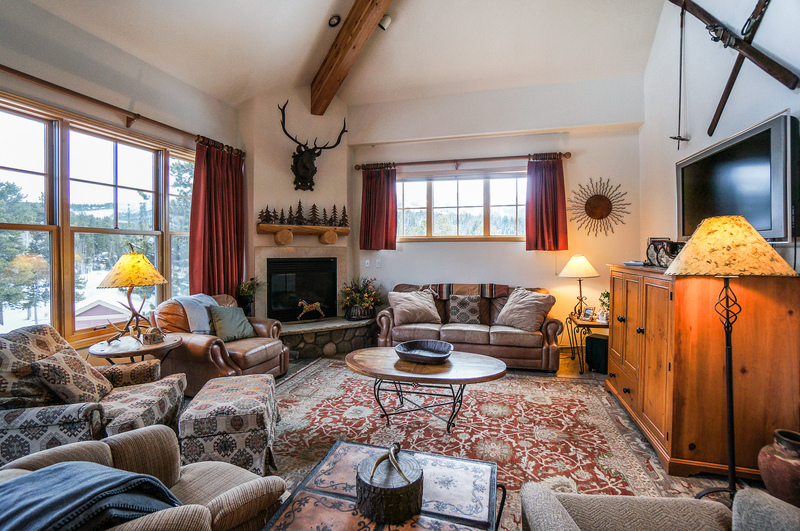 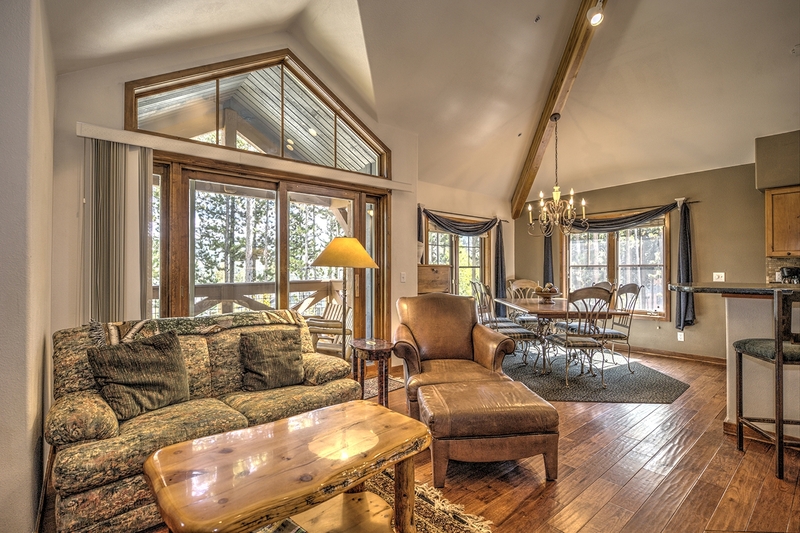 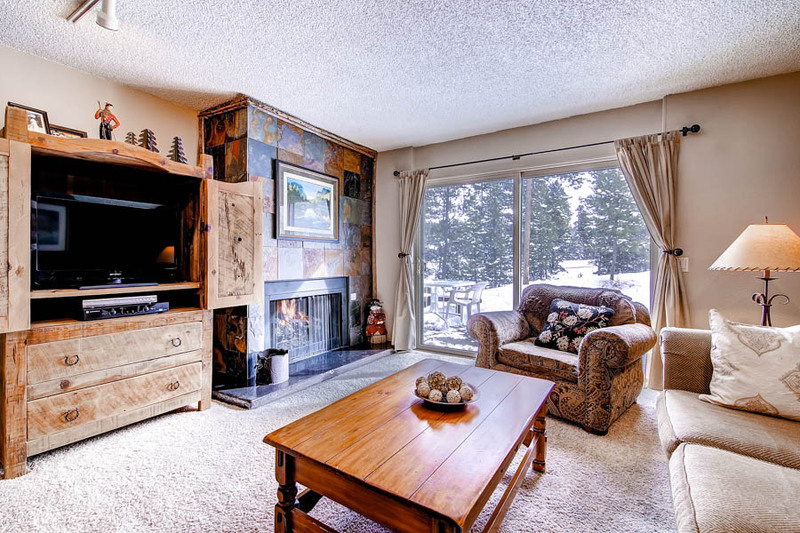 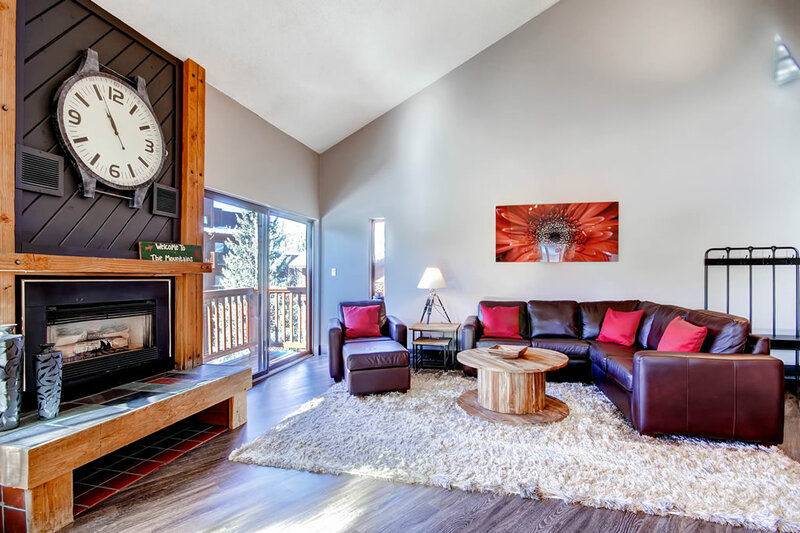 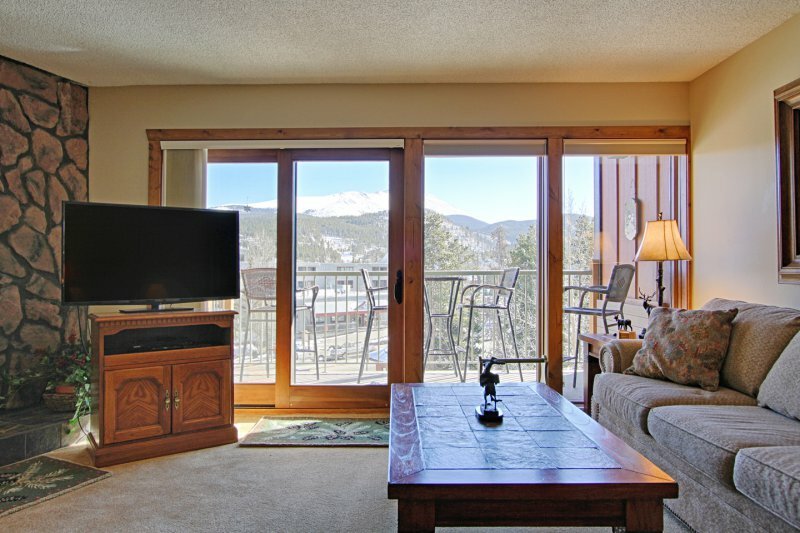 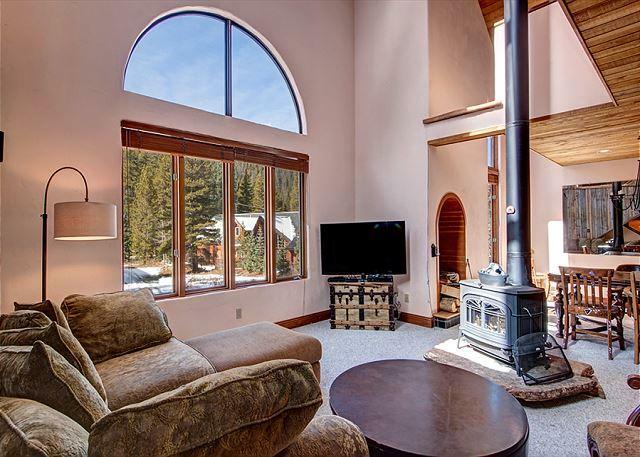 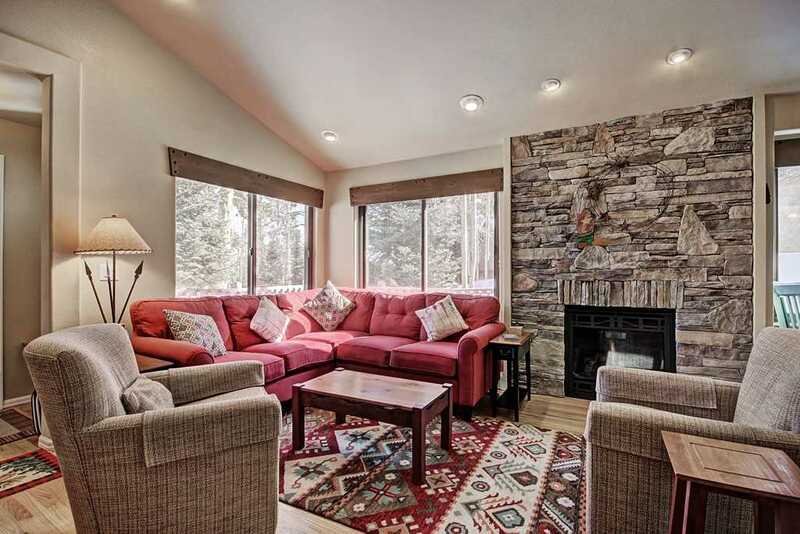 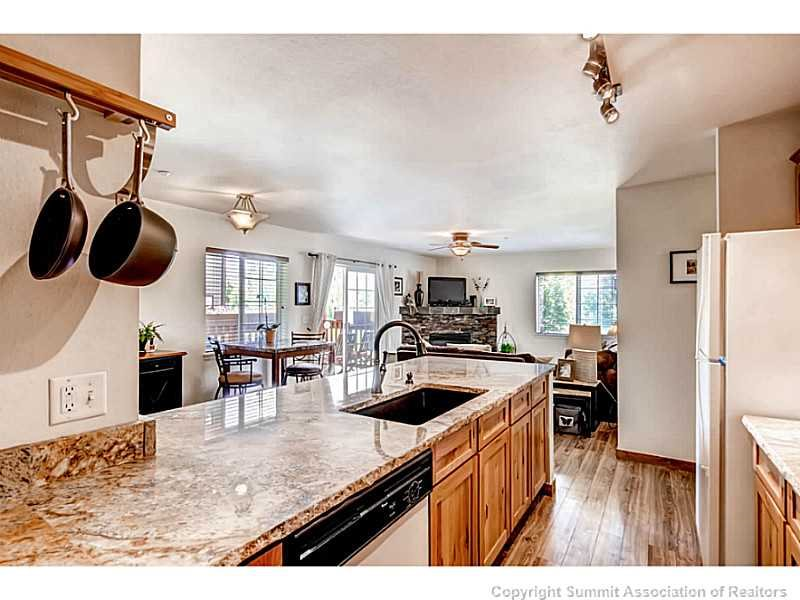 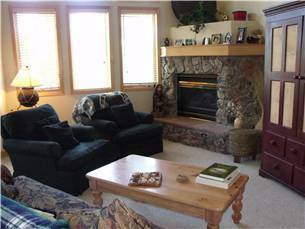 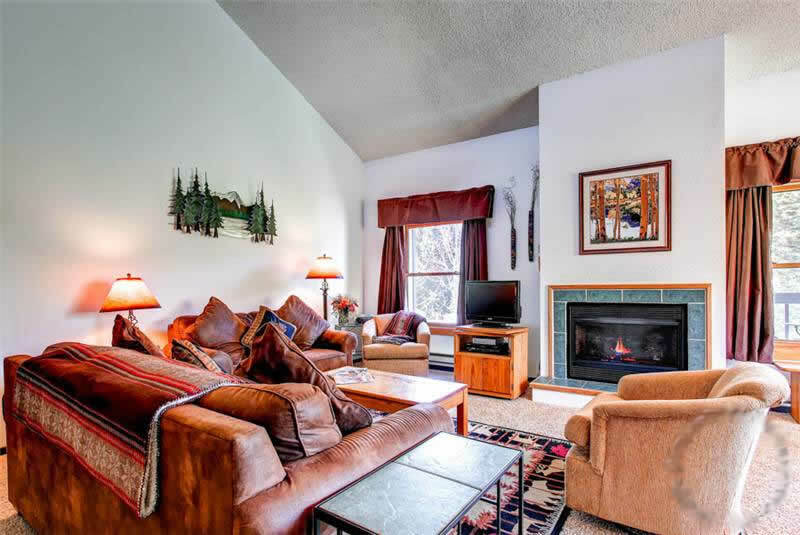 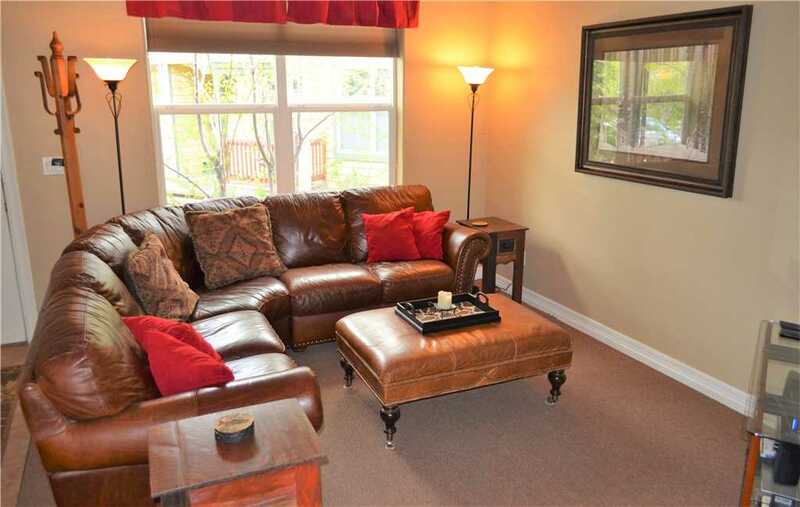 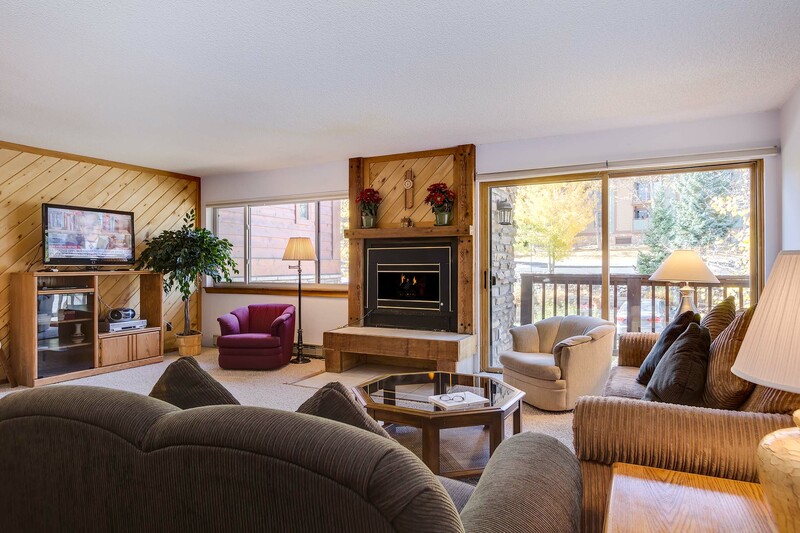 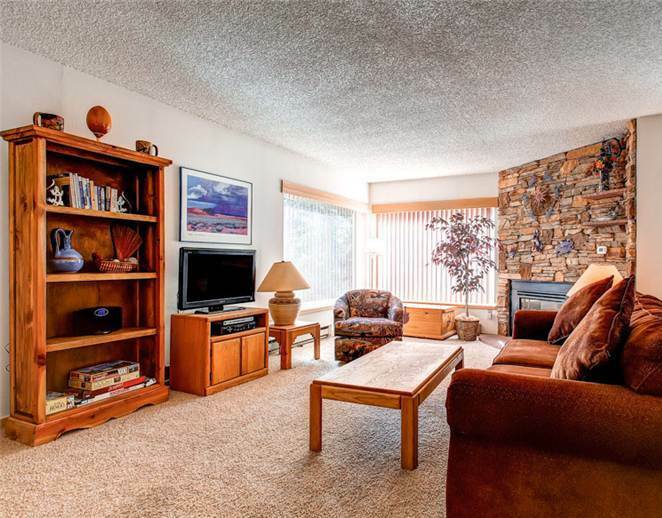 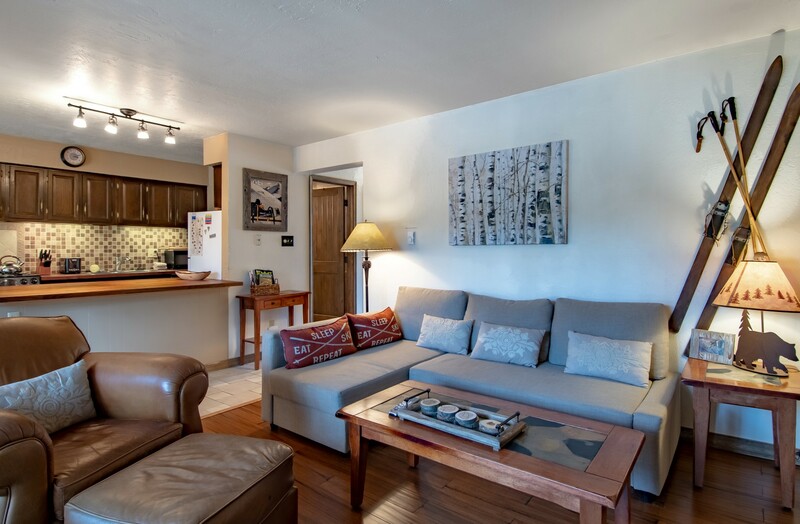 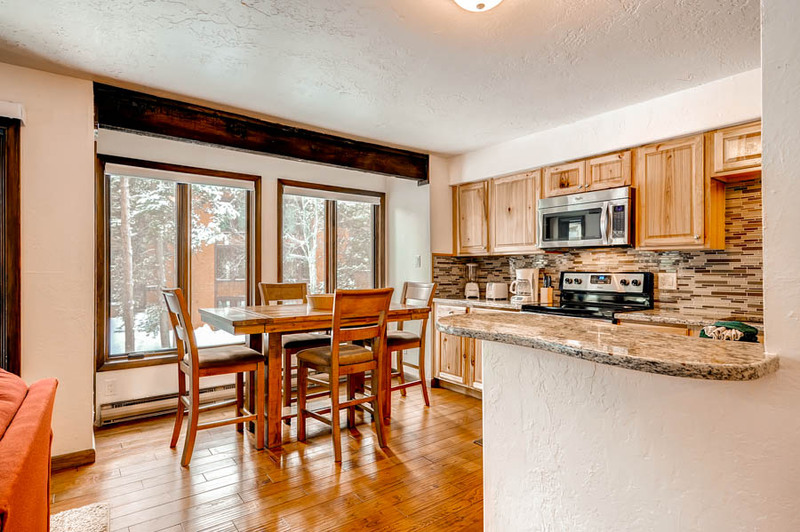 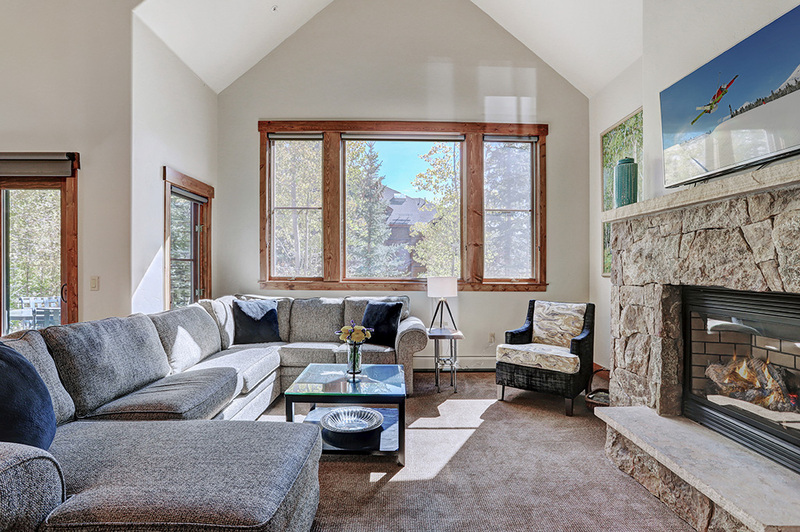 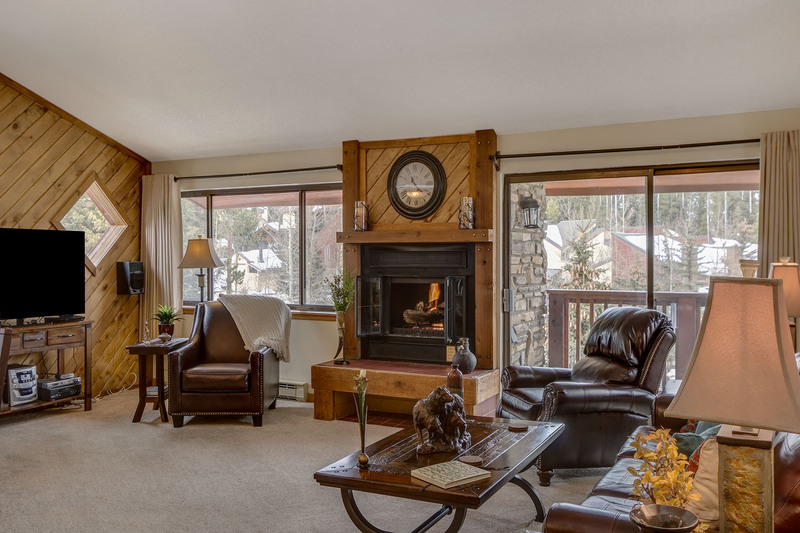 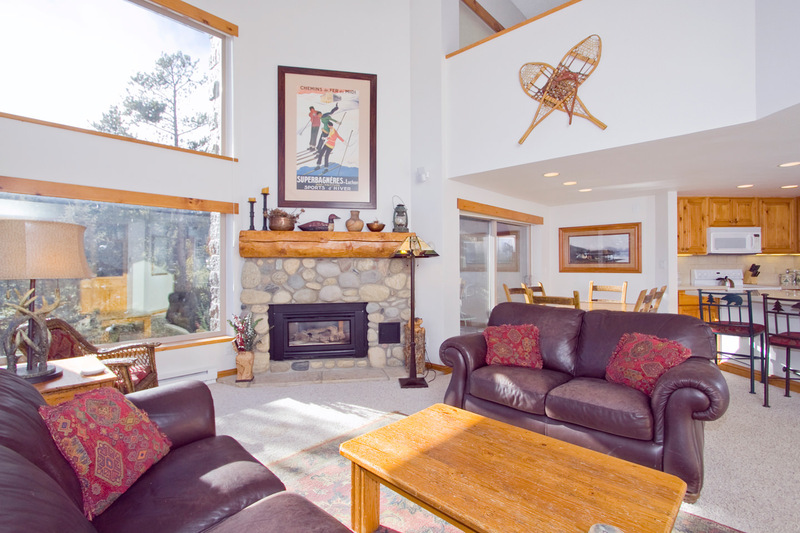 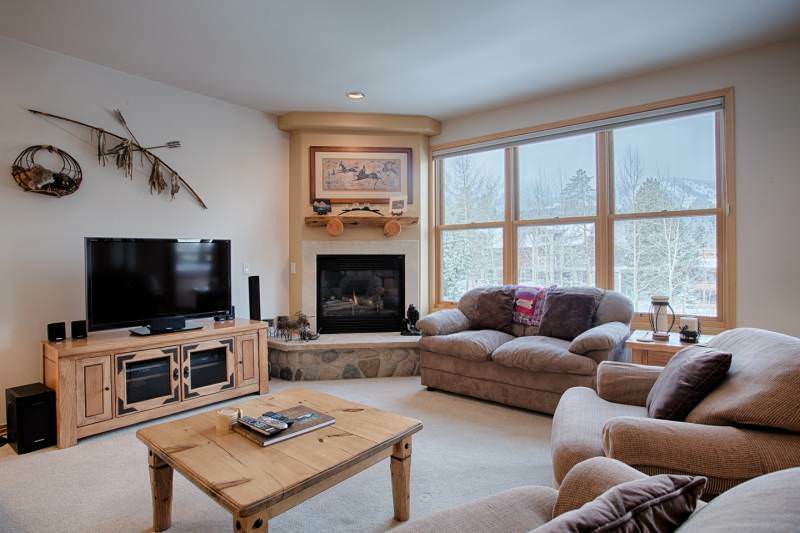 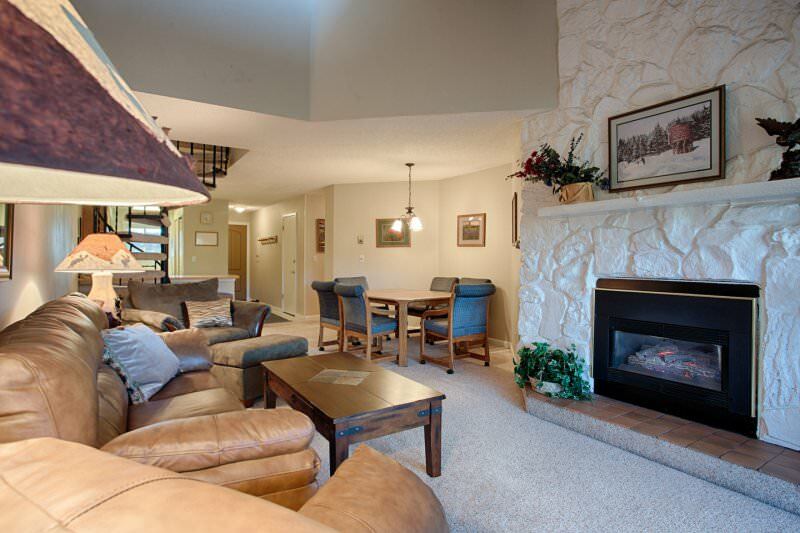 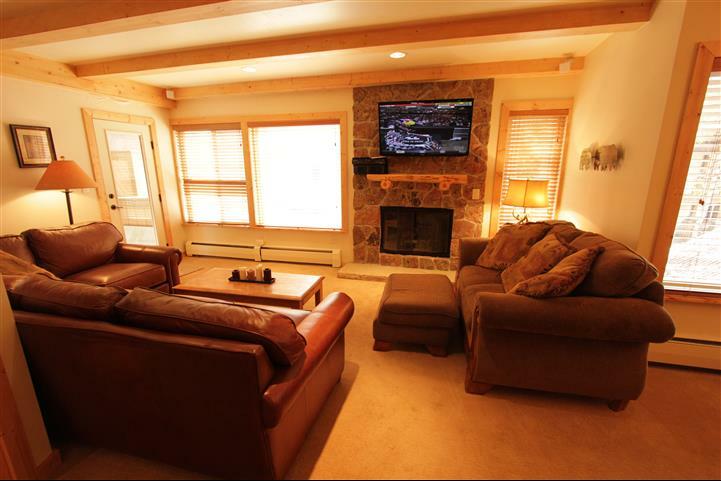 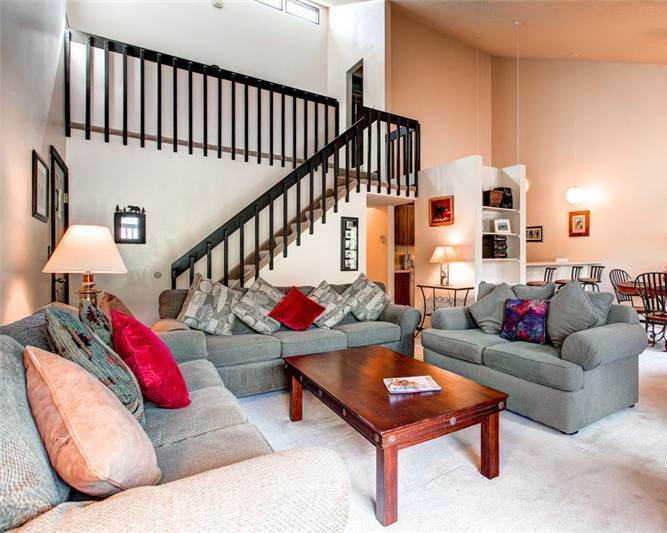 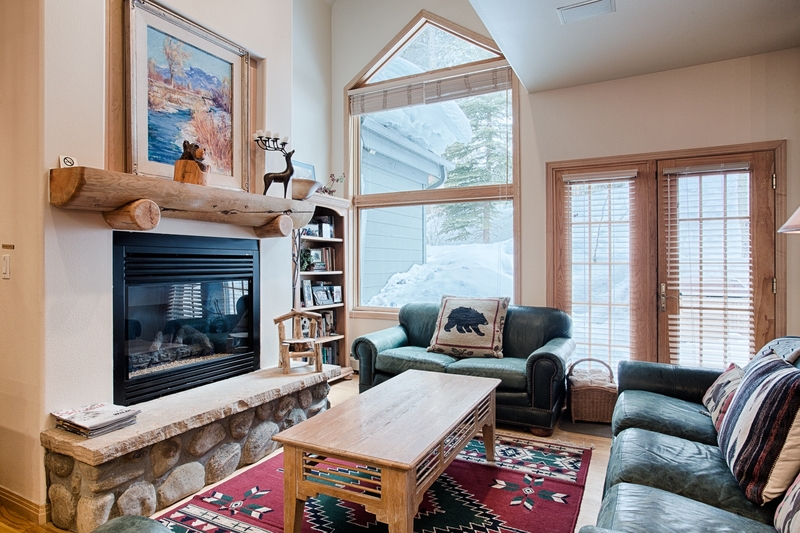 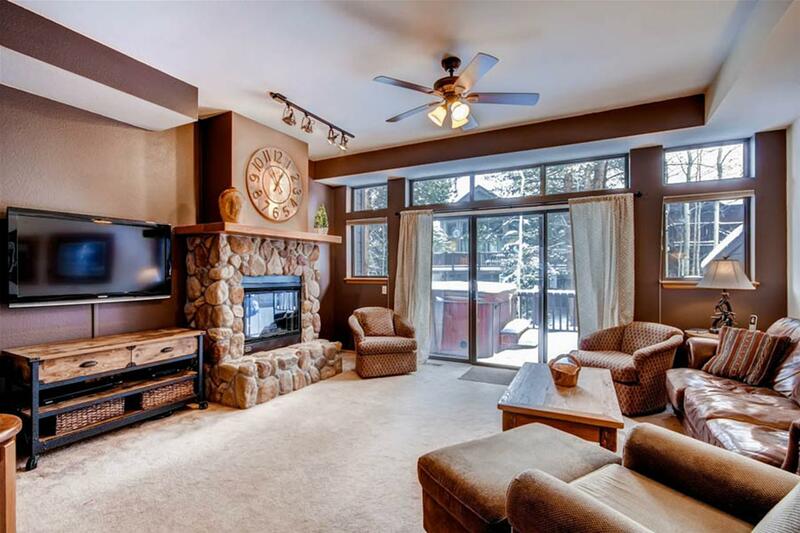 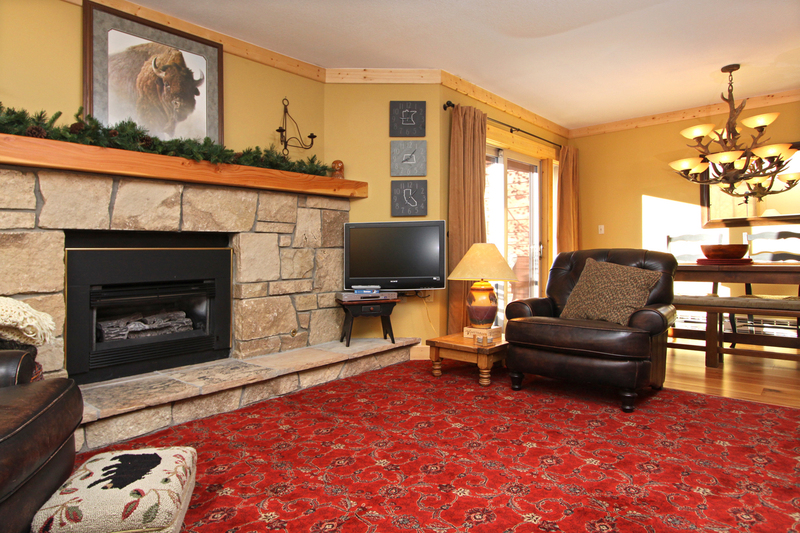 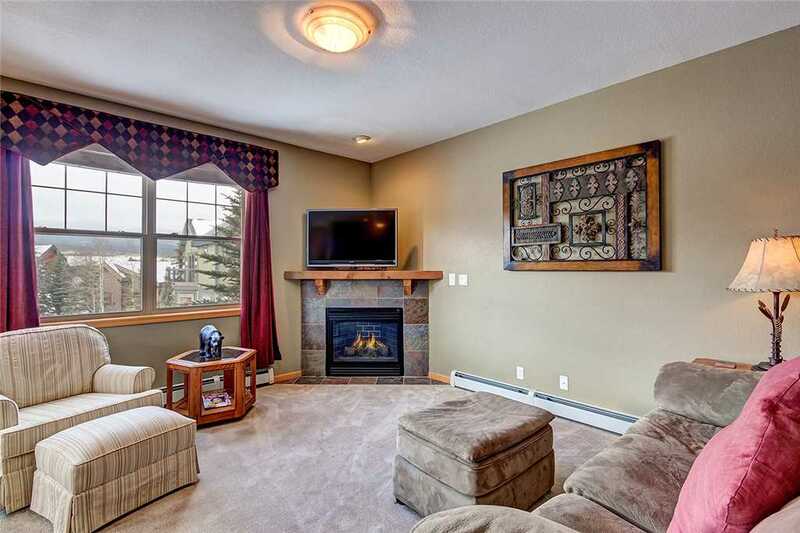 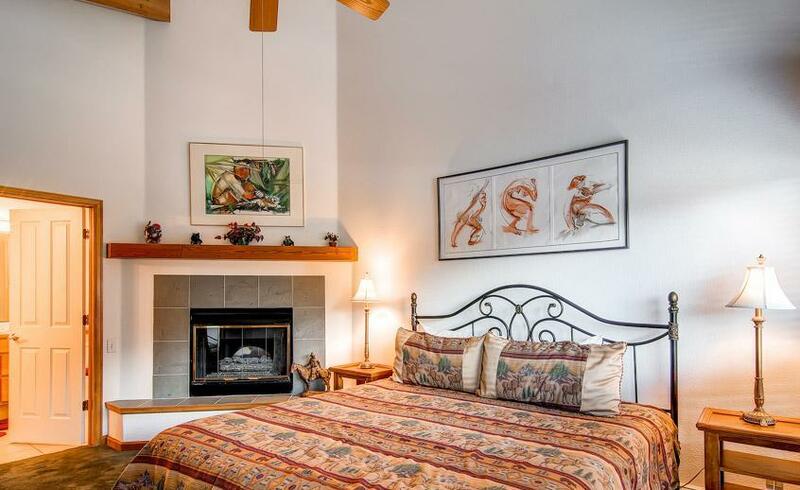 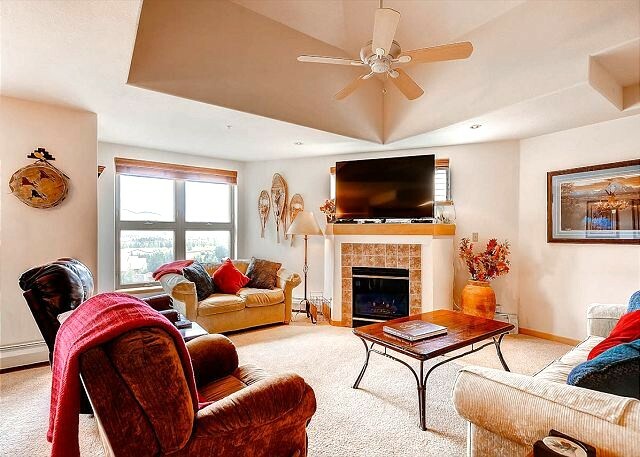 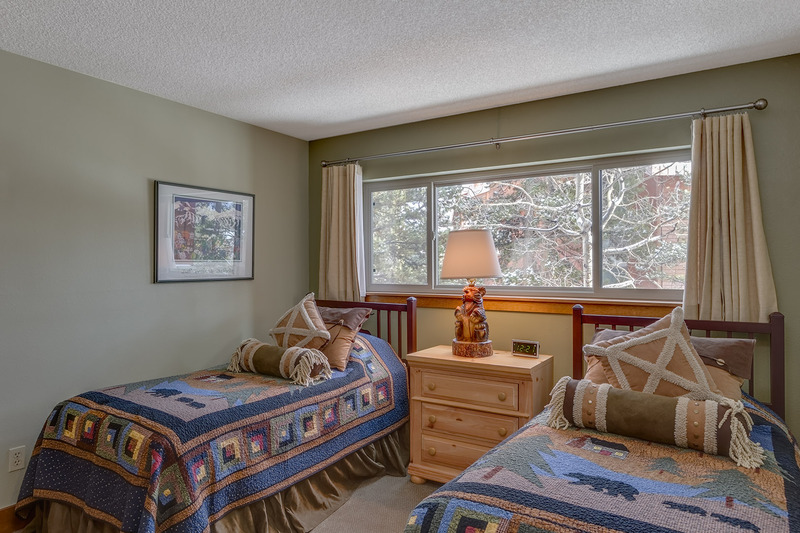 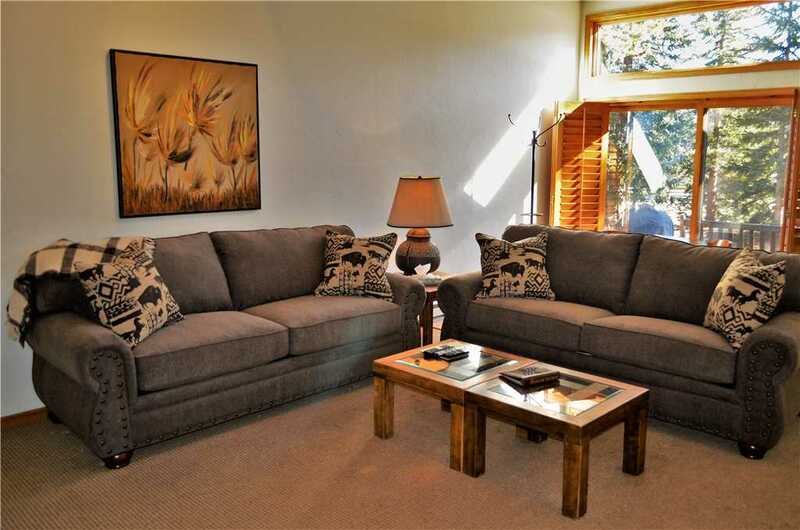 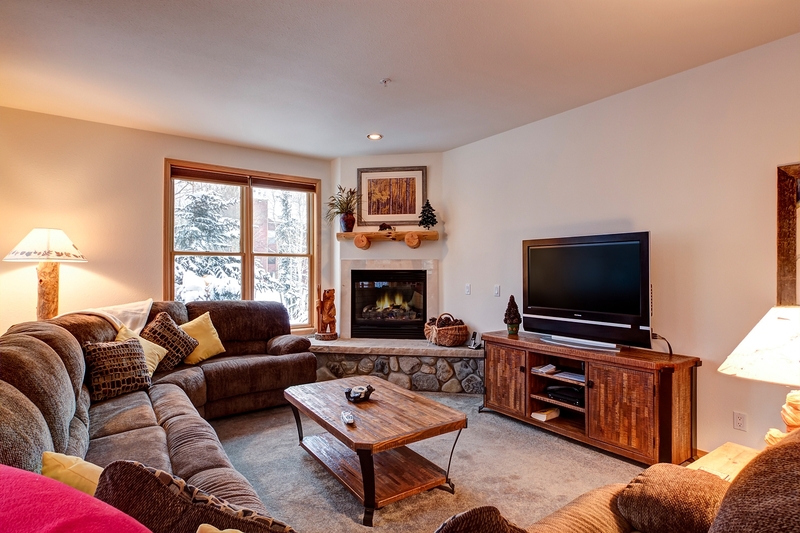 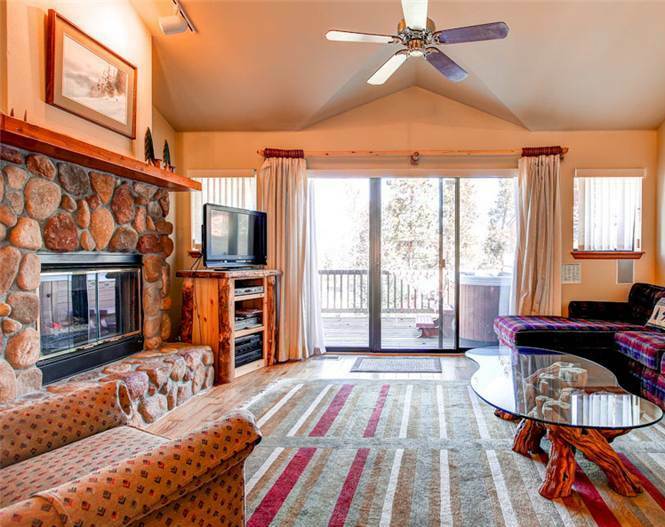 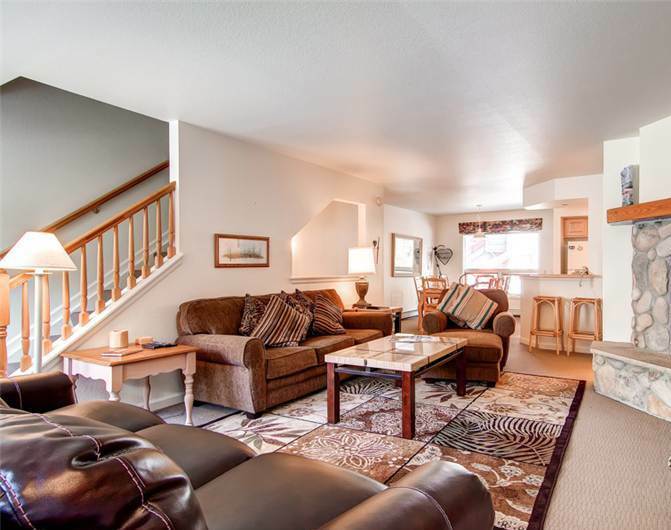 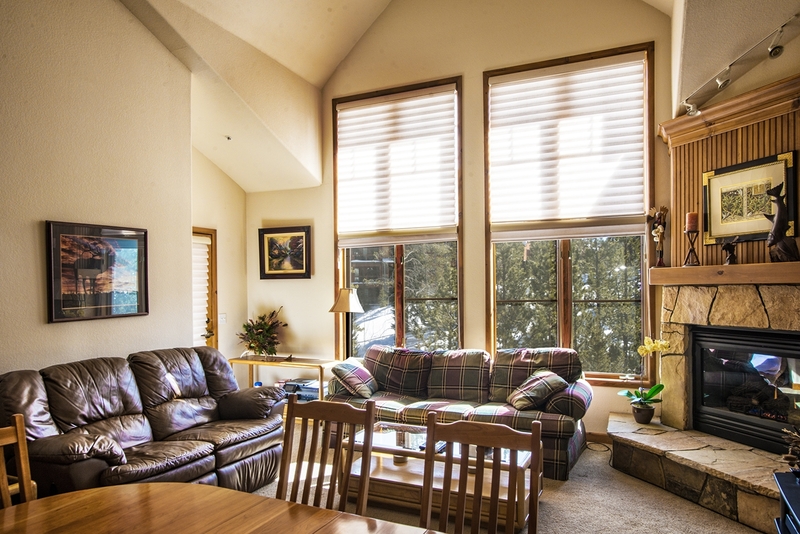 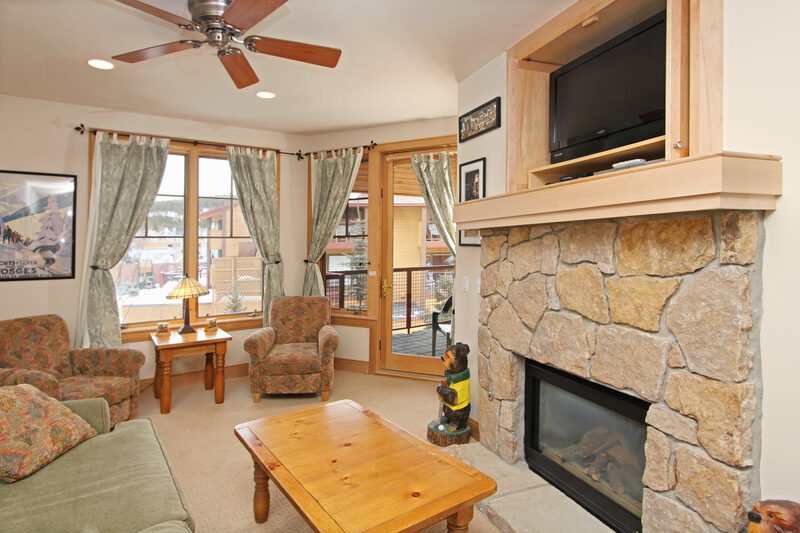 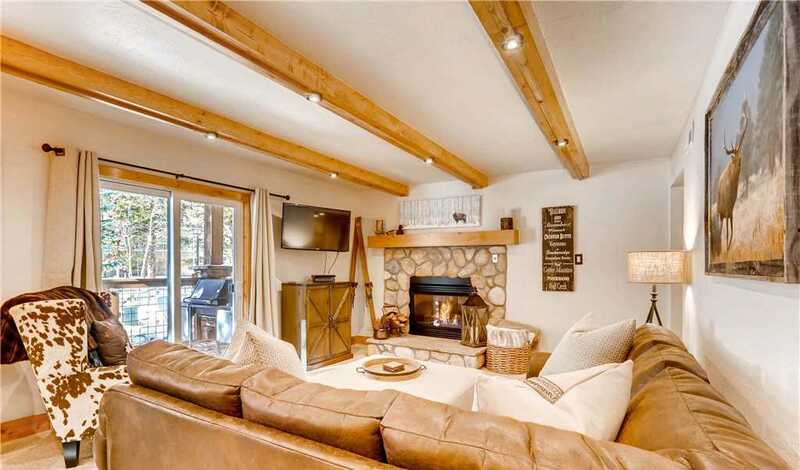 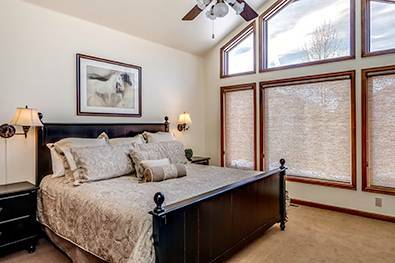 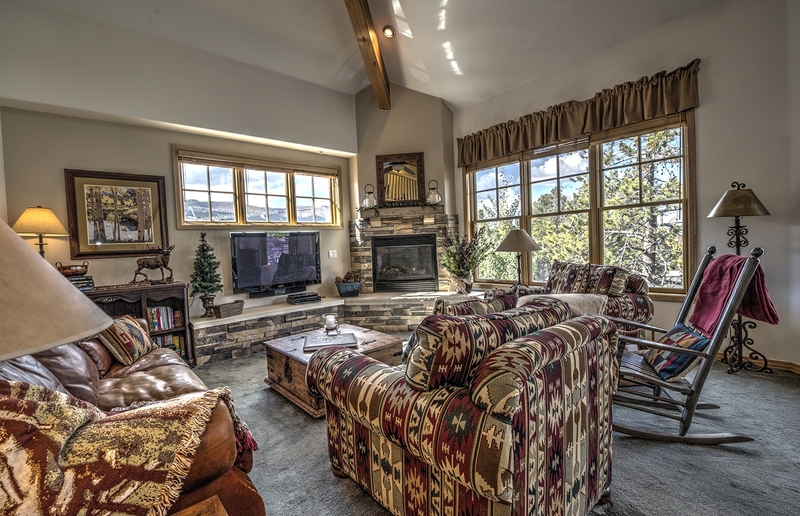 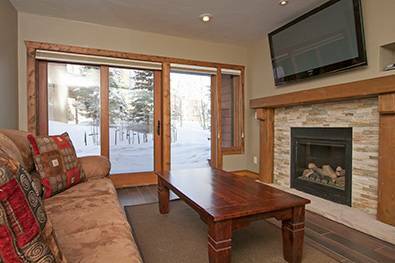 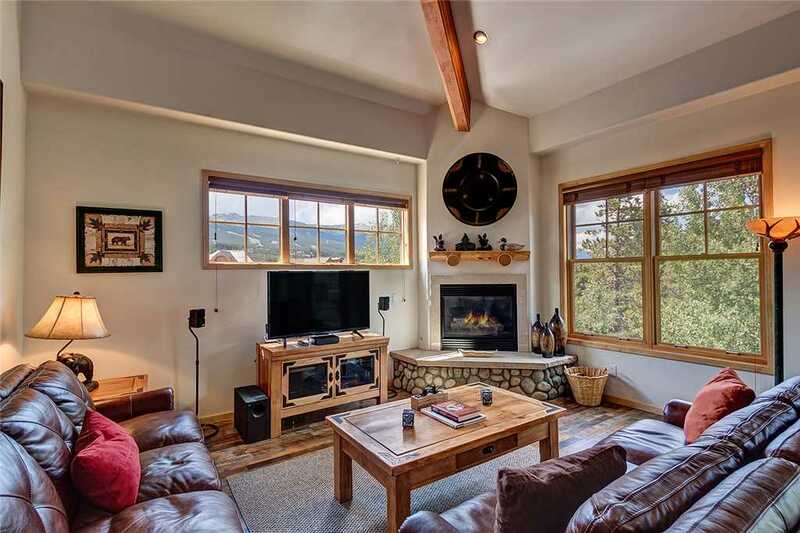 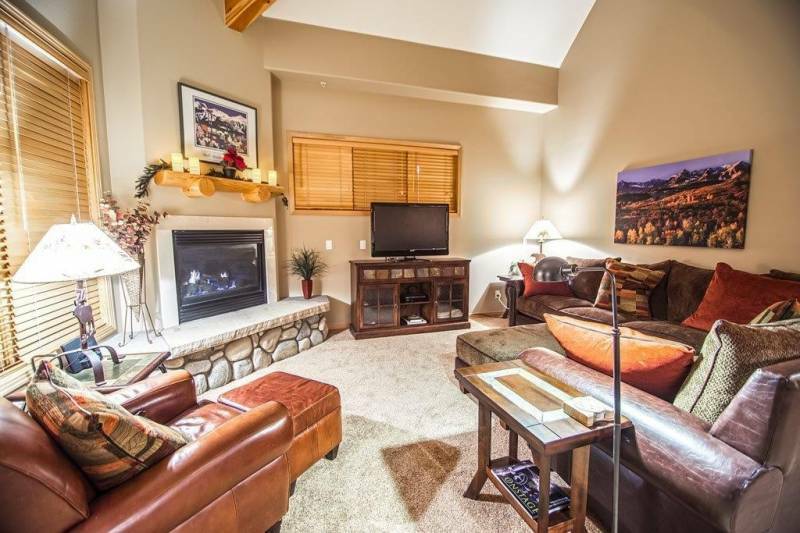 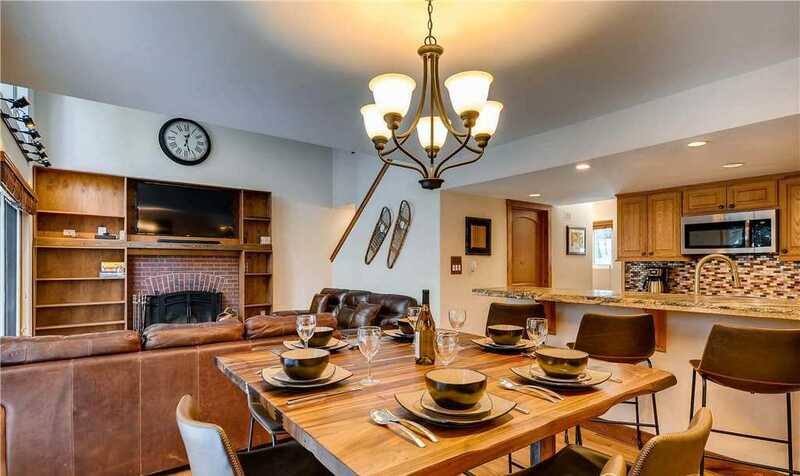 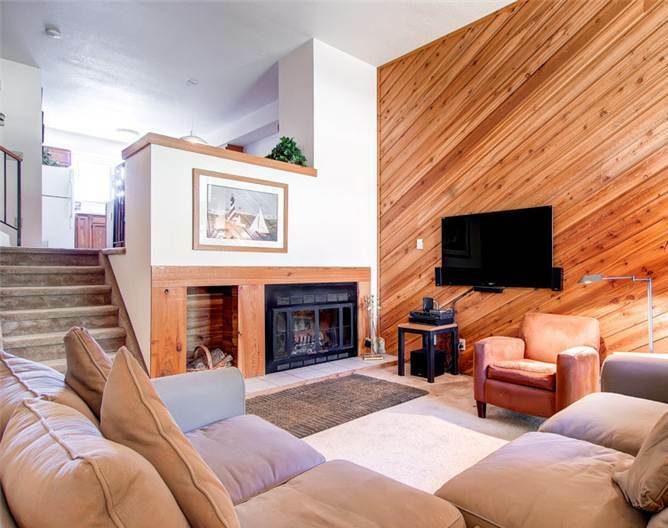 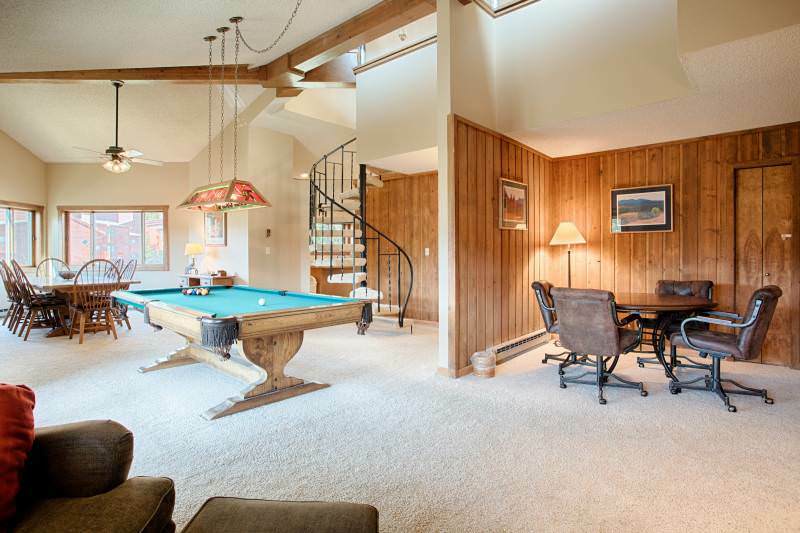 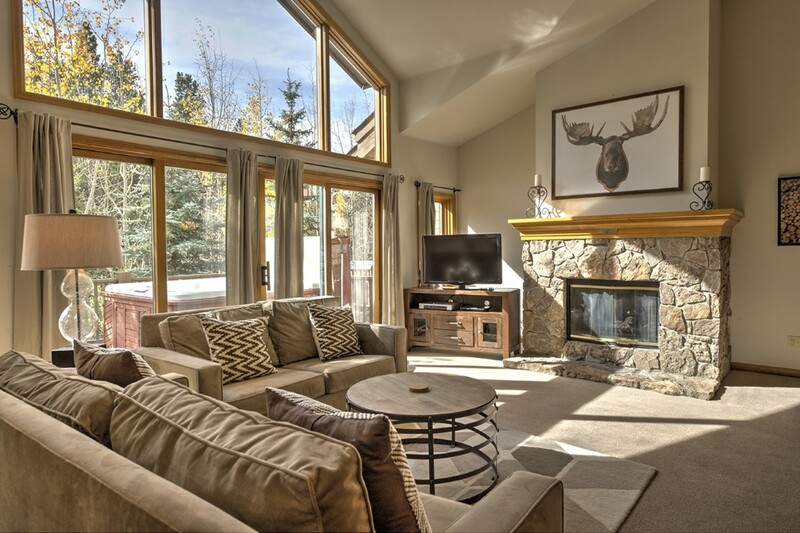 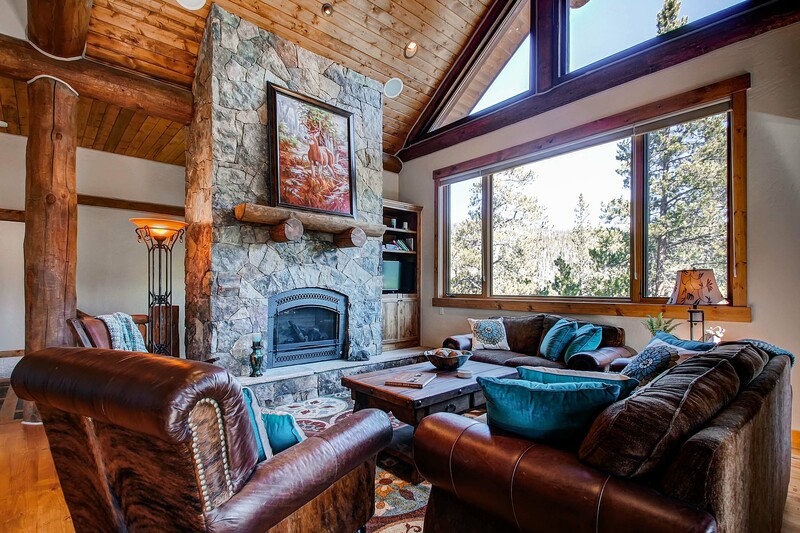 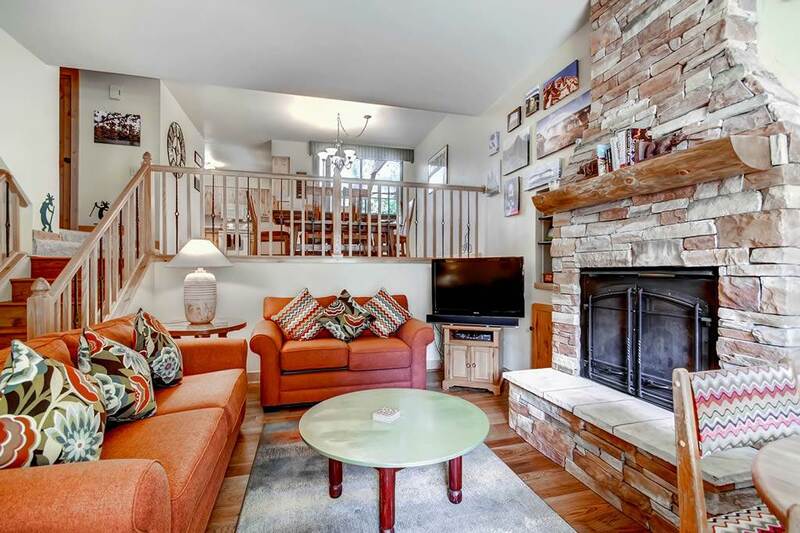 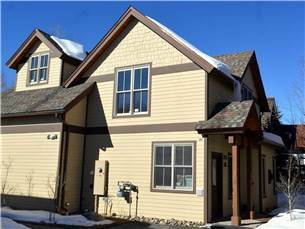 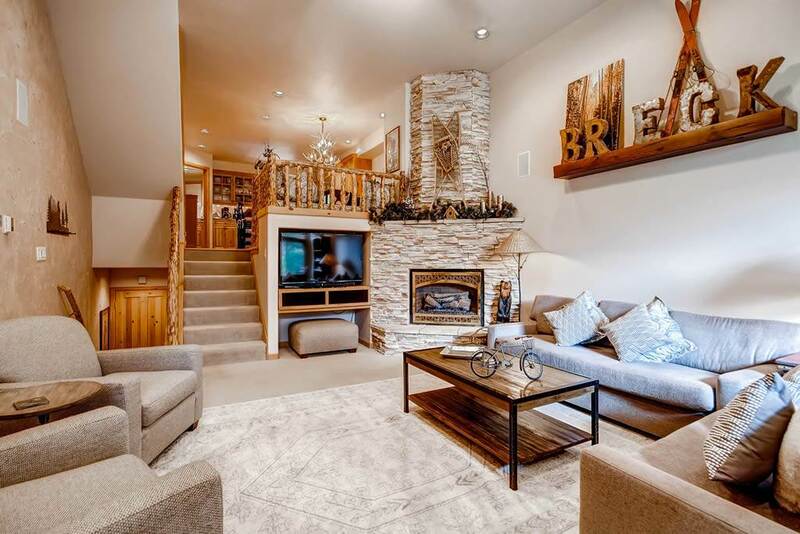 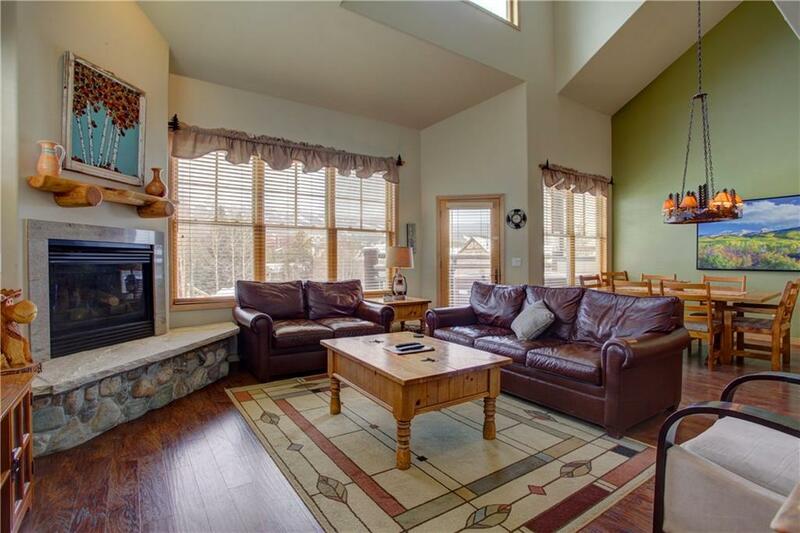 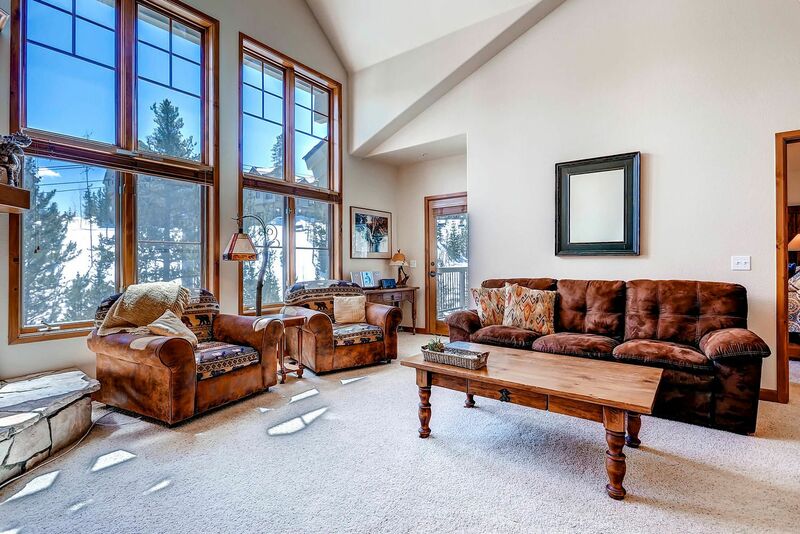 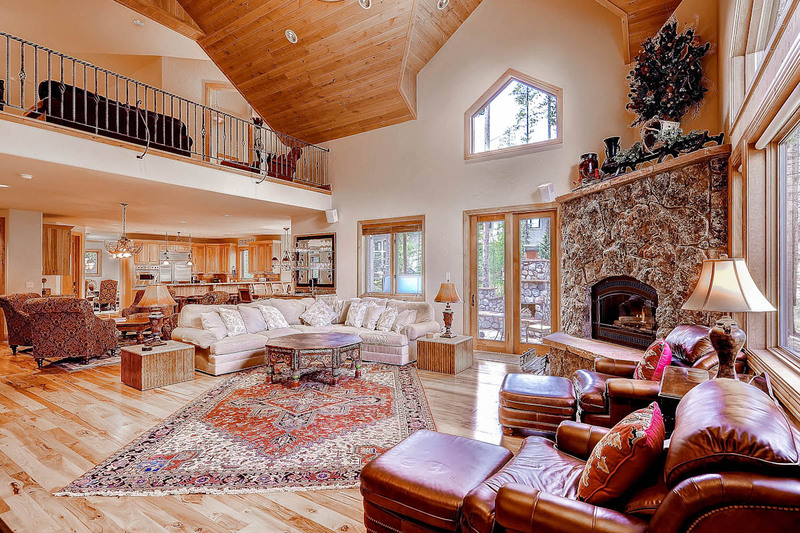 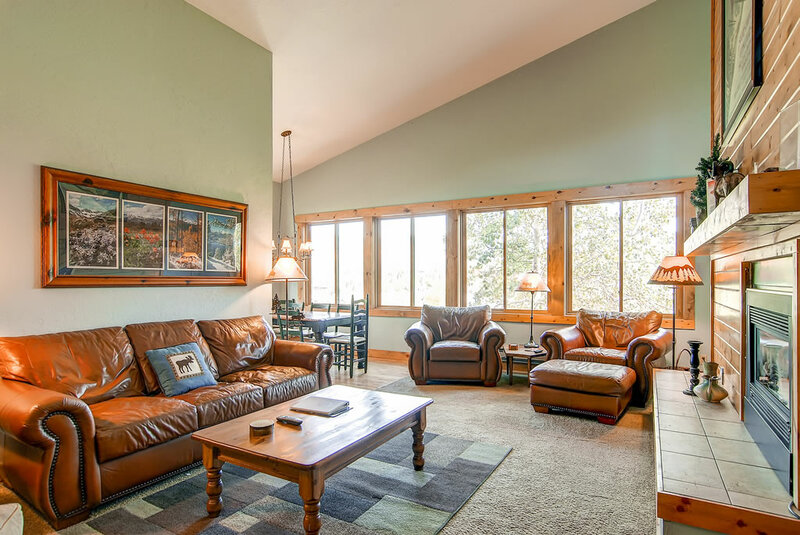 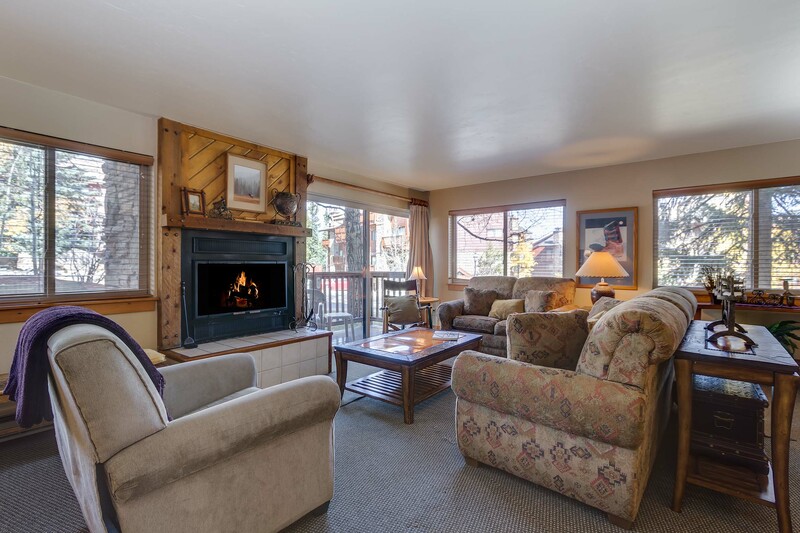 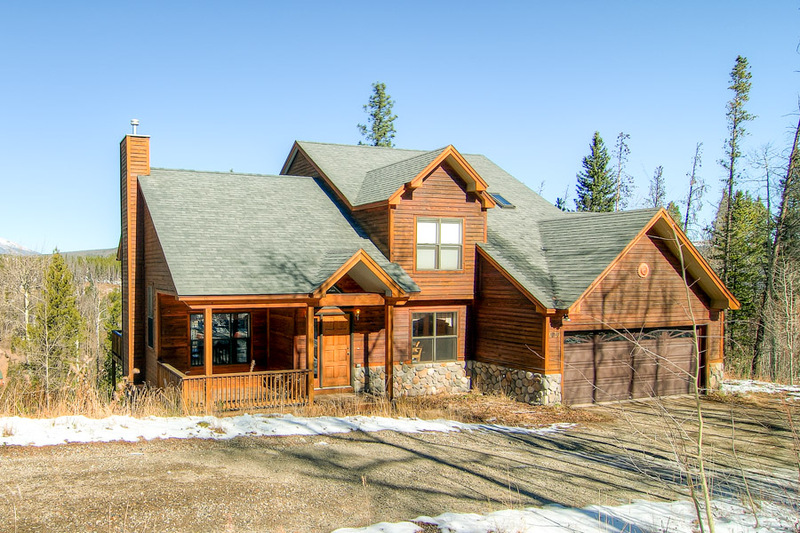 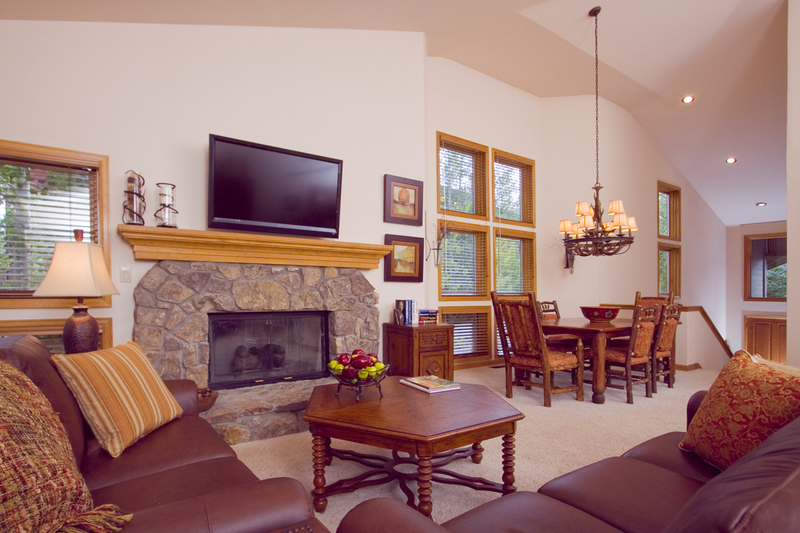 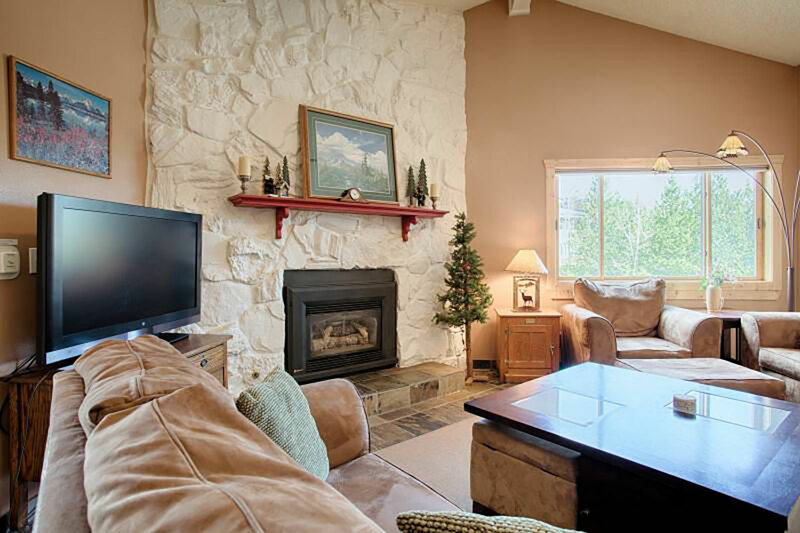 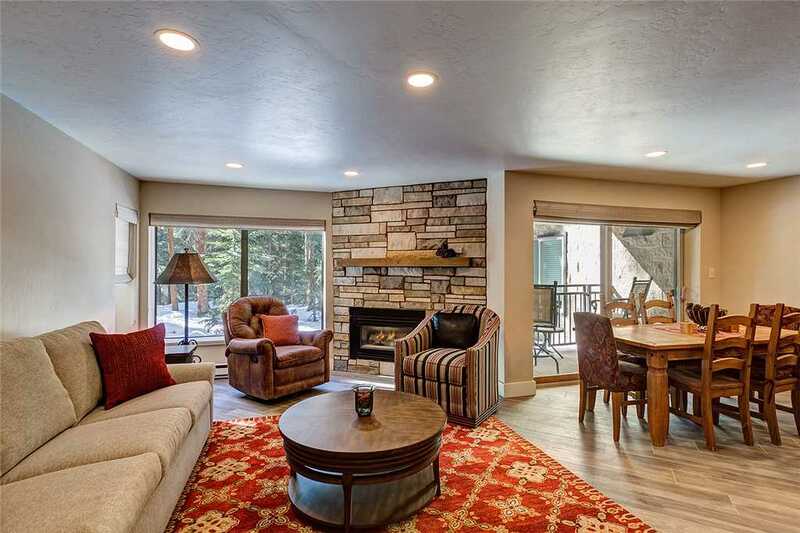 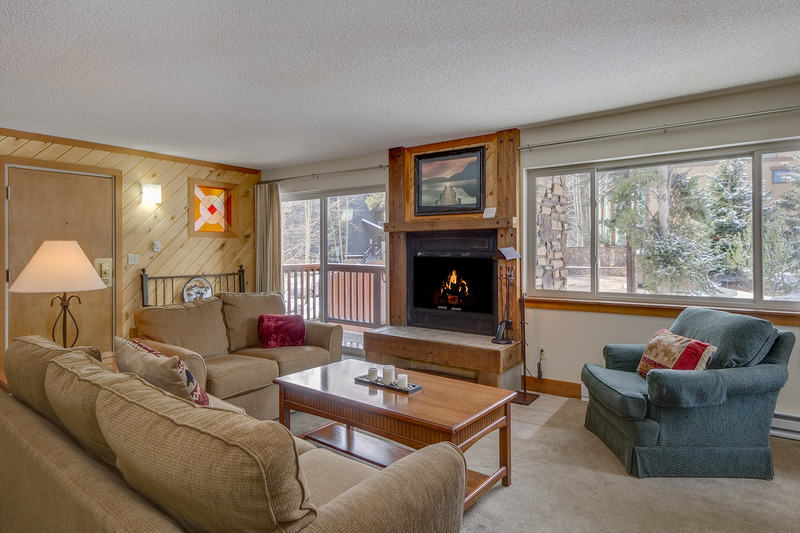 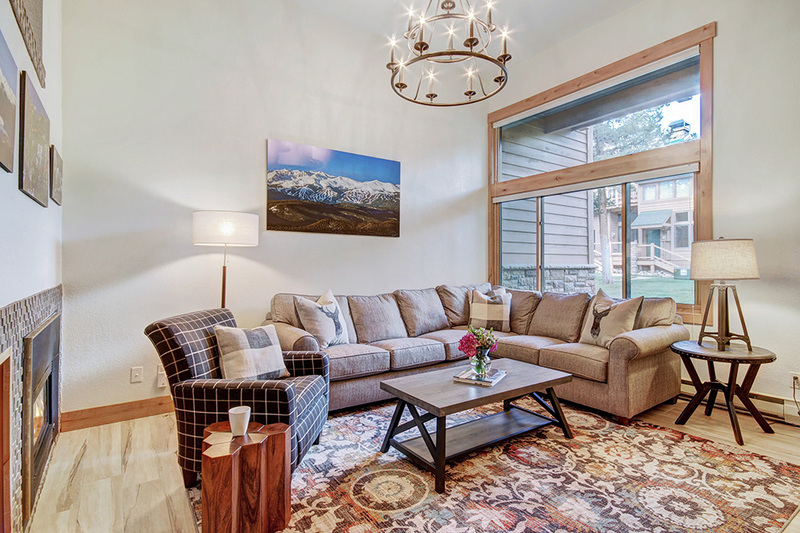 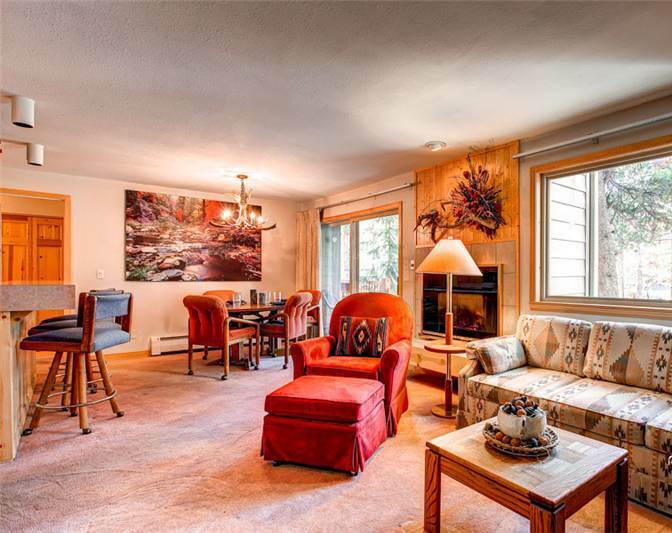 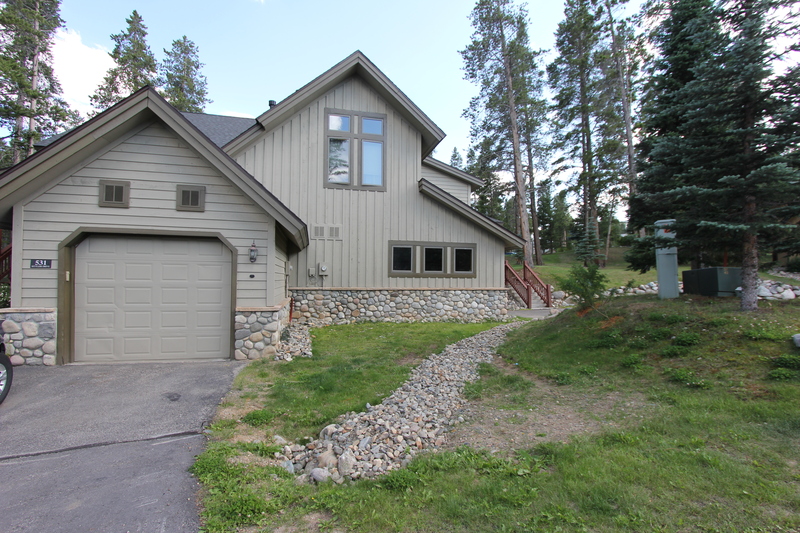 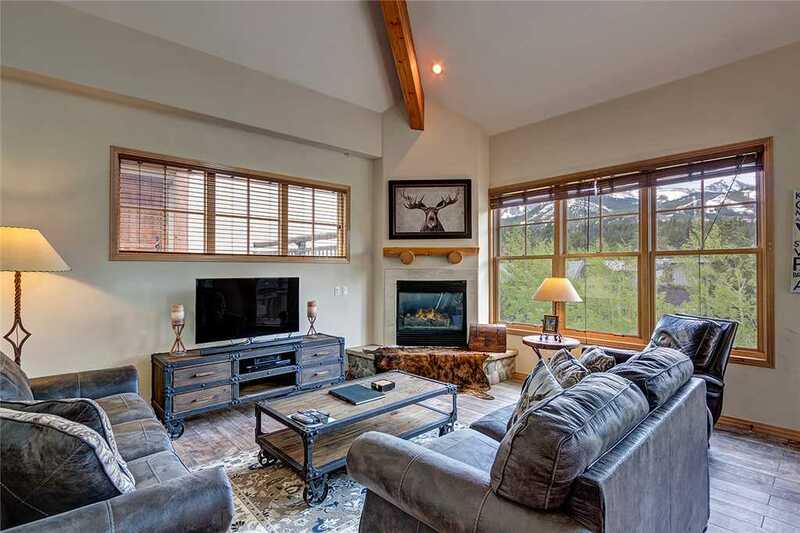 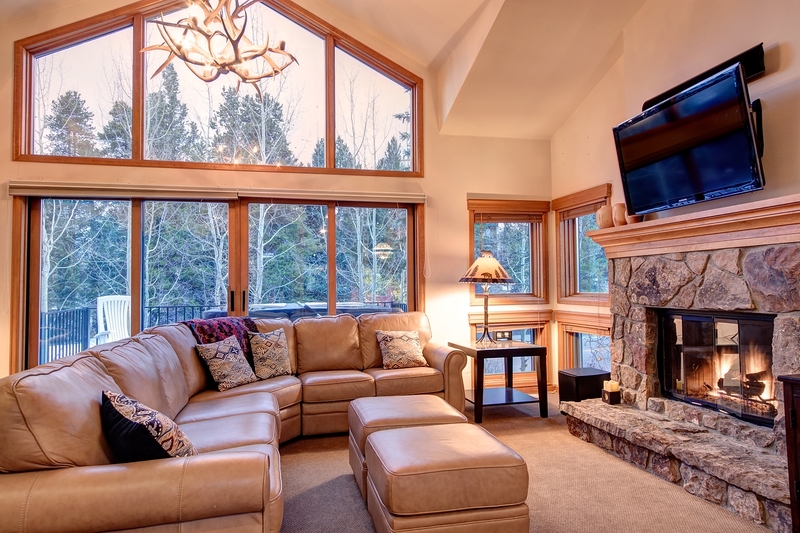 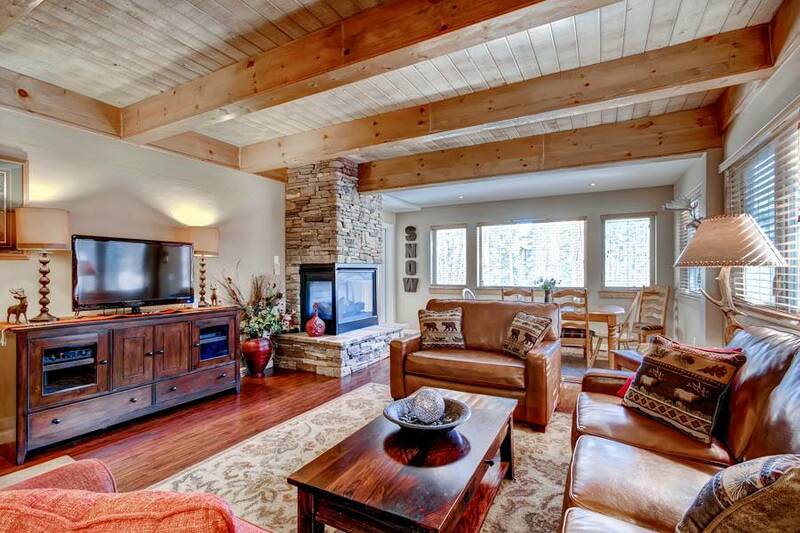 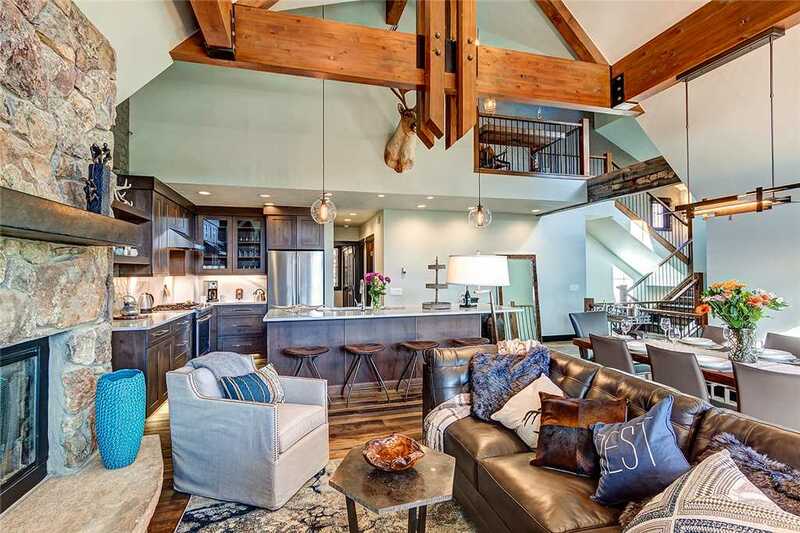 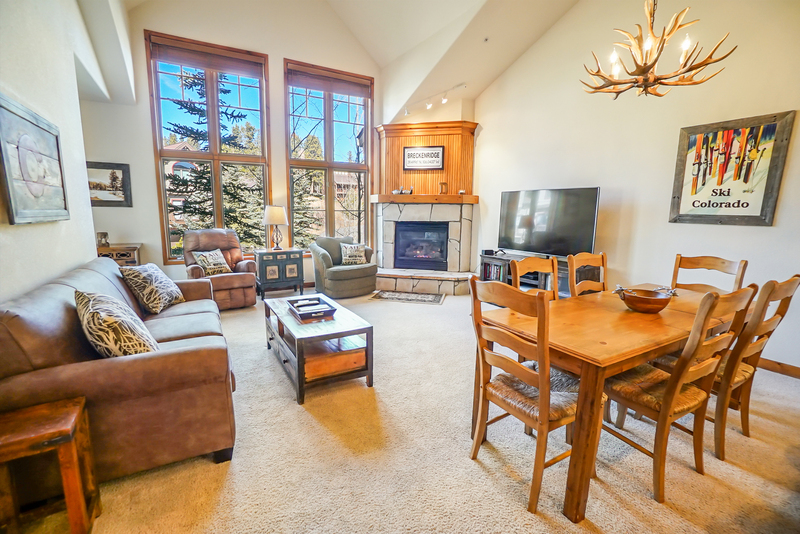 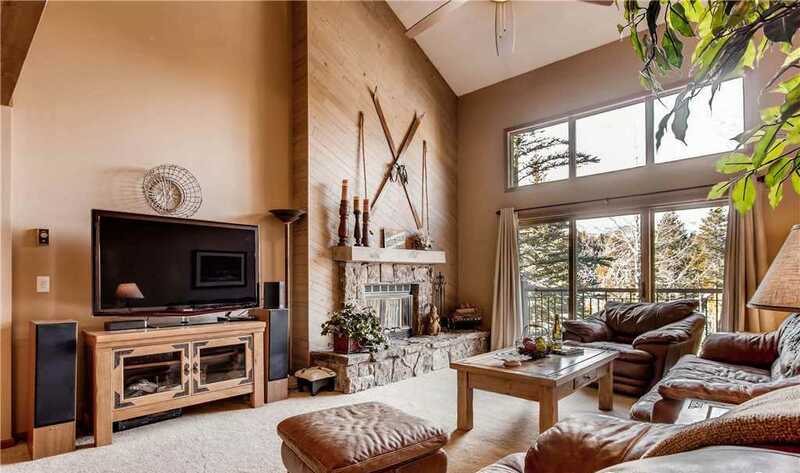 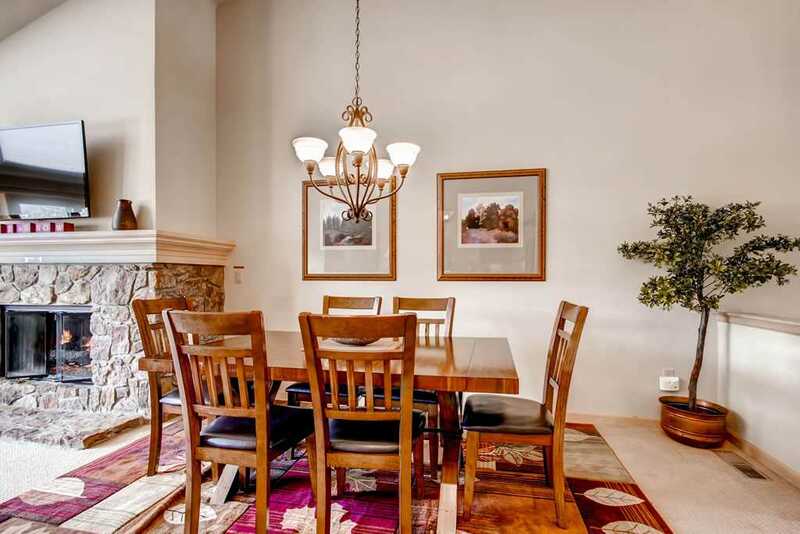 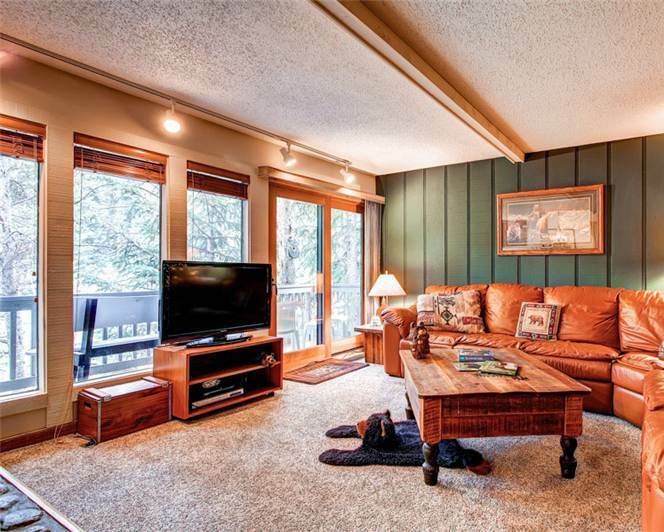 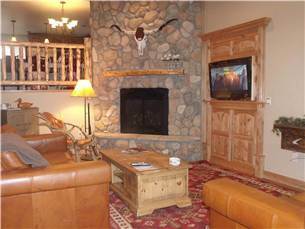 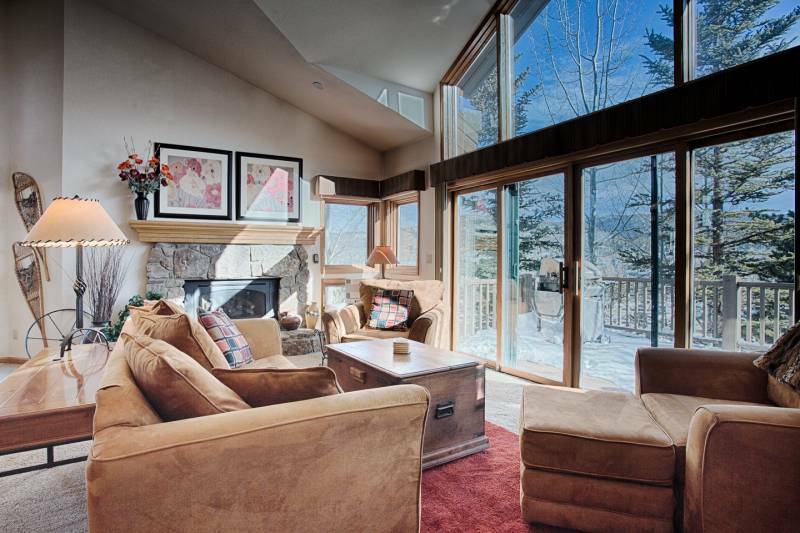 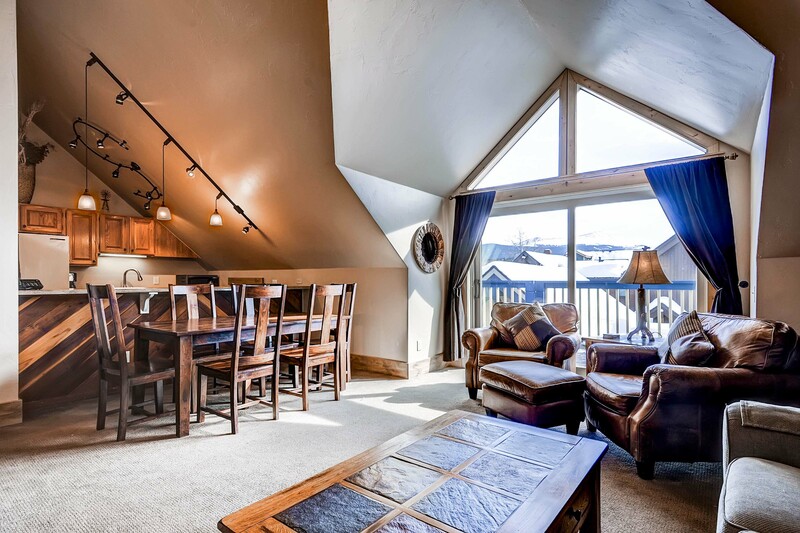 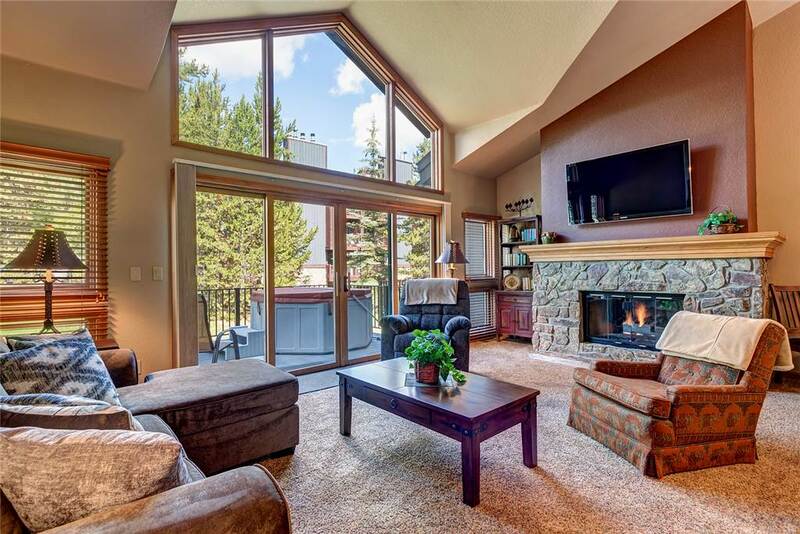 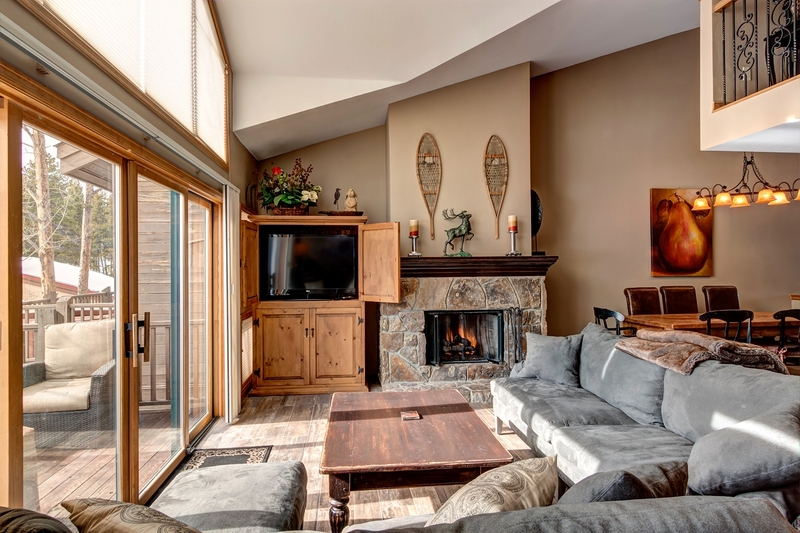 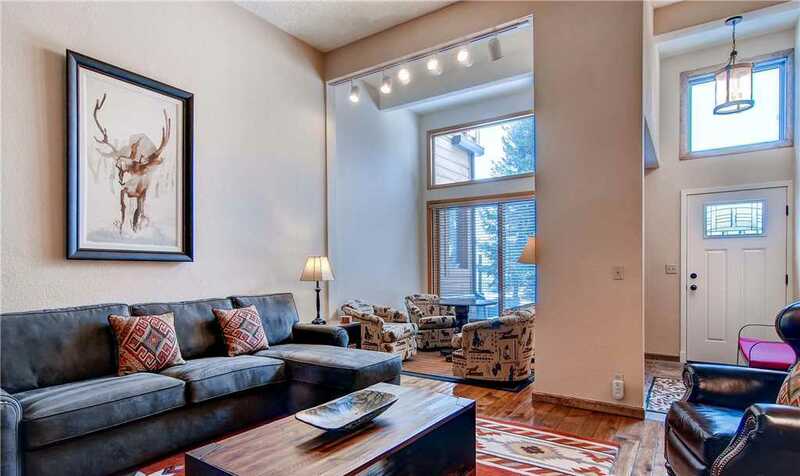 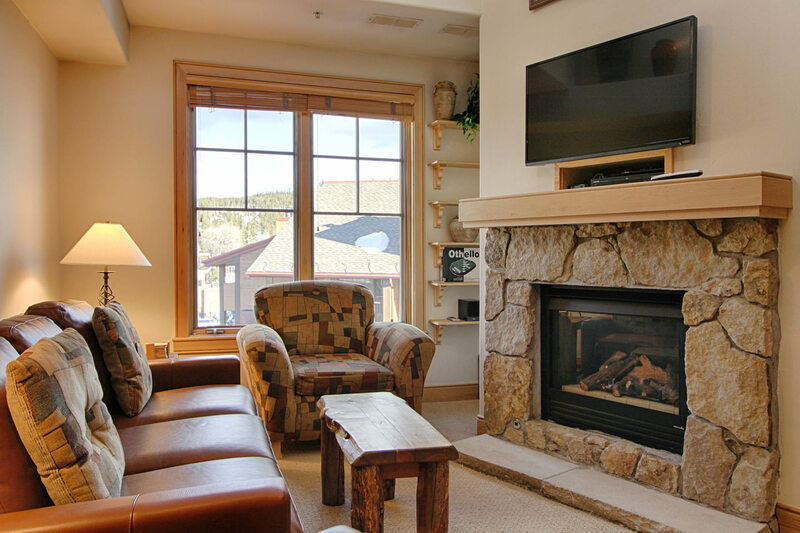 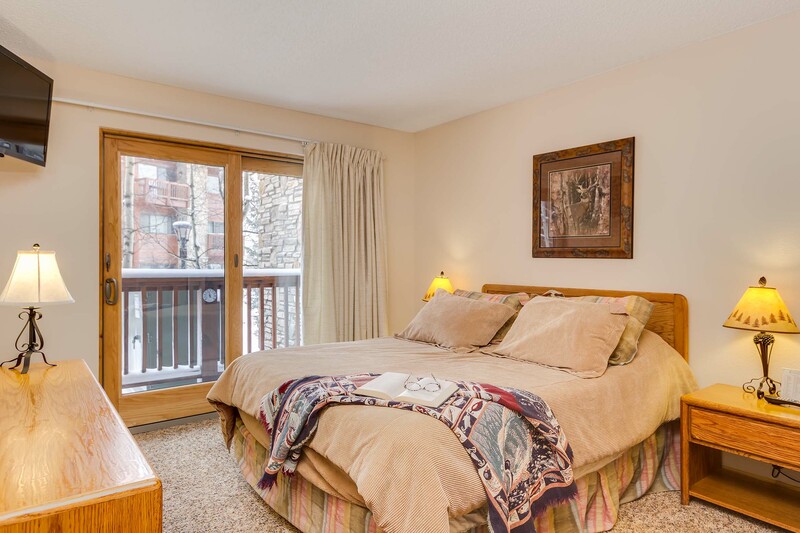 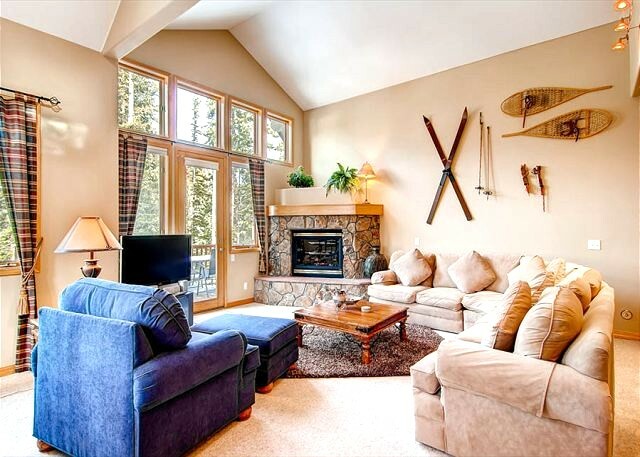 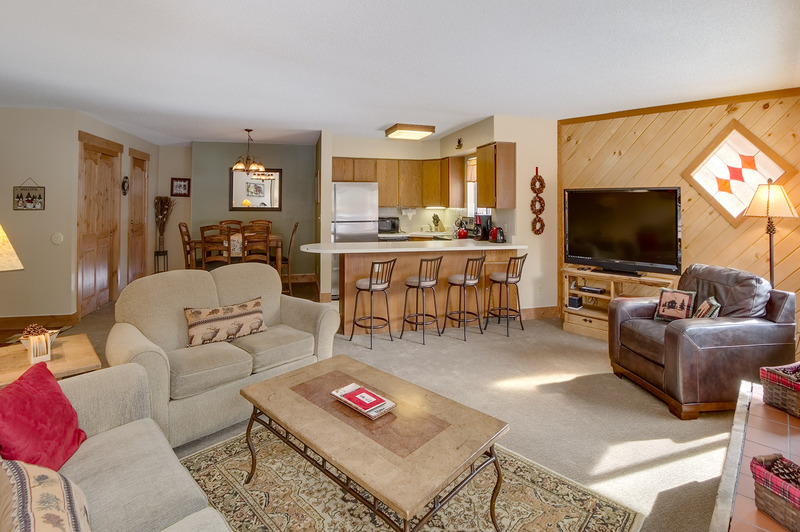 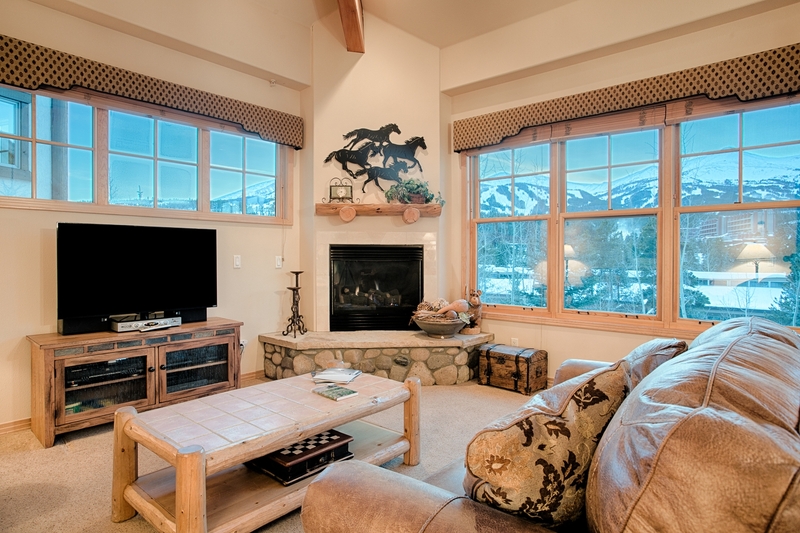 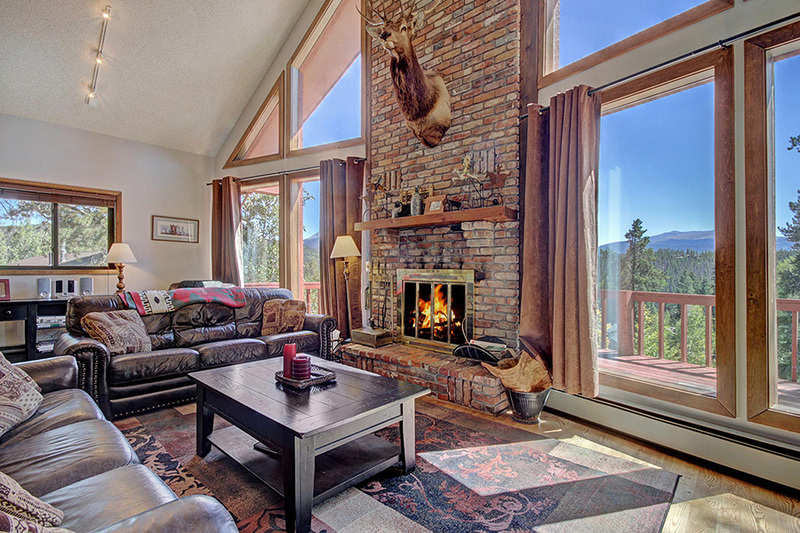 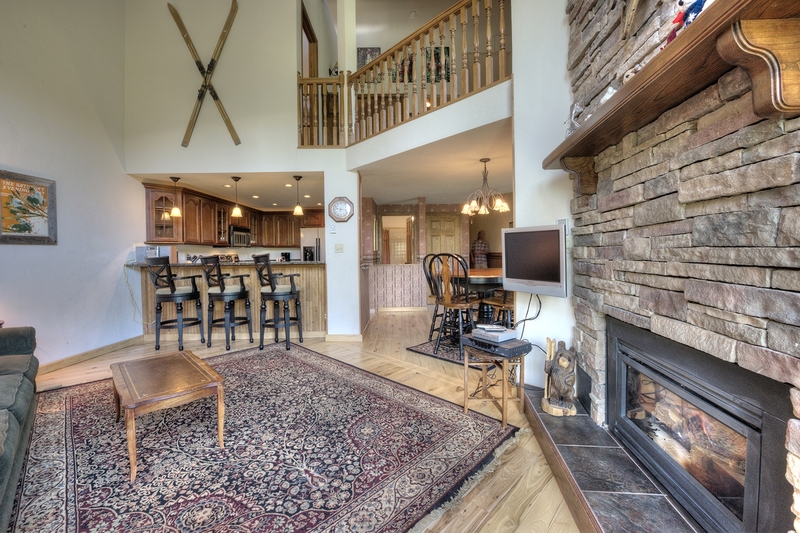 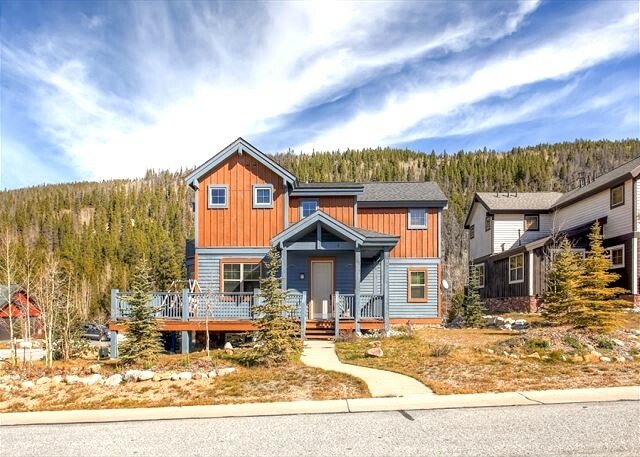 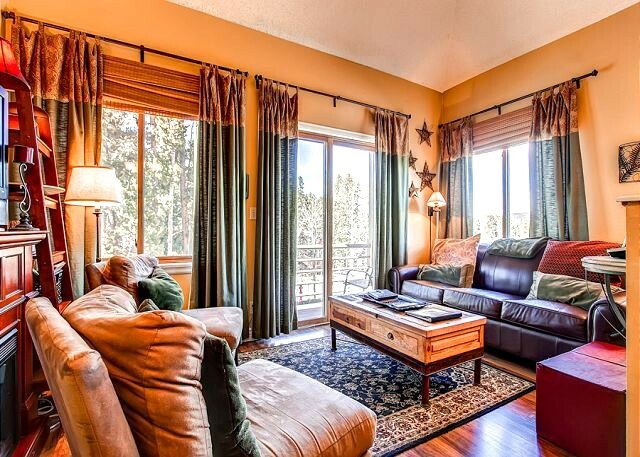 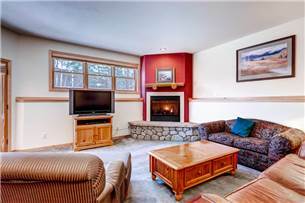 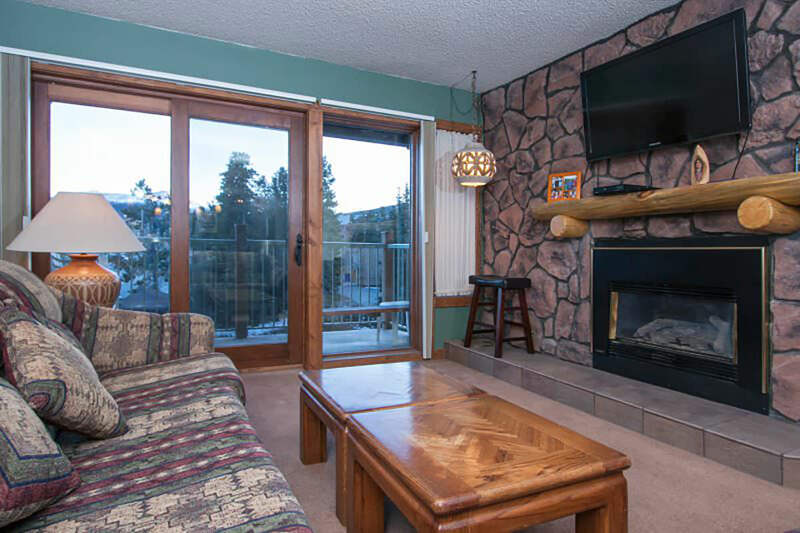 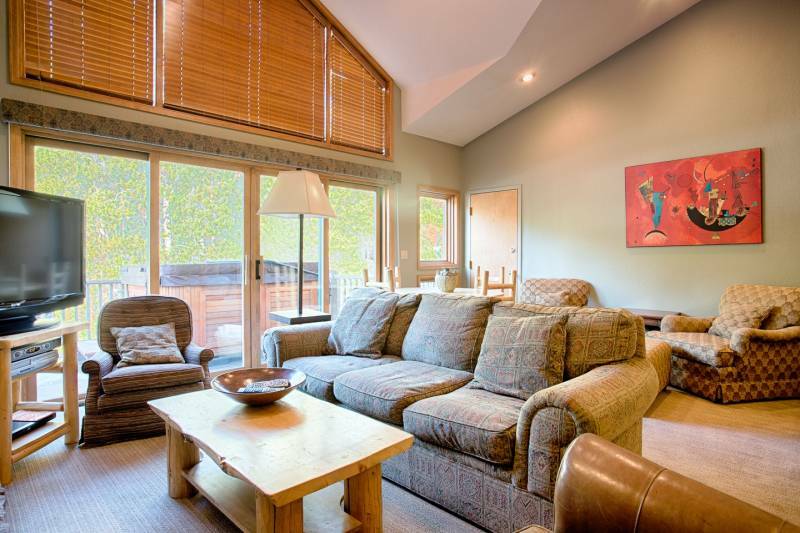 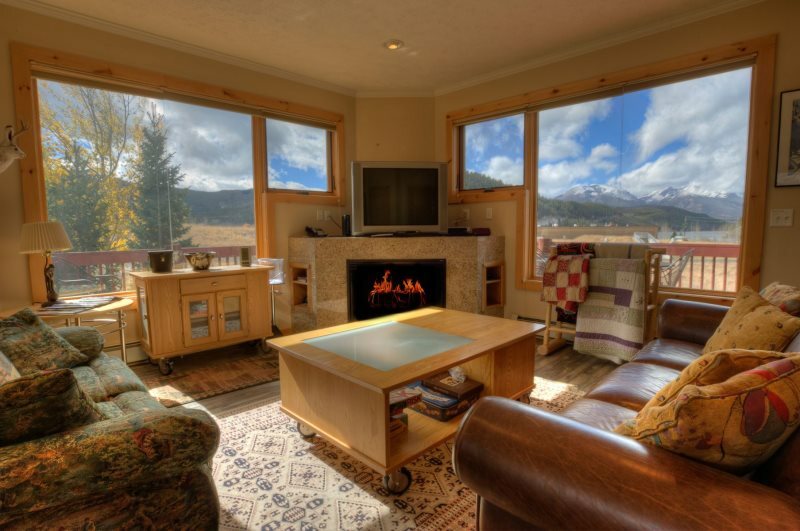 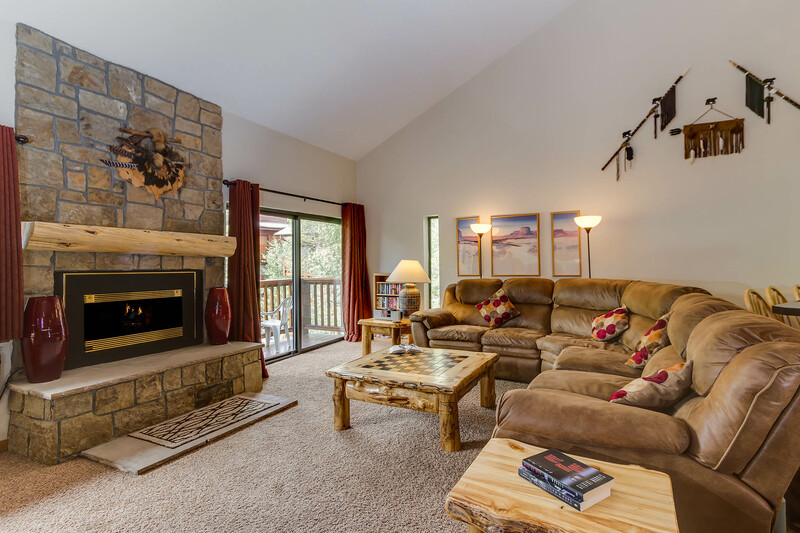 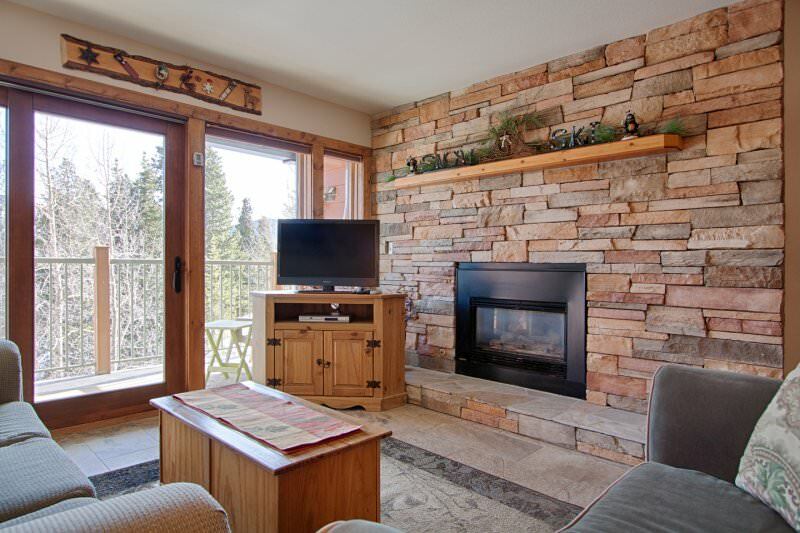 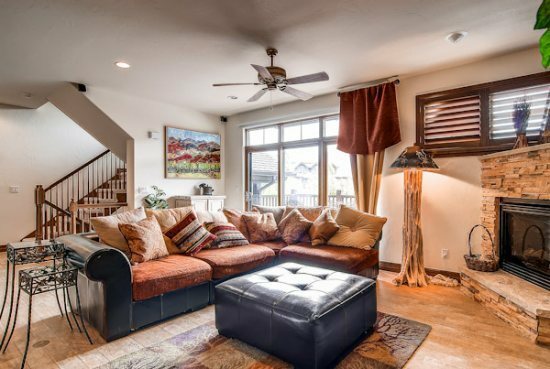 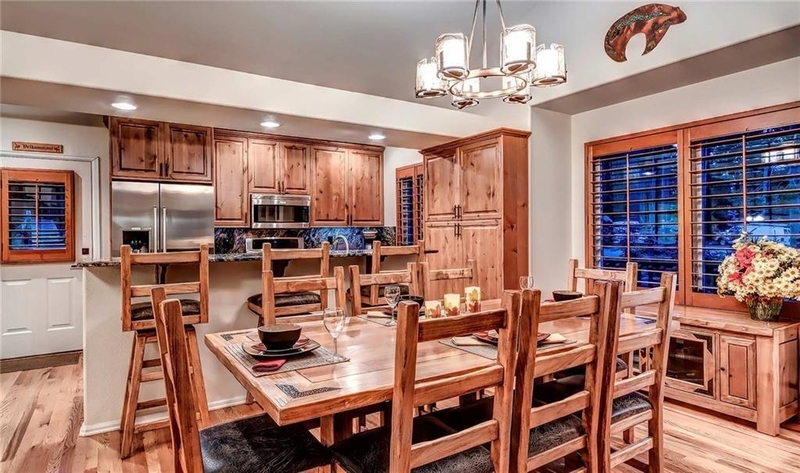 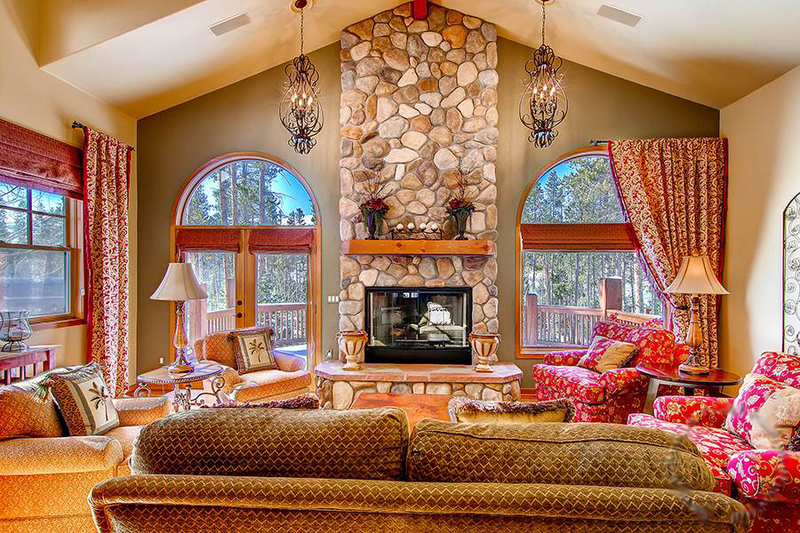 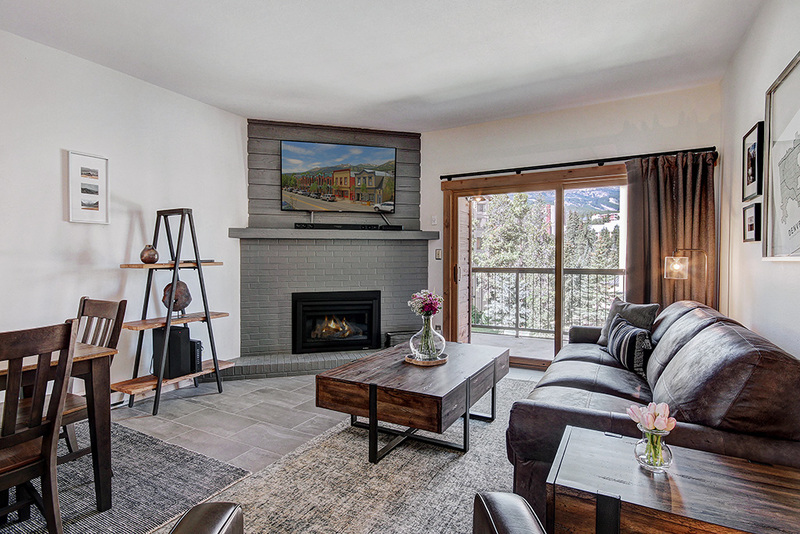 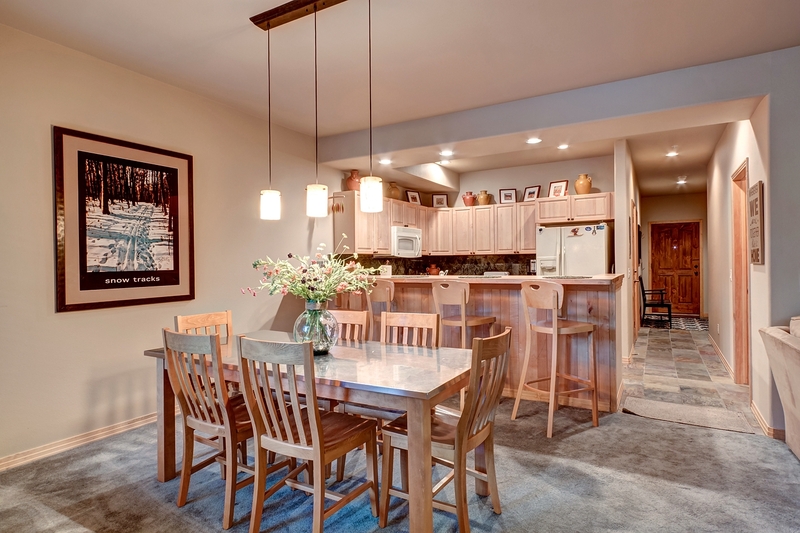 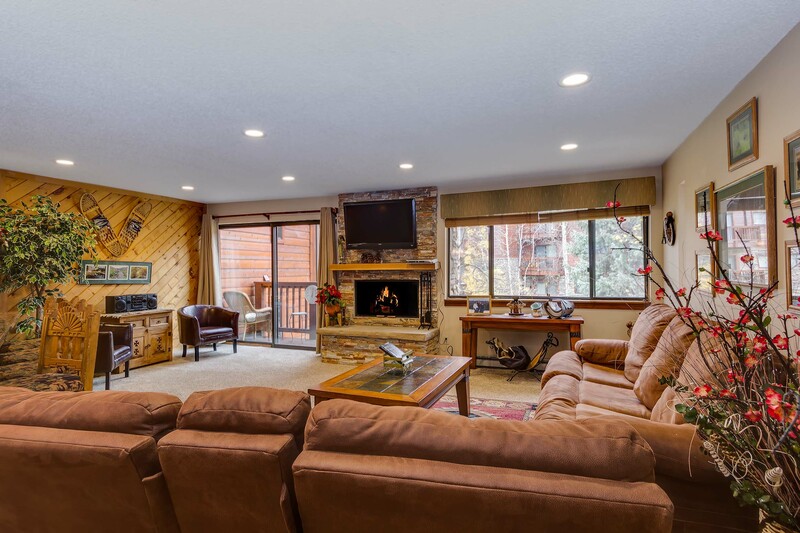 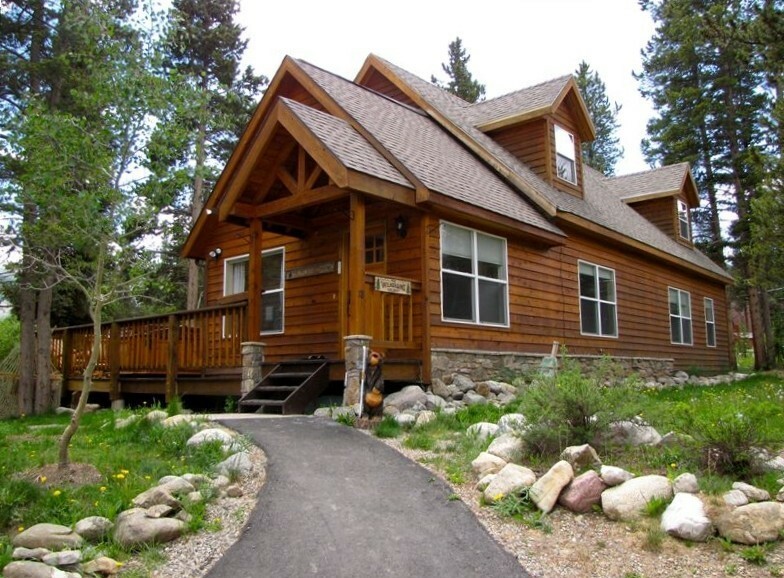 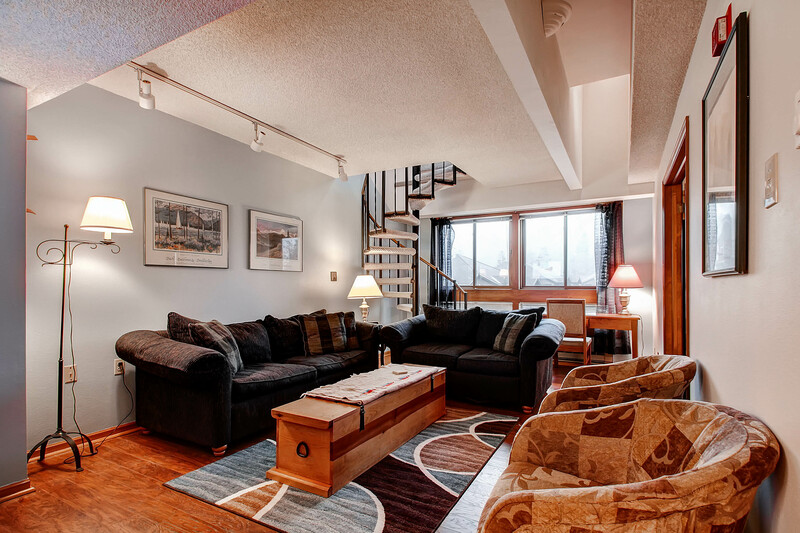 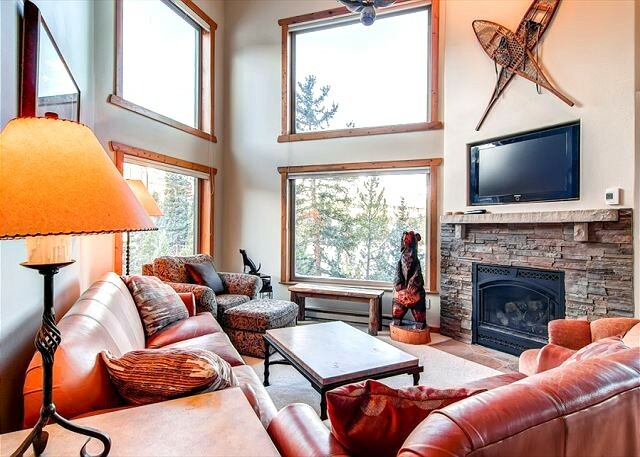 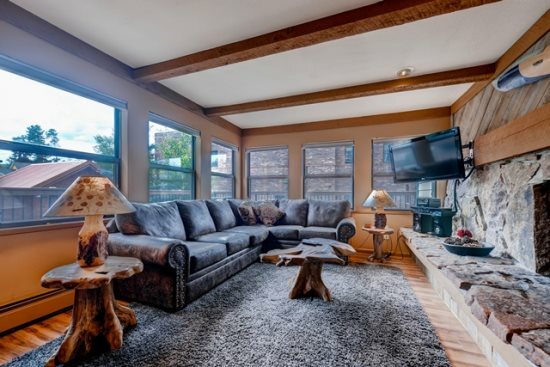 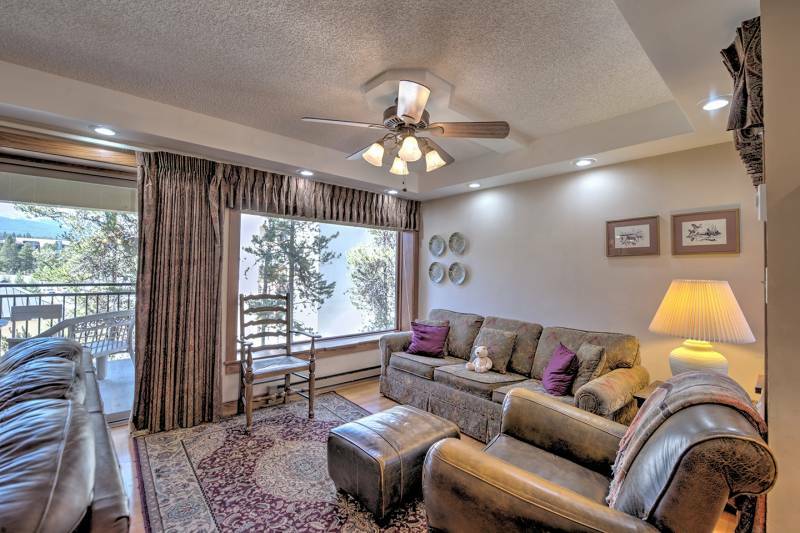 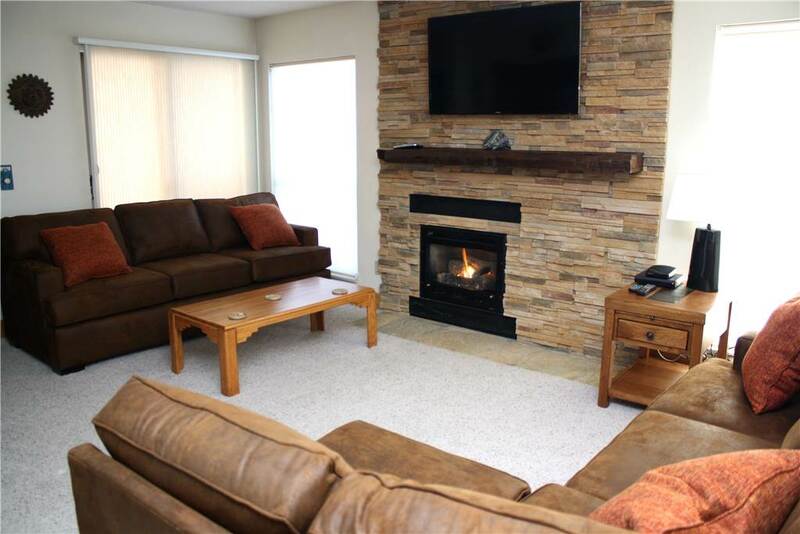 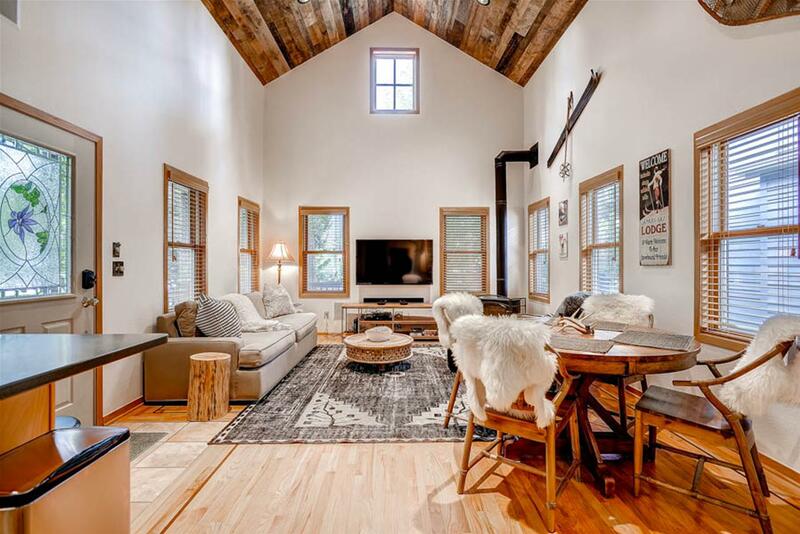 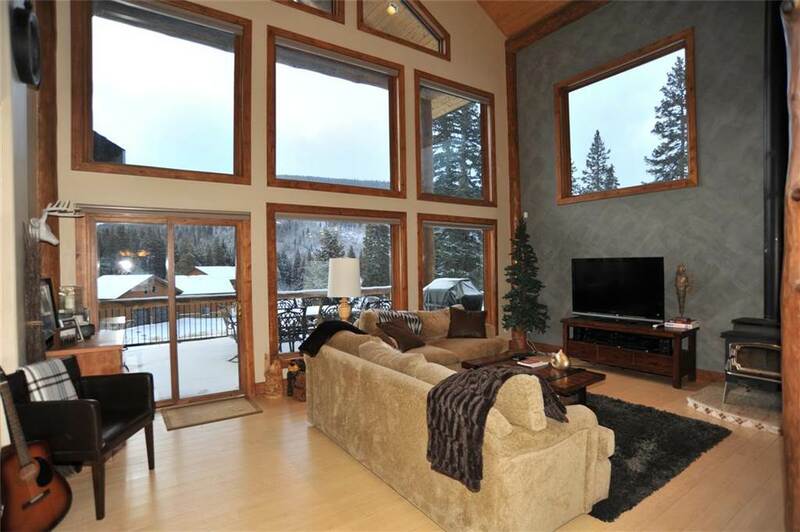 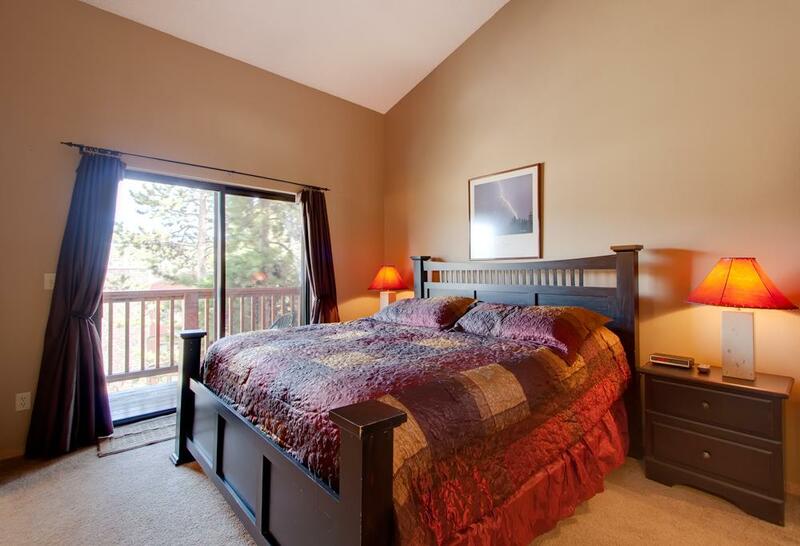 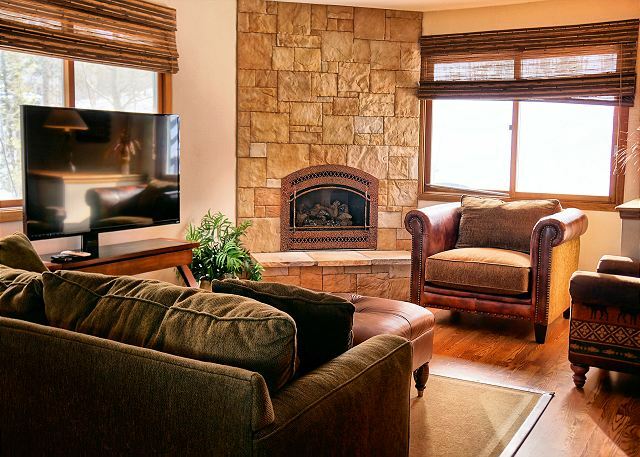 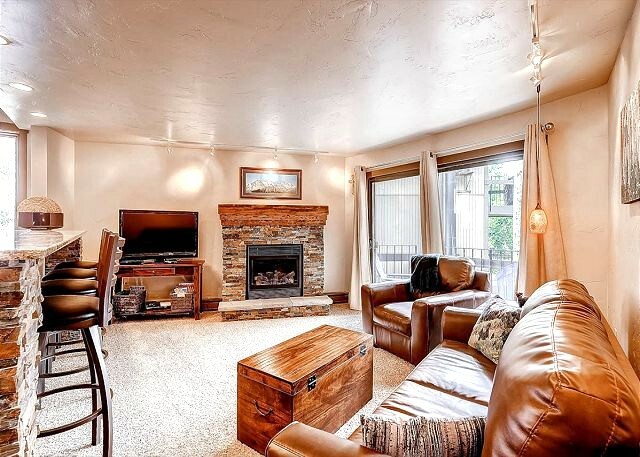 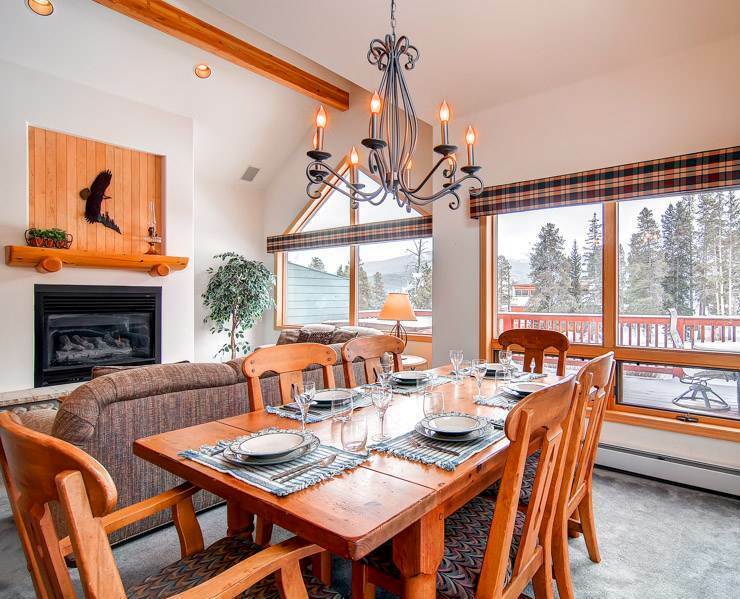 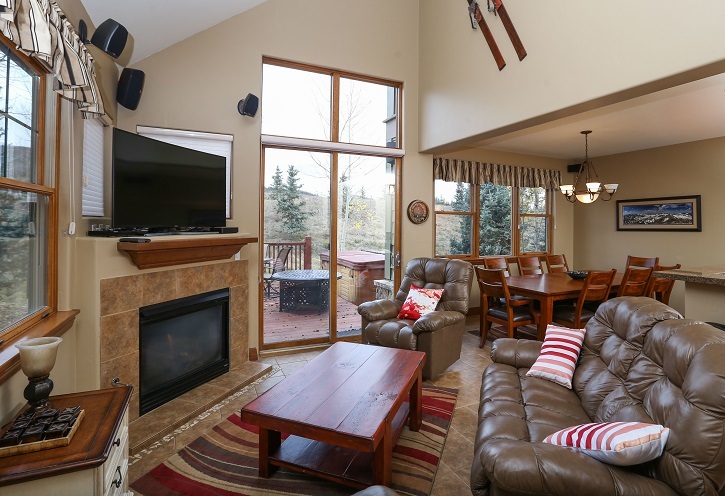 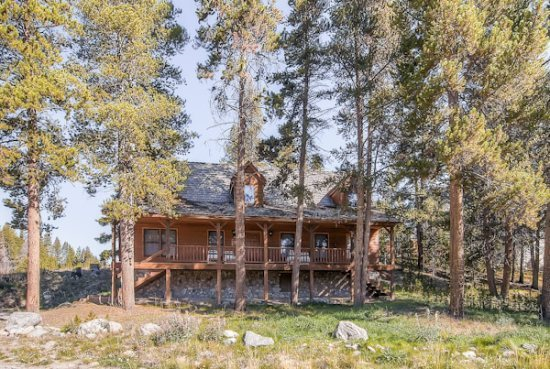 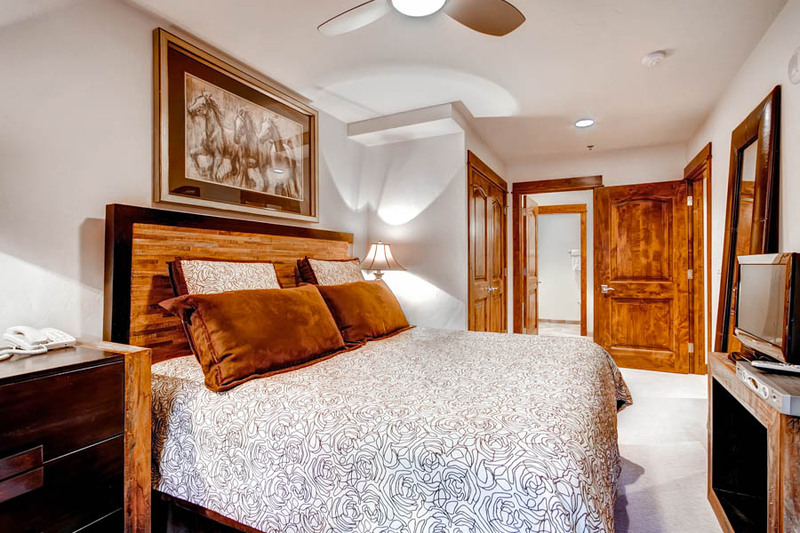 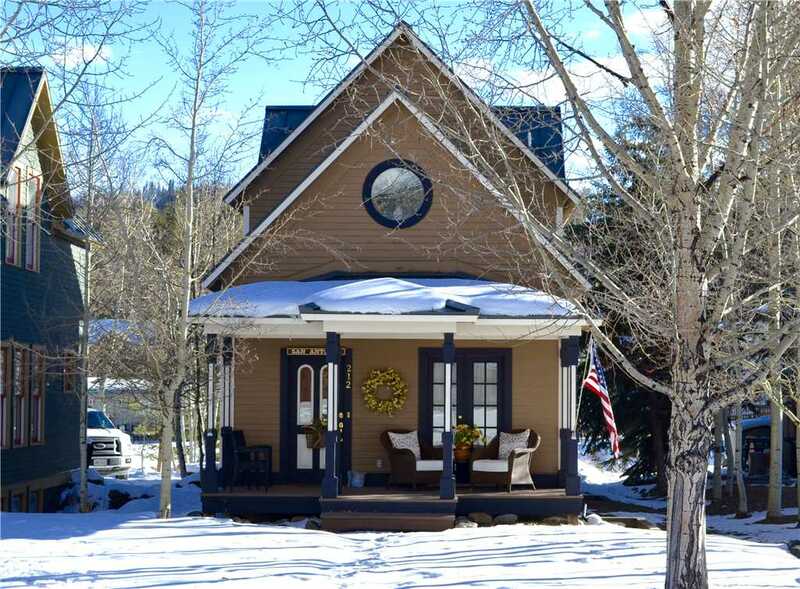 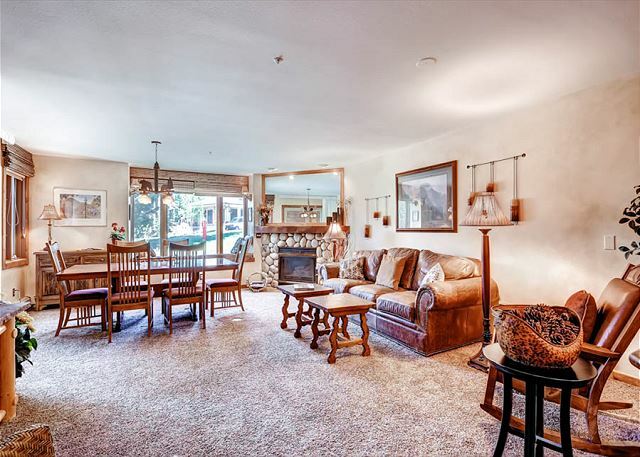 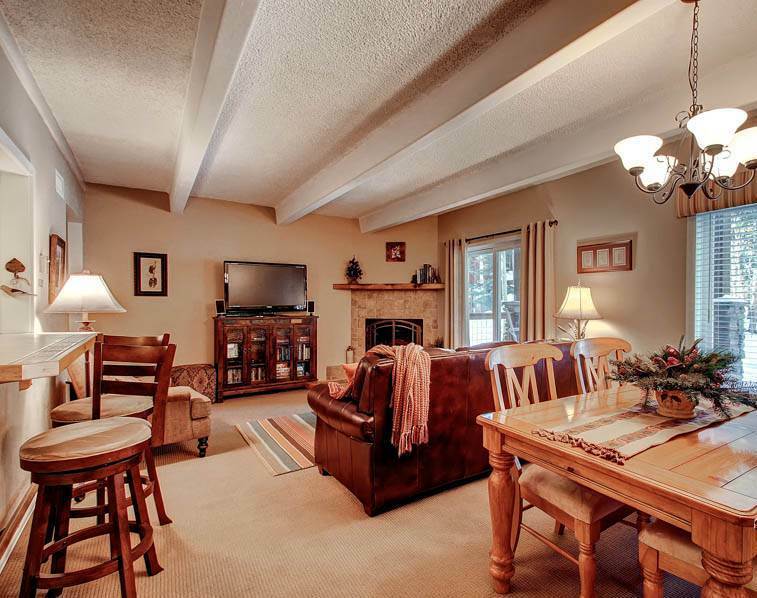 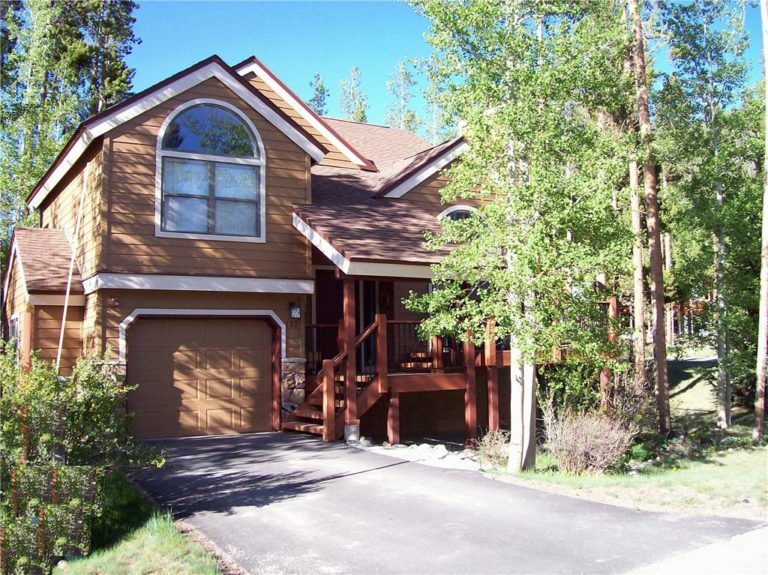 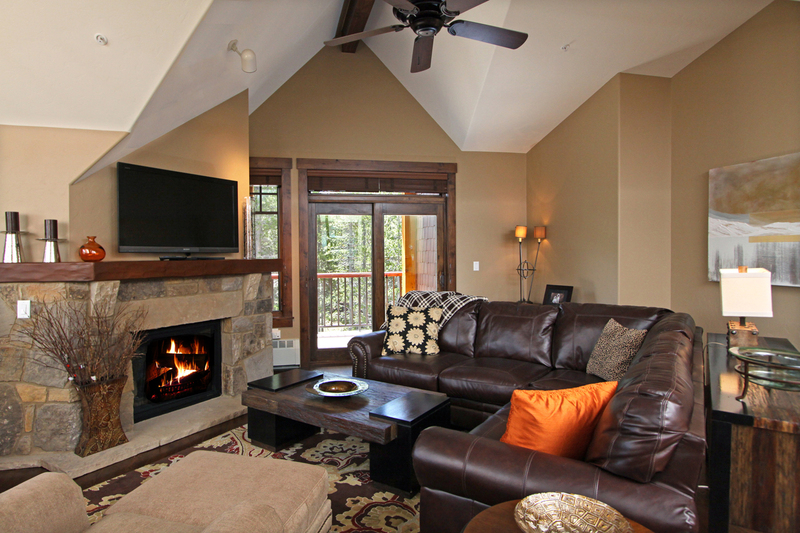 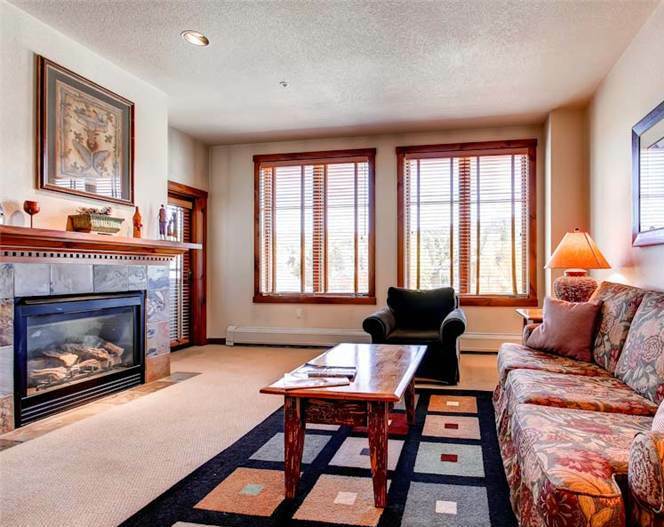 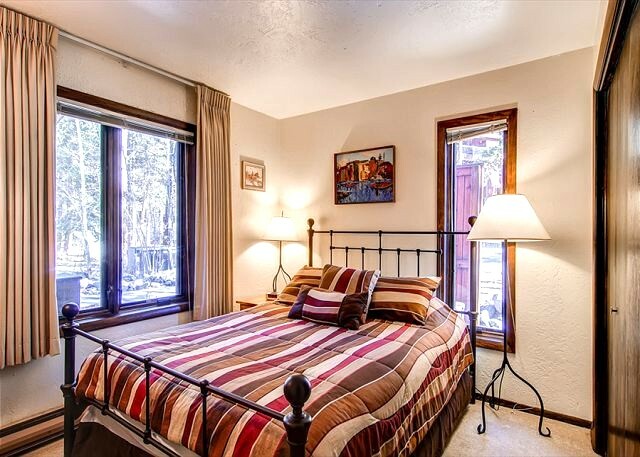 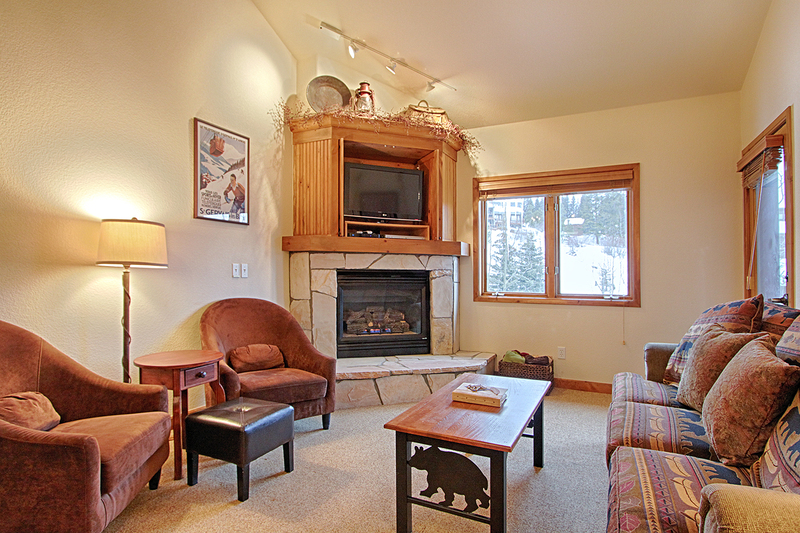 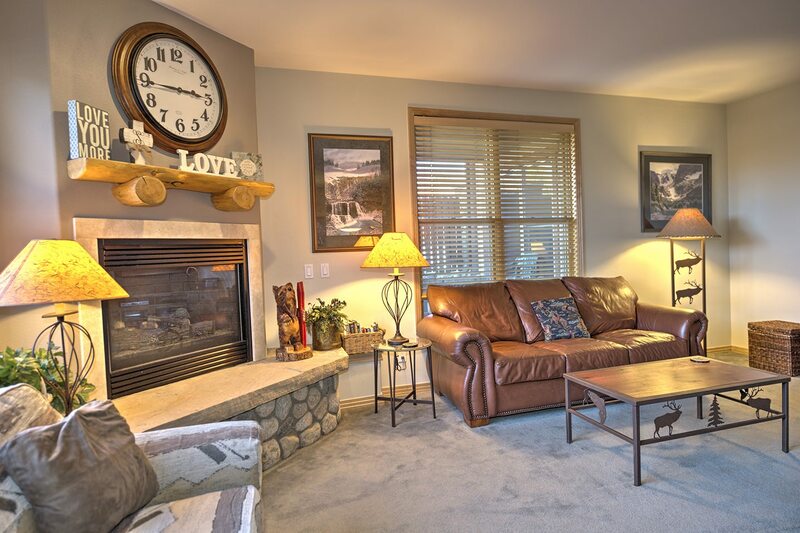 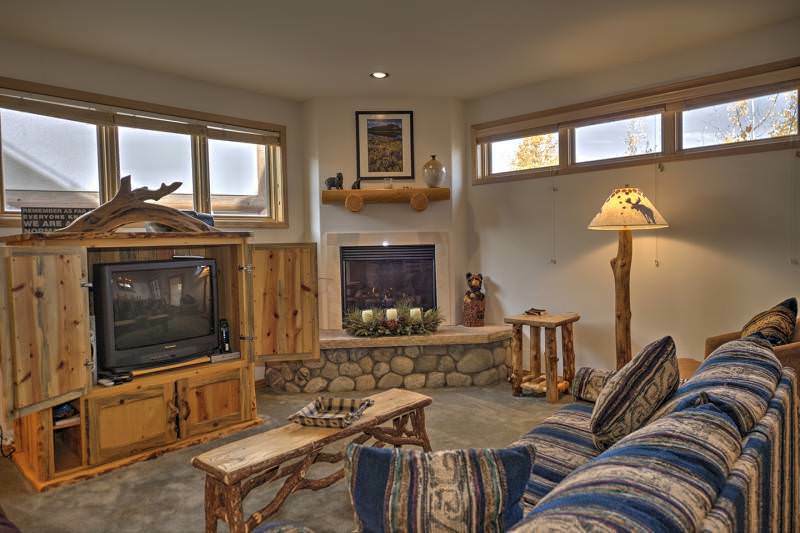 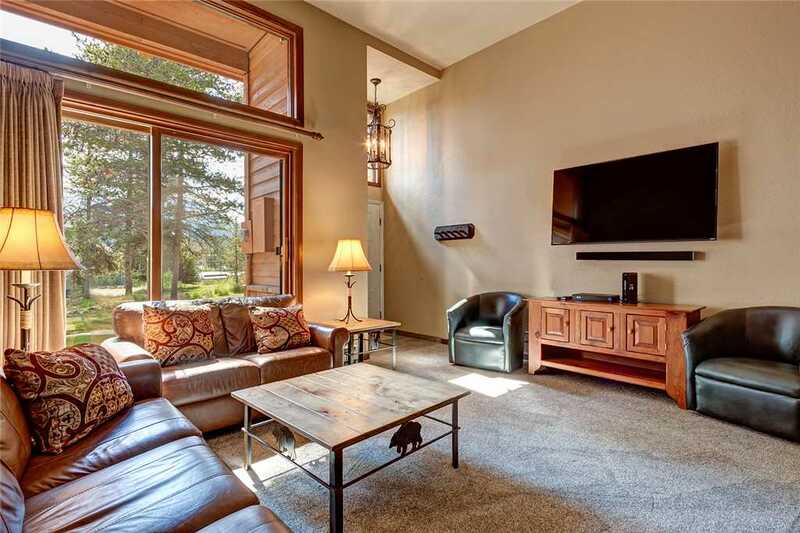 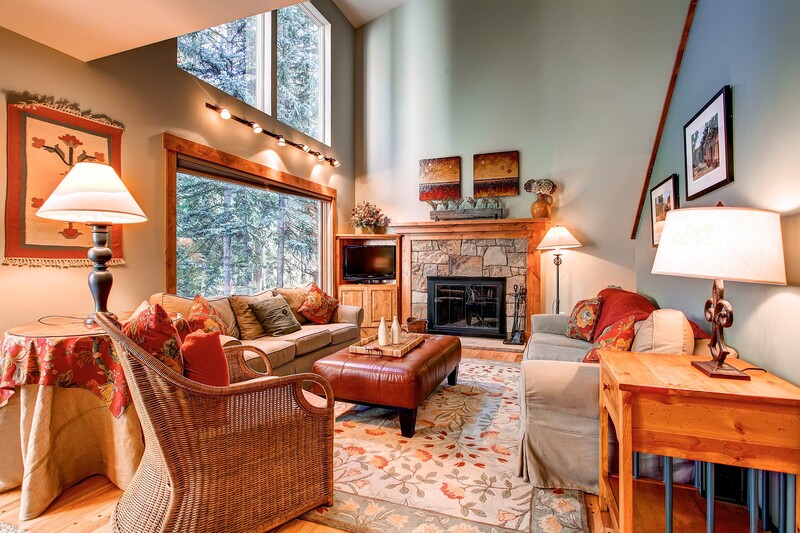 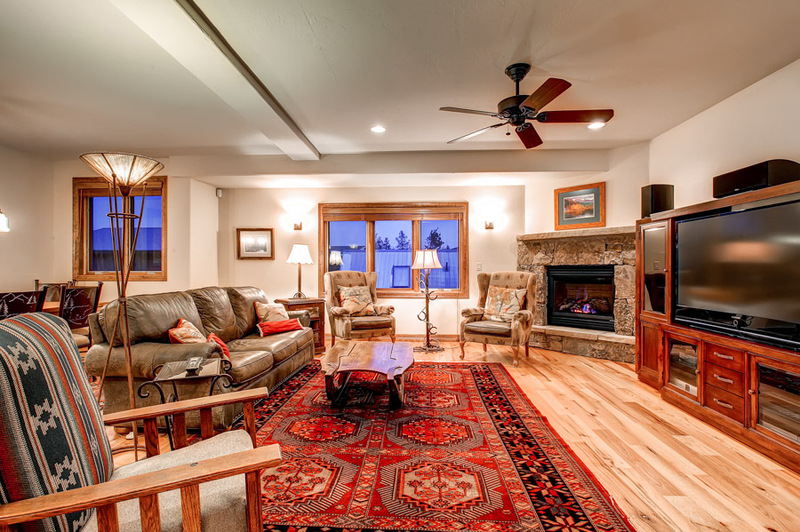 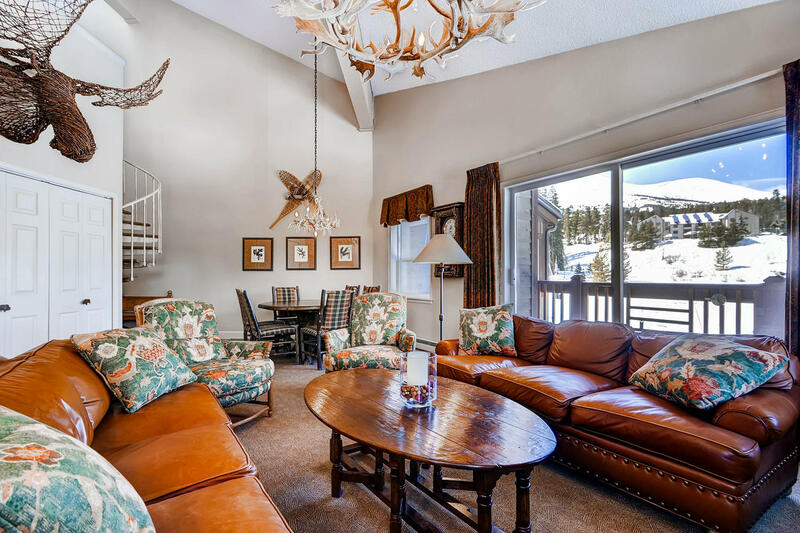 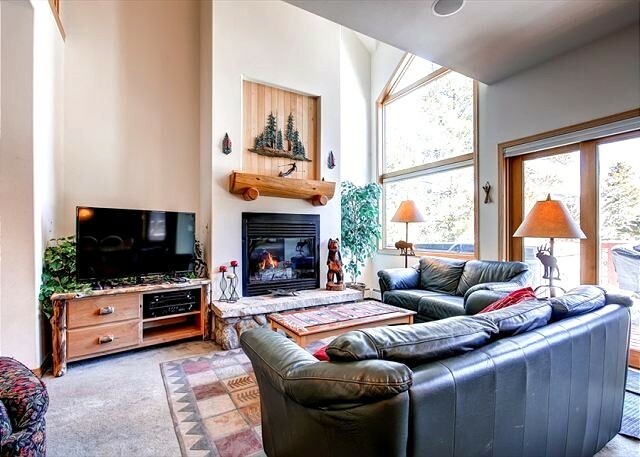 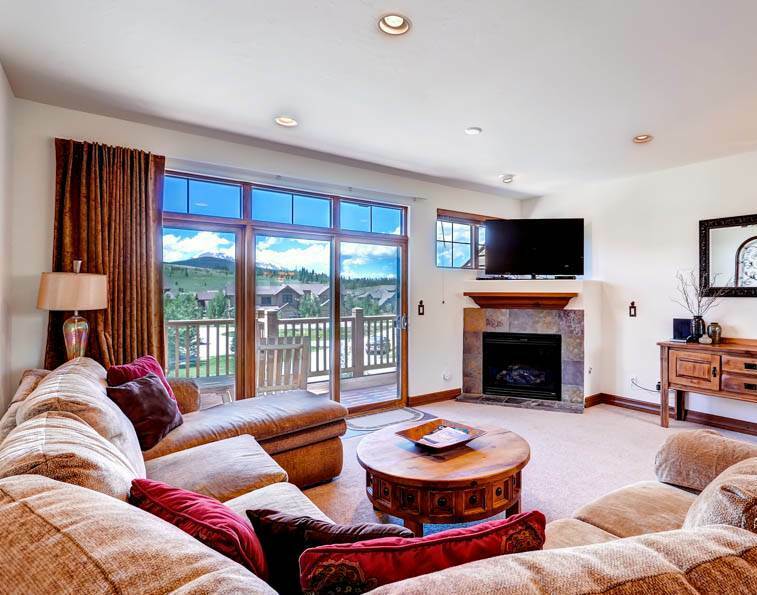 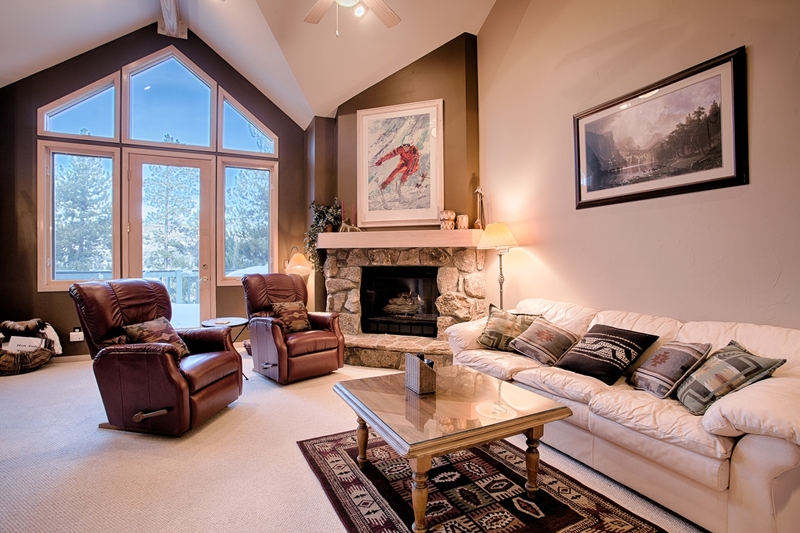 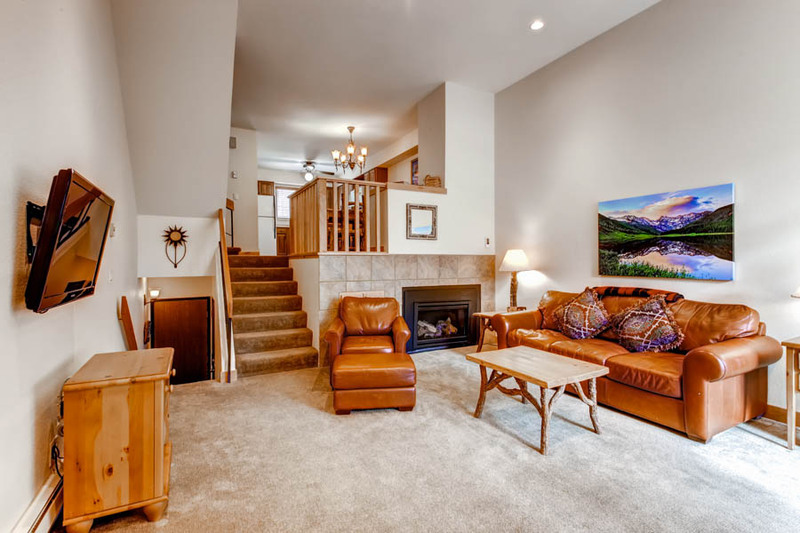 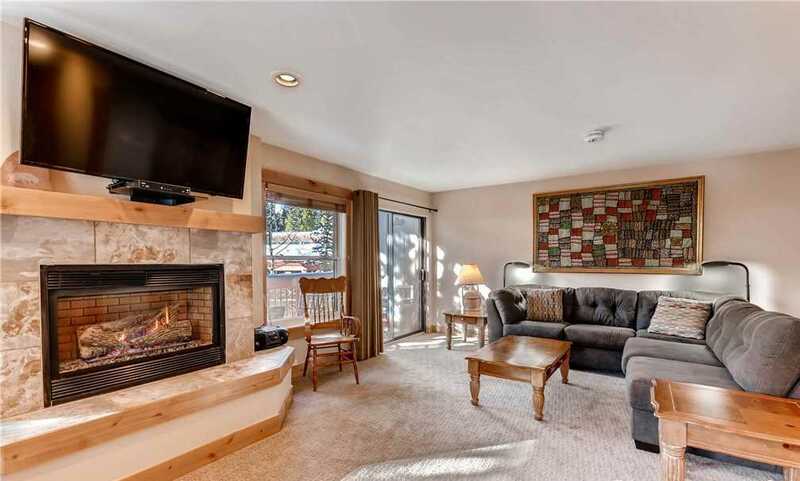 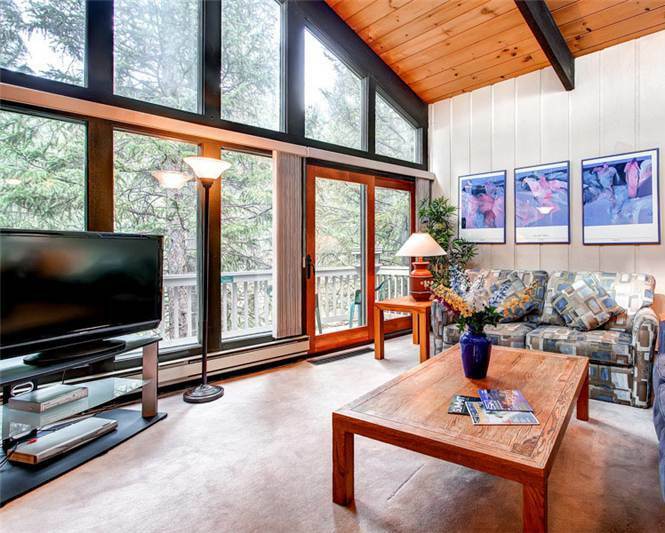 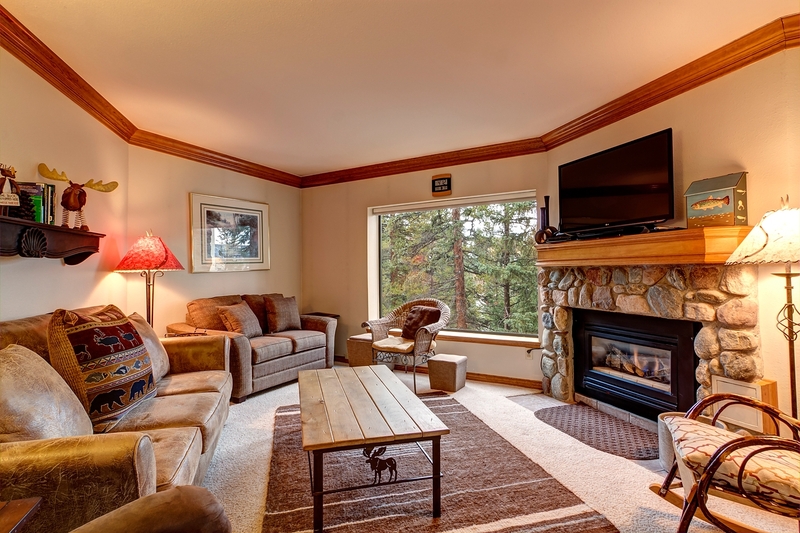 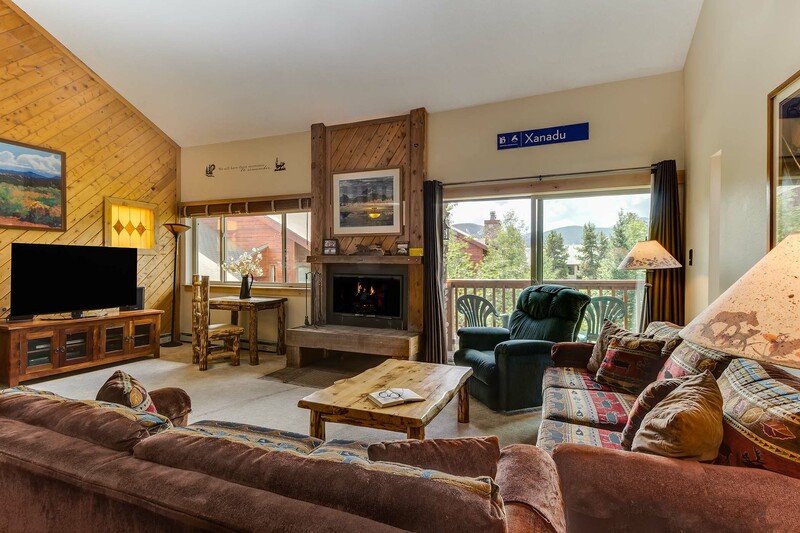 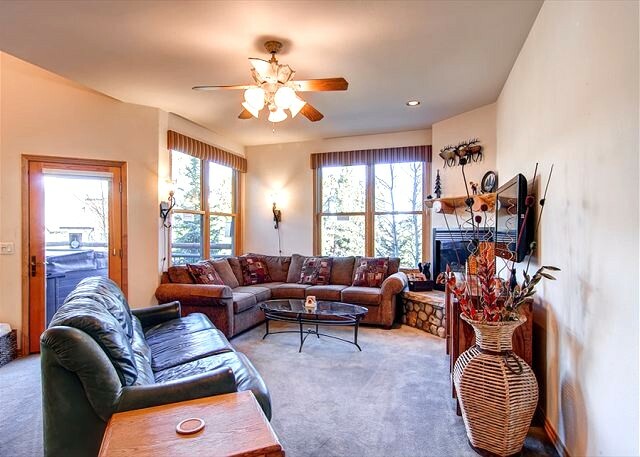 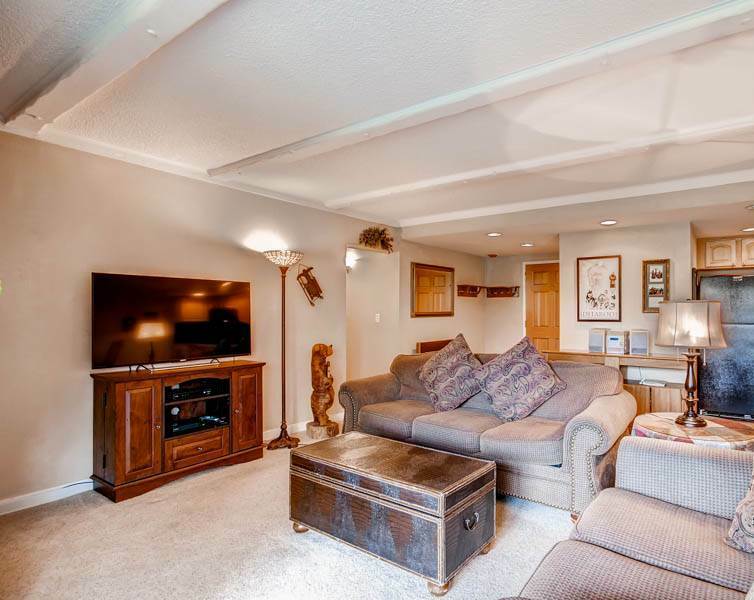 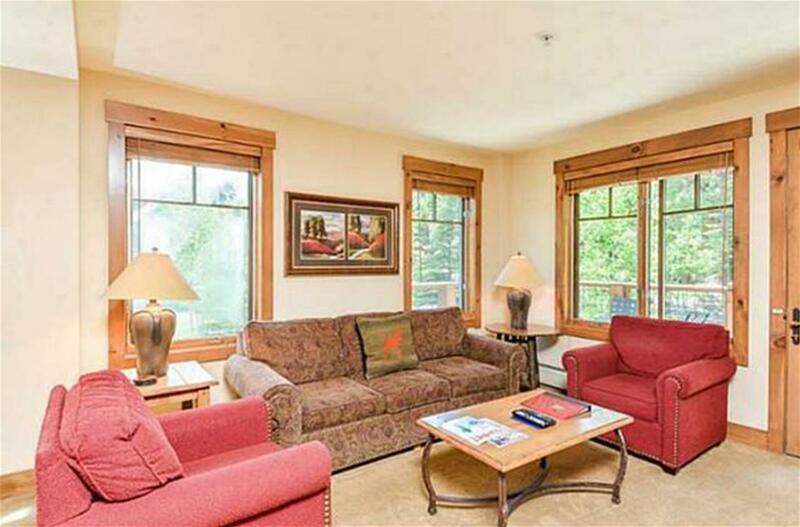 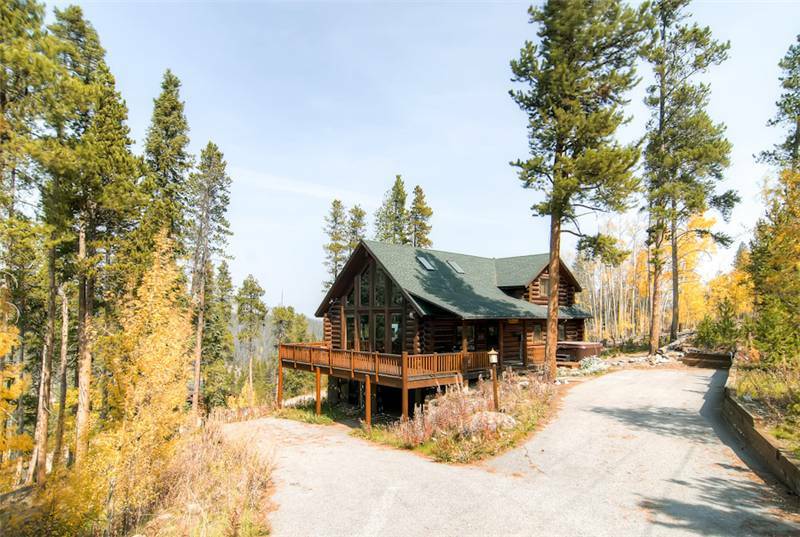 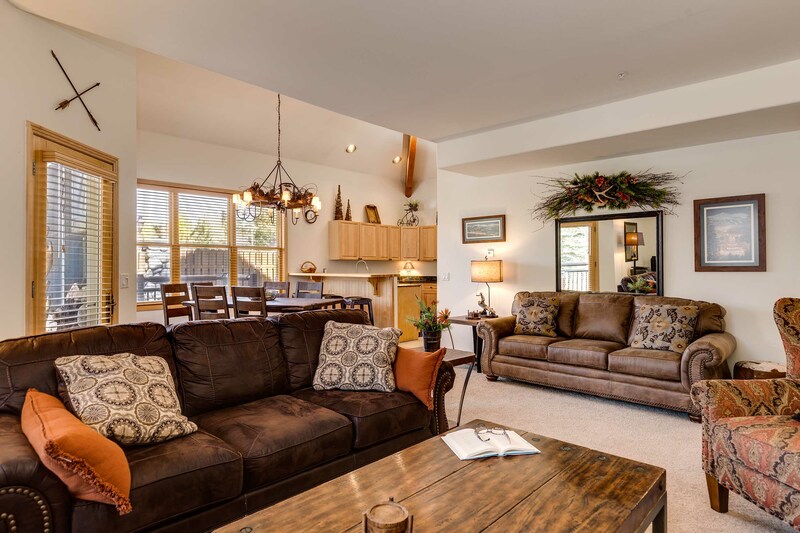 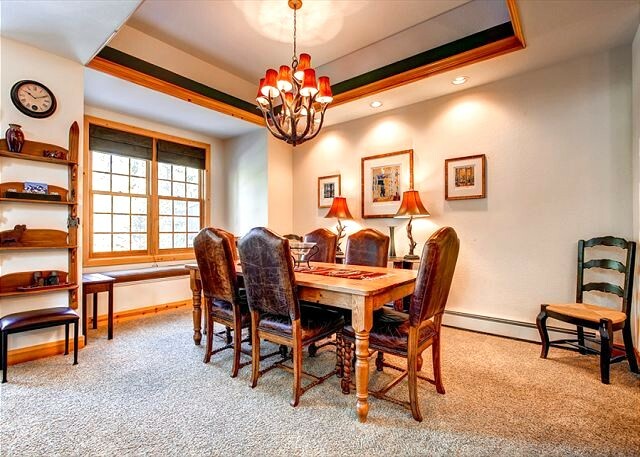 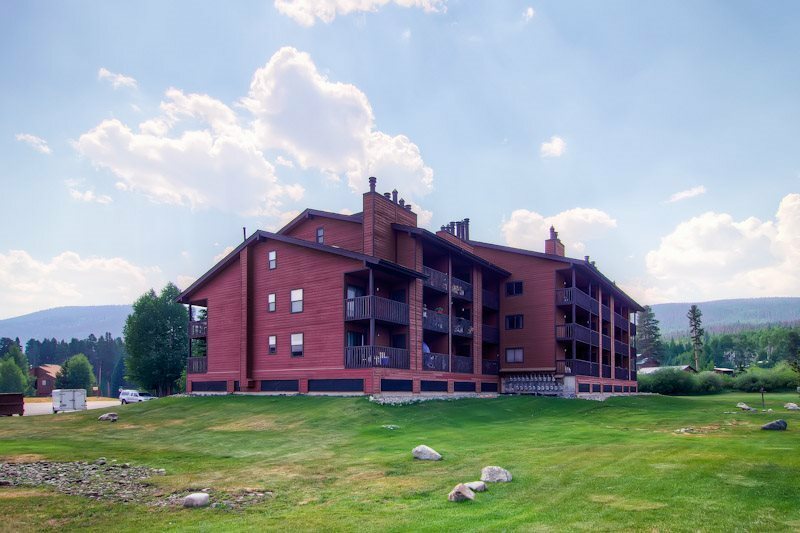 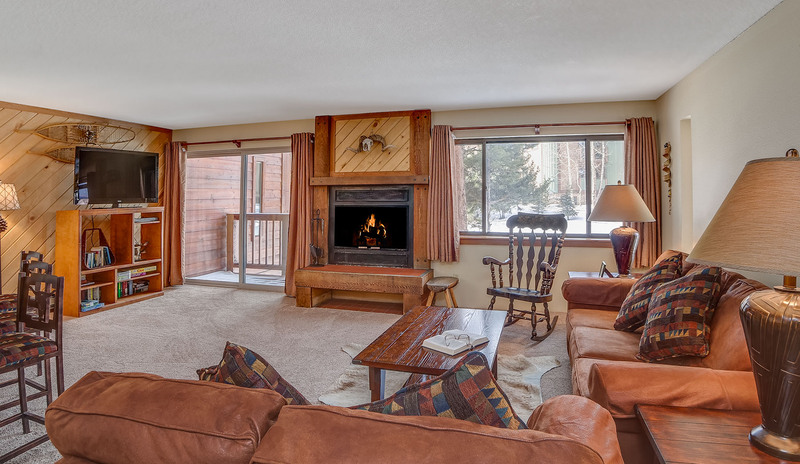 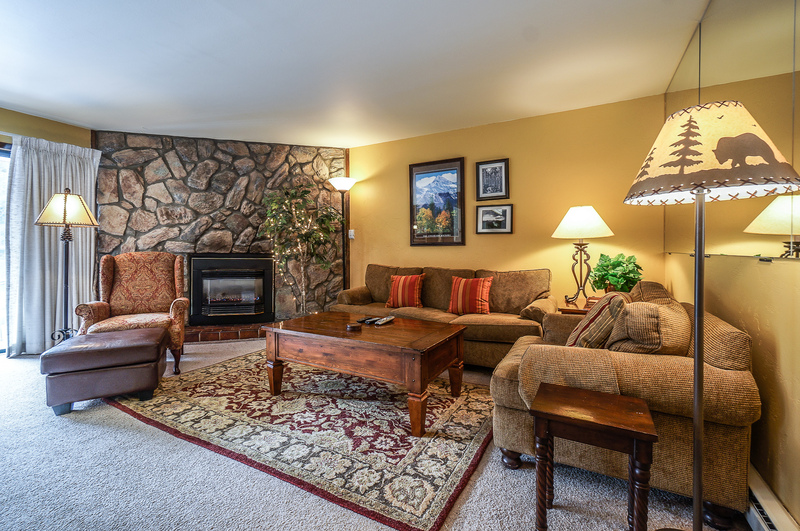 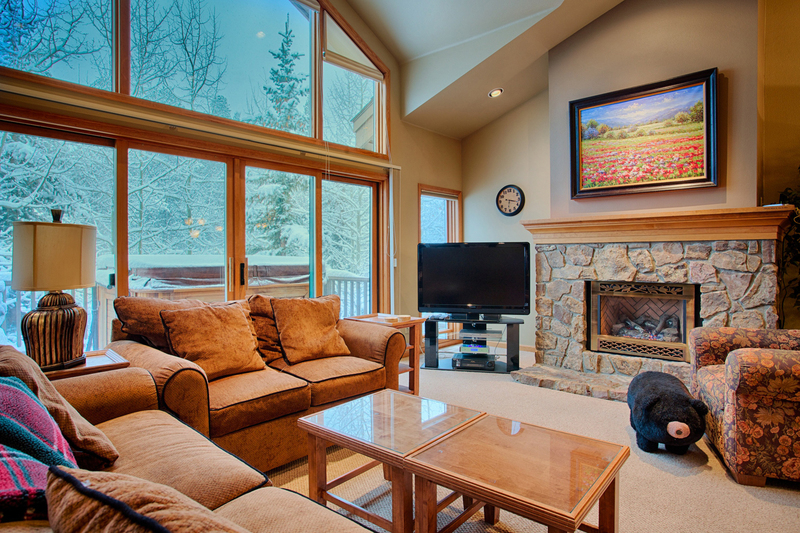 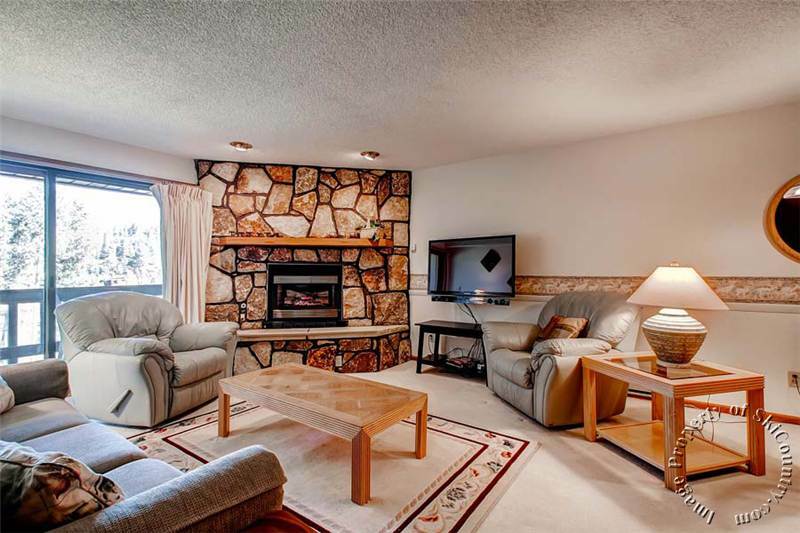 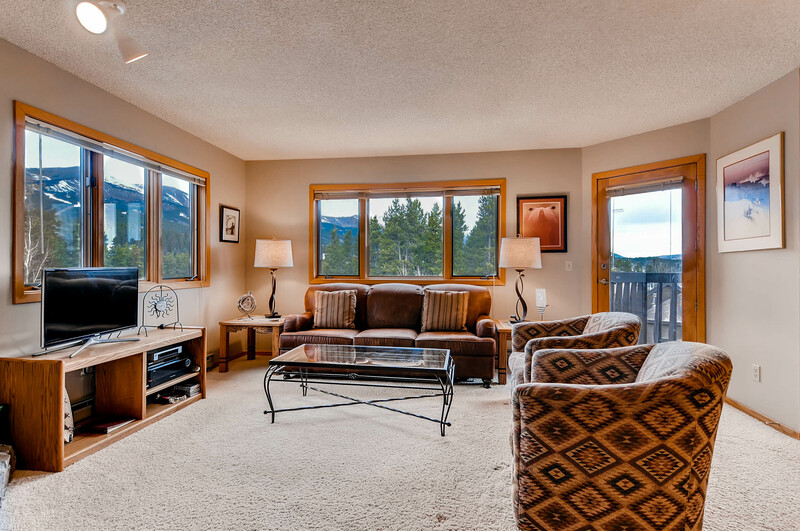 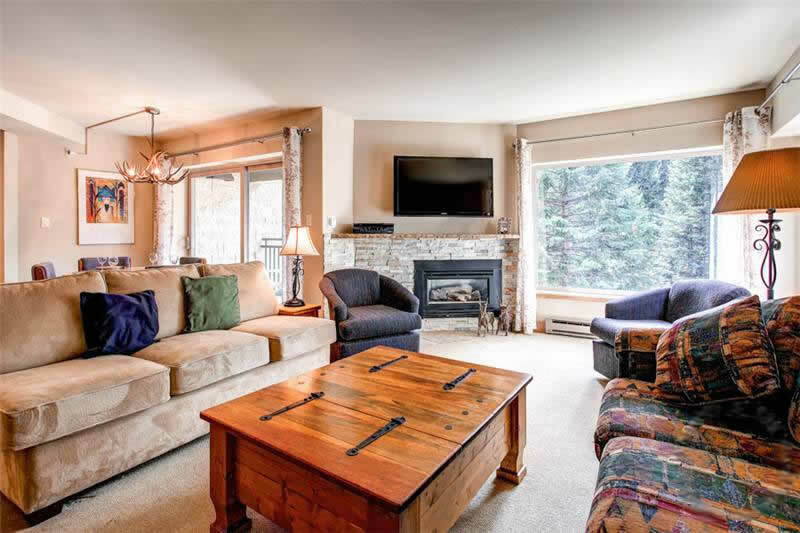 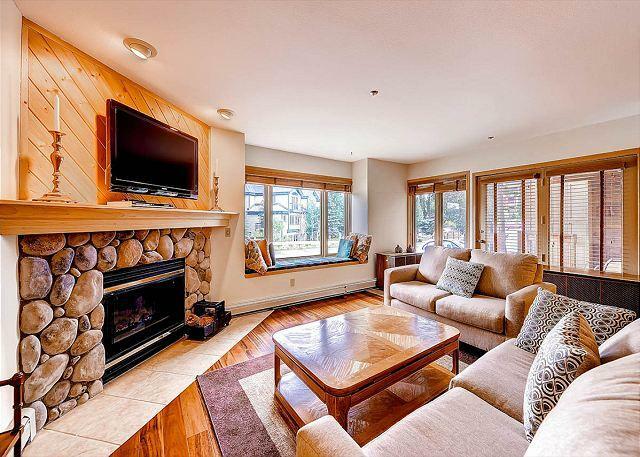 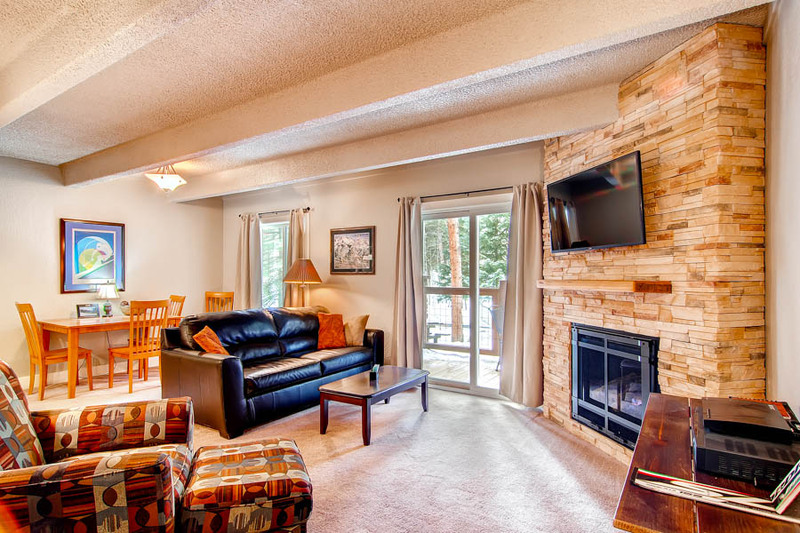 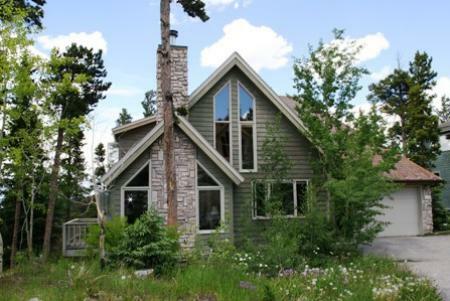 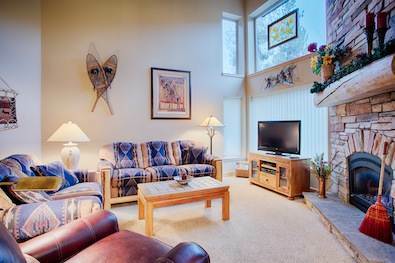 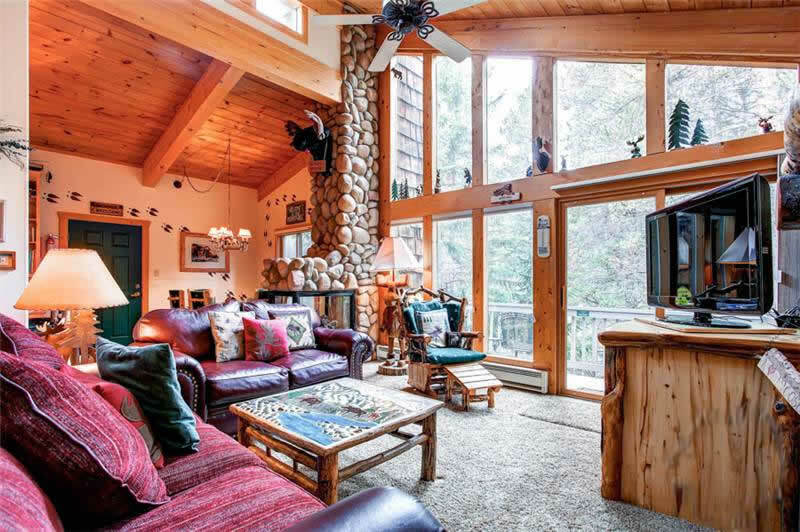 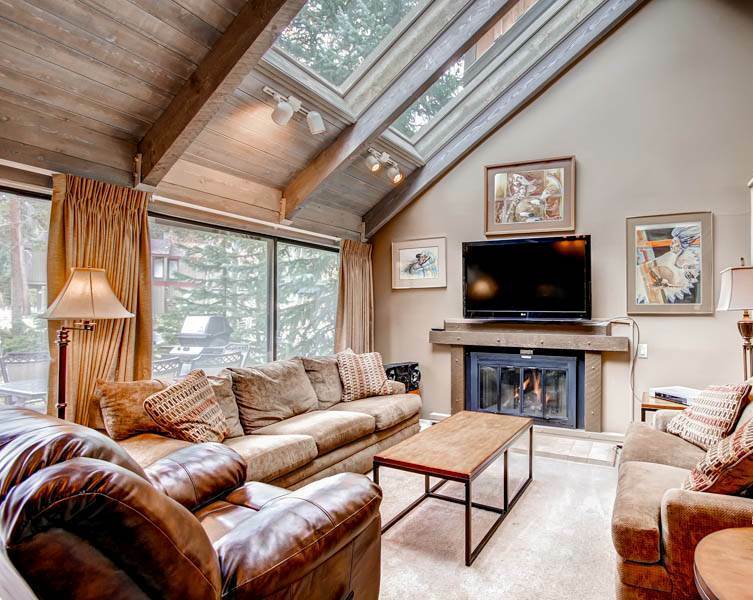 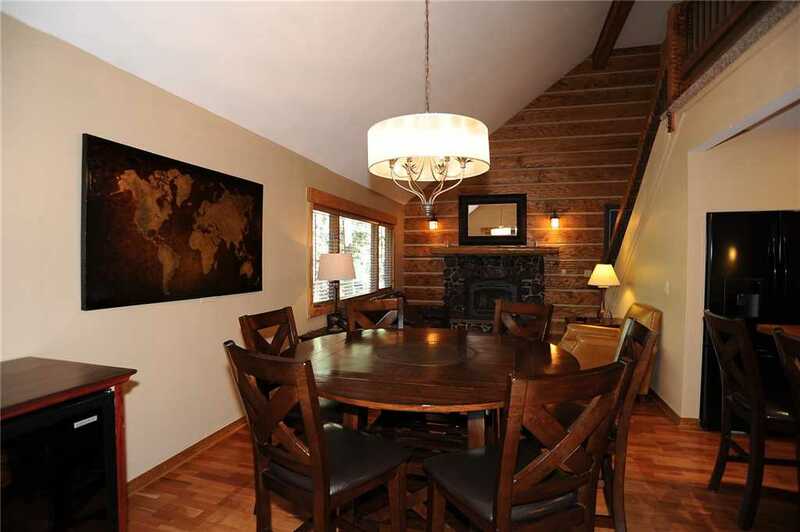 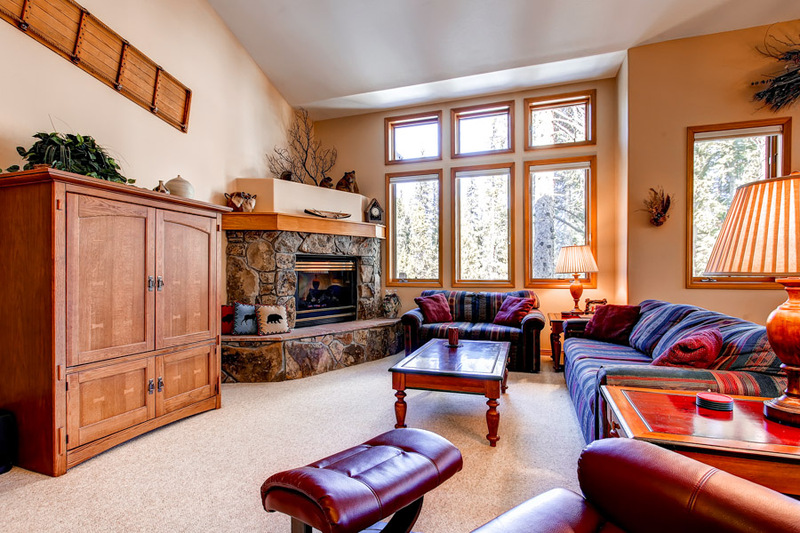 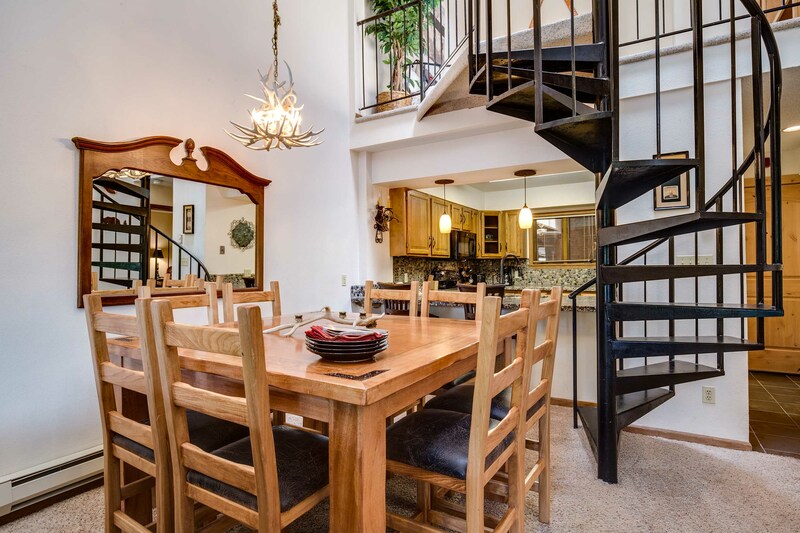 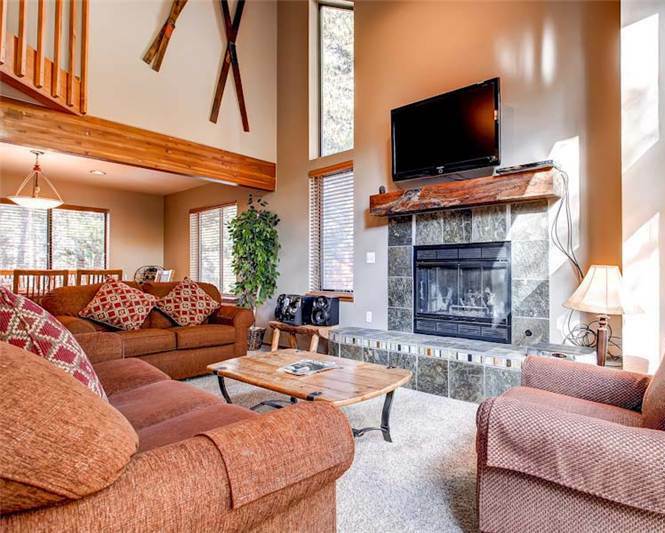 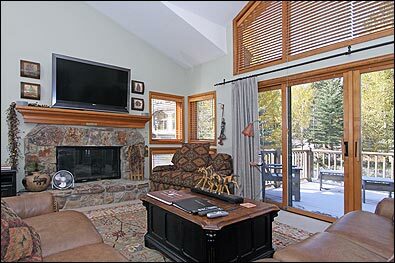 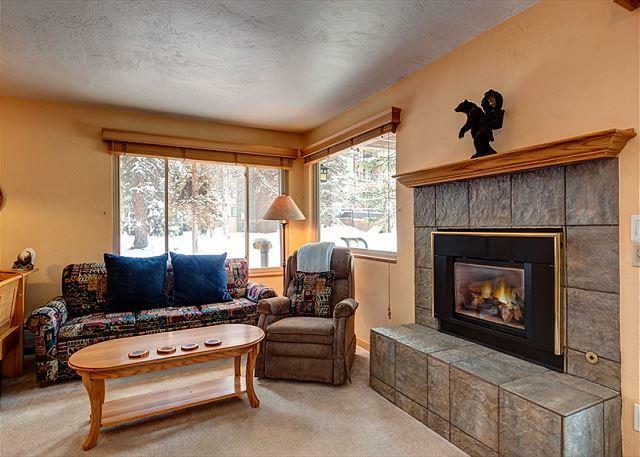 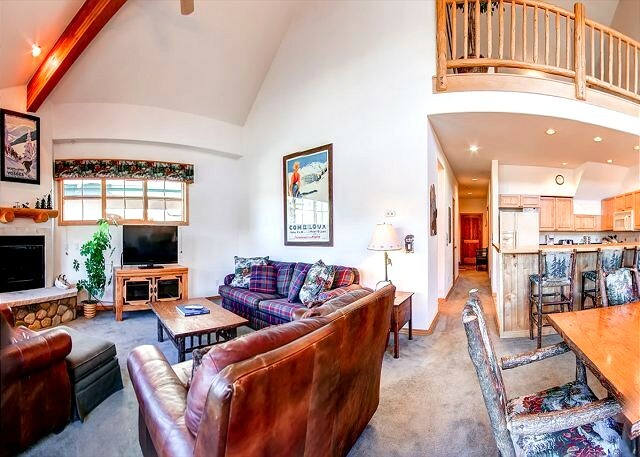 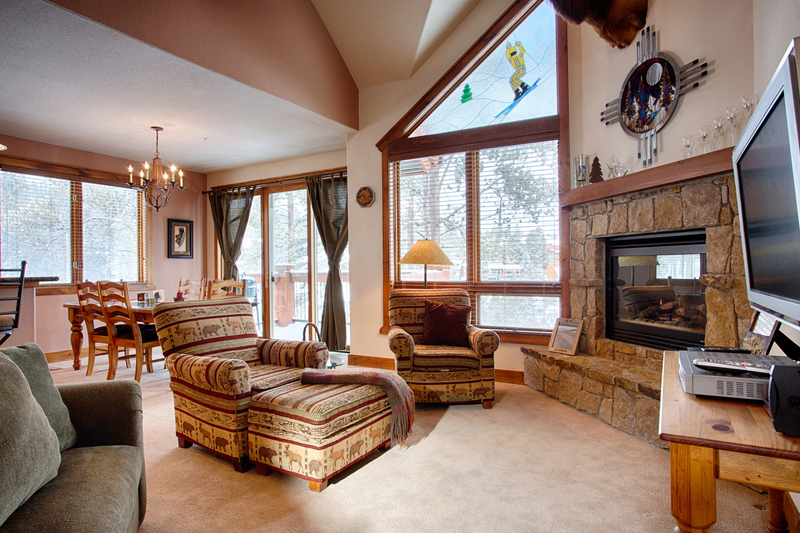 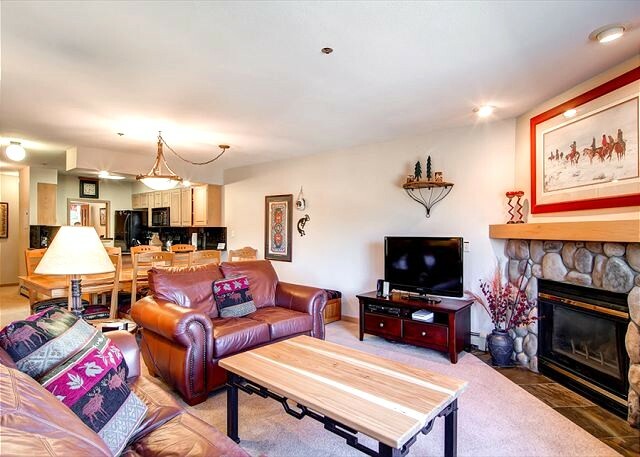 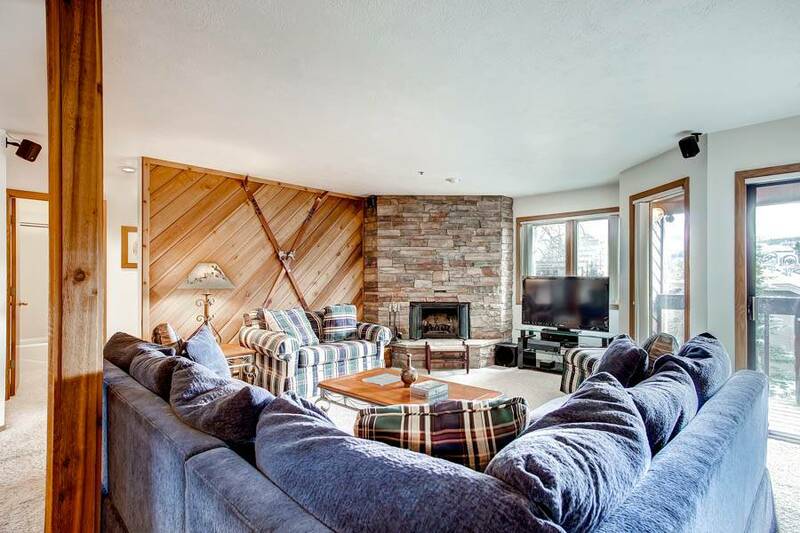 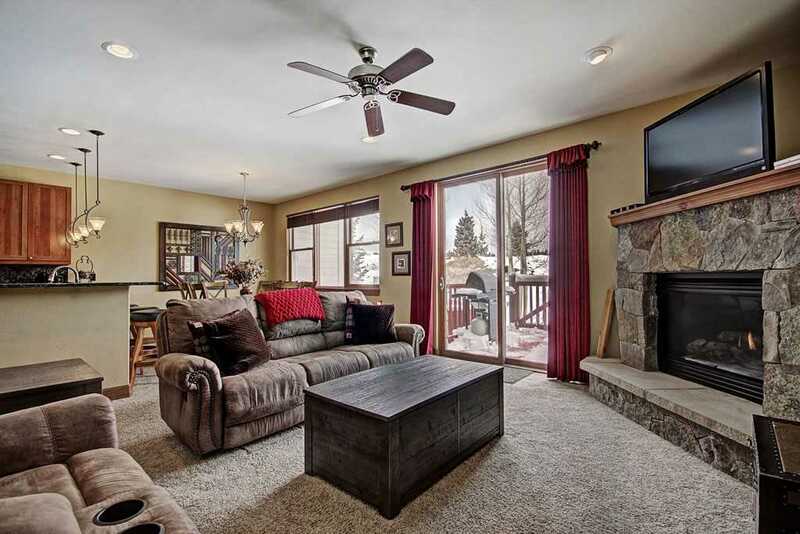 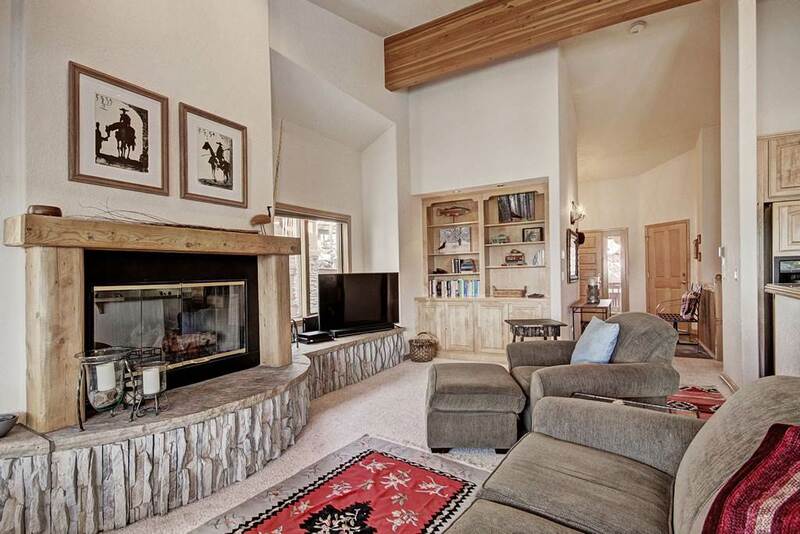 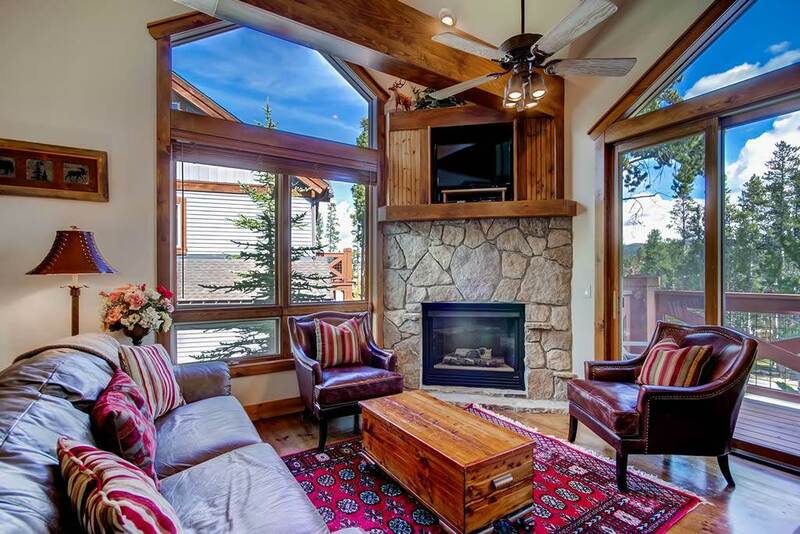 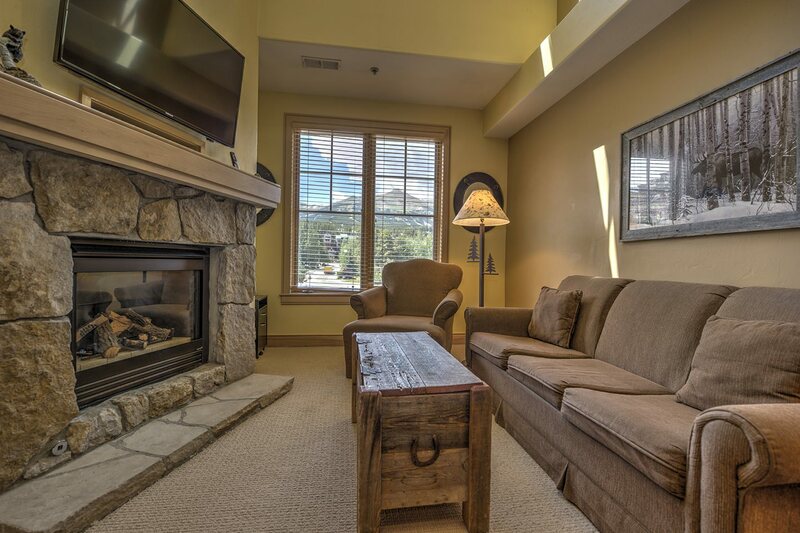 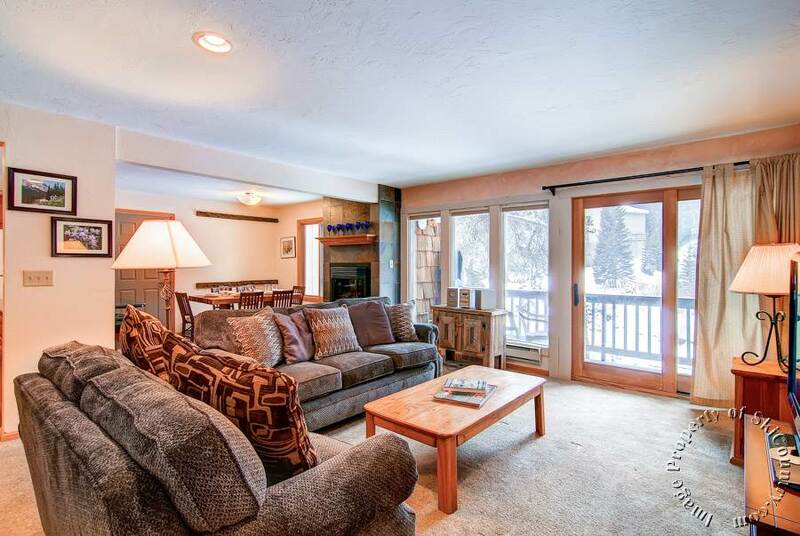 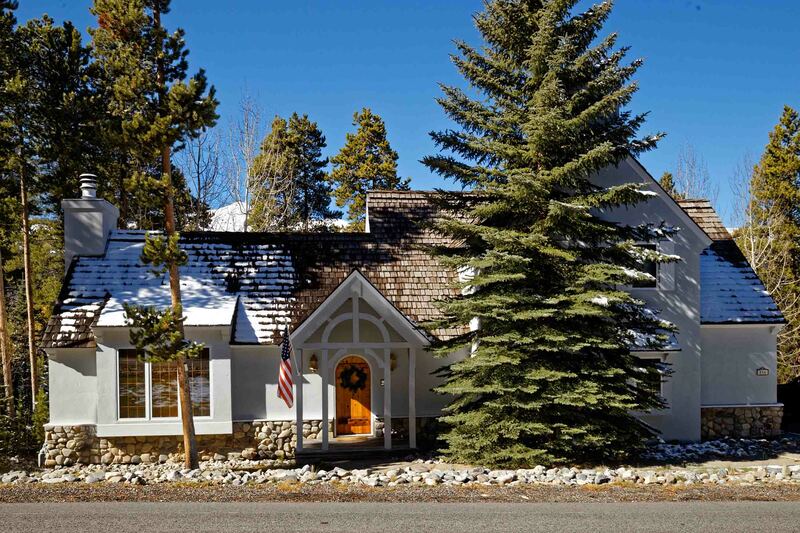 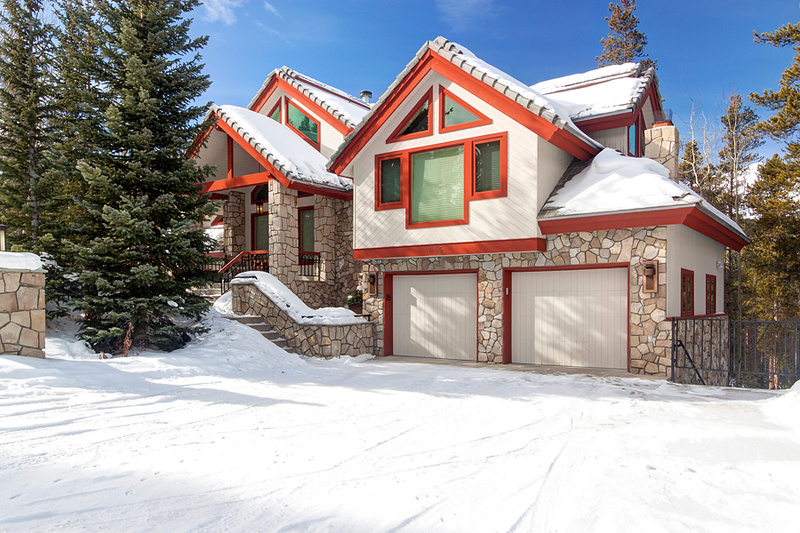 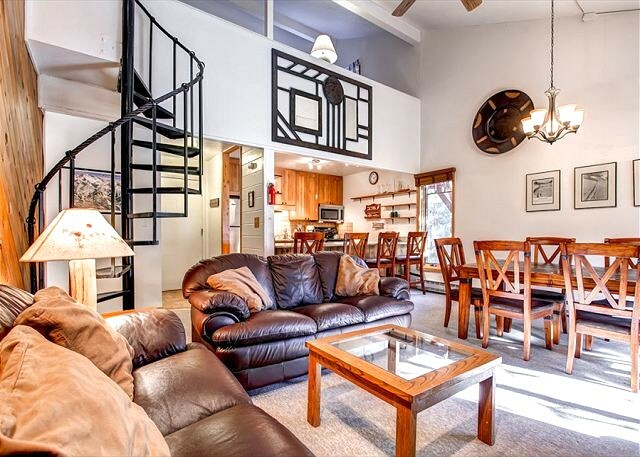 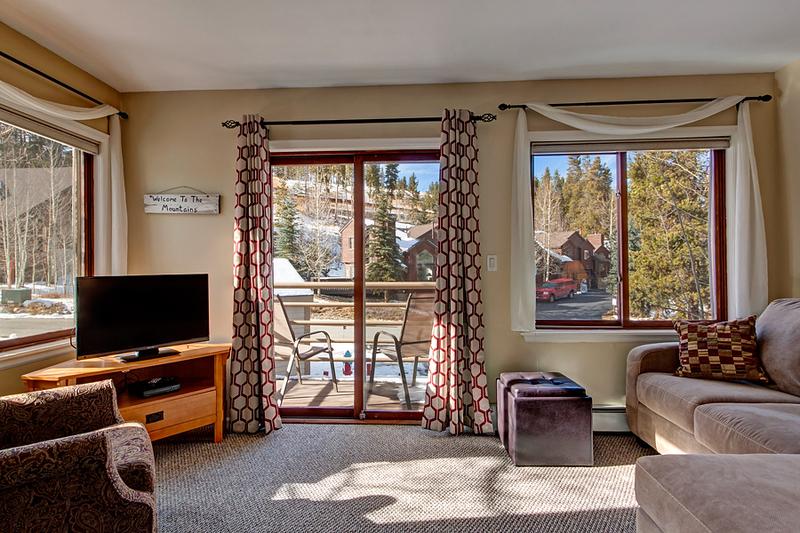 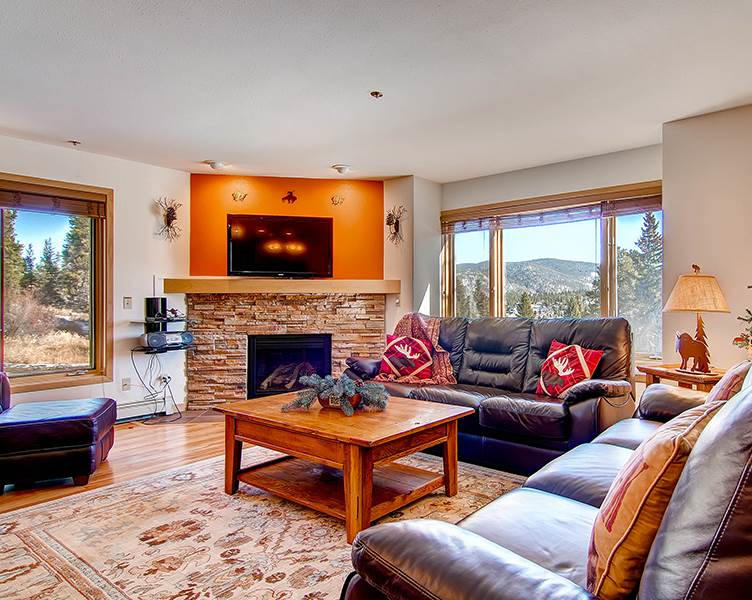 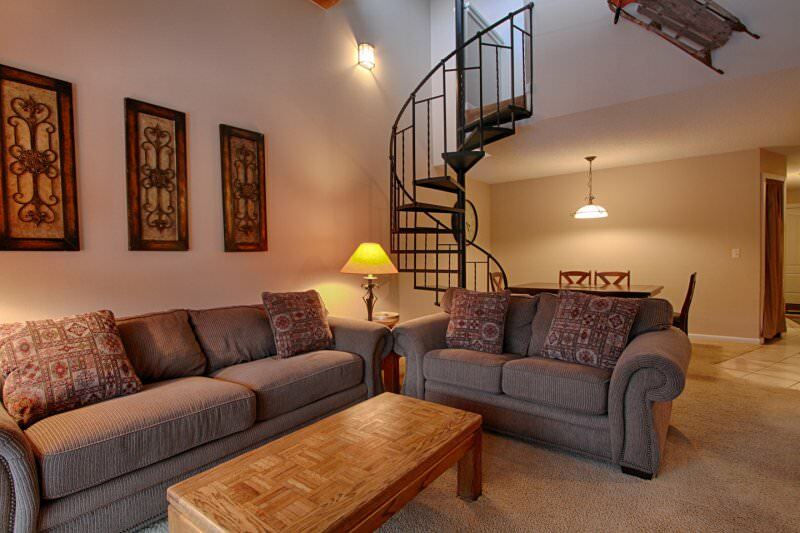 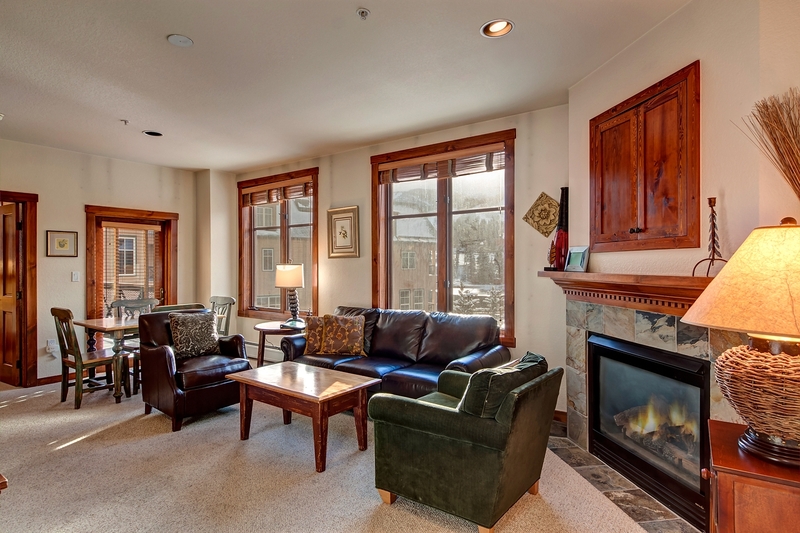 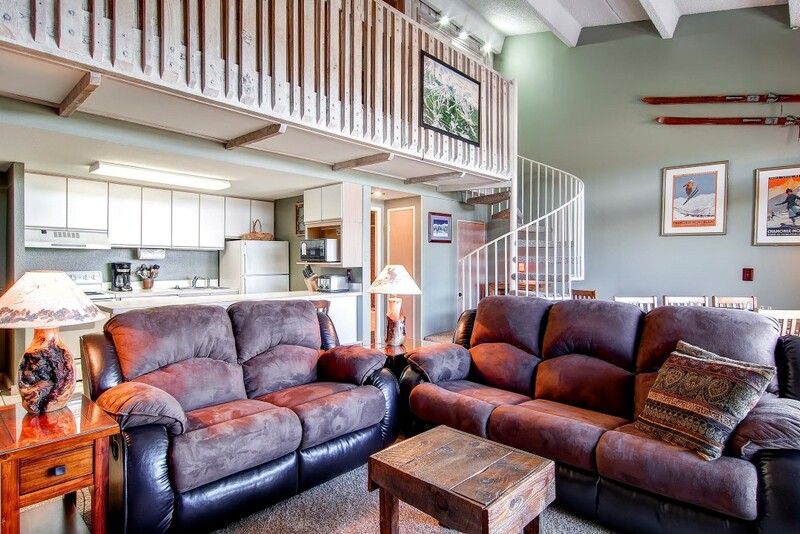 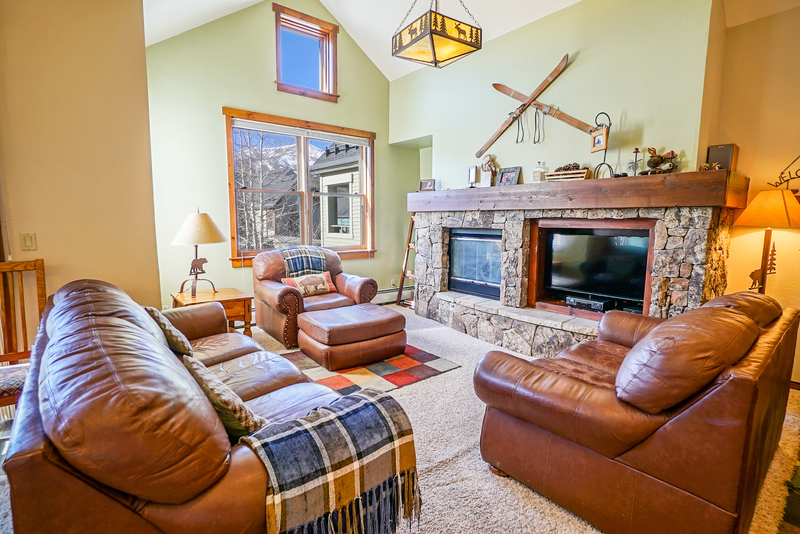 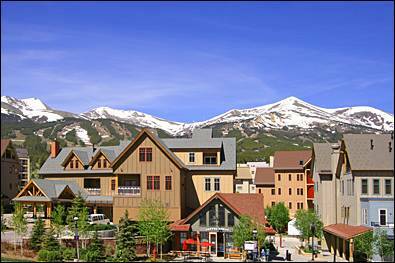 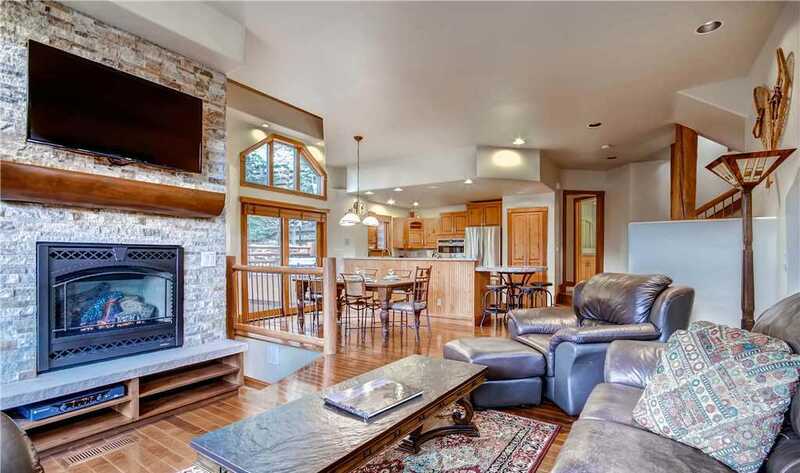 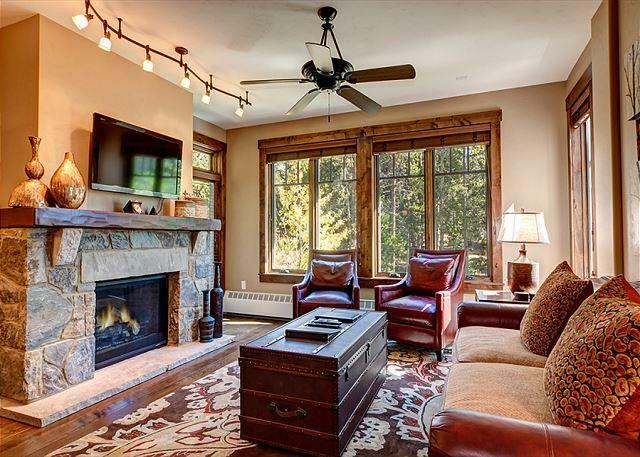 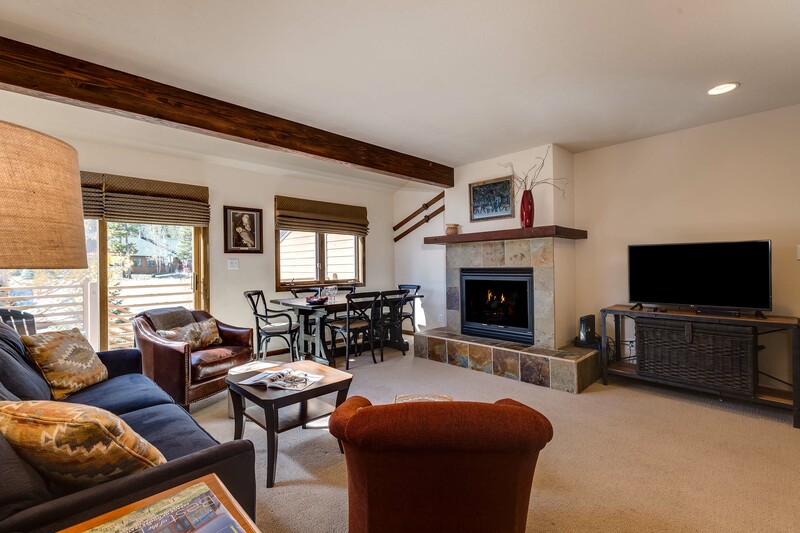 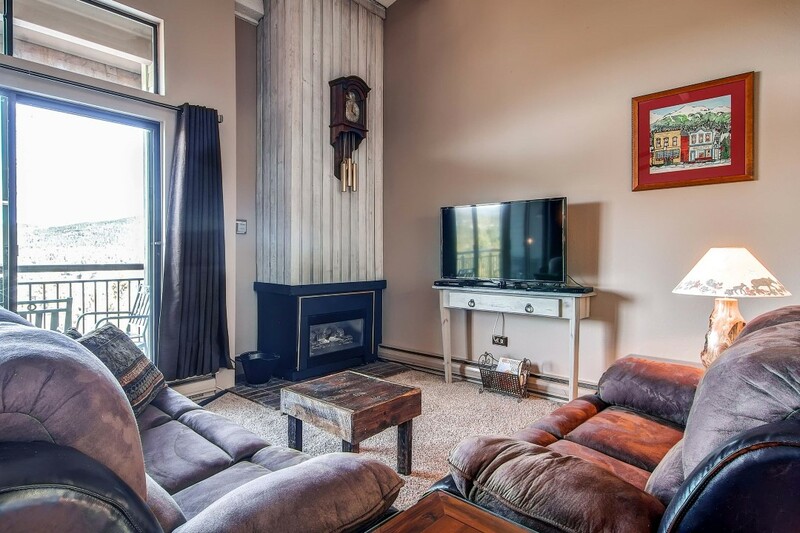 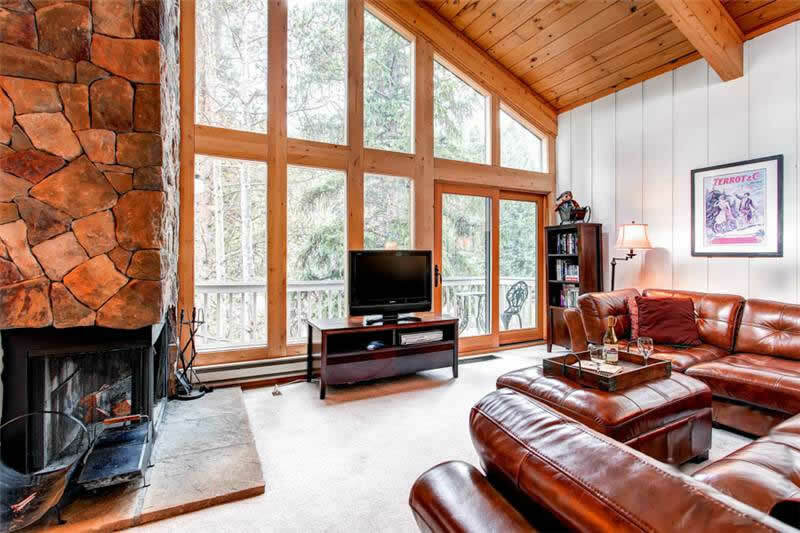 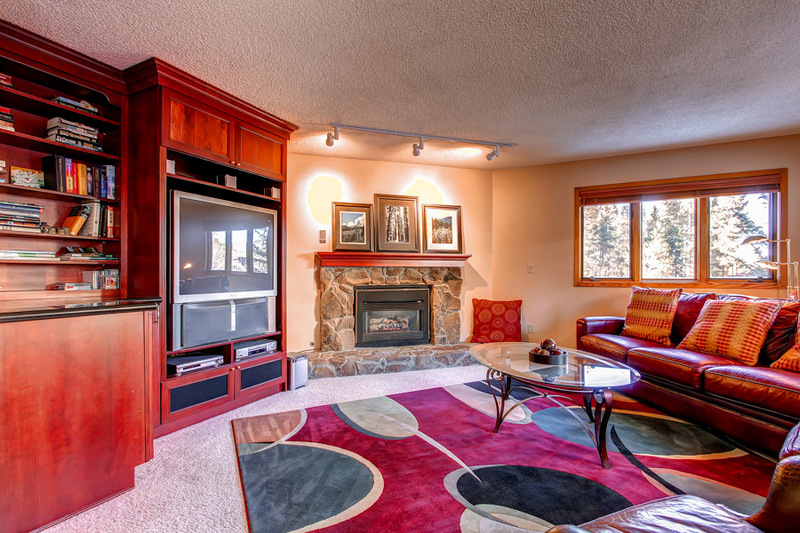 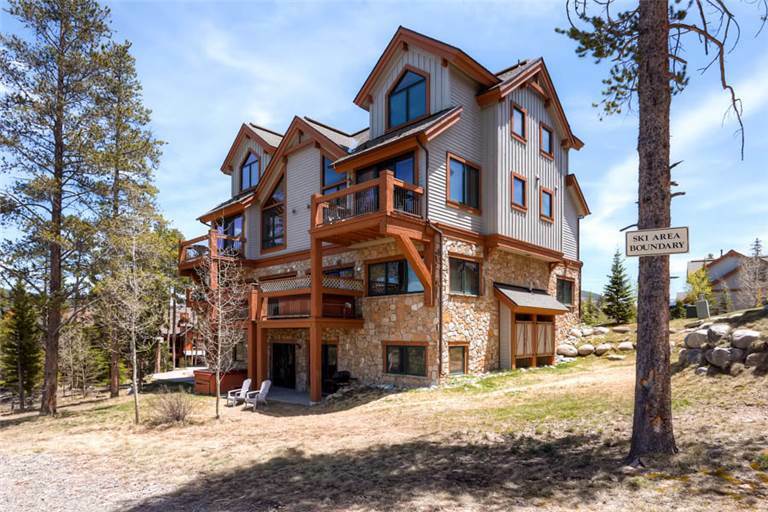 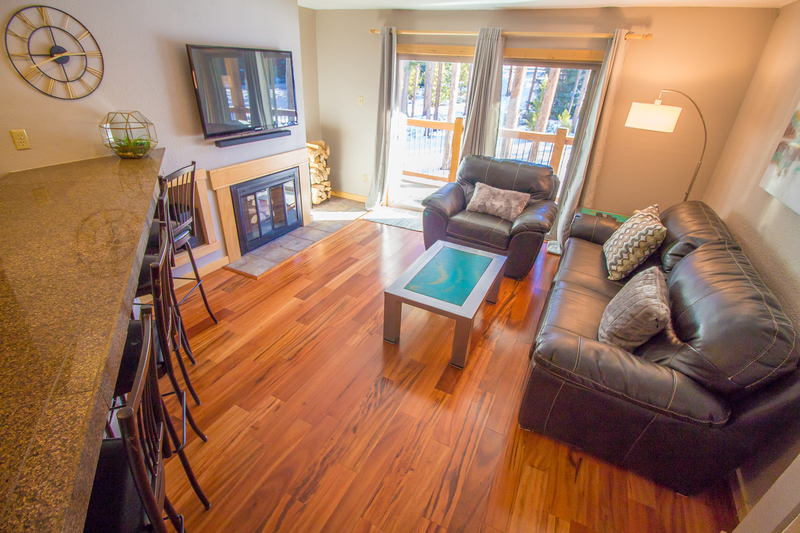 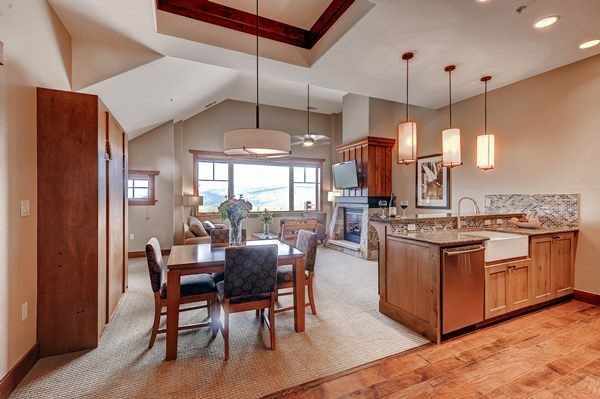 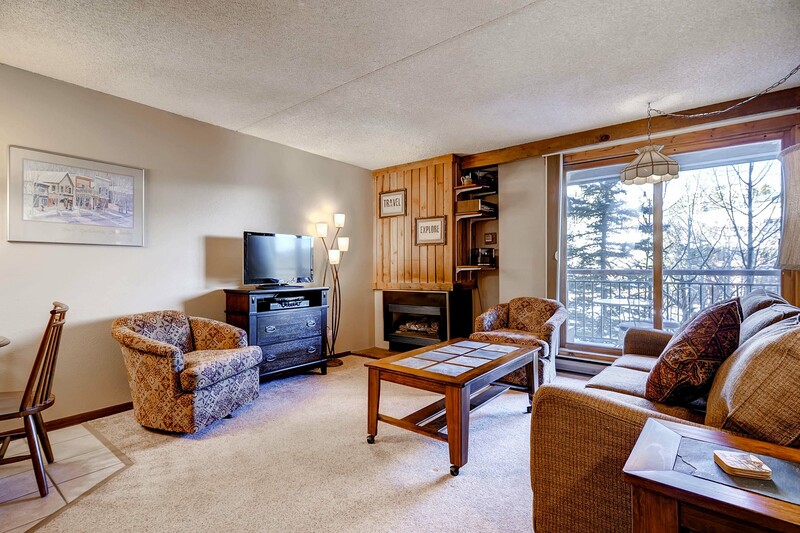 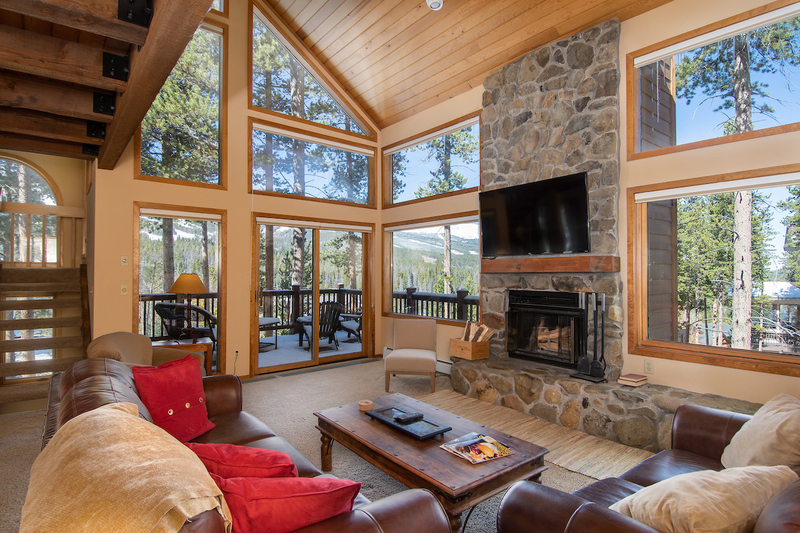 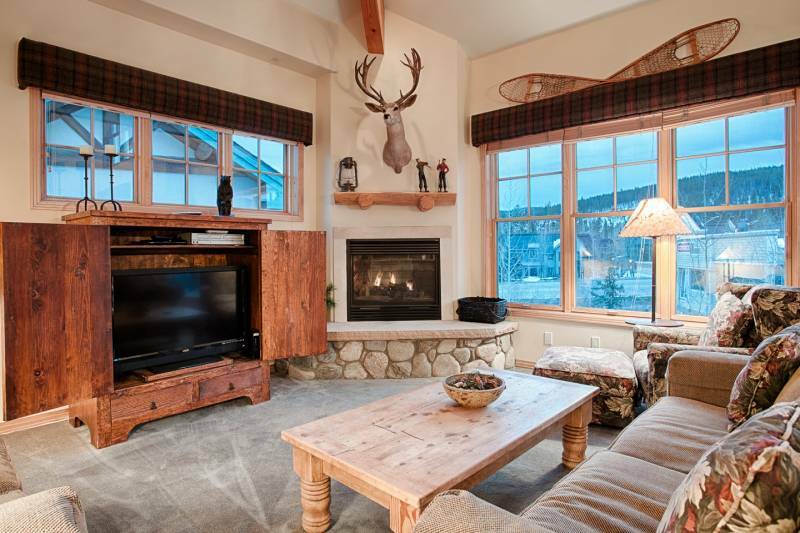 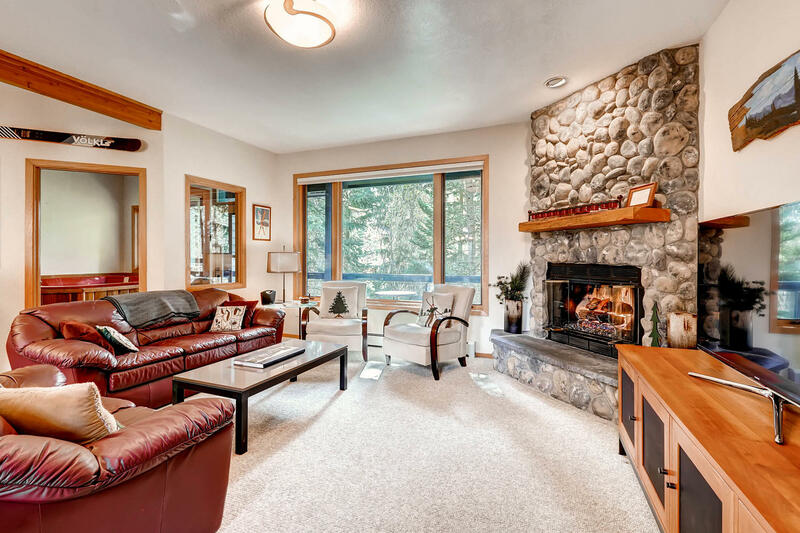 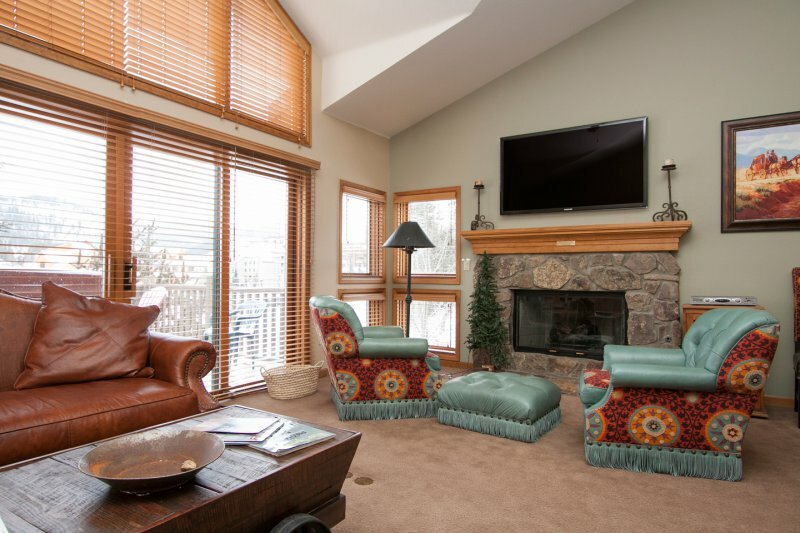 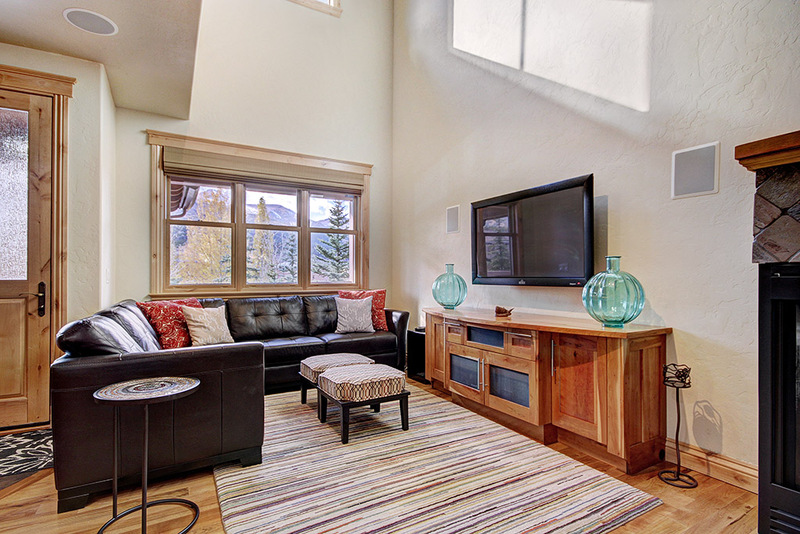 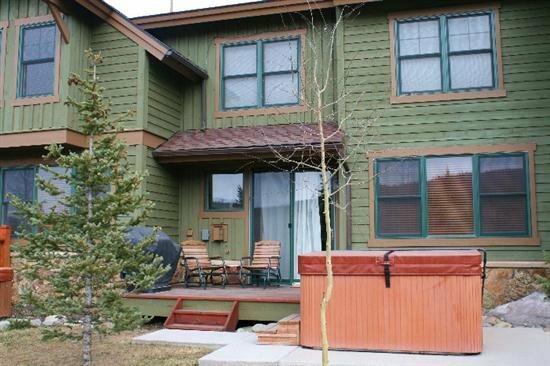 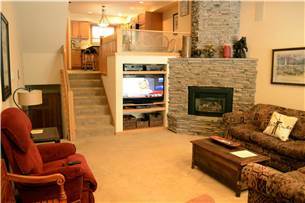 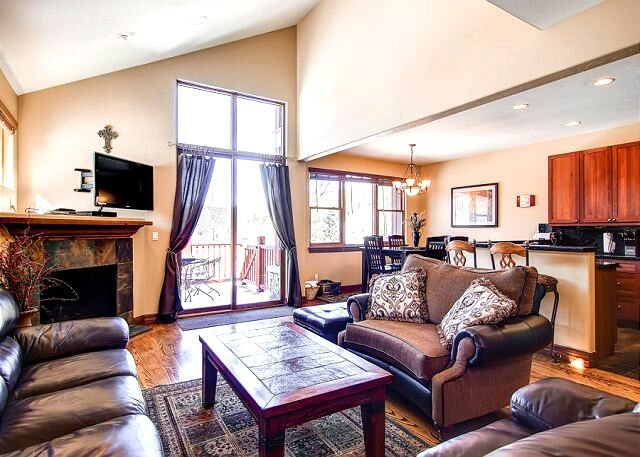 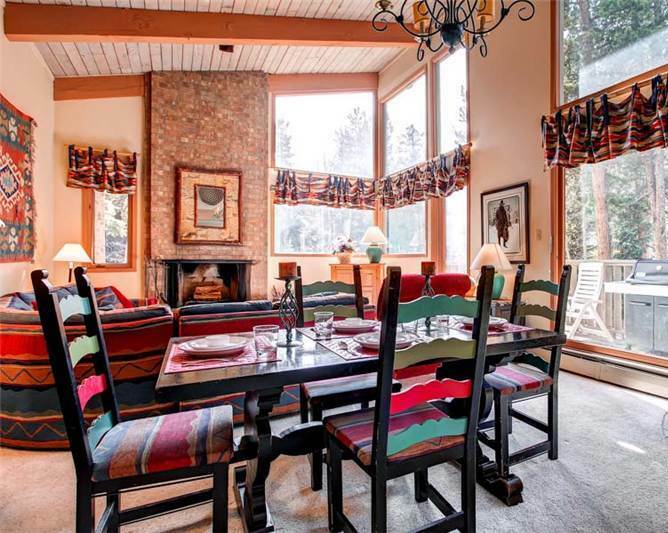 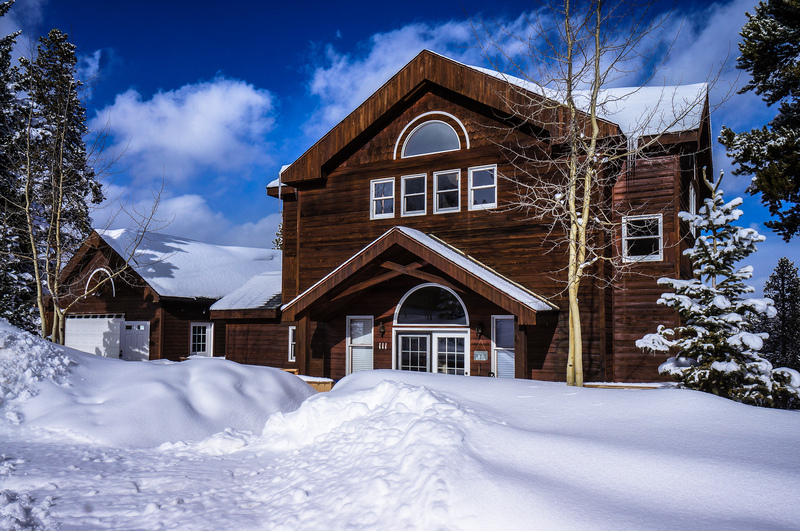 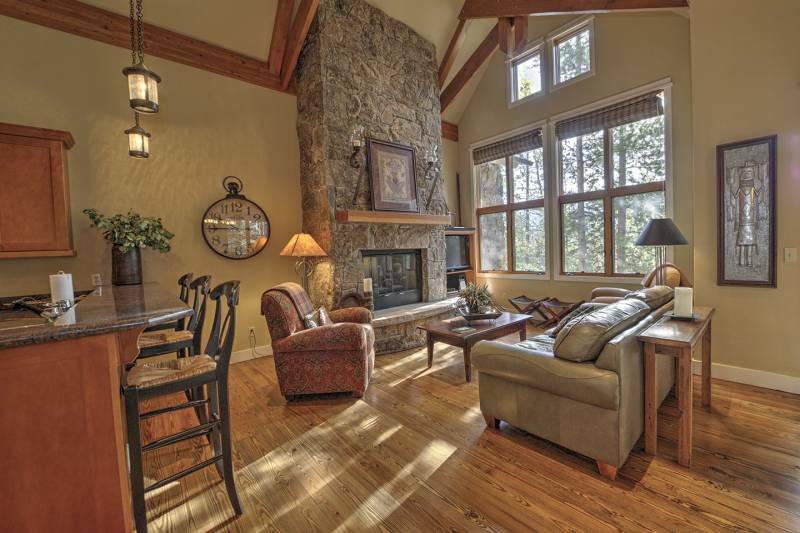 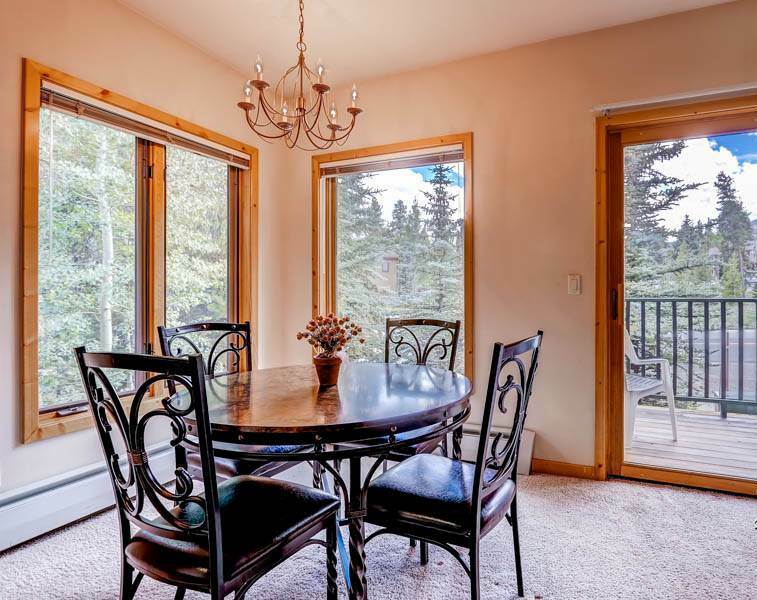 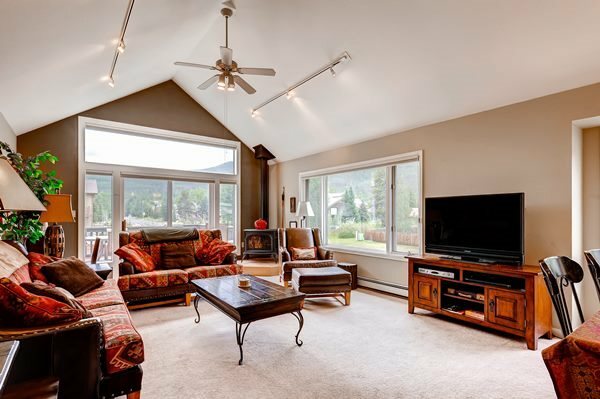 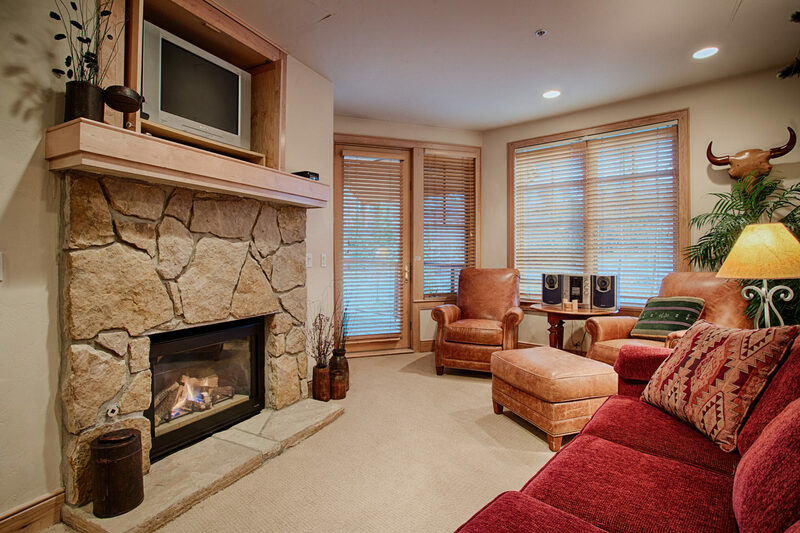 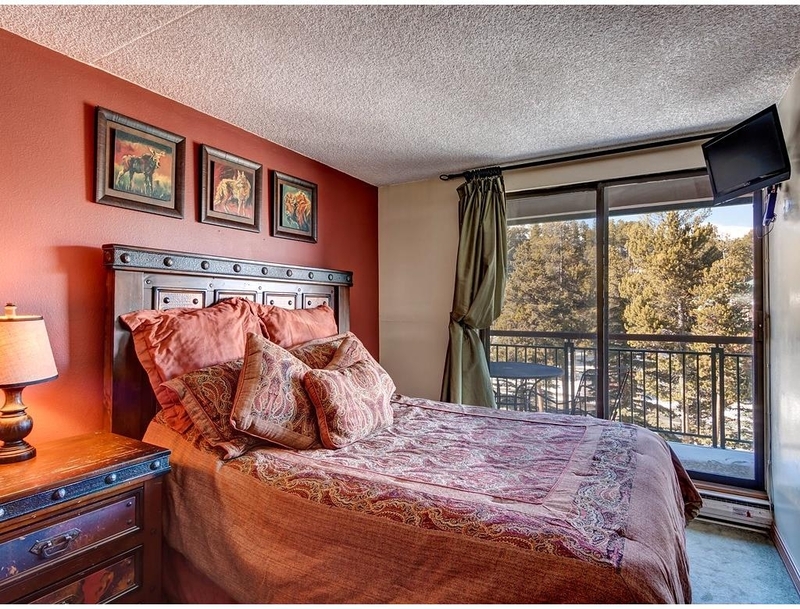 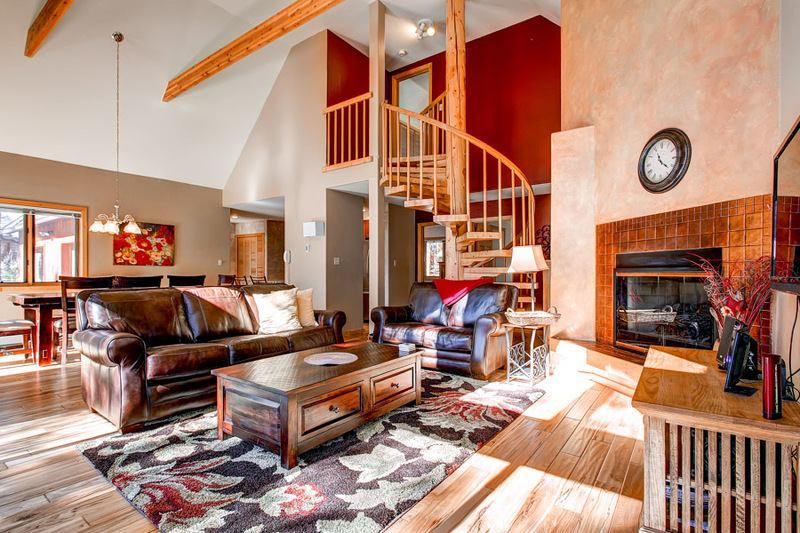 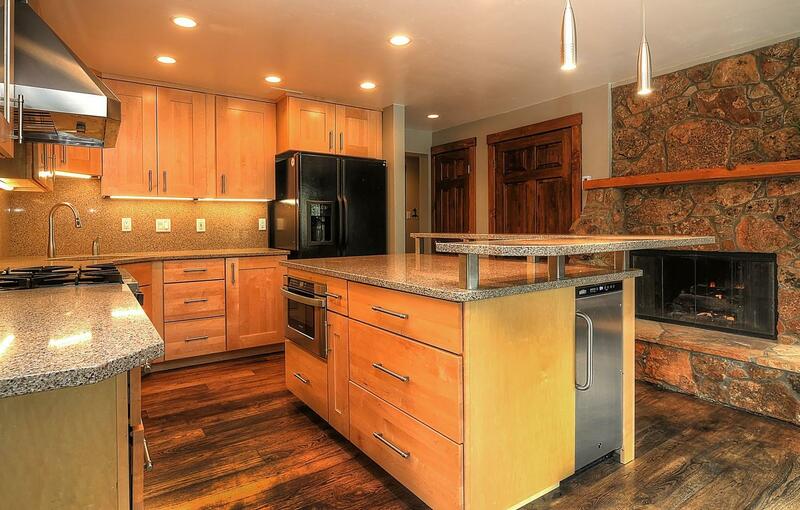 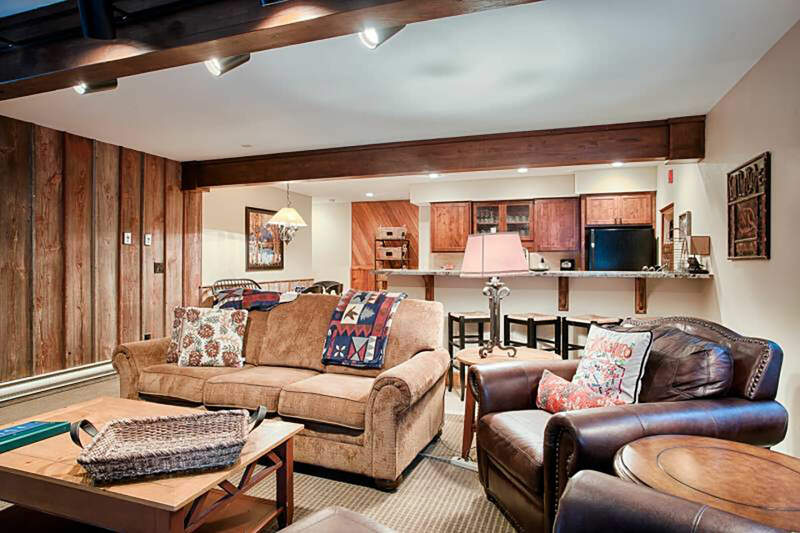 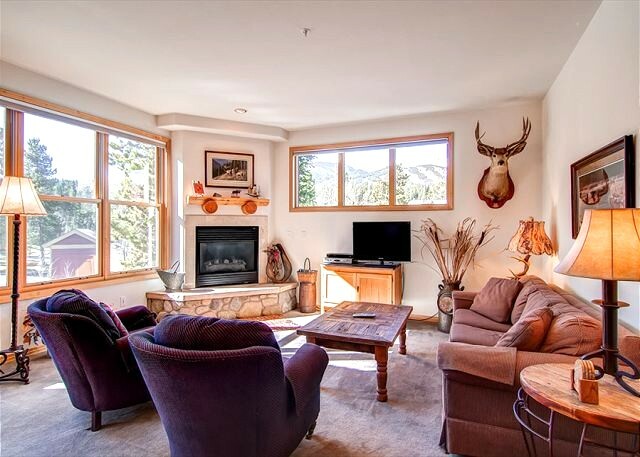 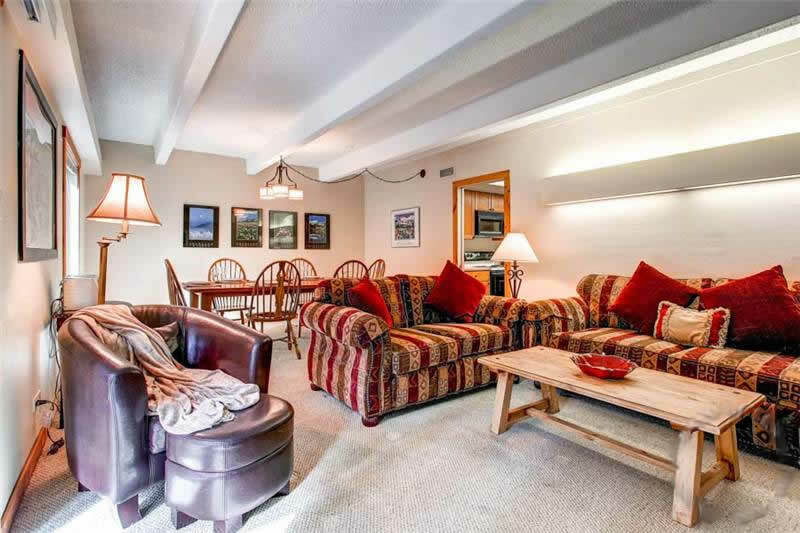 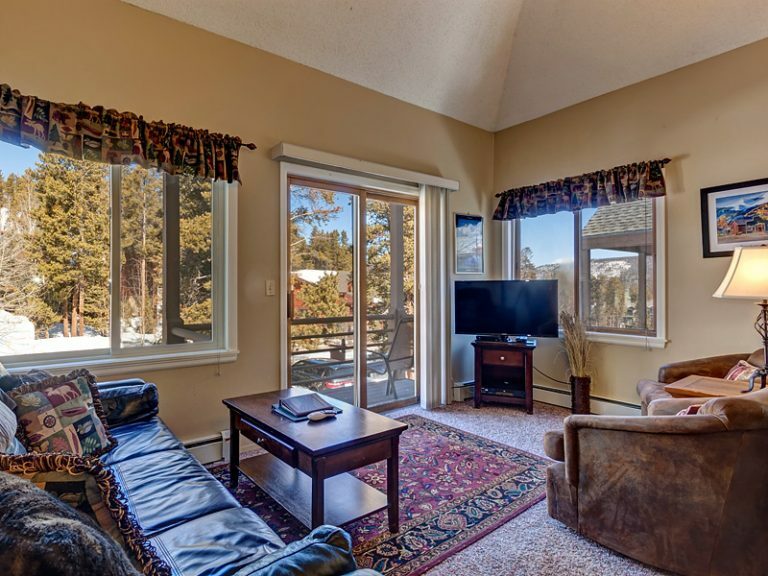 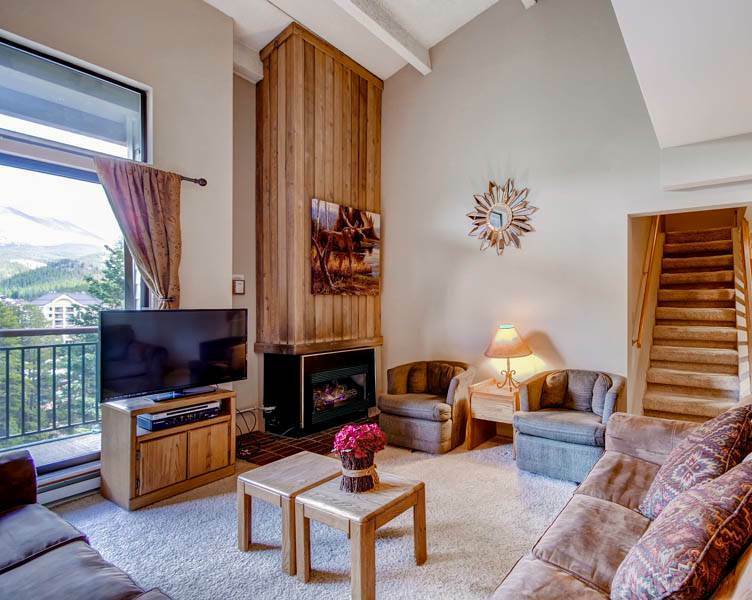 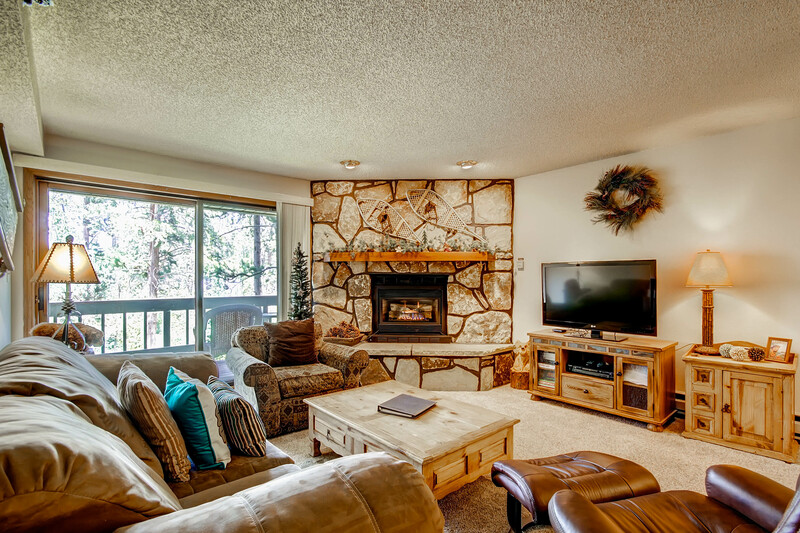 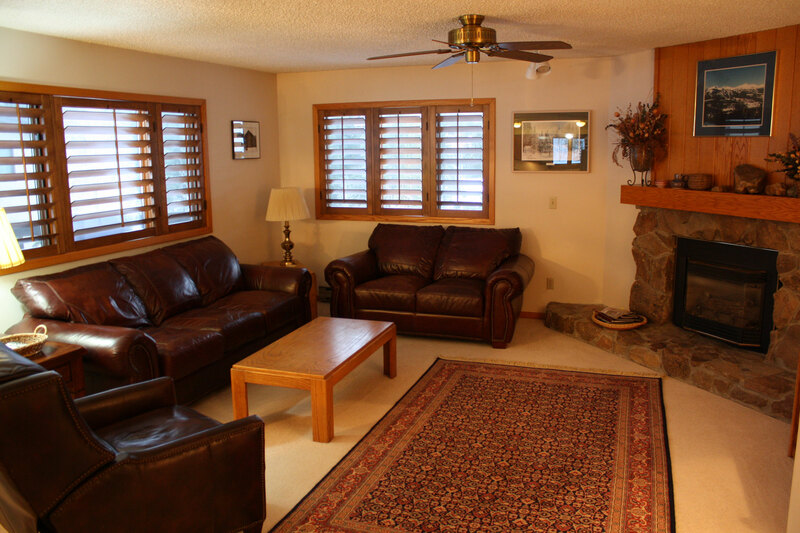 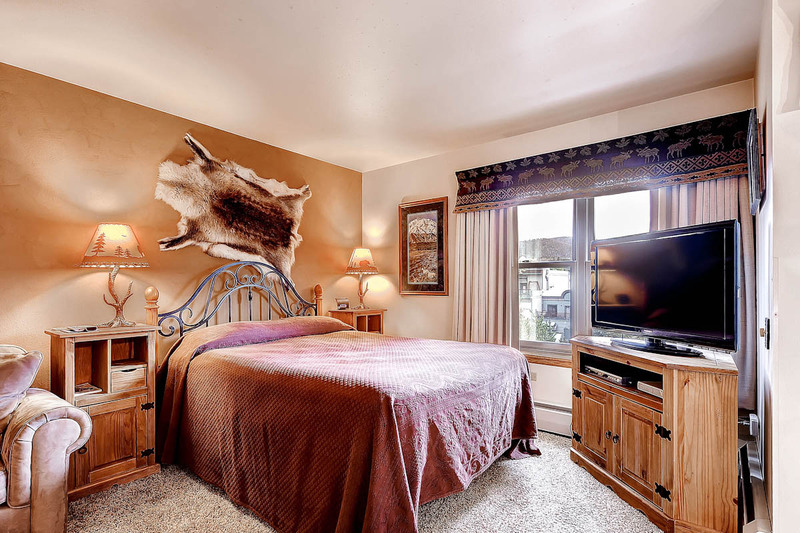 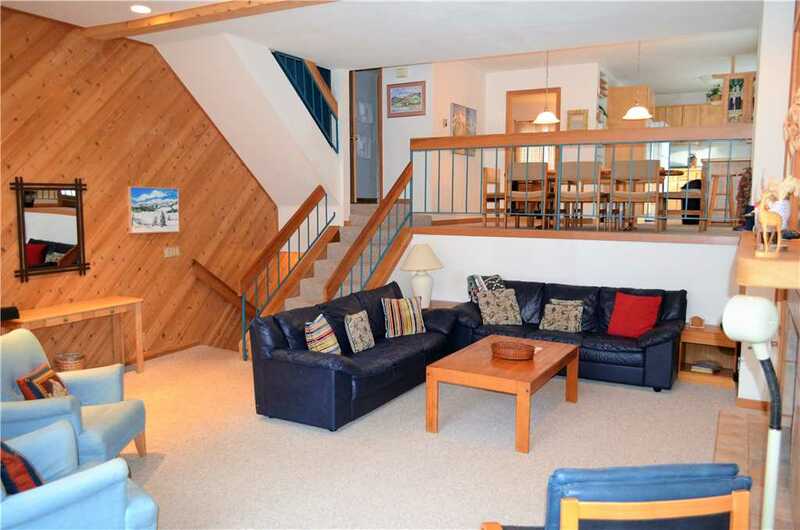 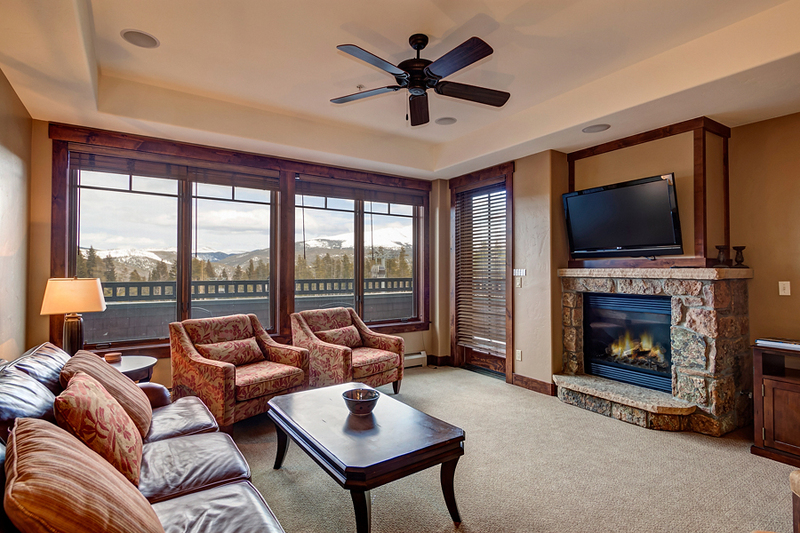 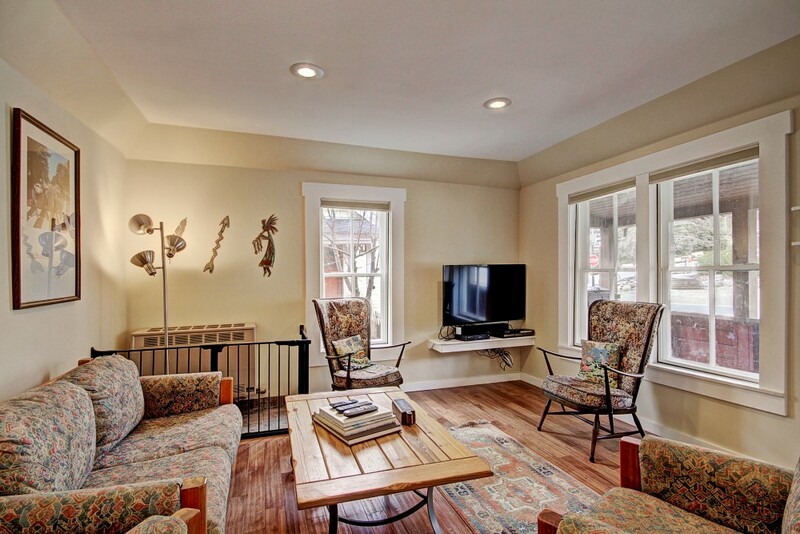 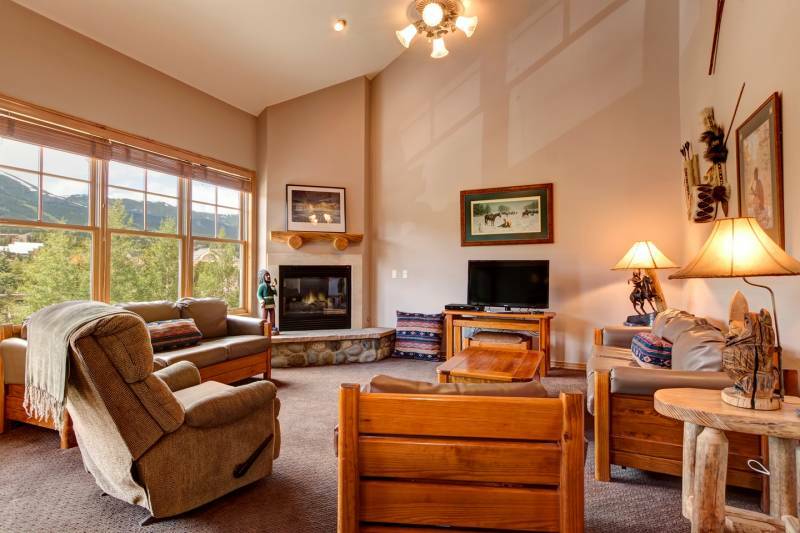 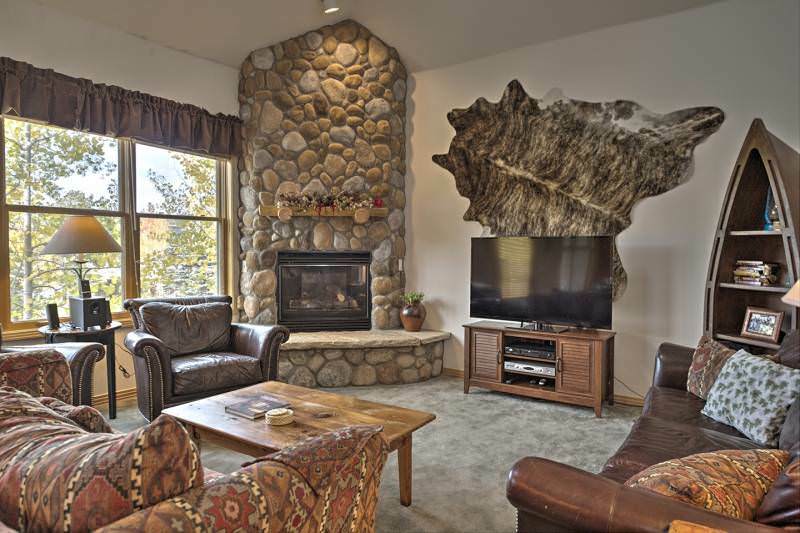 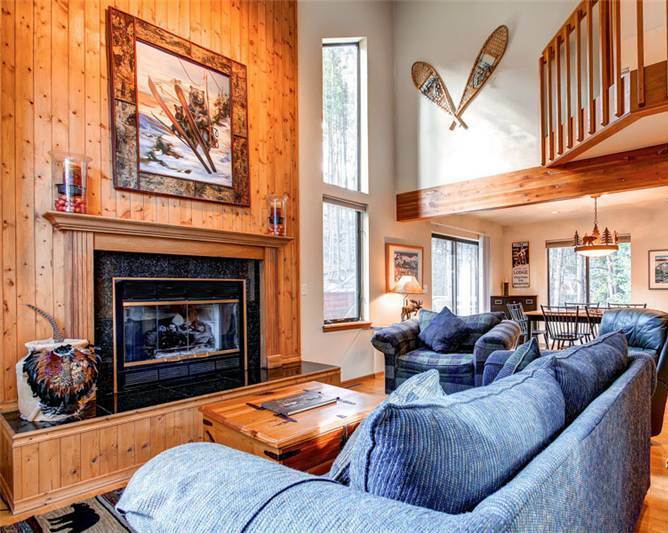 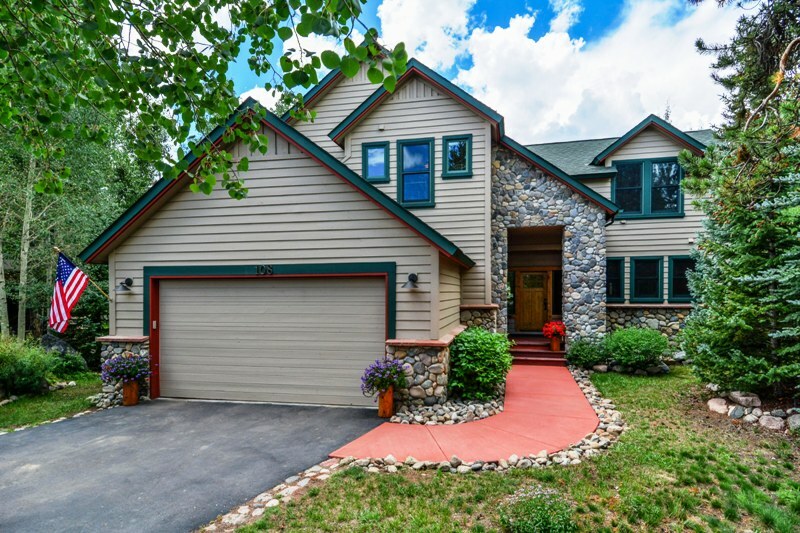 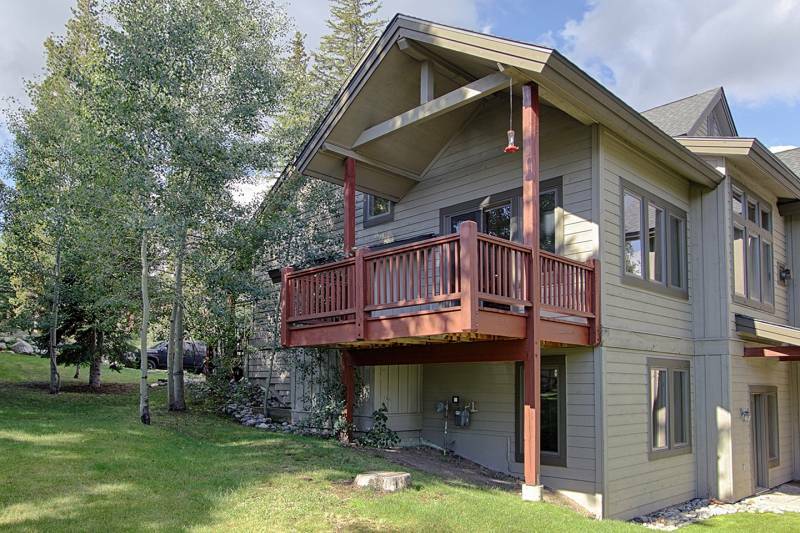 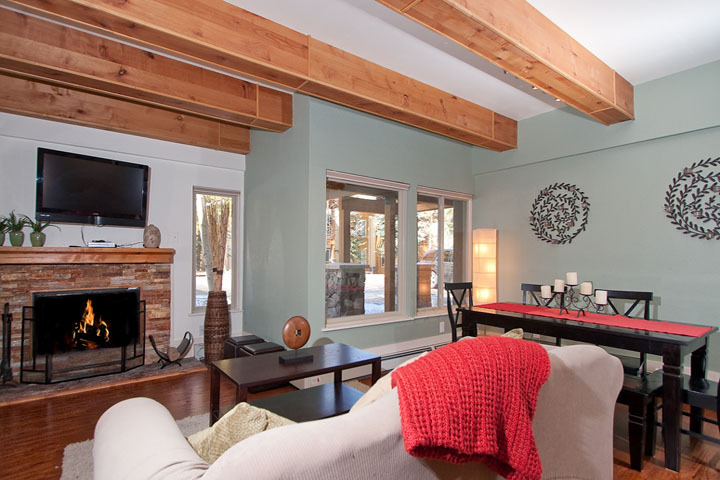 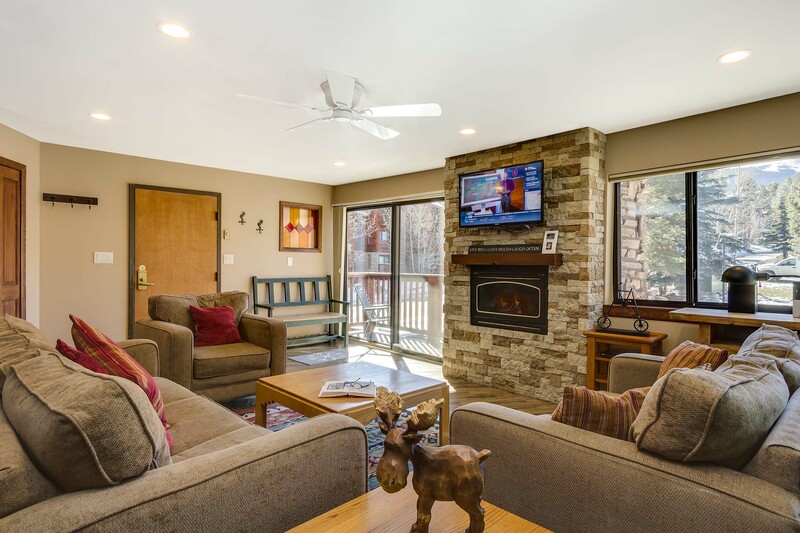 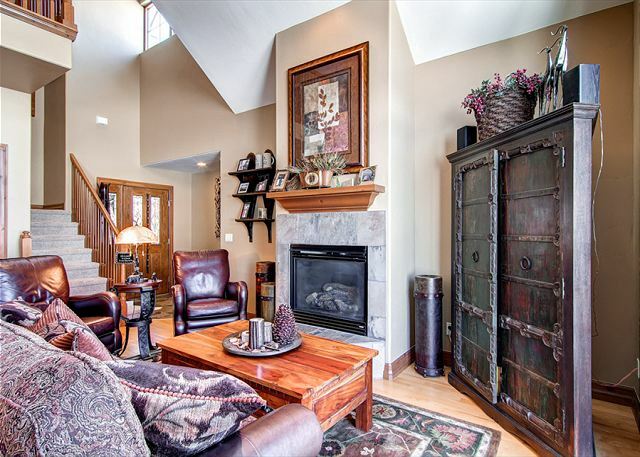 Located across the street from the Lower Peak 9 Ski Area Base, the Quicksilver SuperChair and down in the heart of Historic Main Street, this condominium provides easy access to all that Breckenridge has to offer. 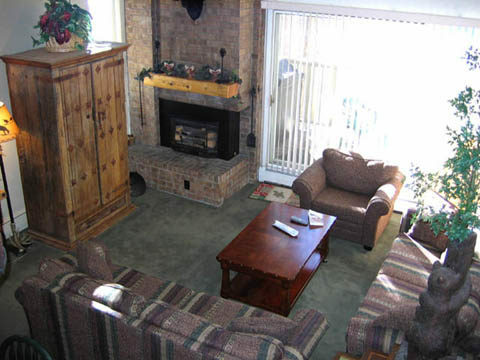 The Der Steiermark Complex is a unique layout with an open center and units that surround the square lobby. 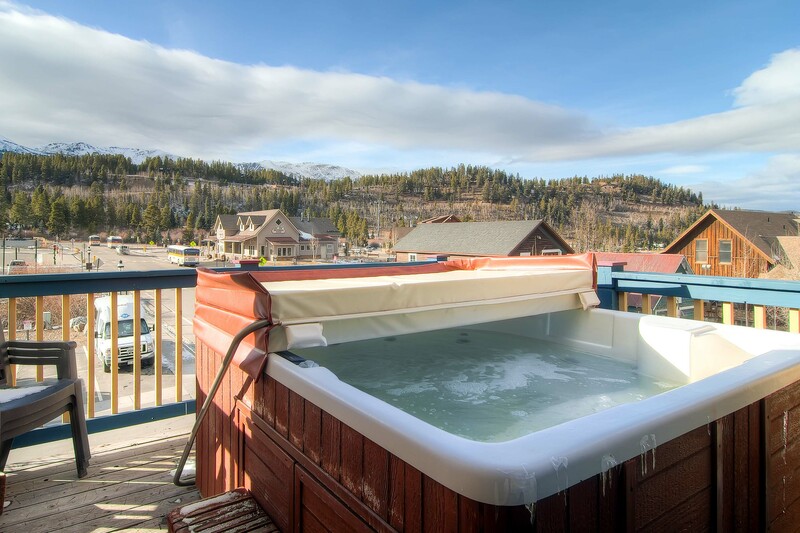 In the middle of this weather exposed lobby is the seasonal outdoor hot tub that is available to the Der Steiermark guests. 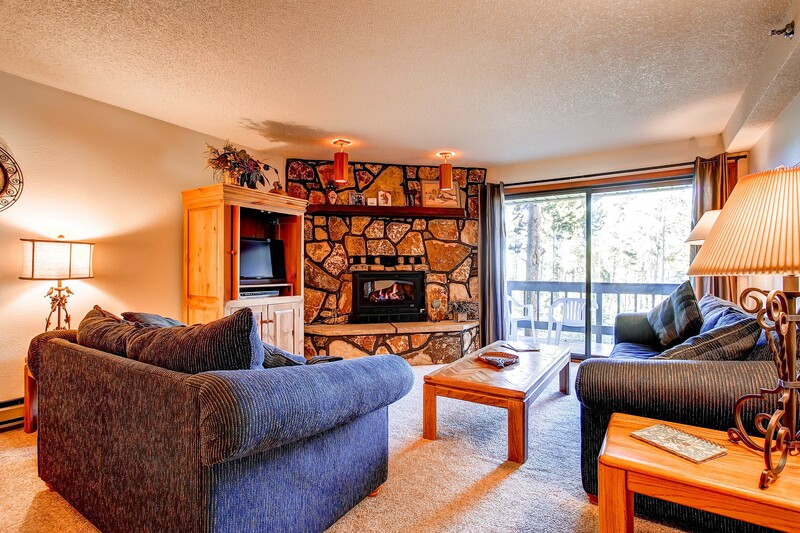 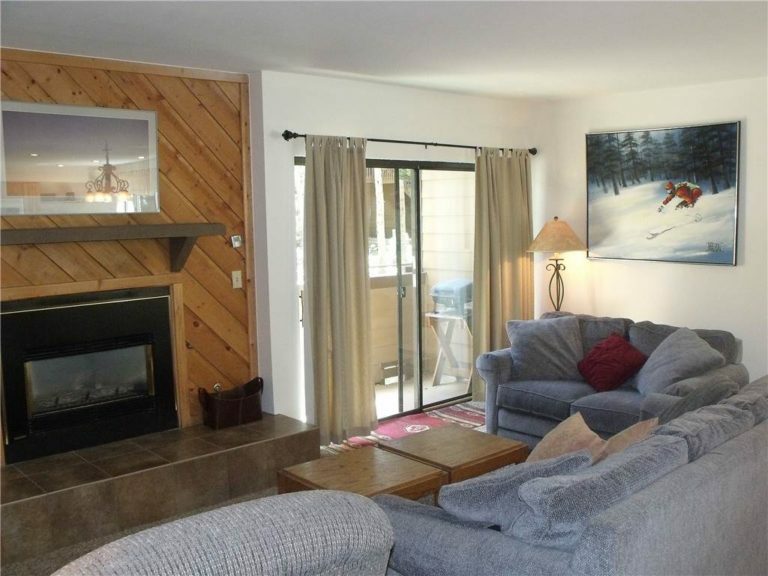 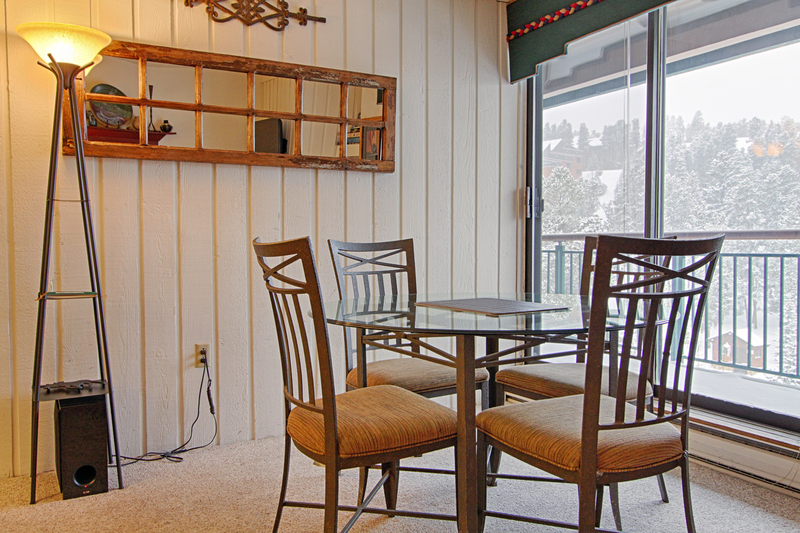 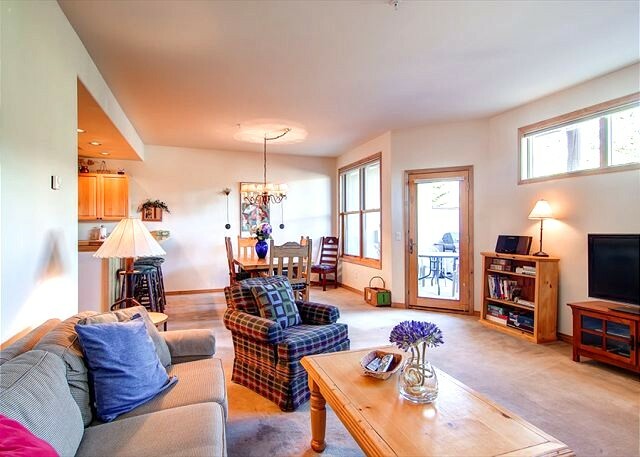 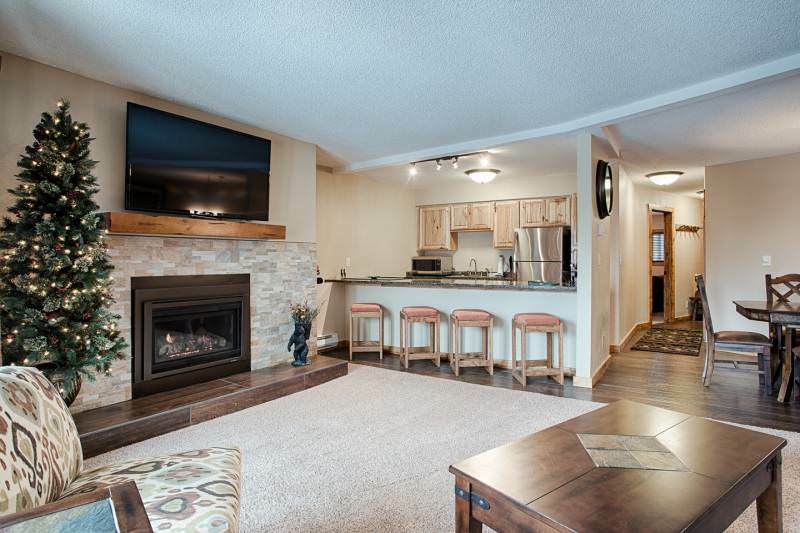 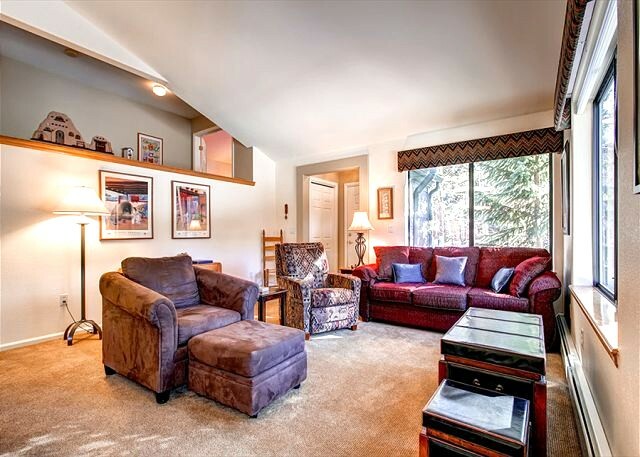 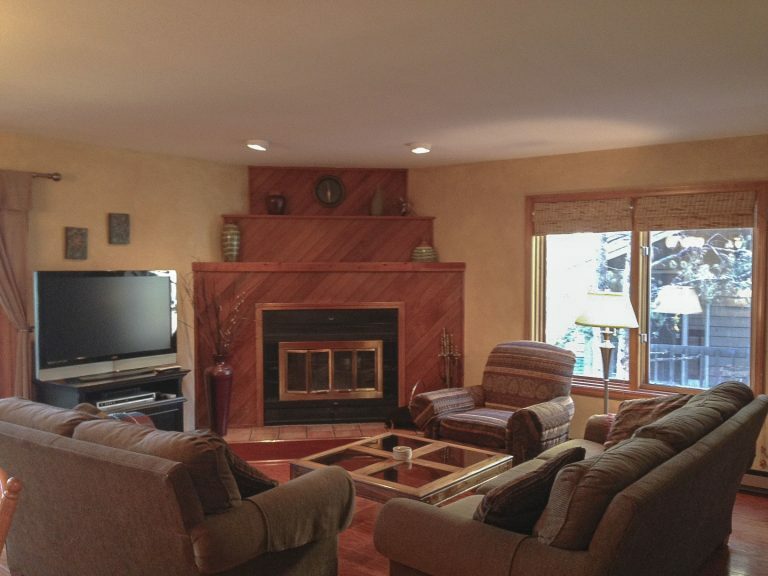 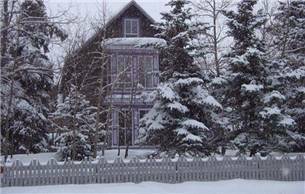 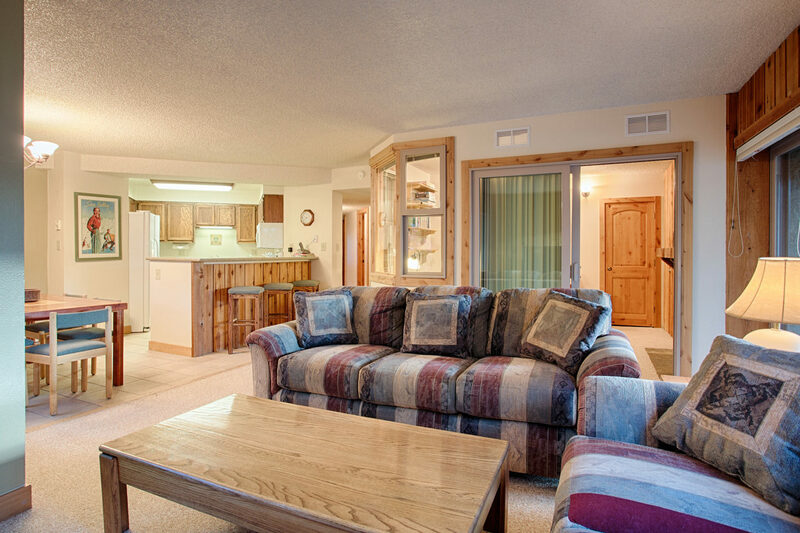 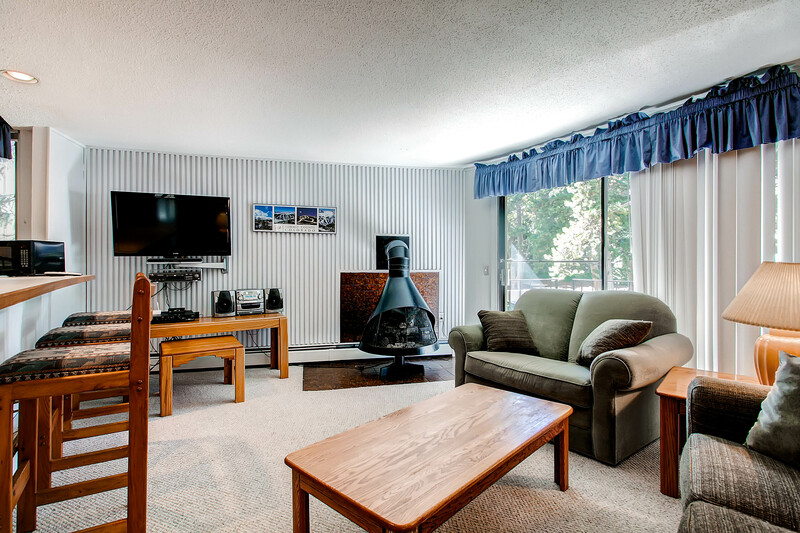 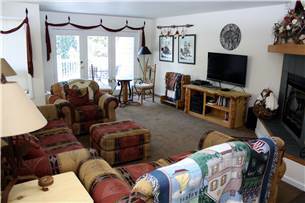 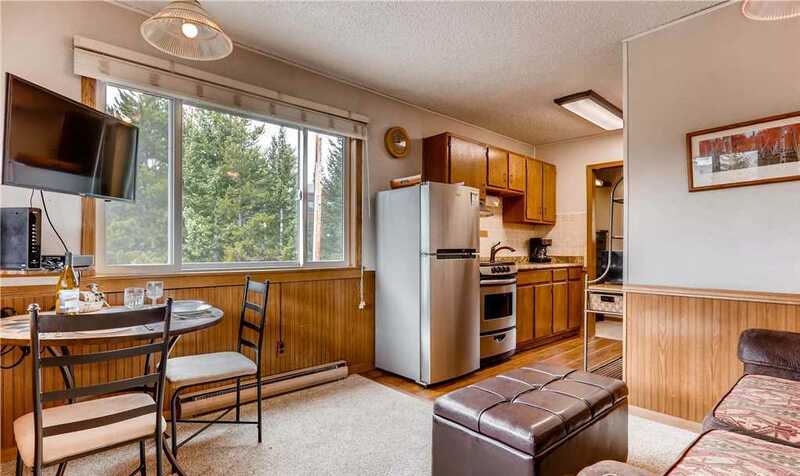 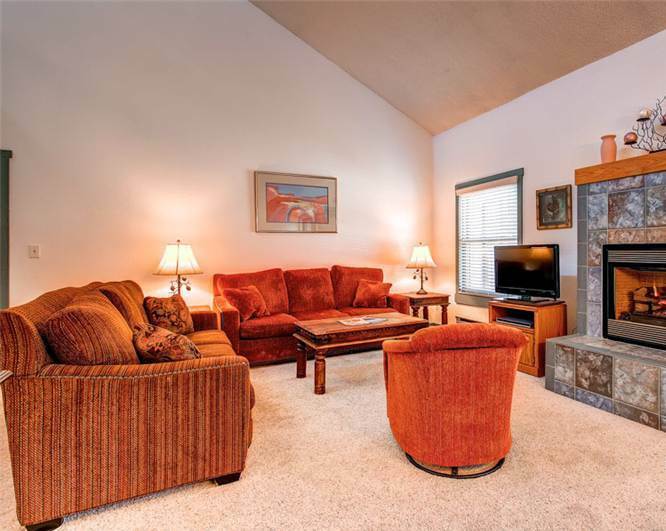 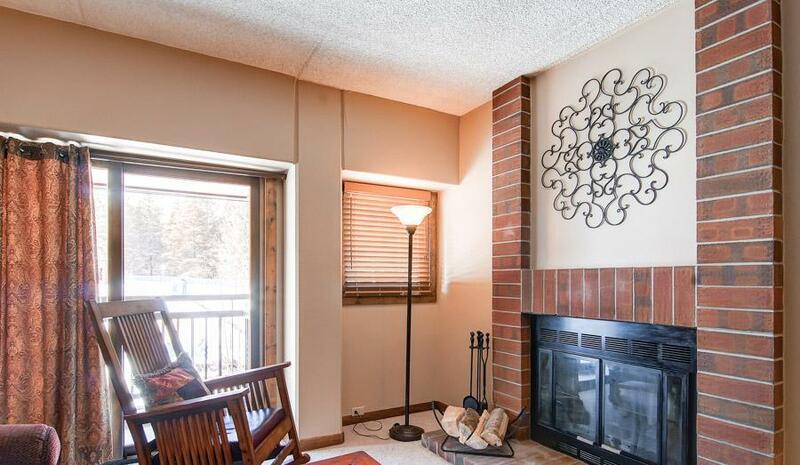 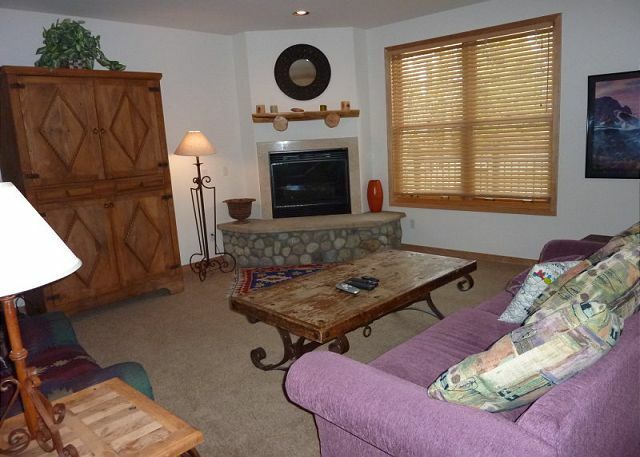 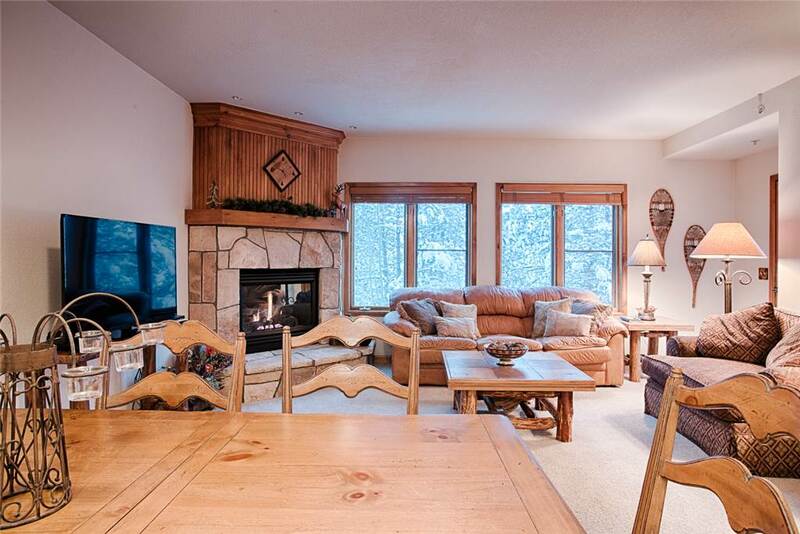 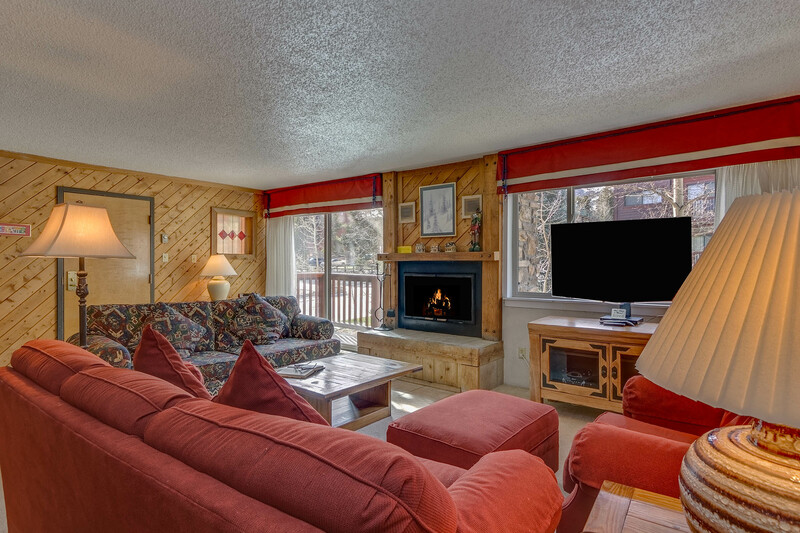 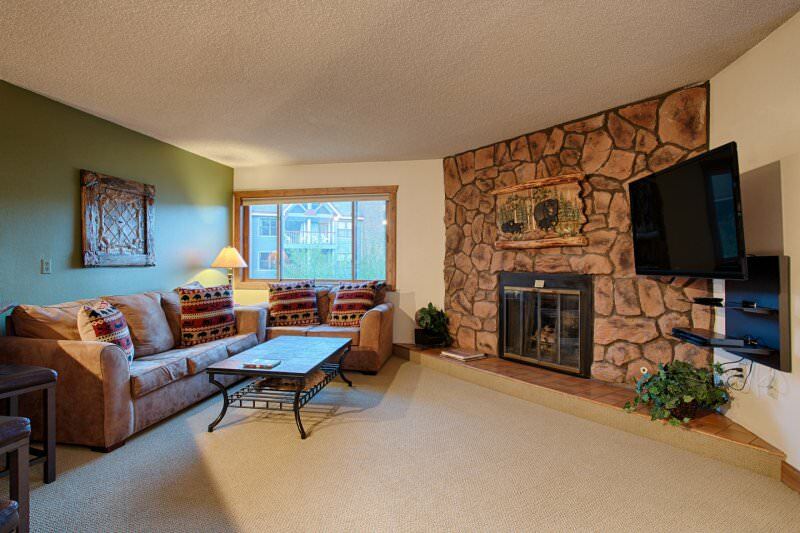 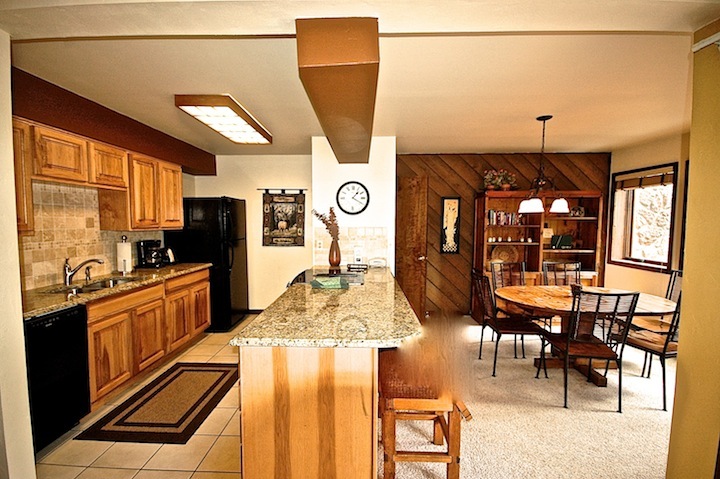 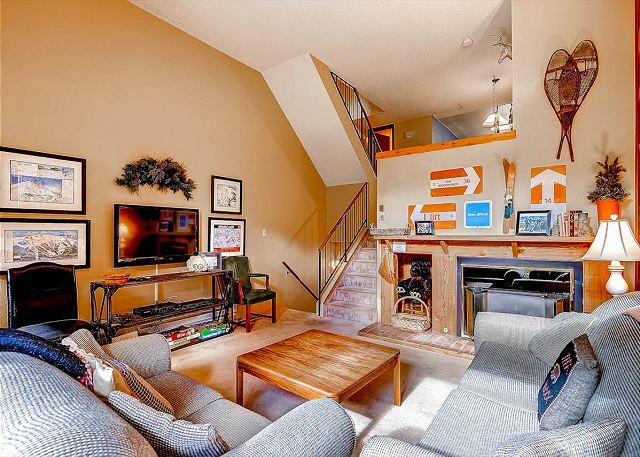 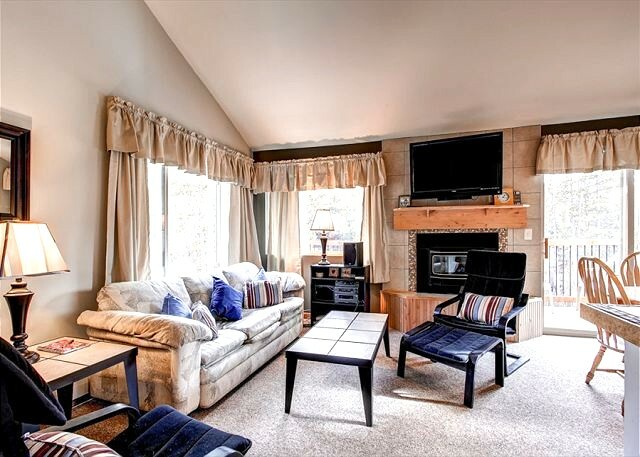 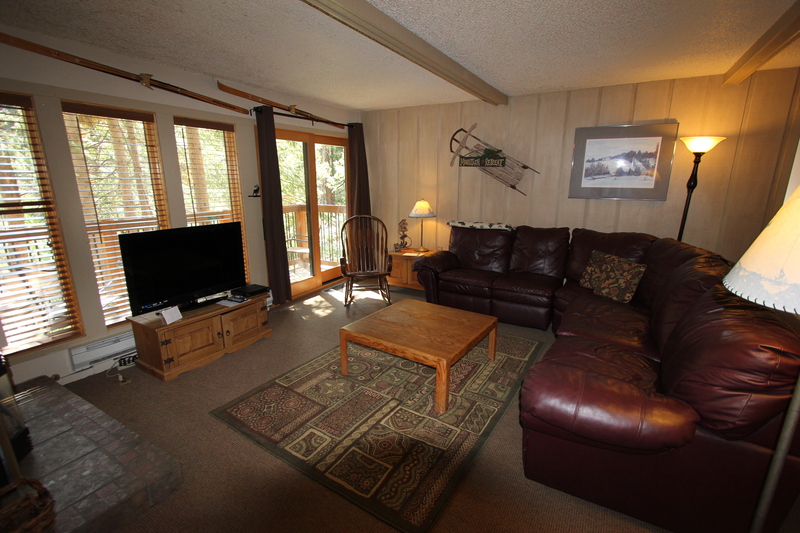 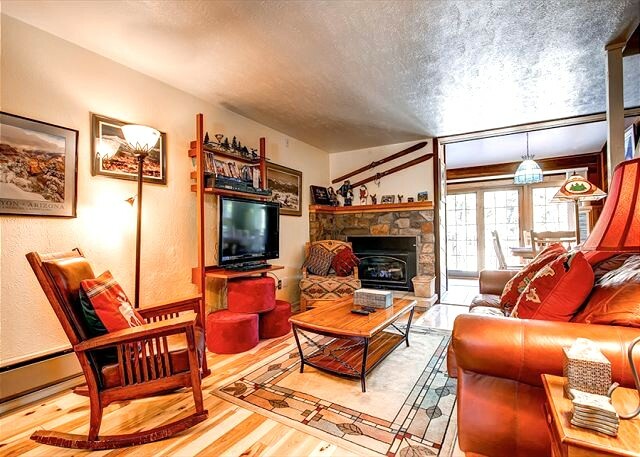 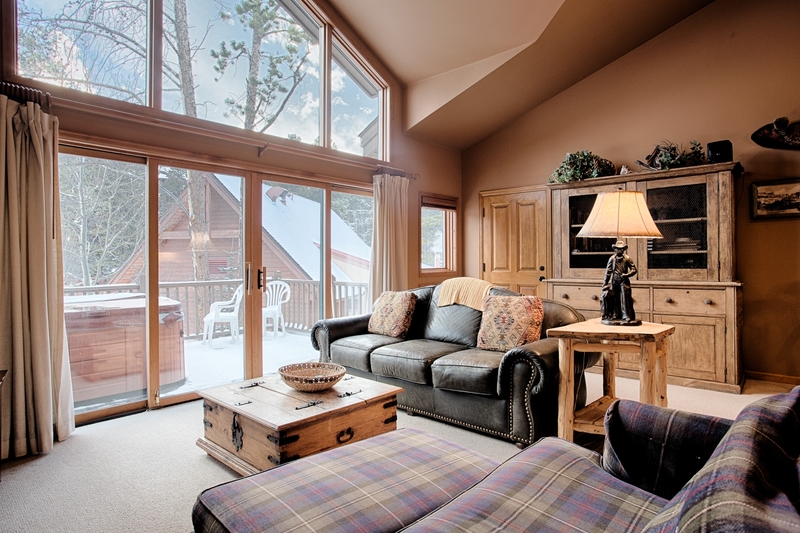 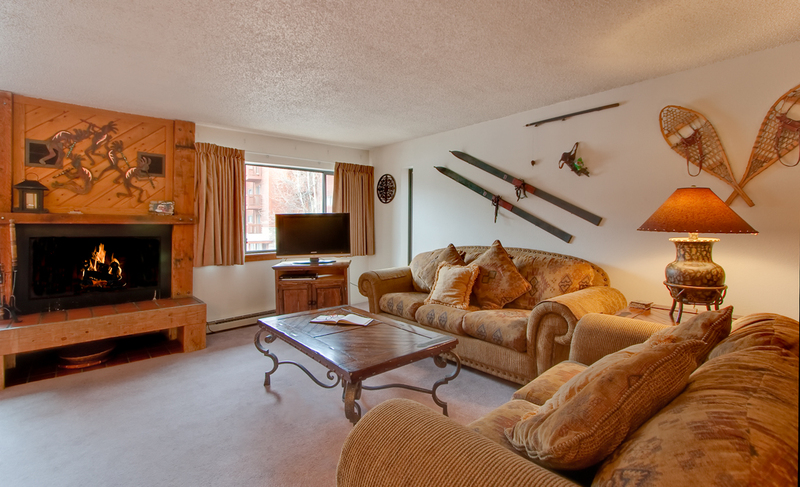 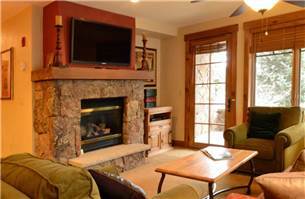 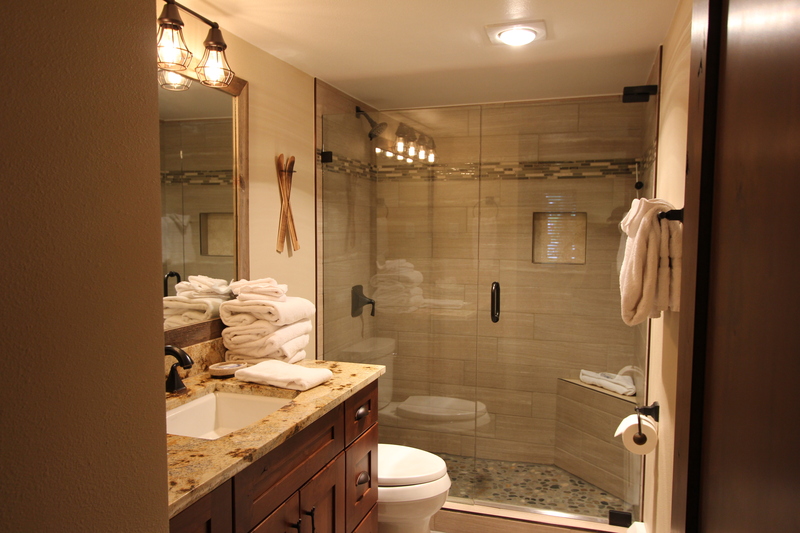 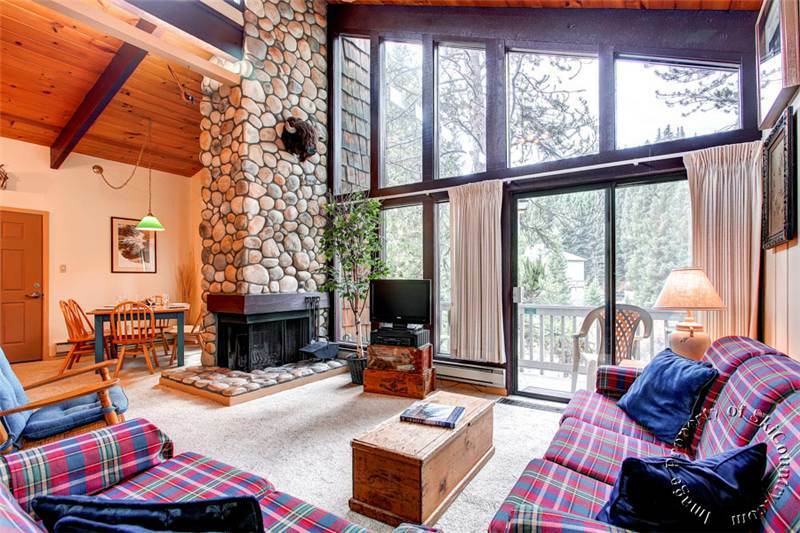 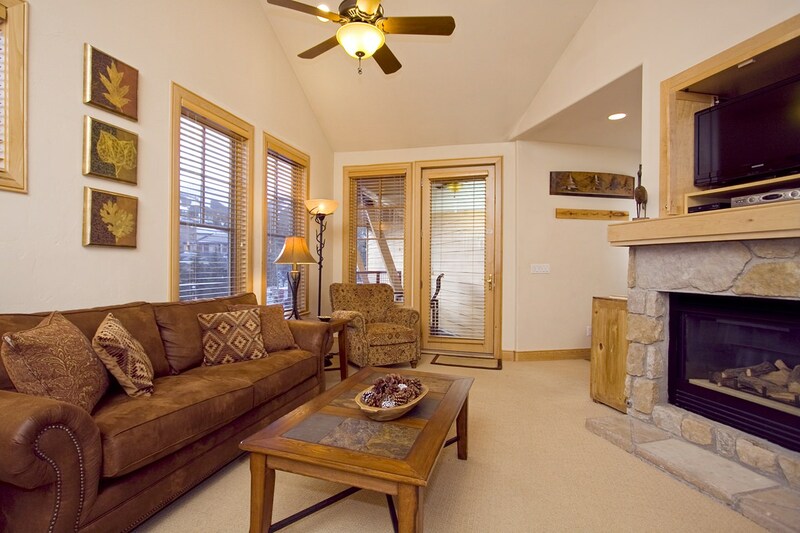 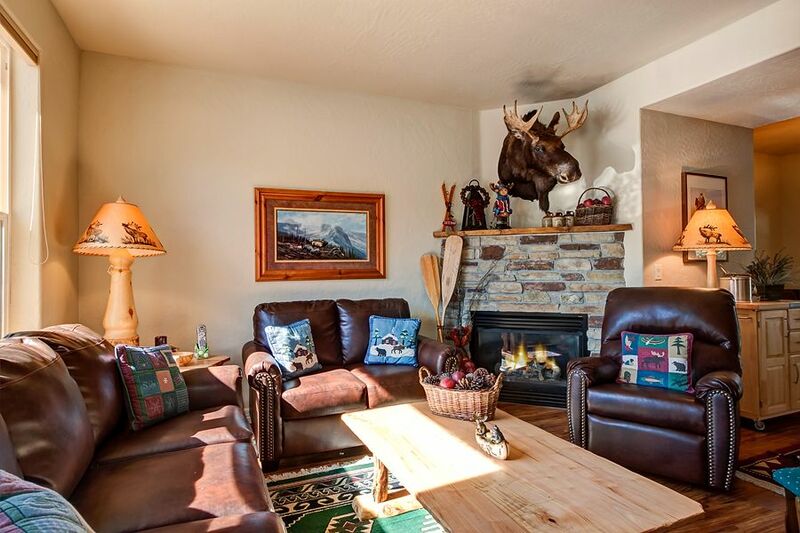 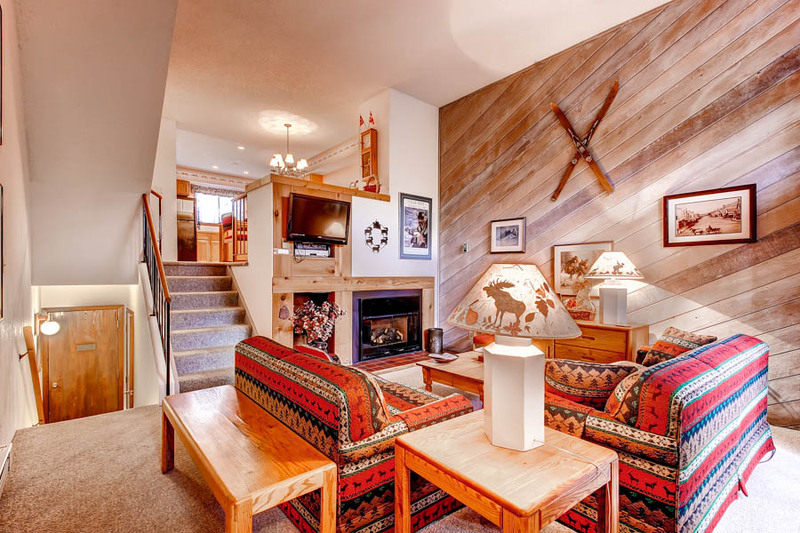 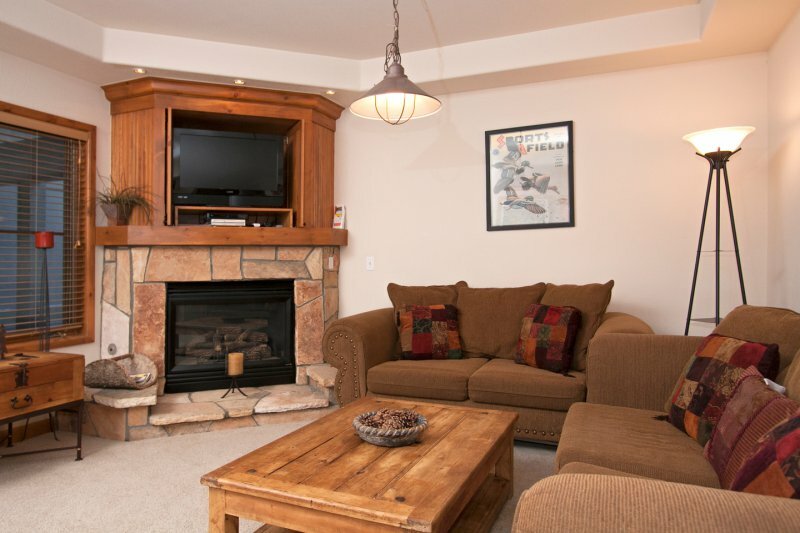 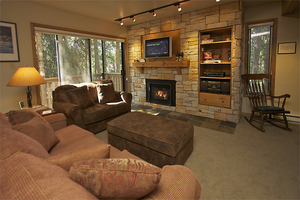 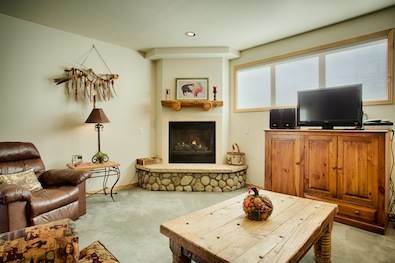 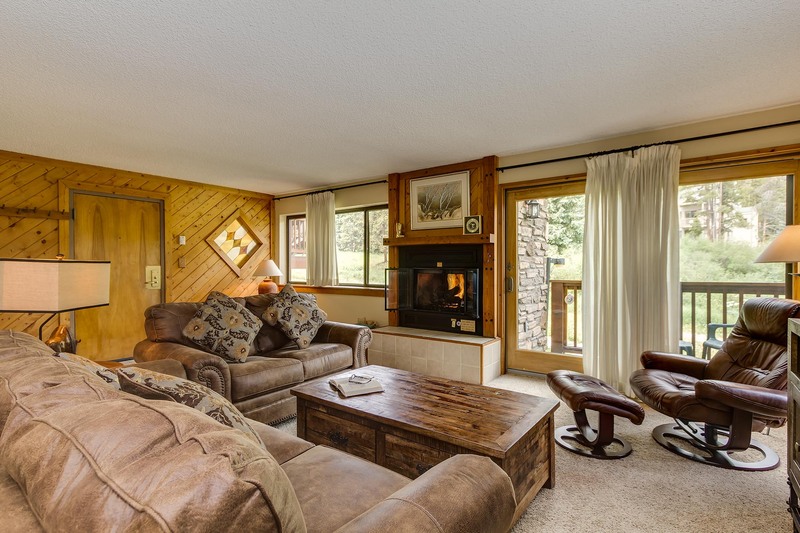 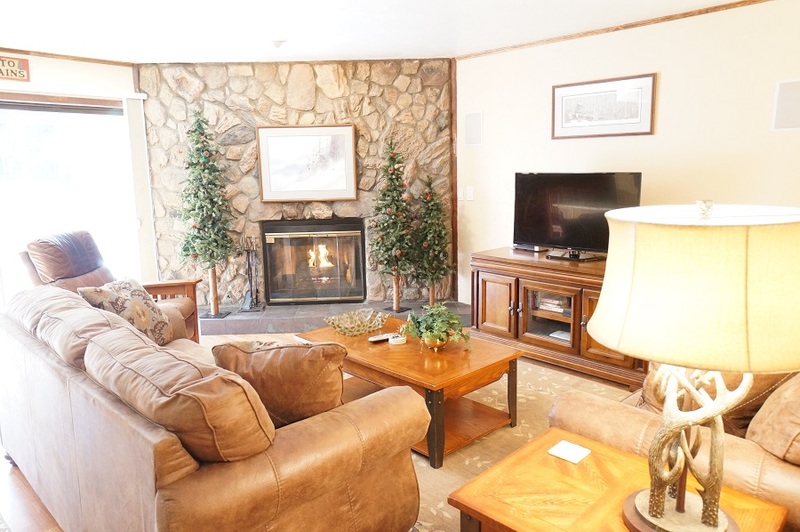 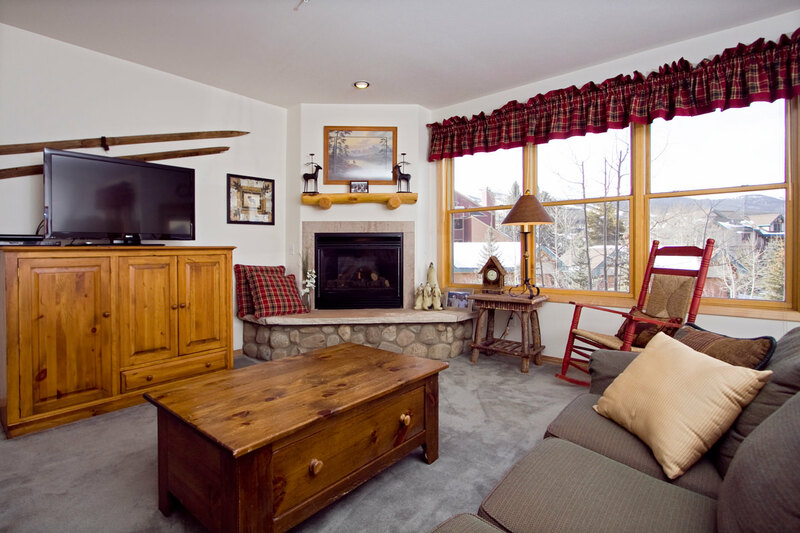 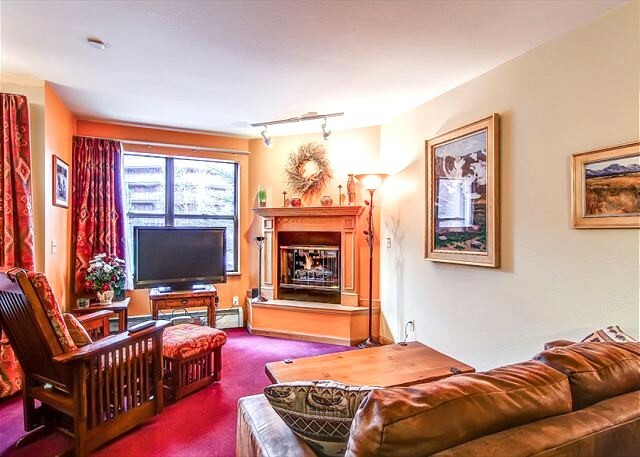 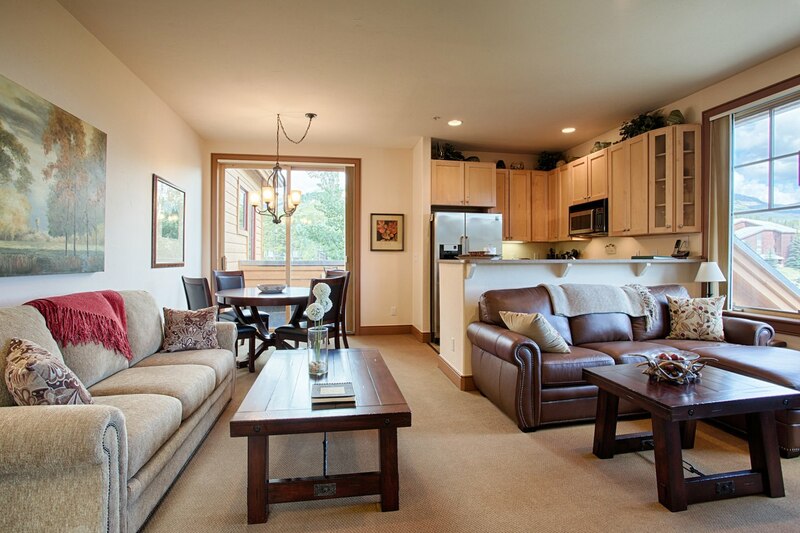 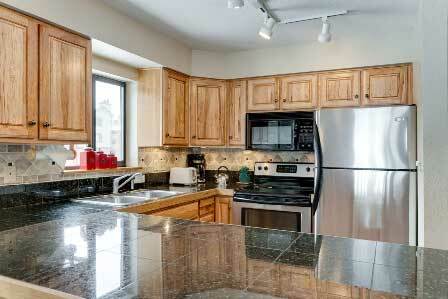 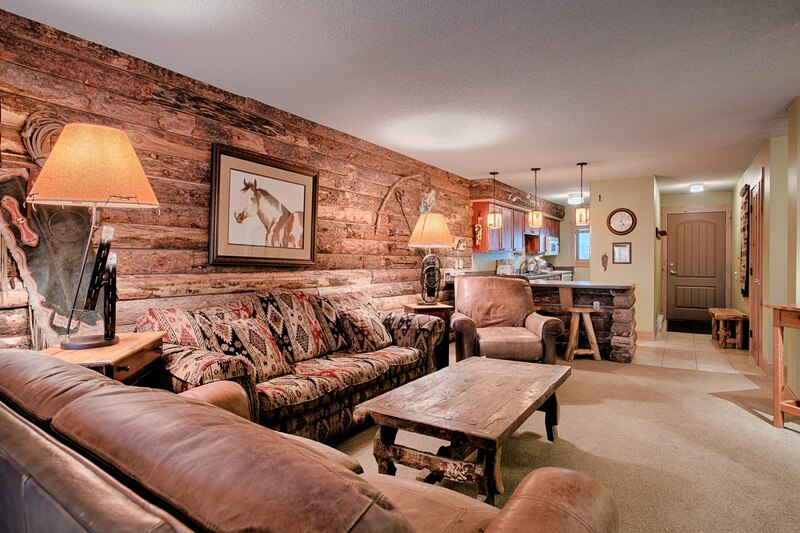 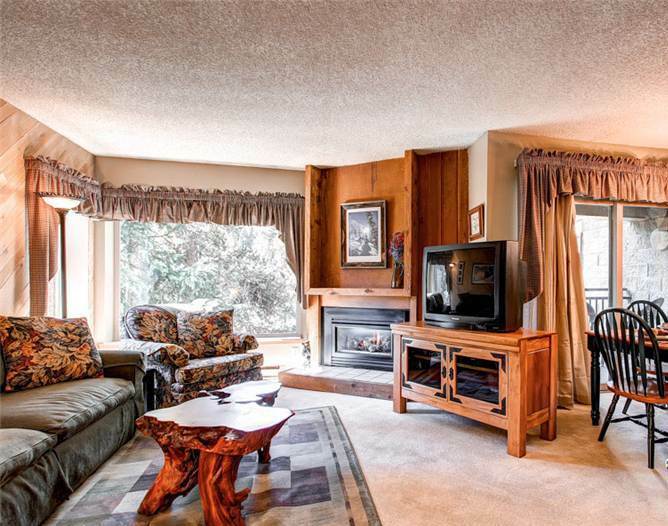 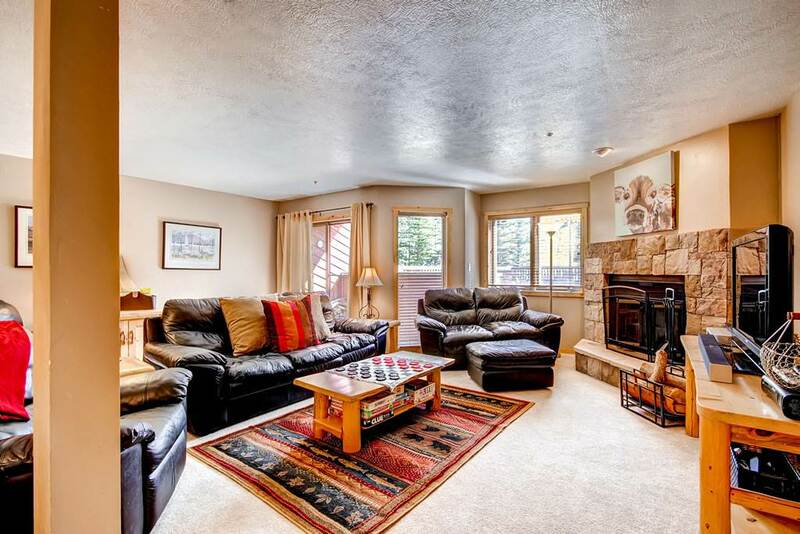 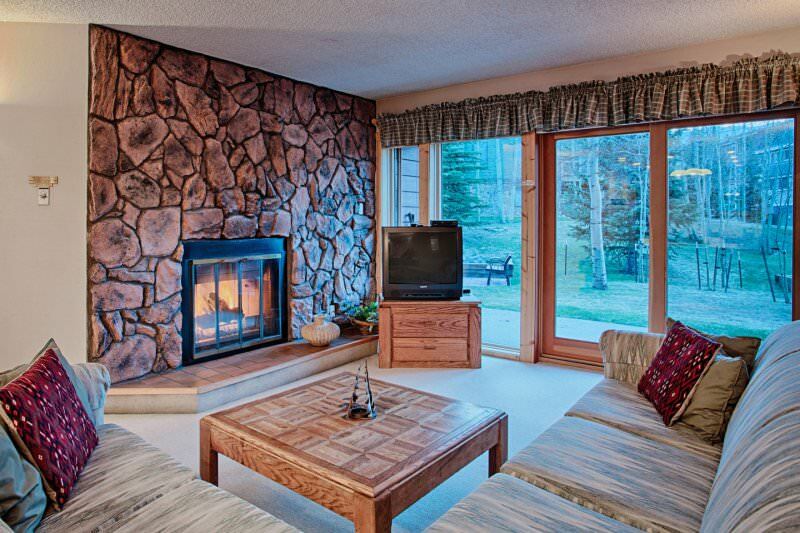 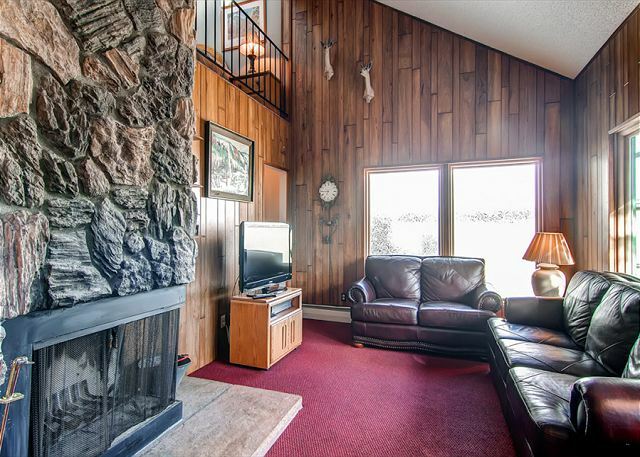 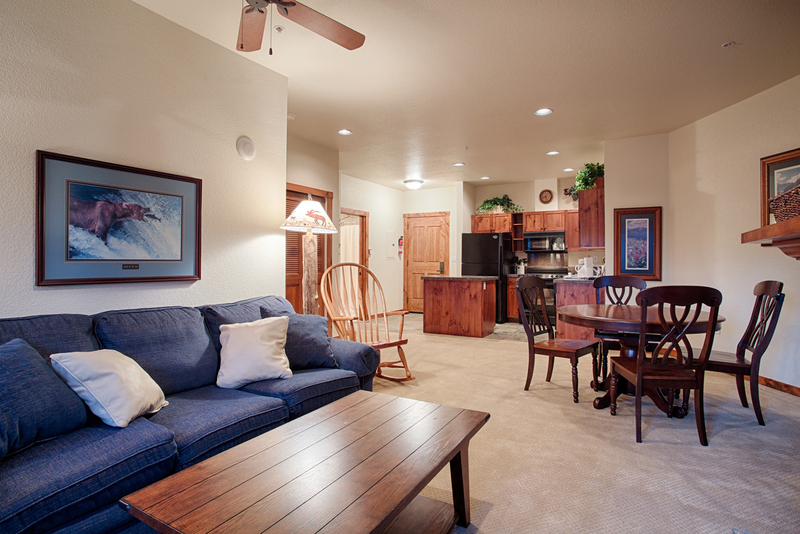 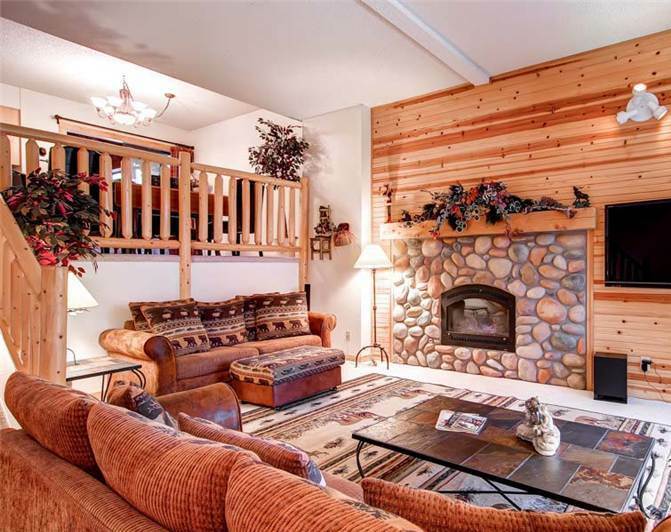 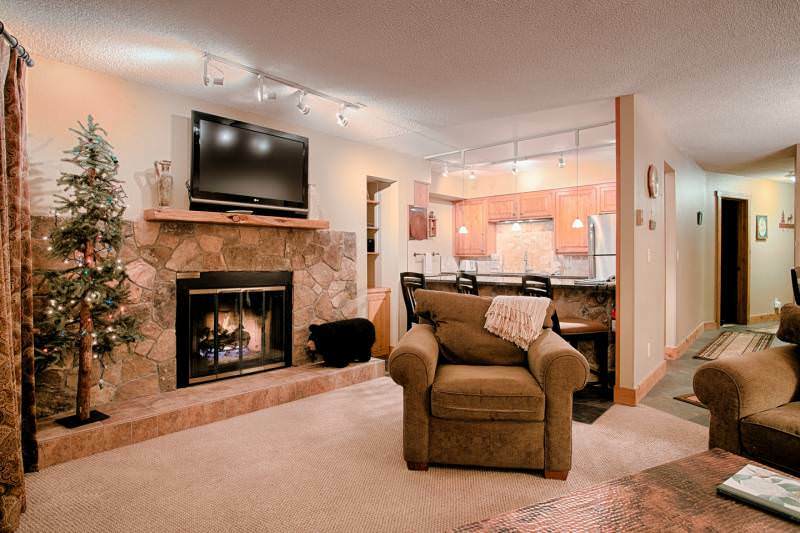 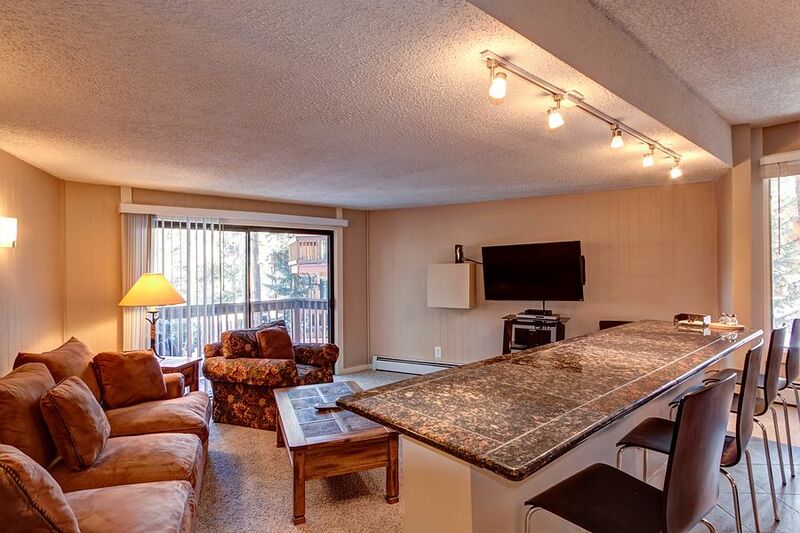 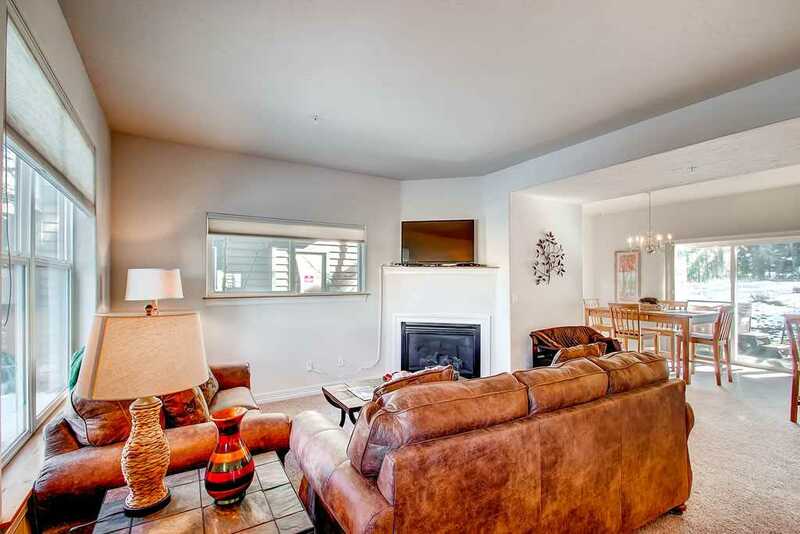 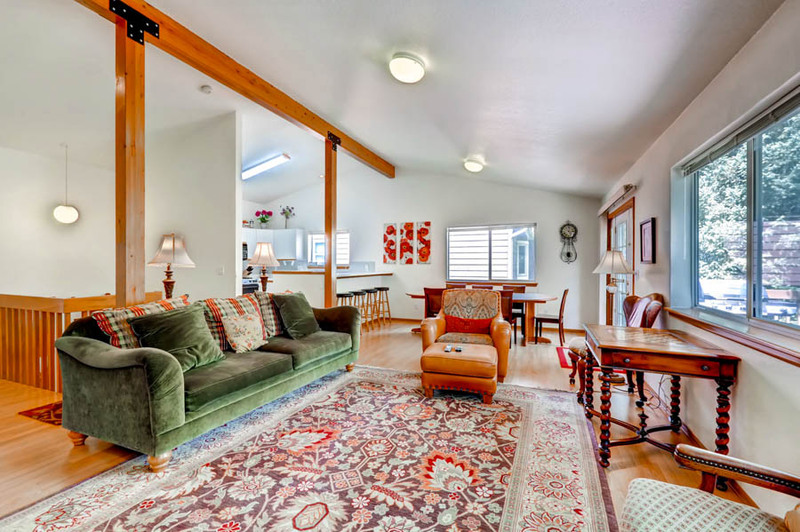 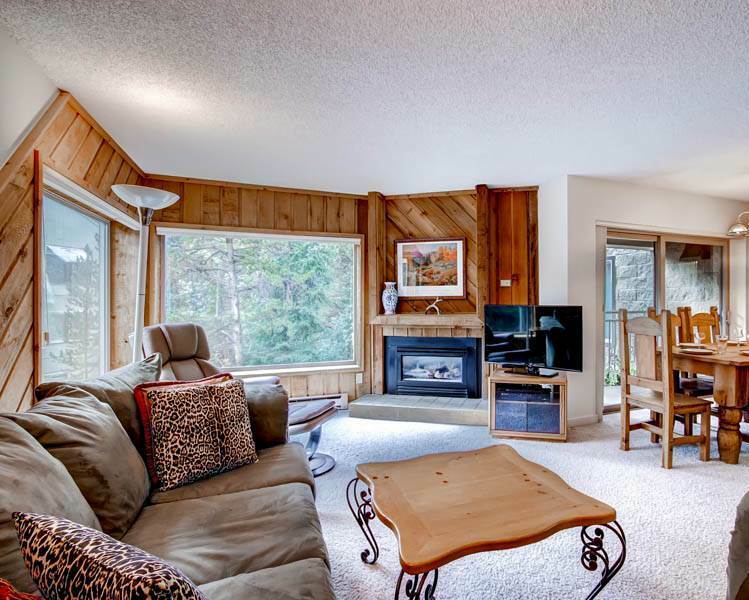 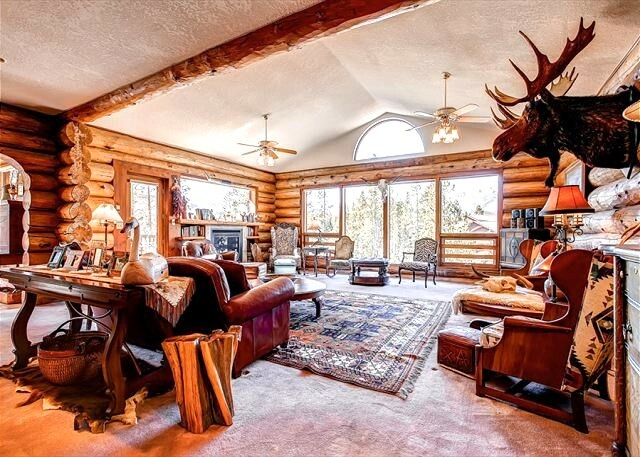 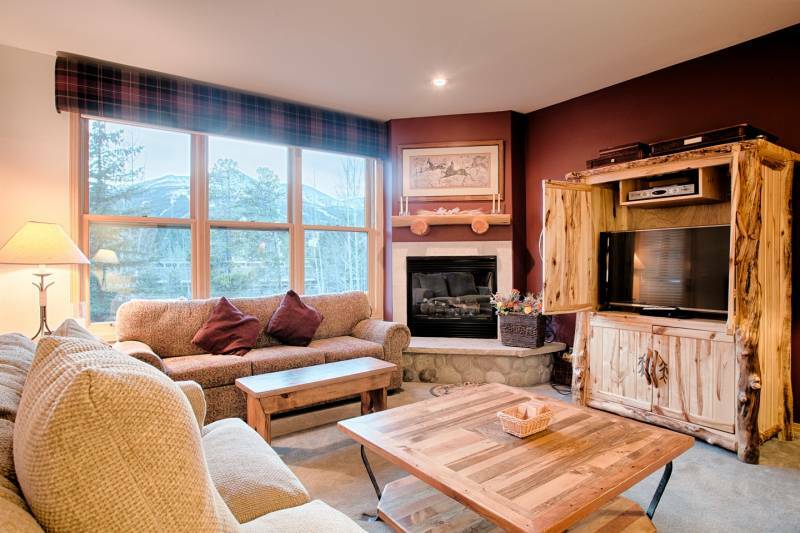 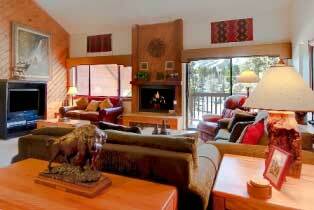 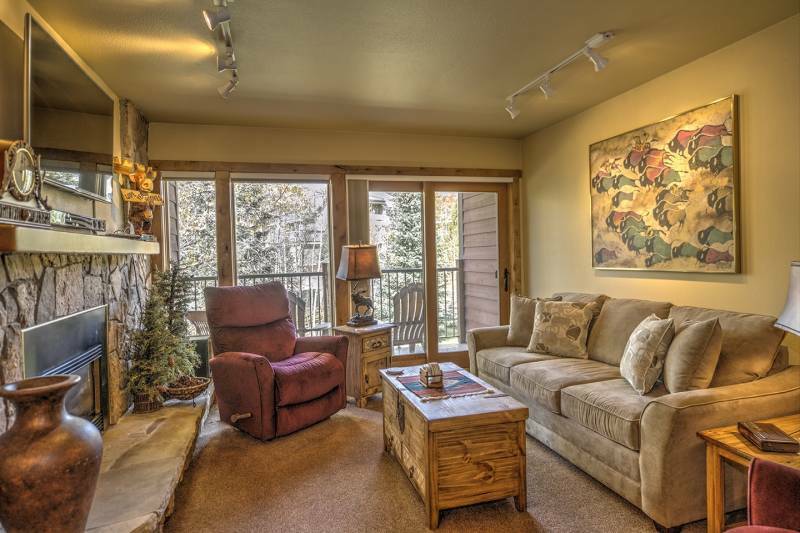 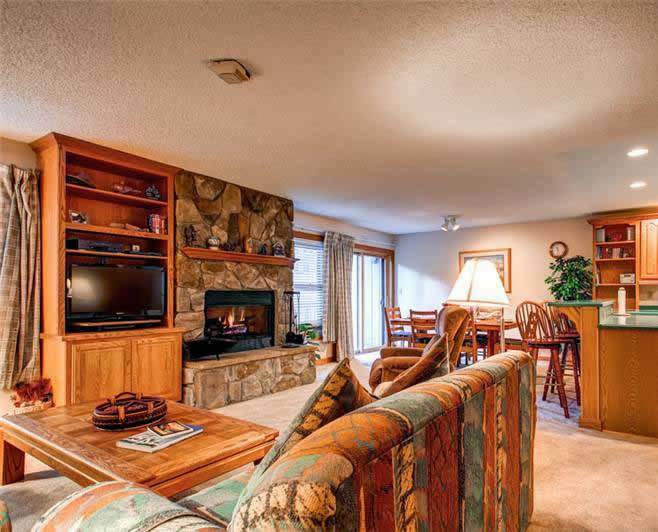 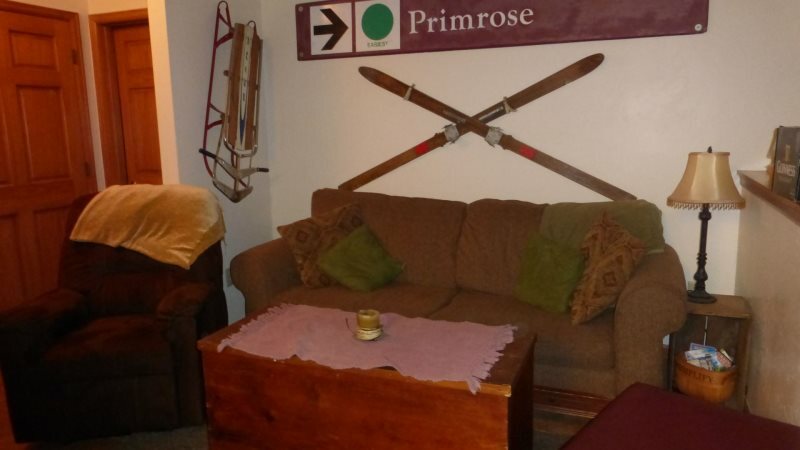 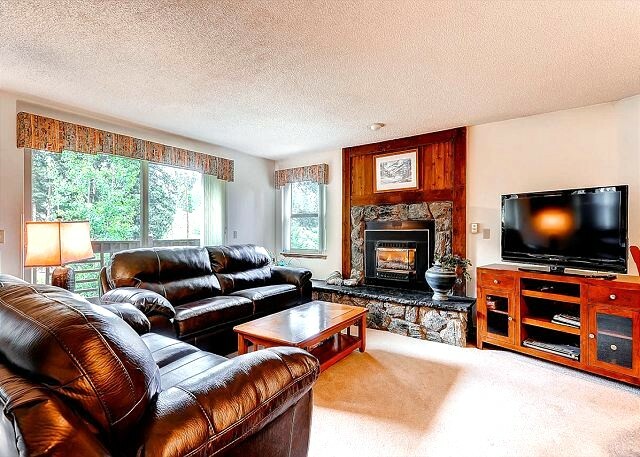 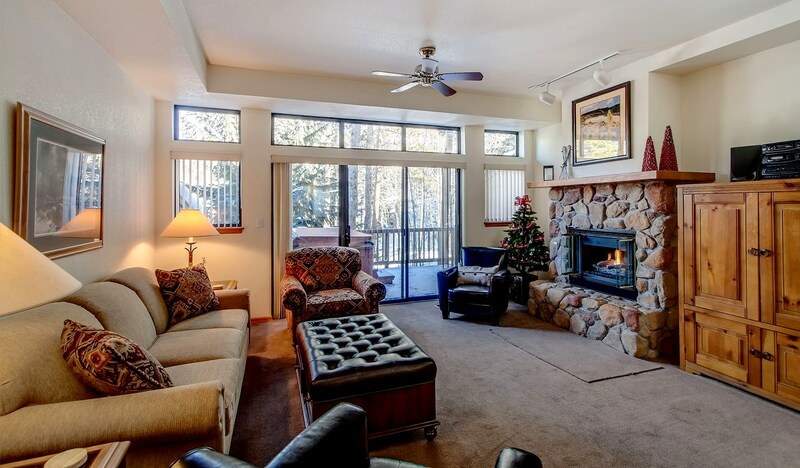 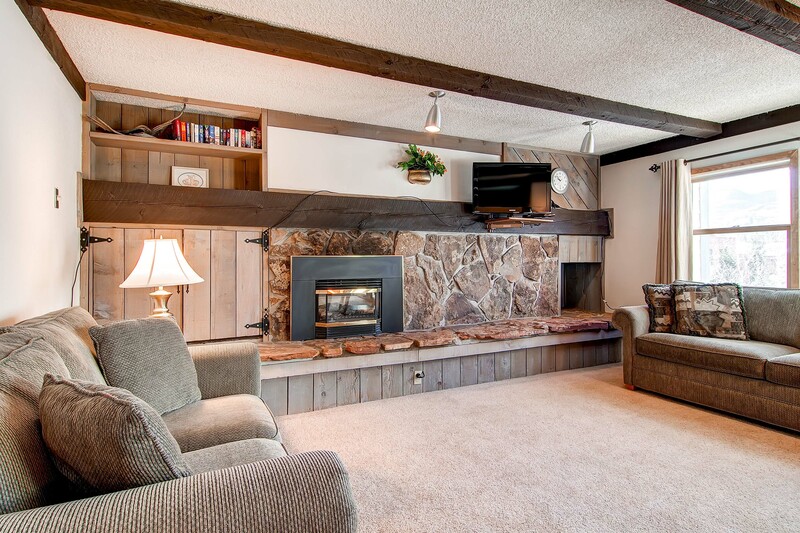 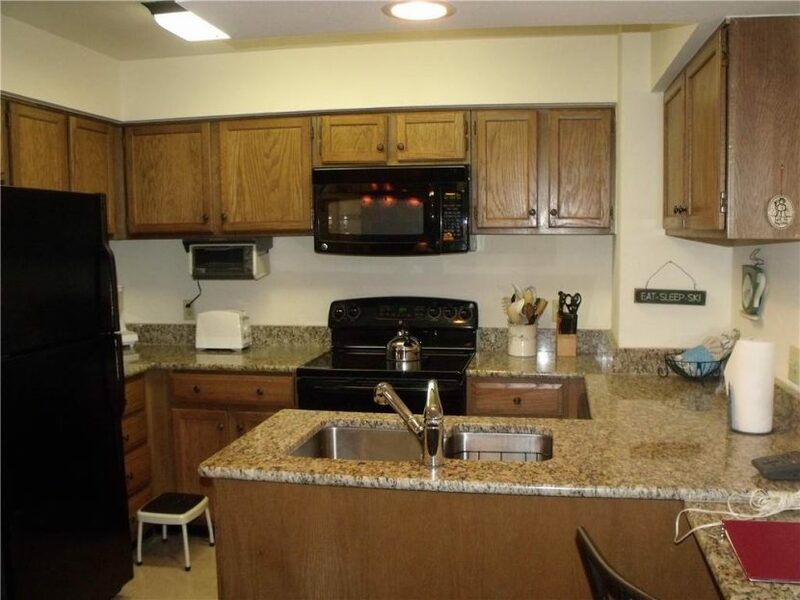 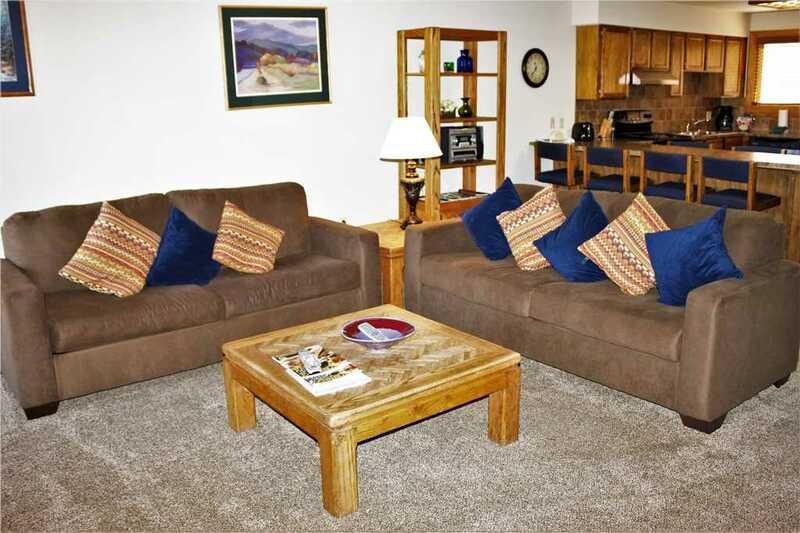 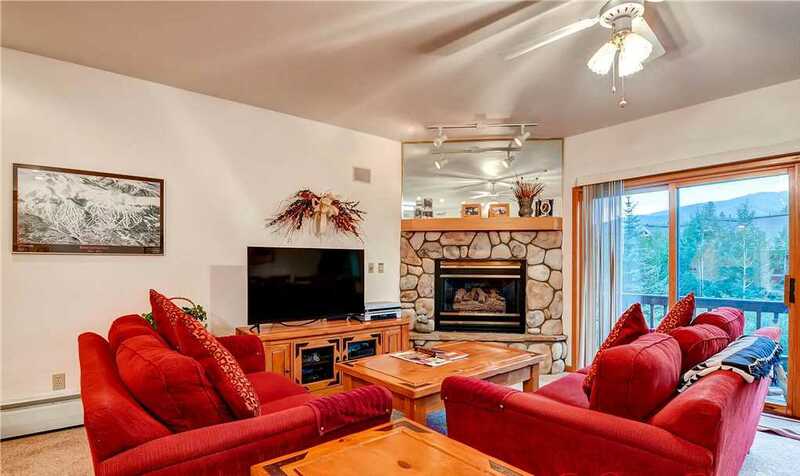 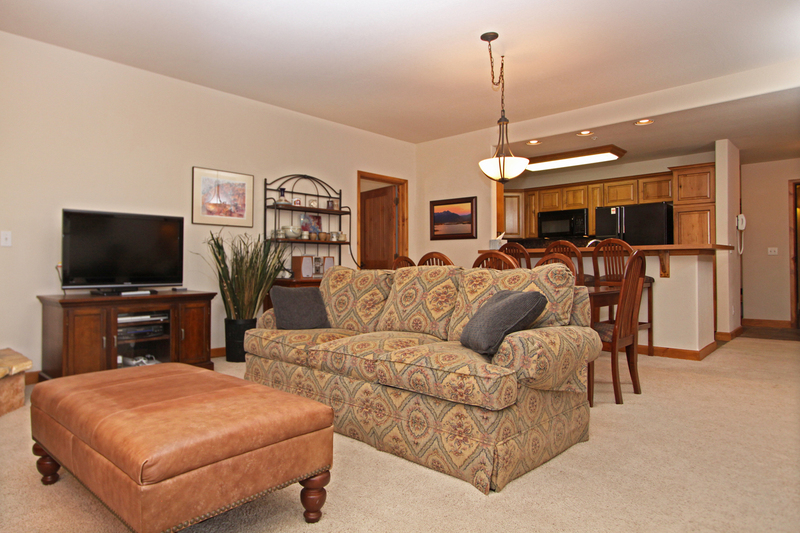 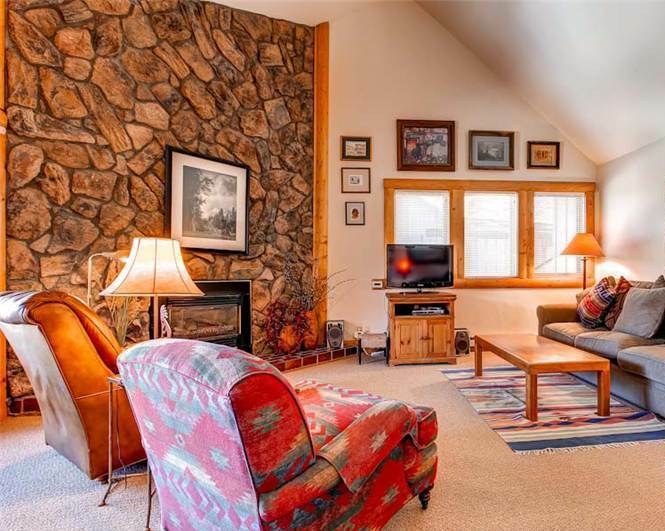 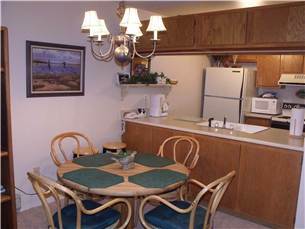 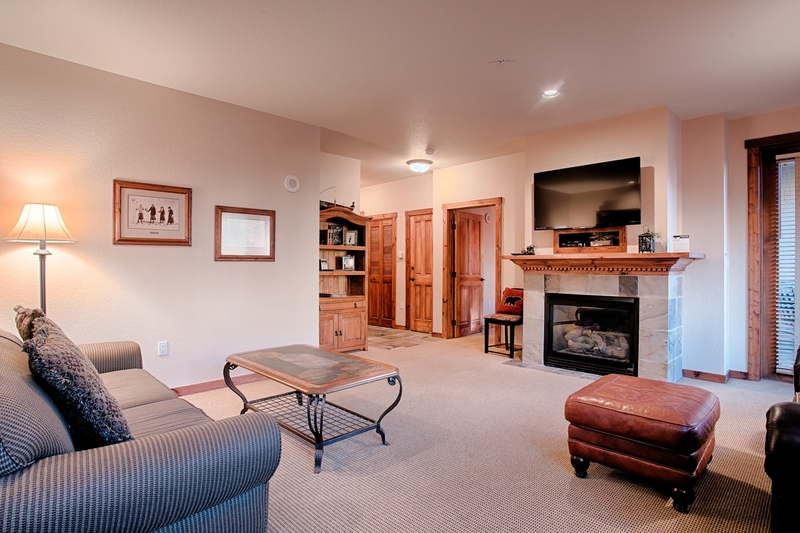 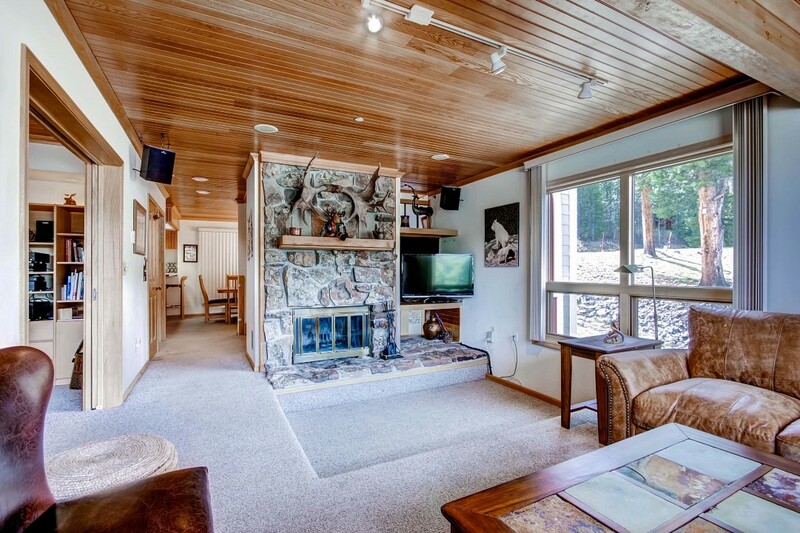 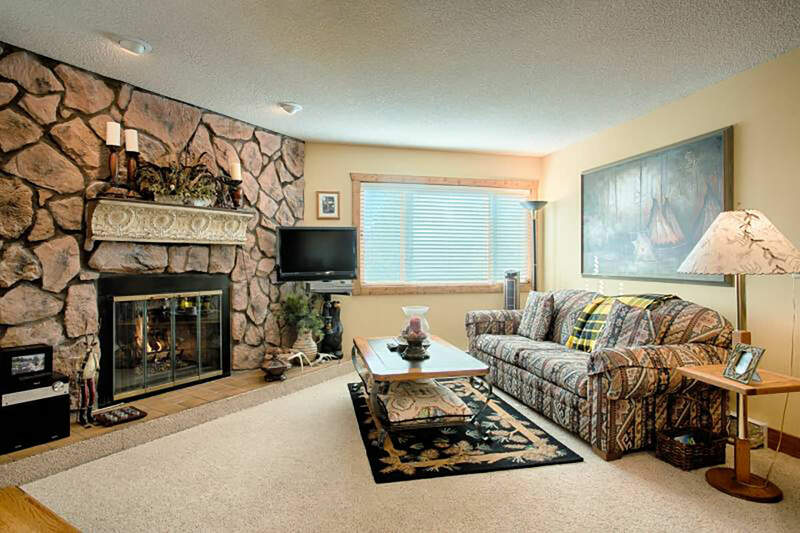 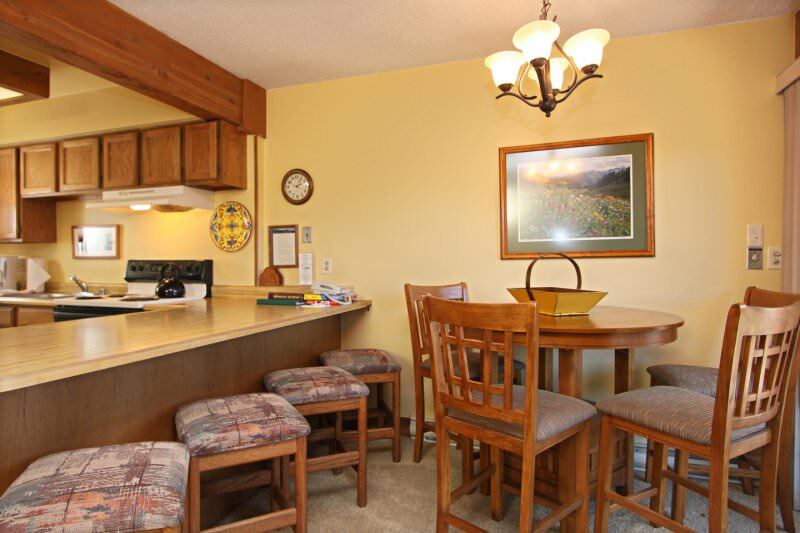 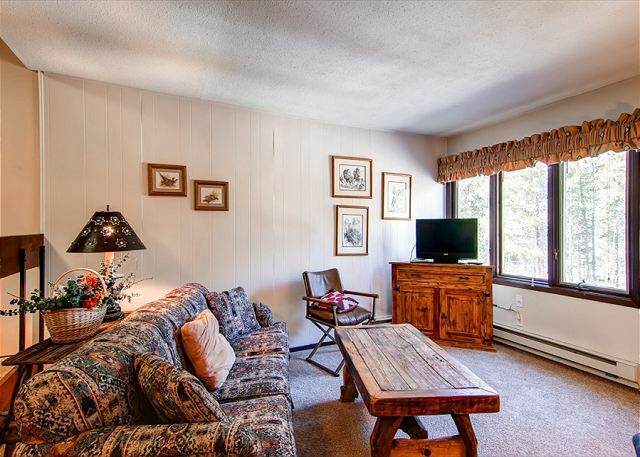 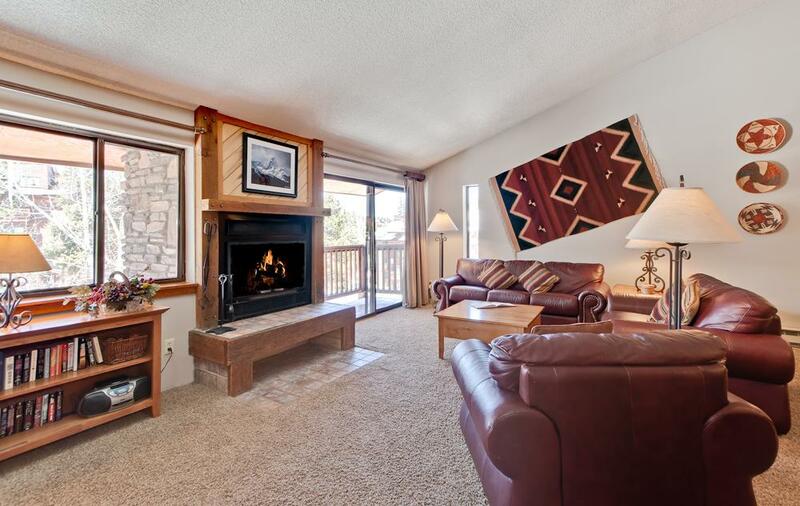 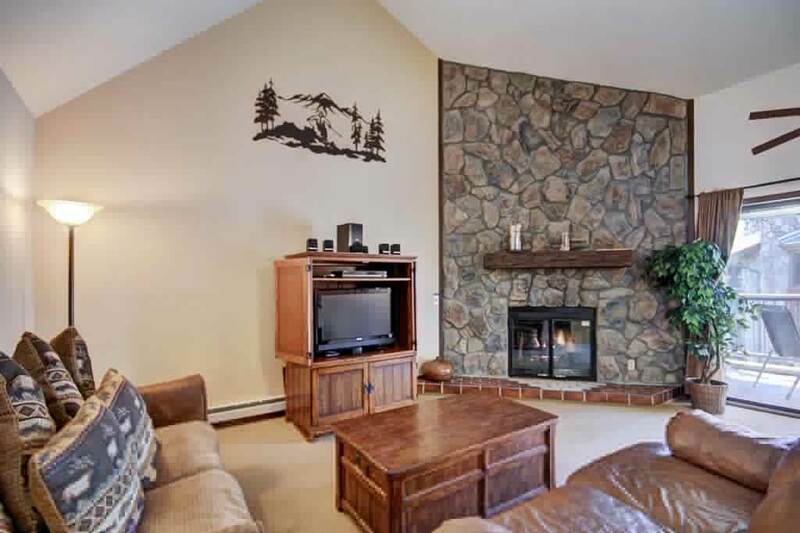 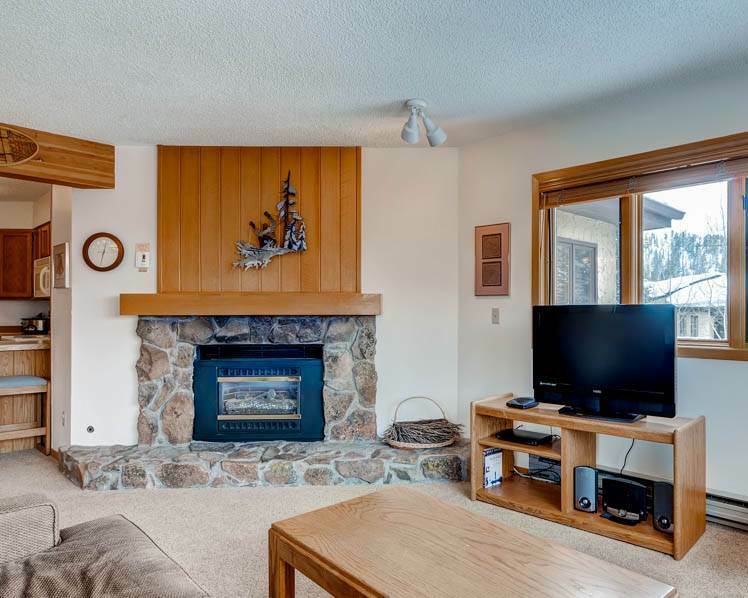 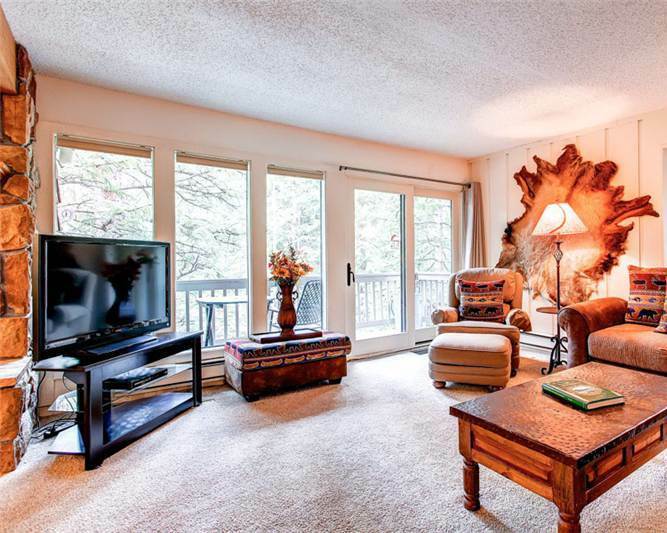 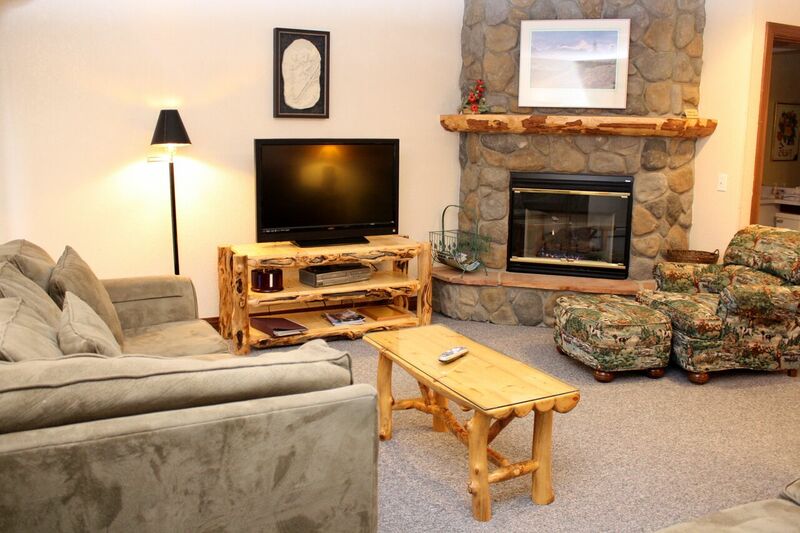 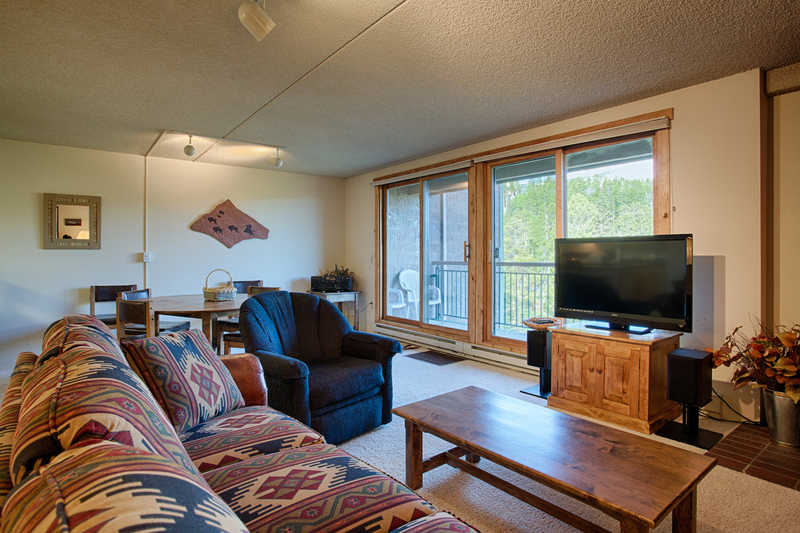 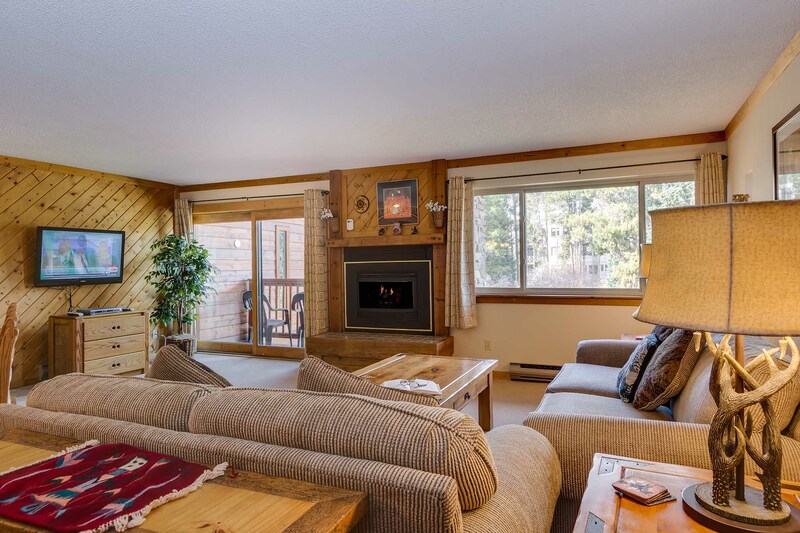 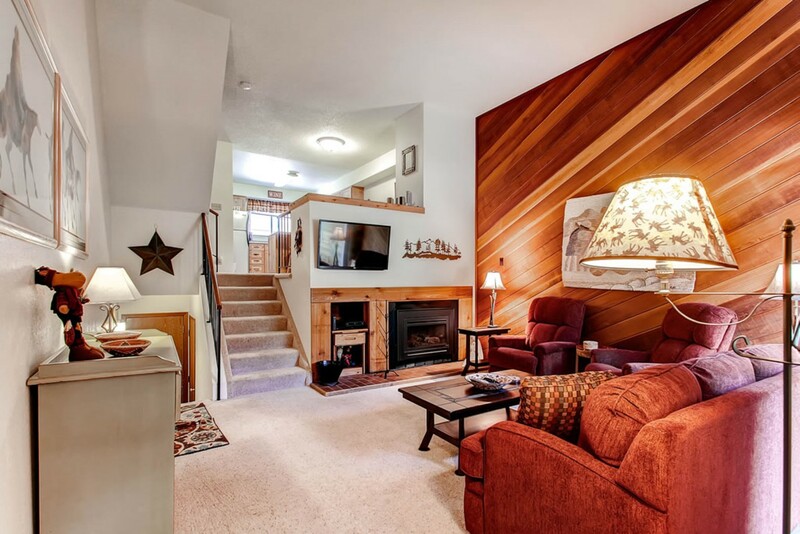 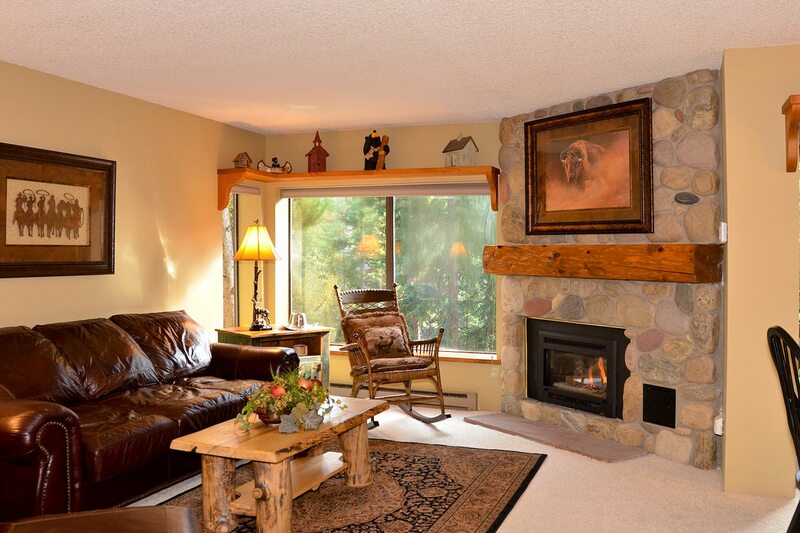 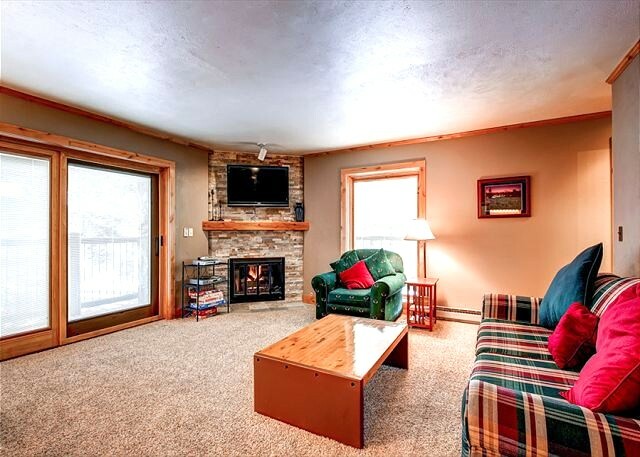 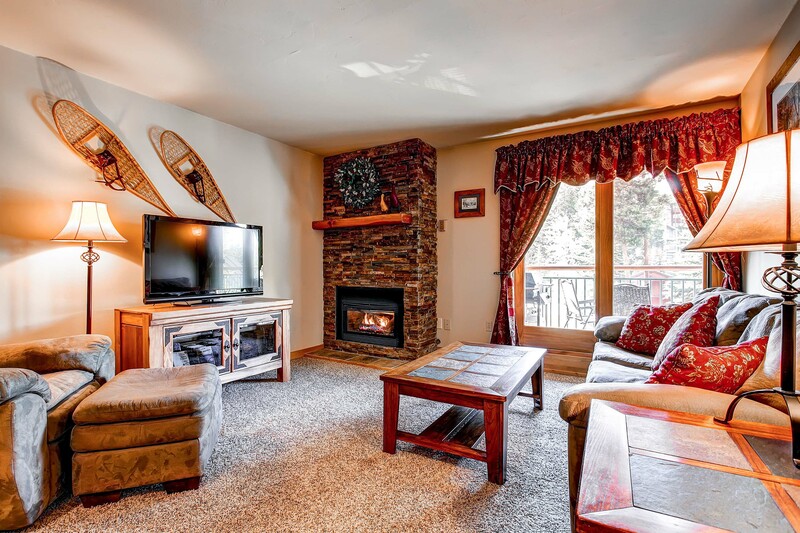 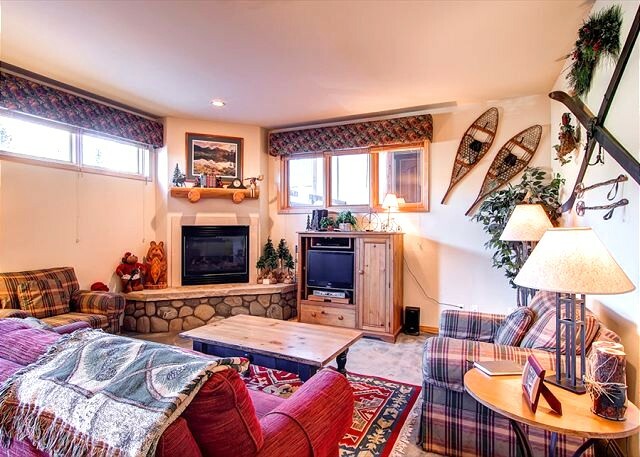 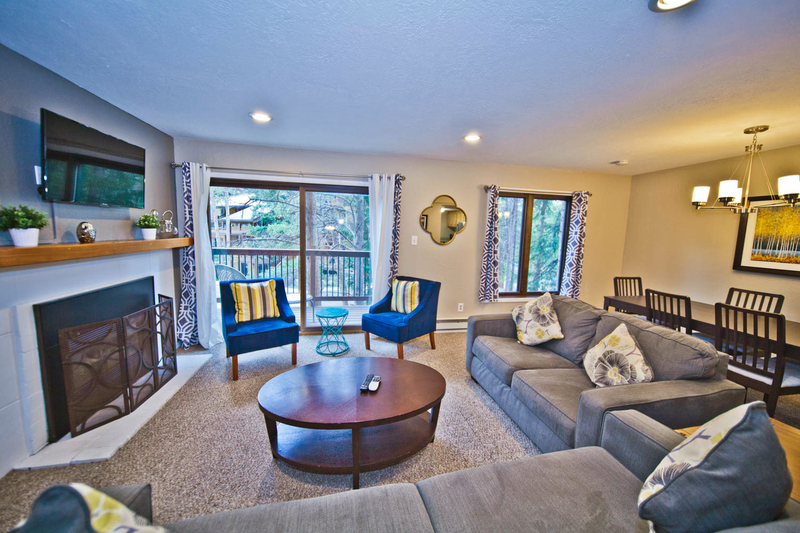 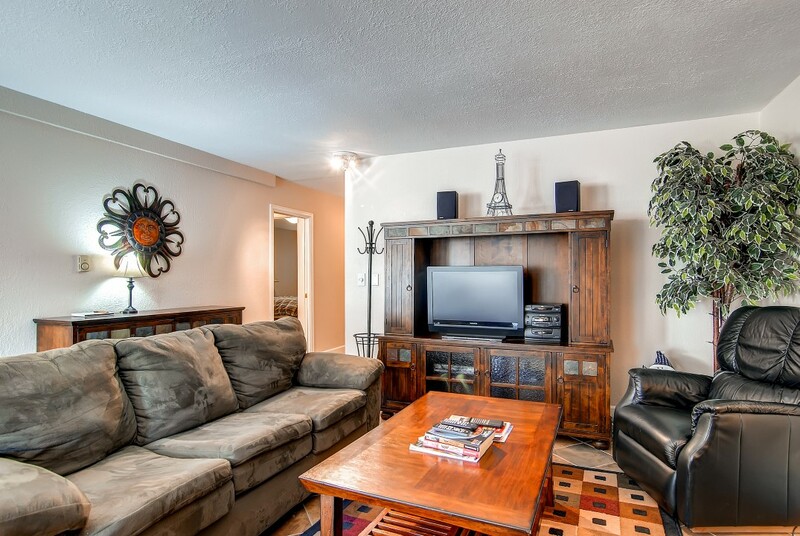 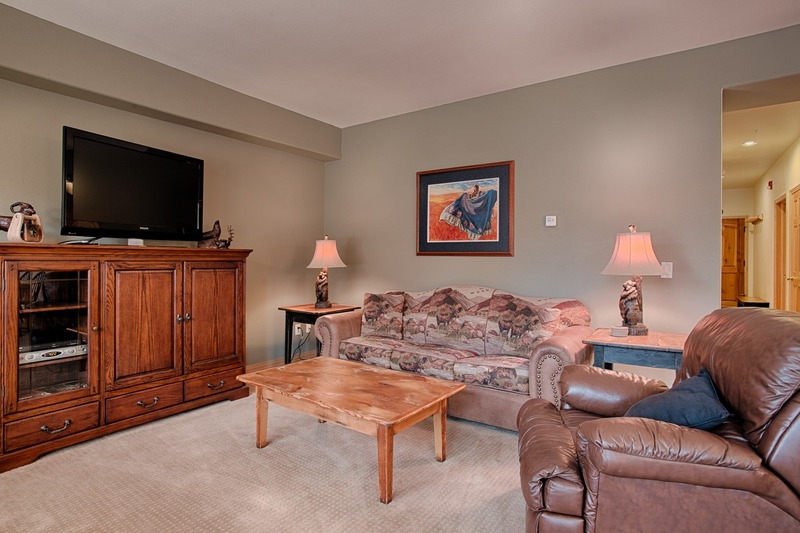 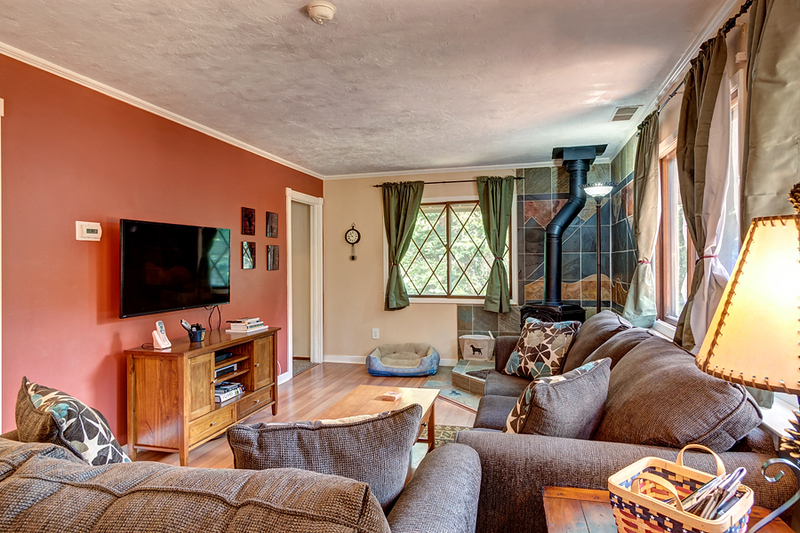 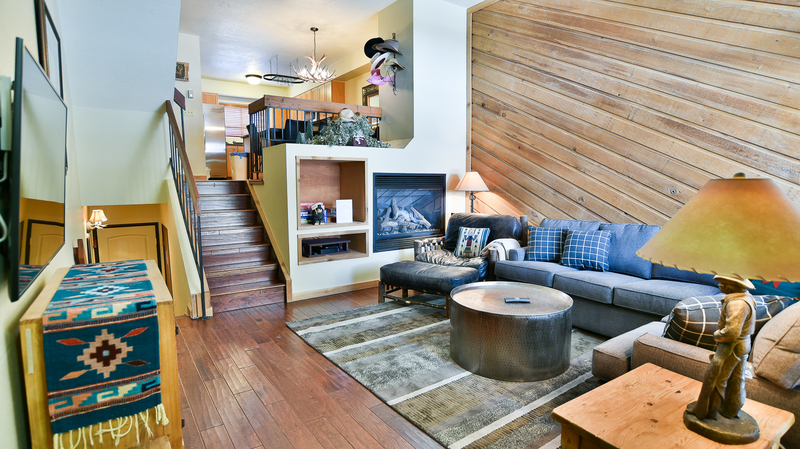 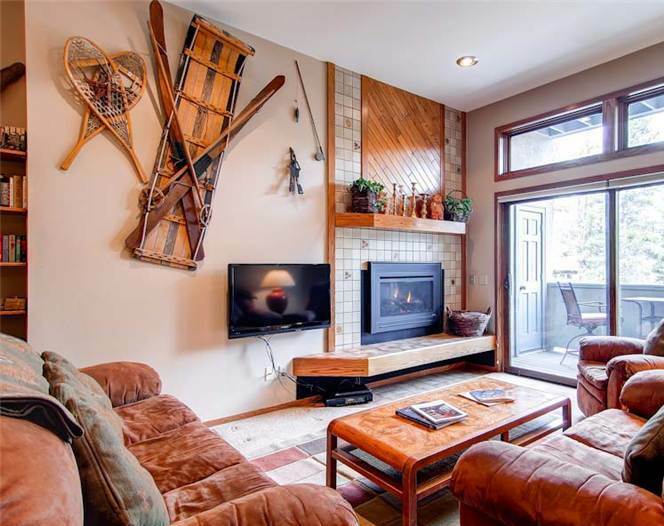 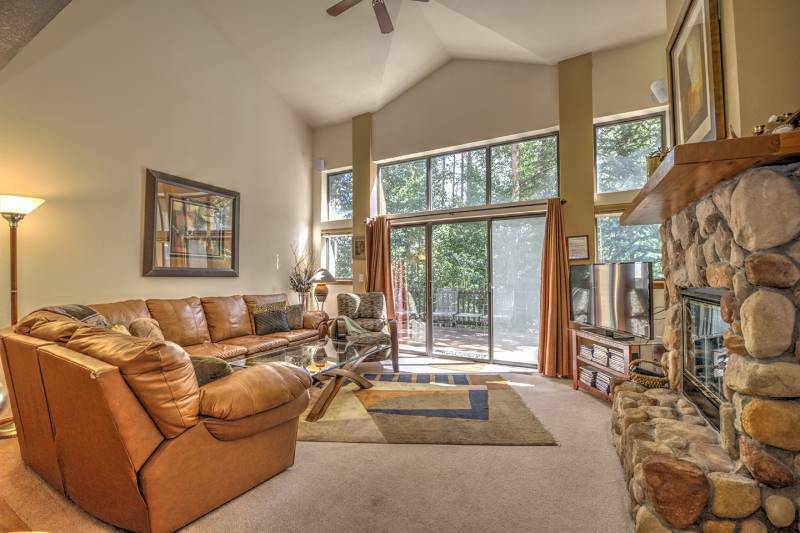 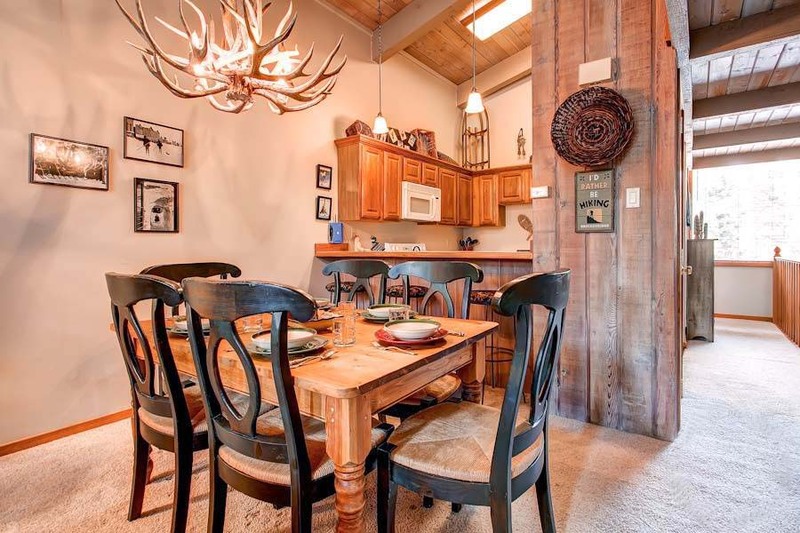 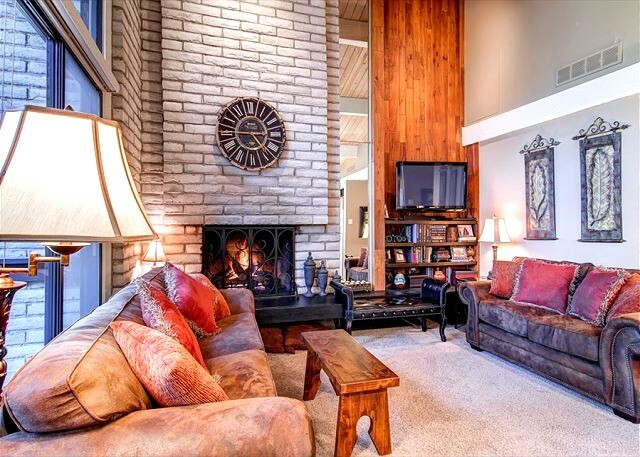 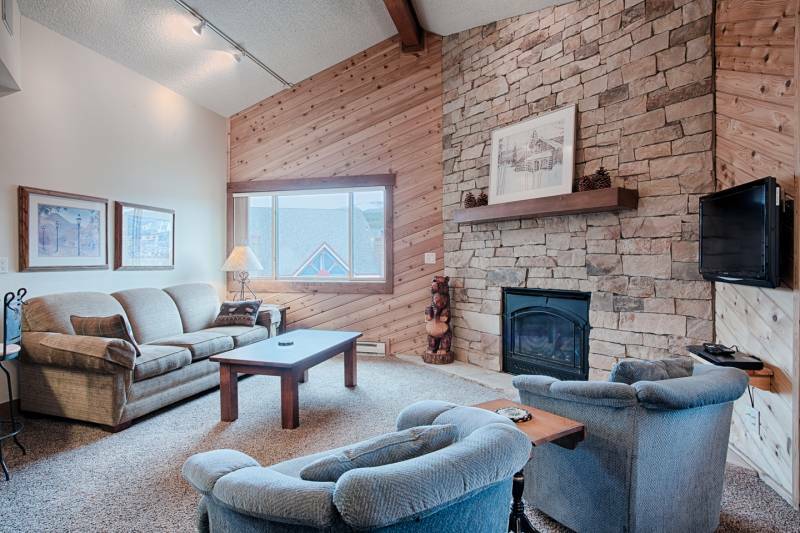 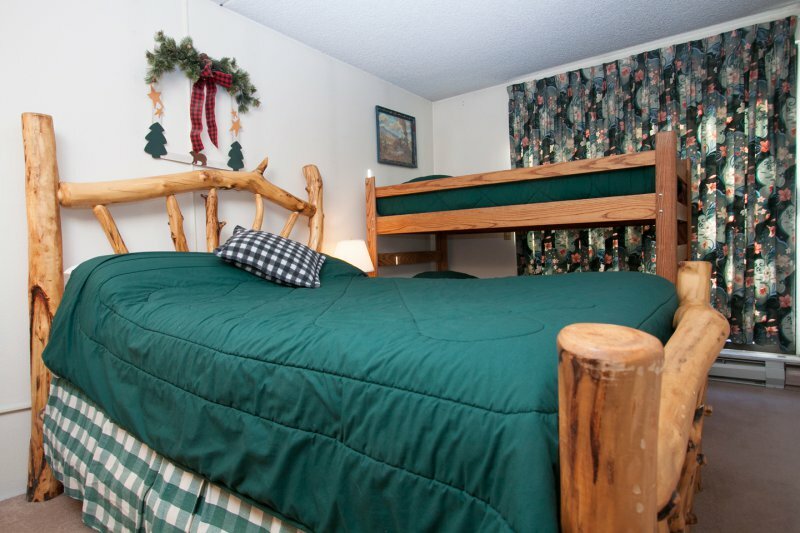 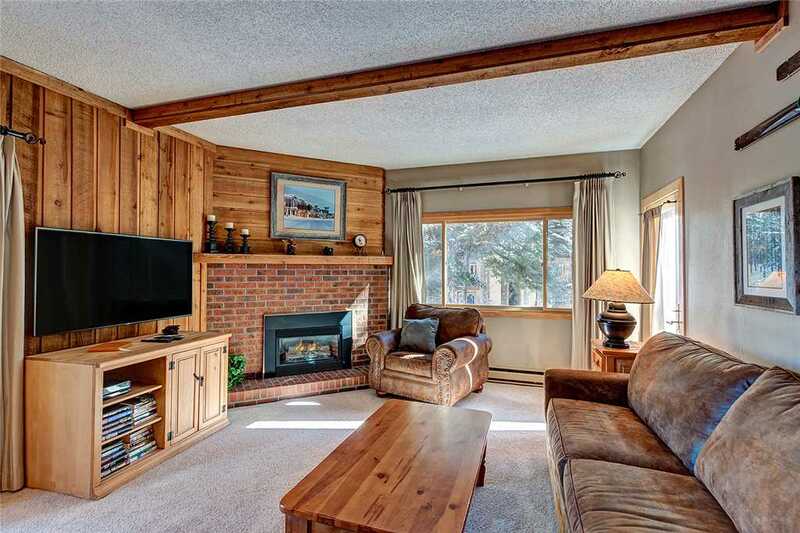 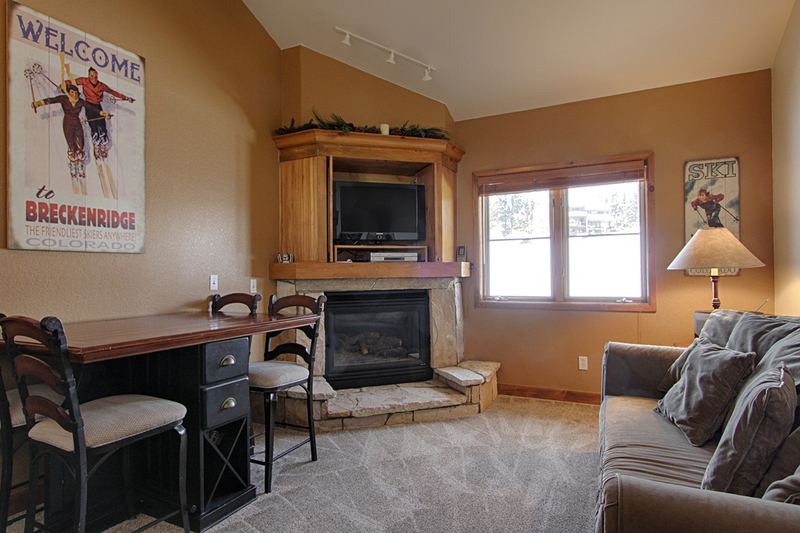 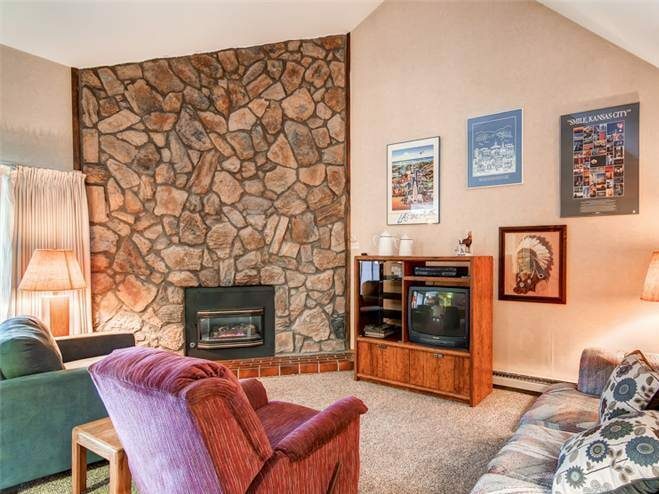 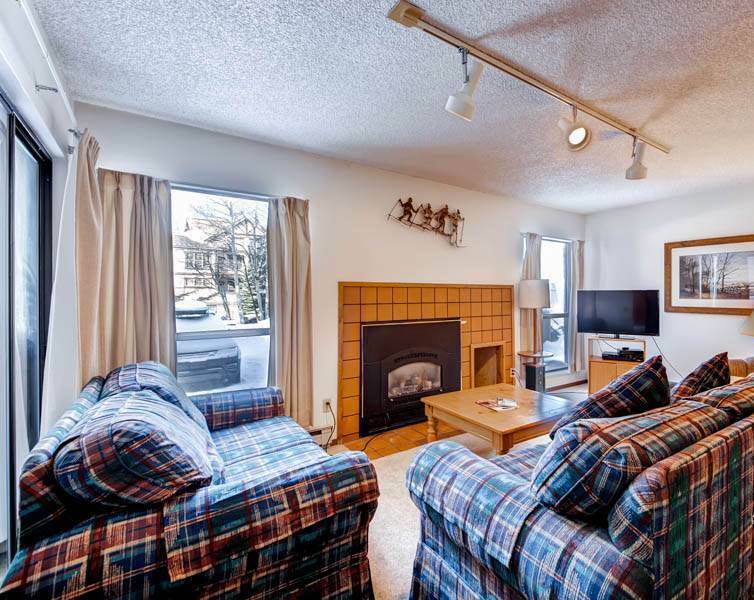 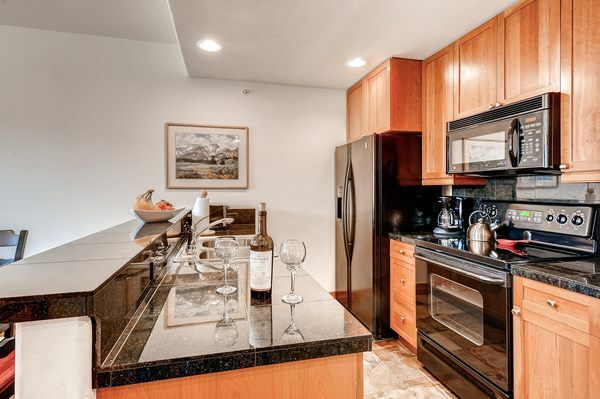 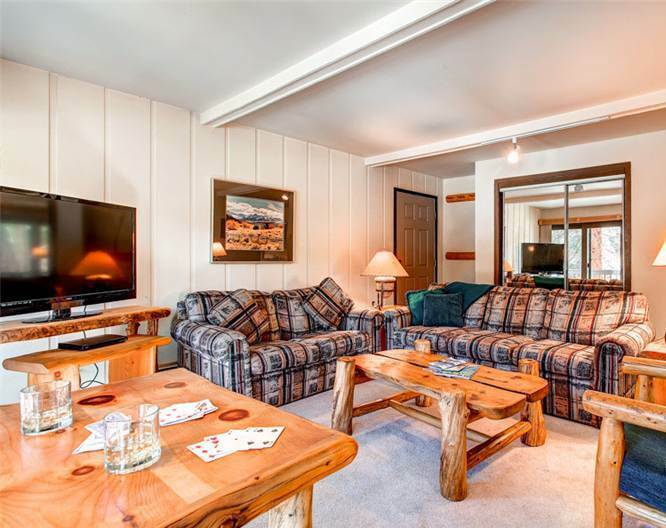 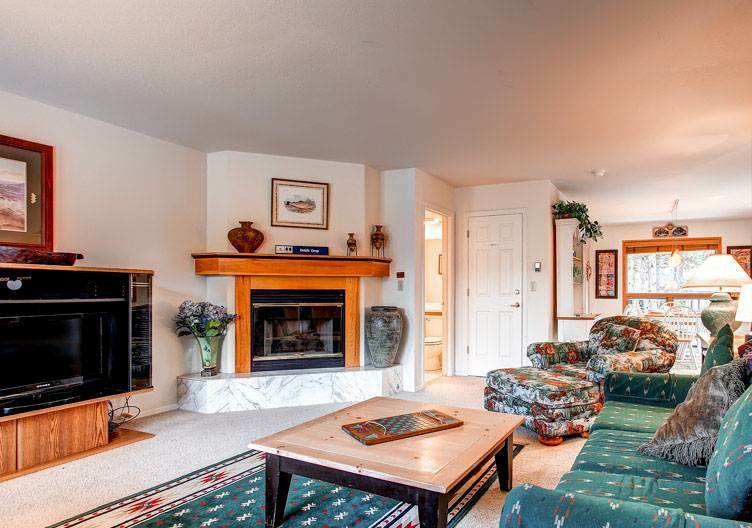 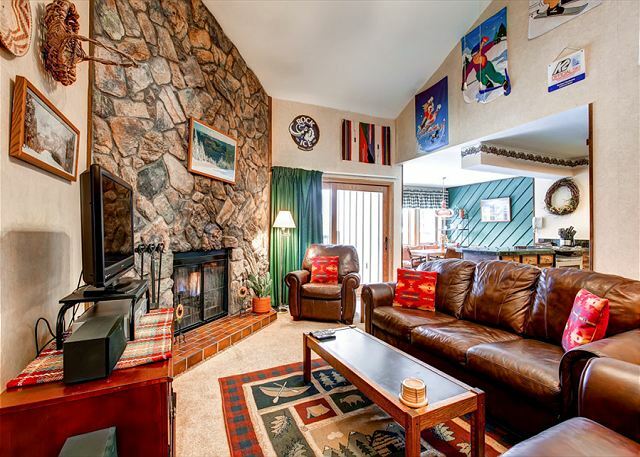 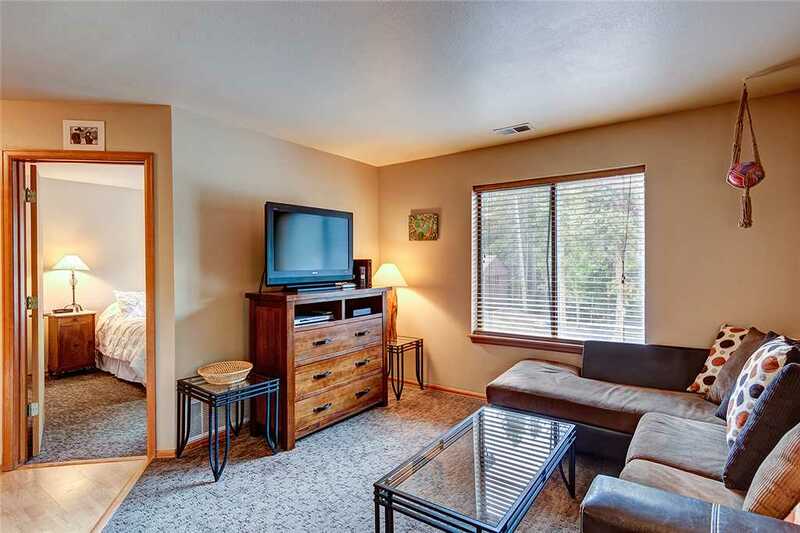 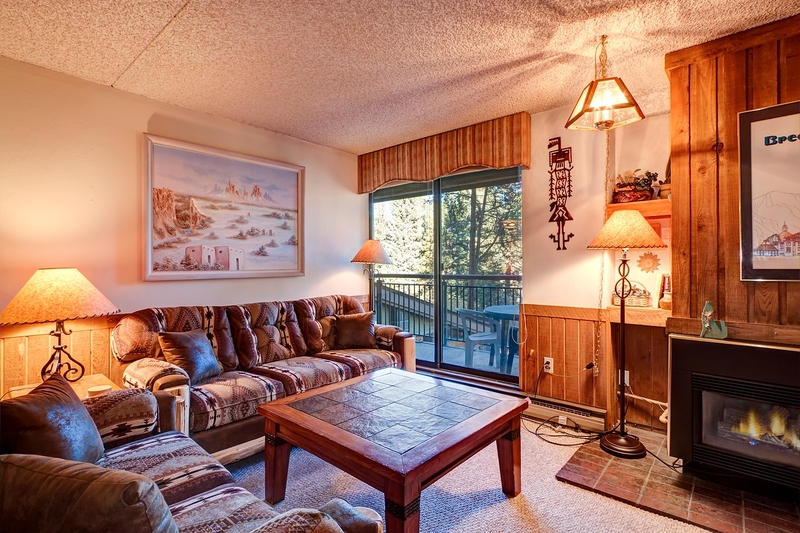 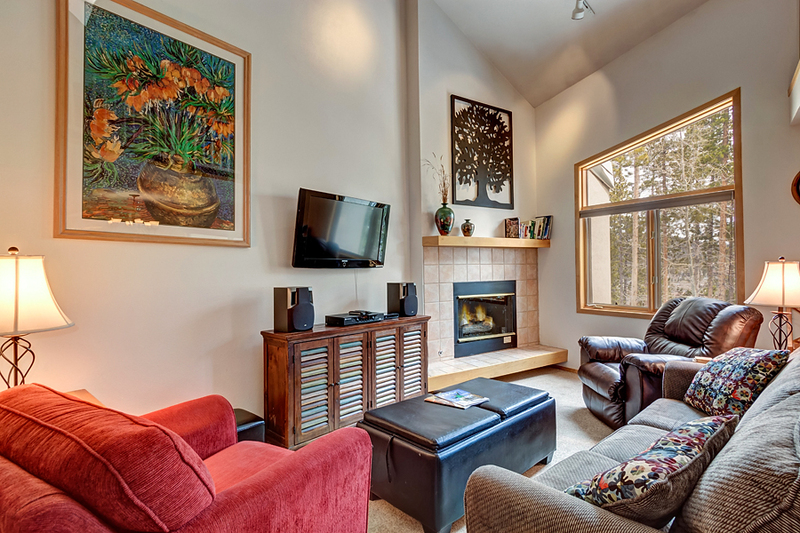 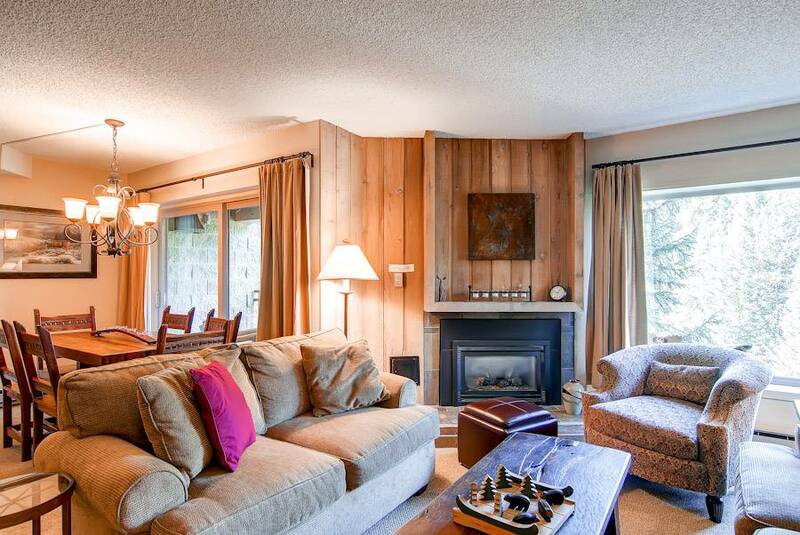 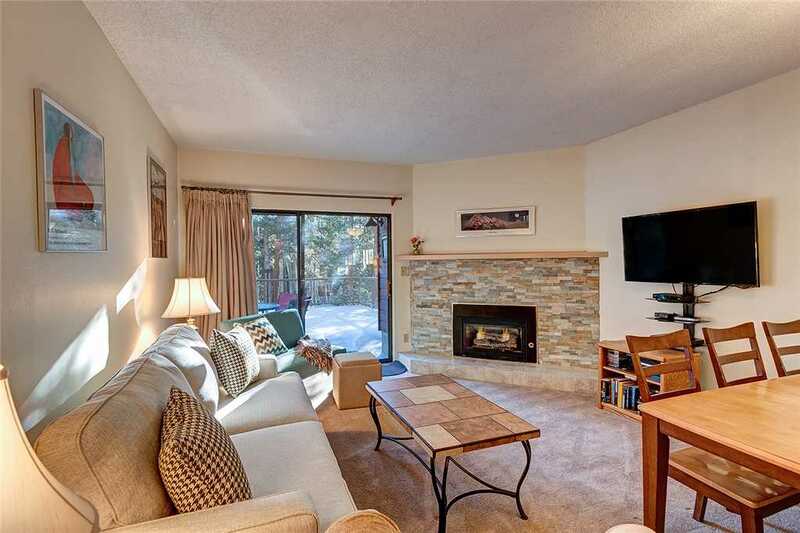 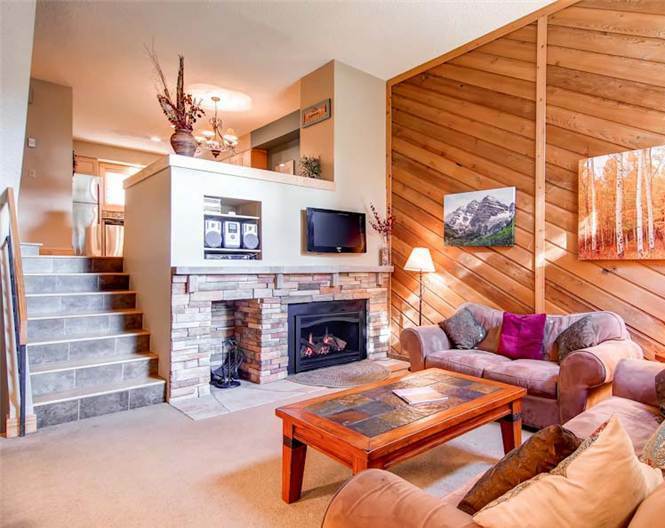 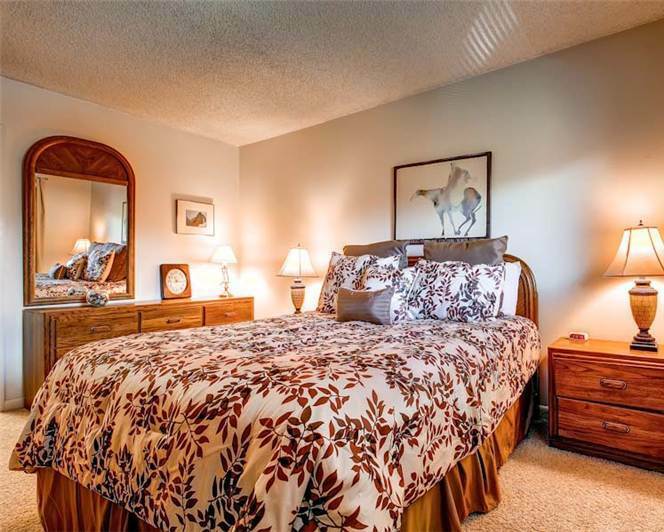 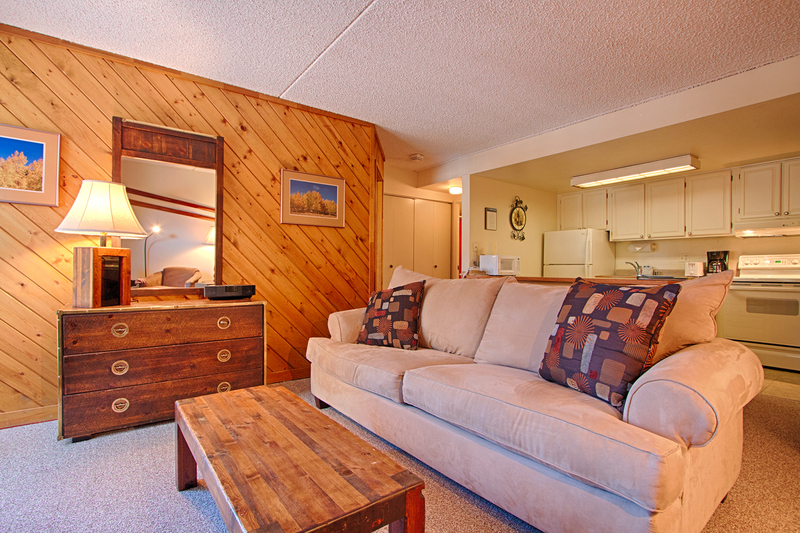 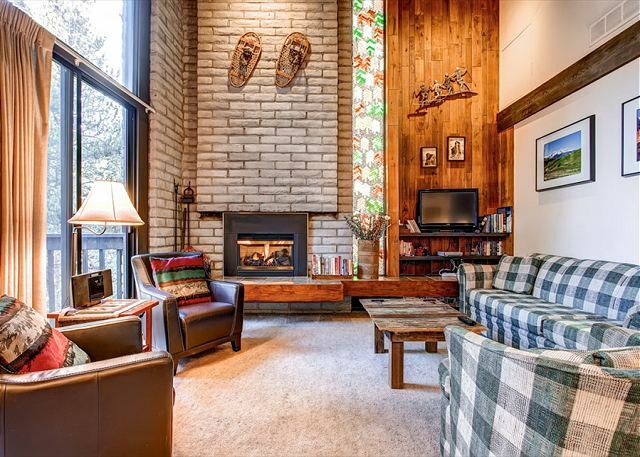 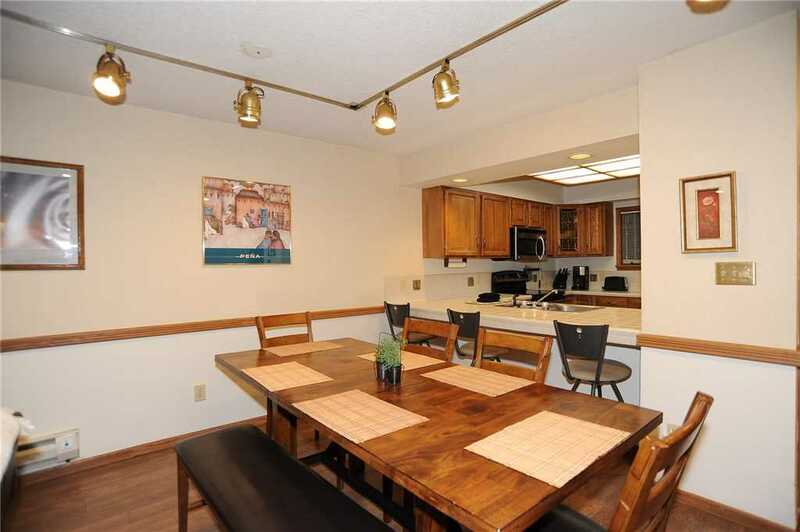 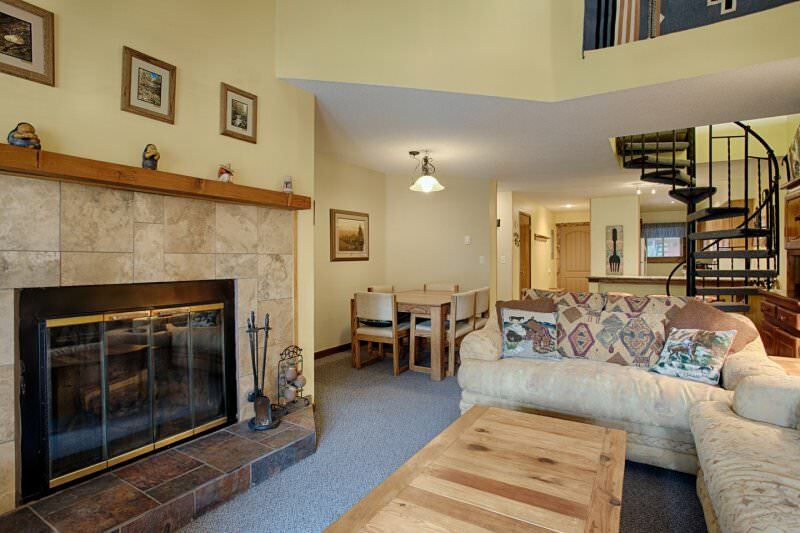 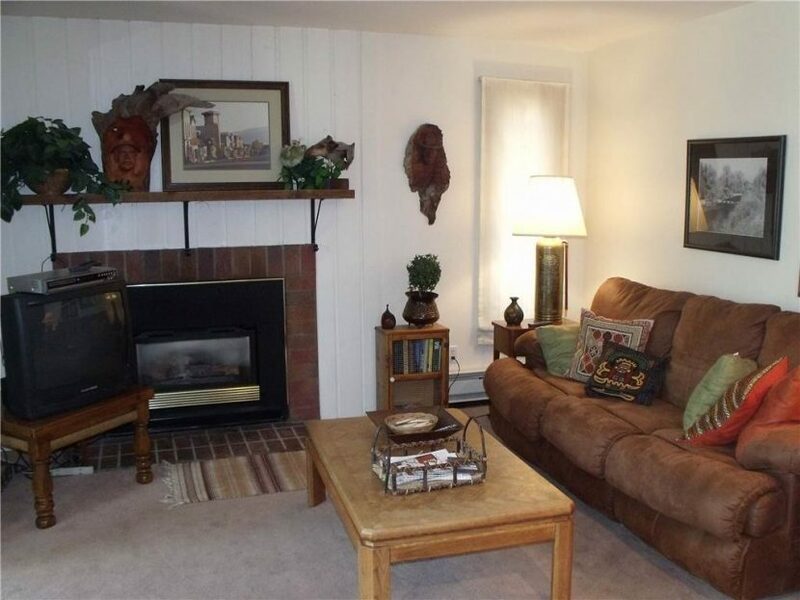 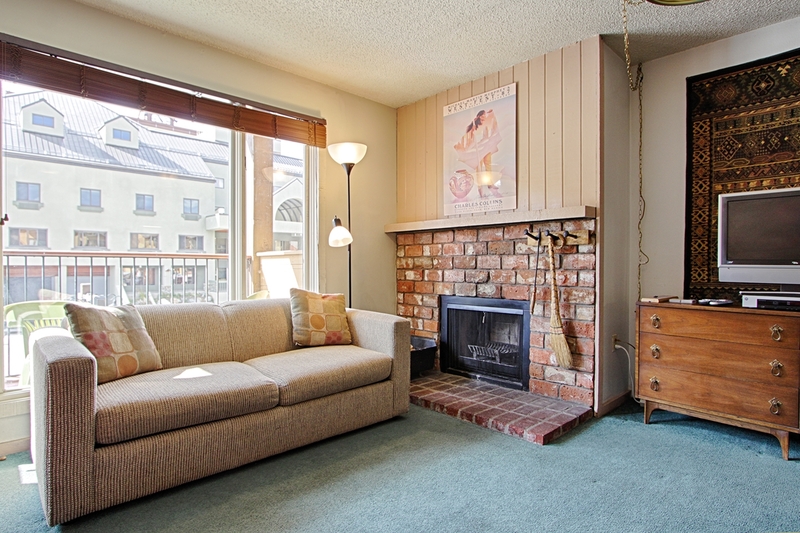 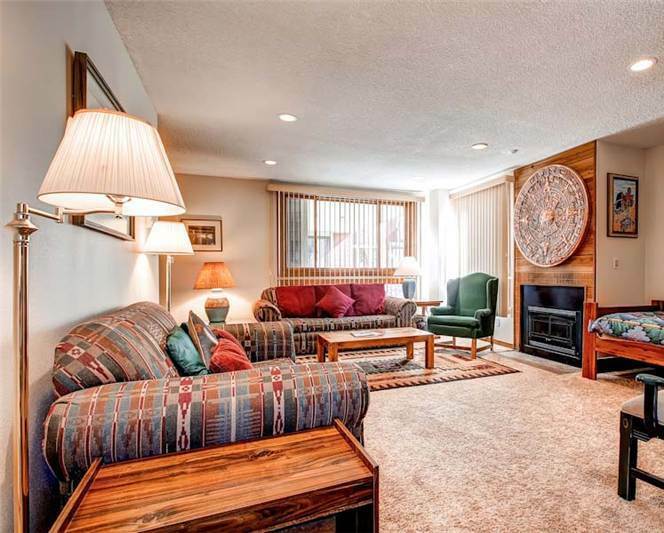 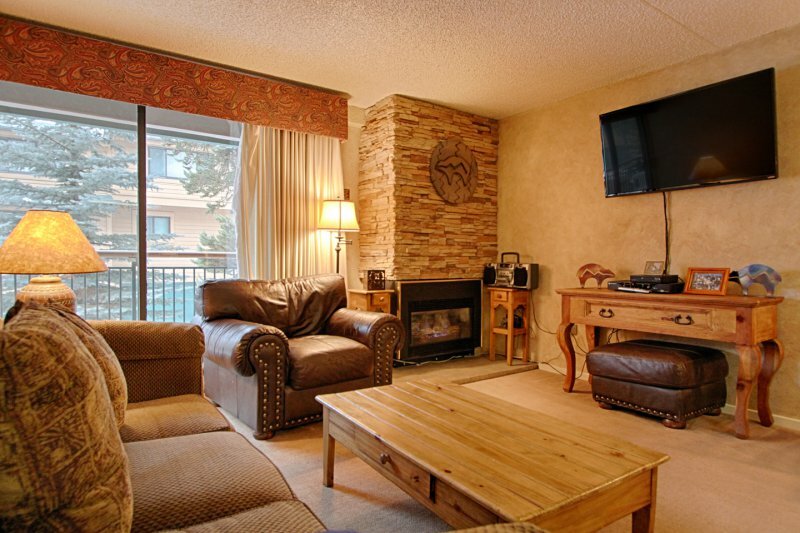 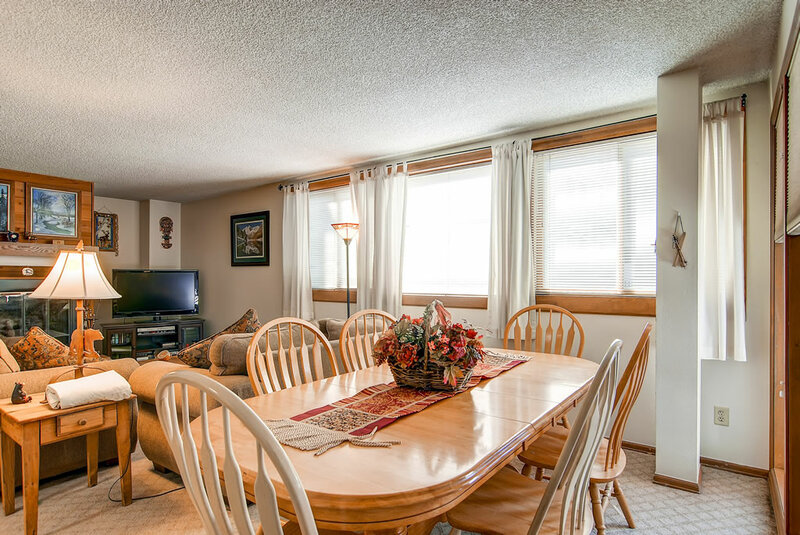 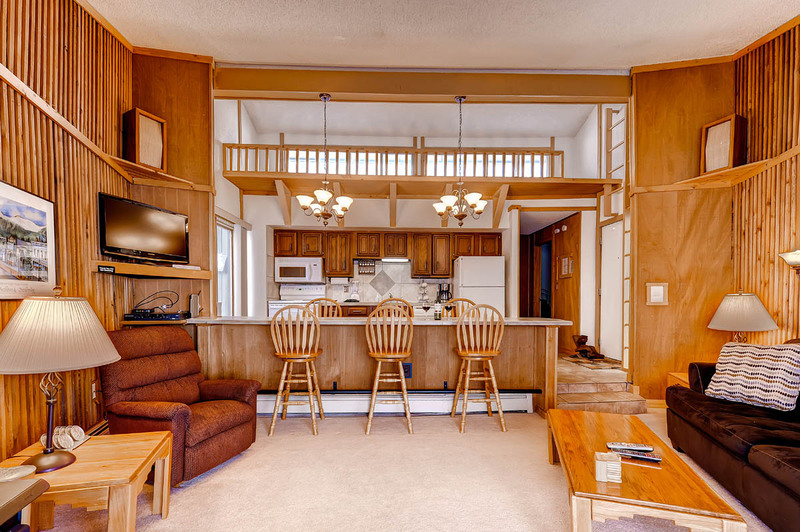 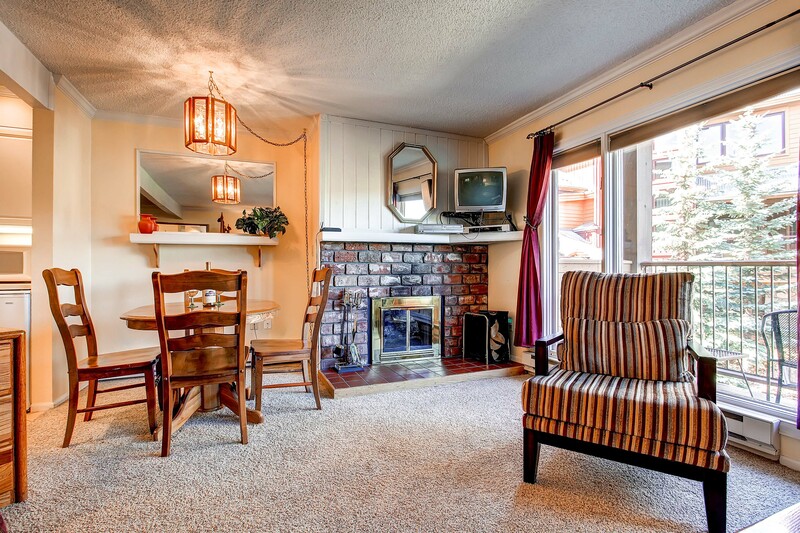 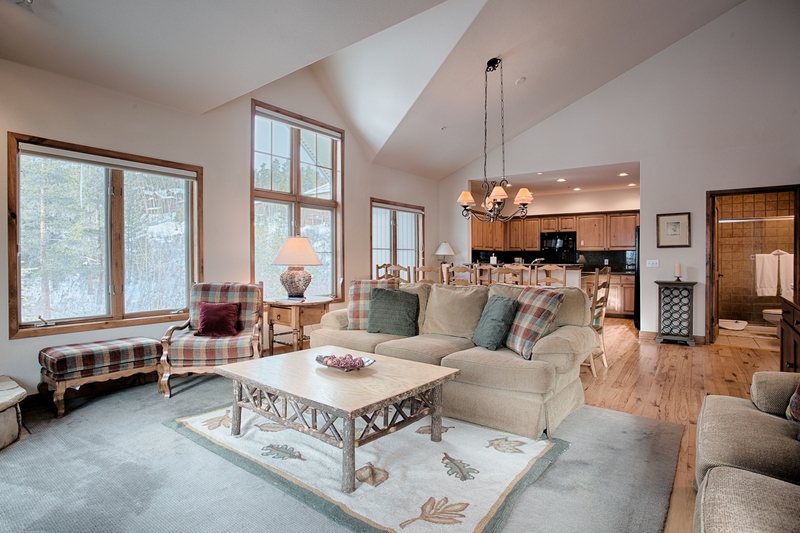 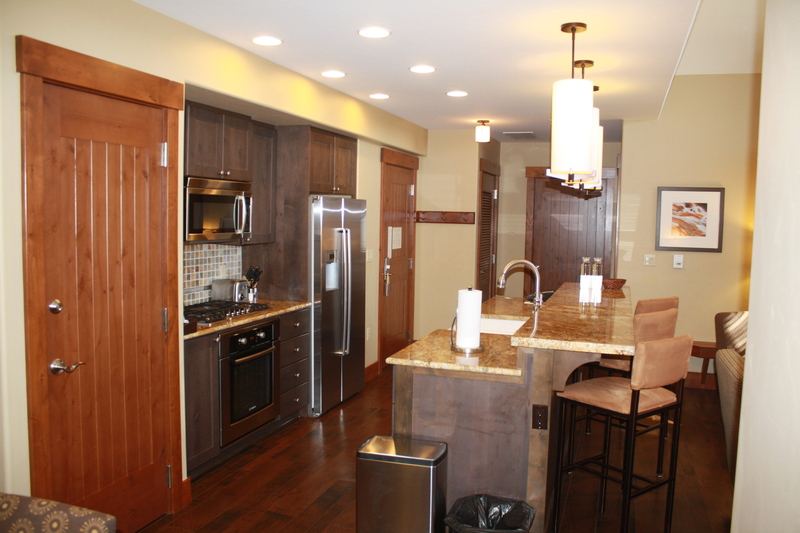 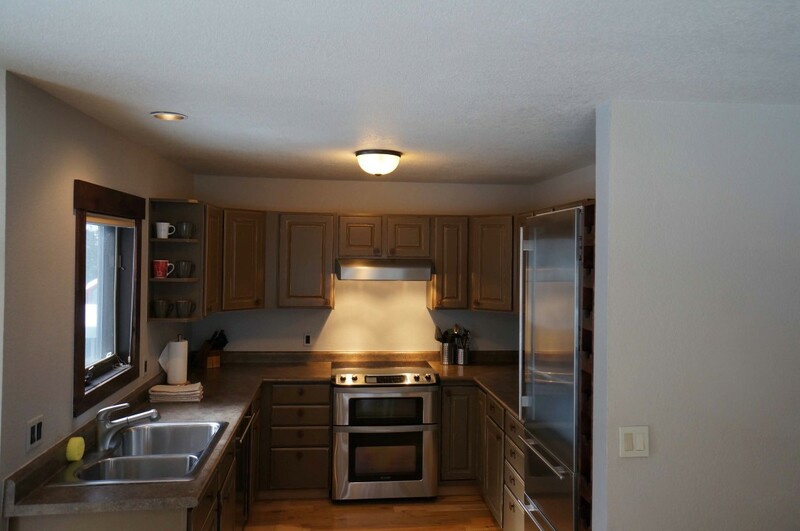 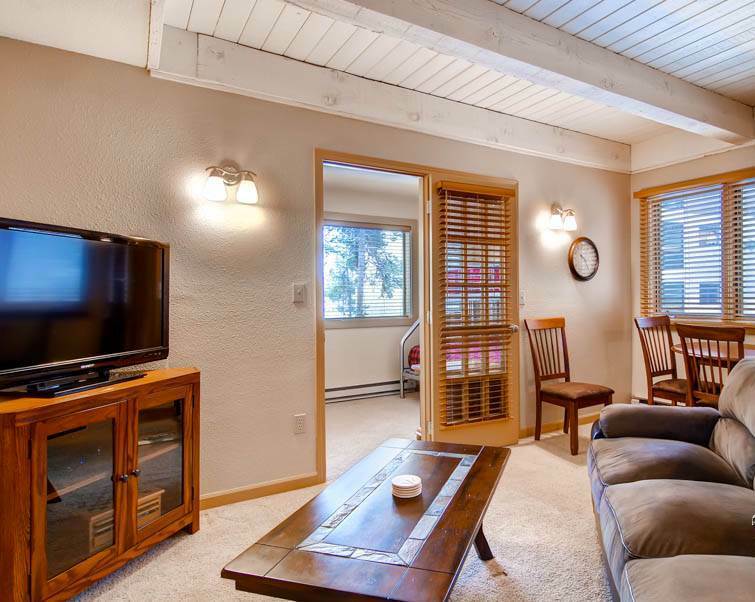 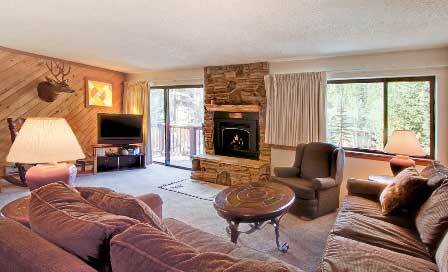 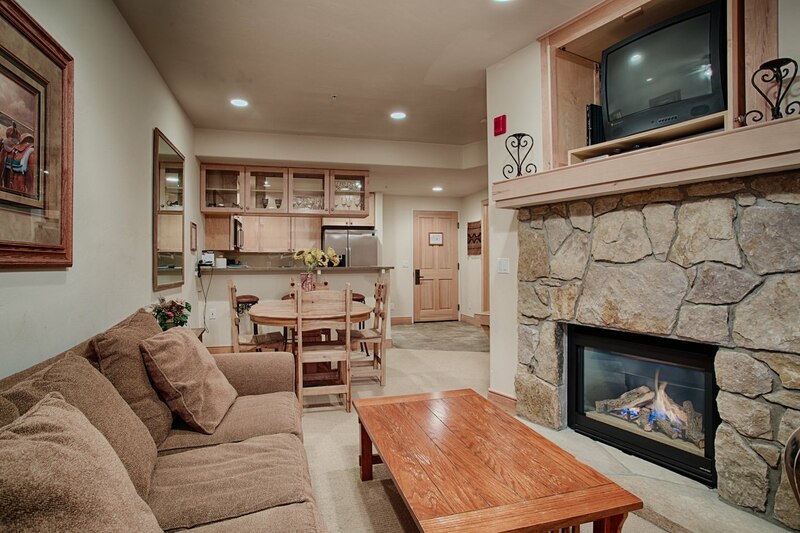 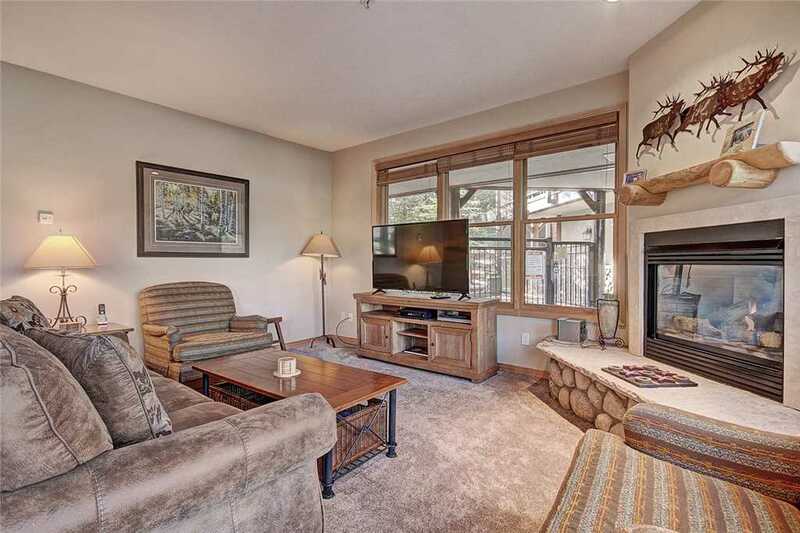 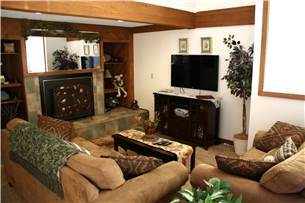 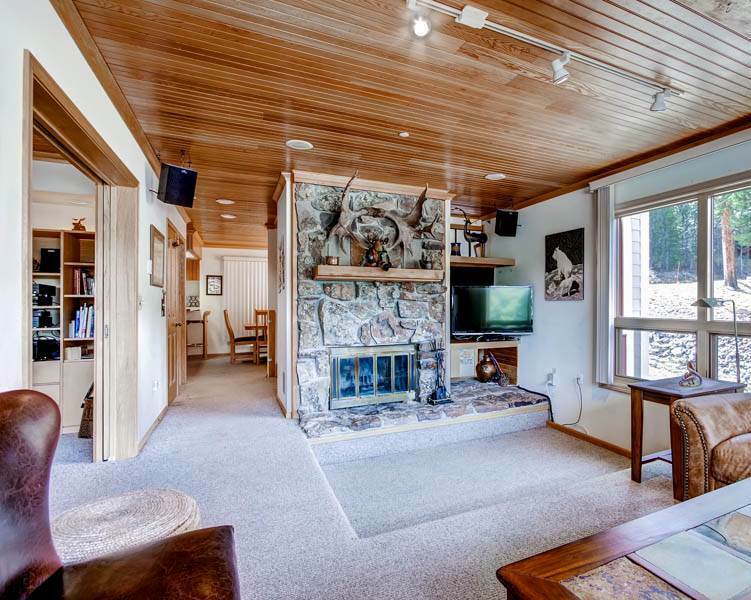 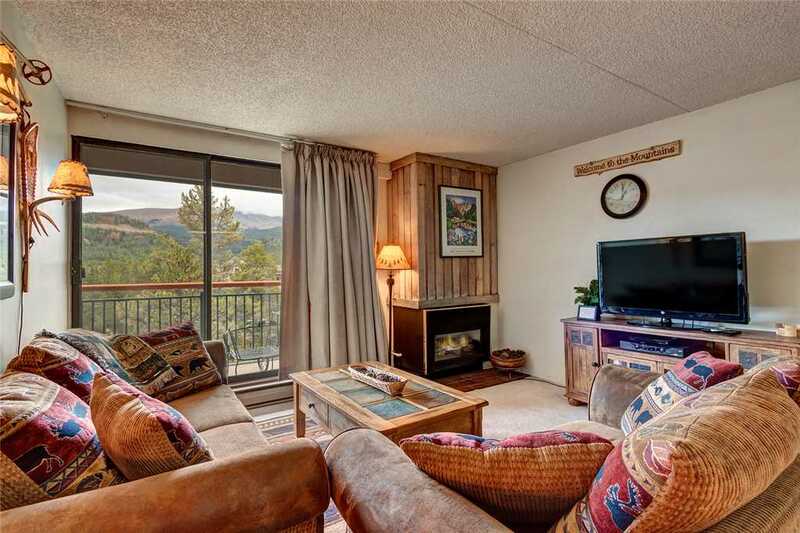 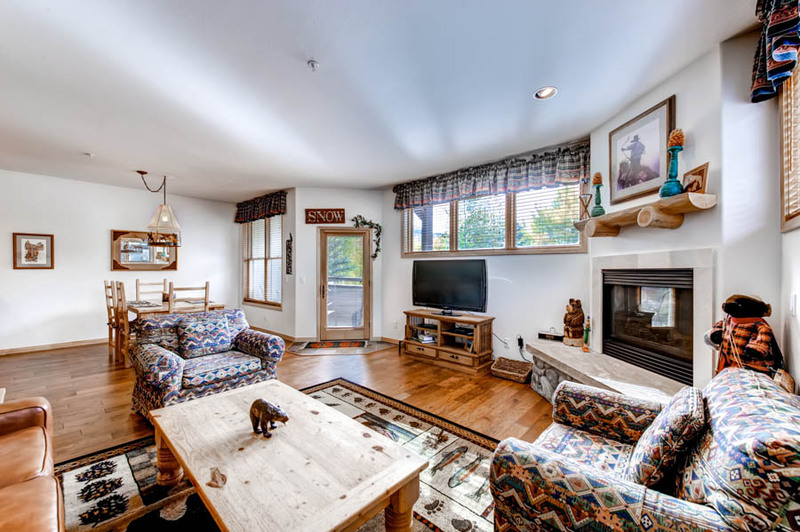 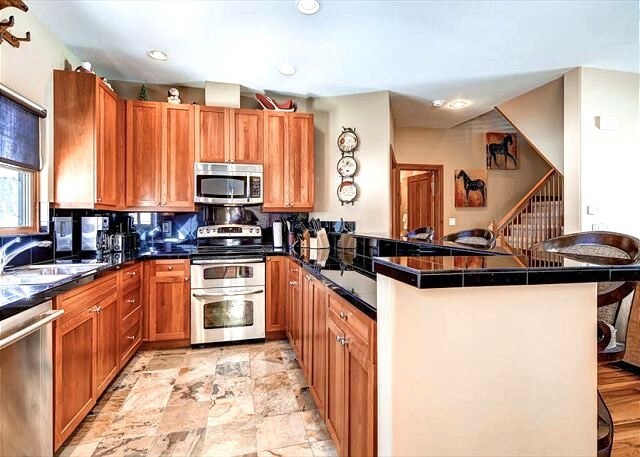 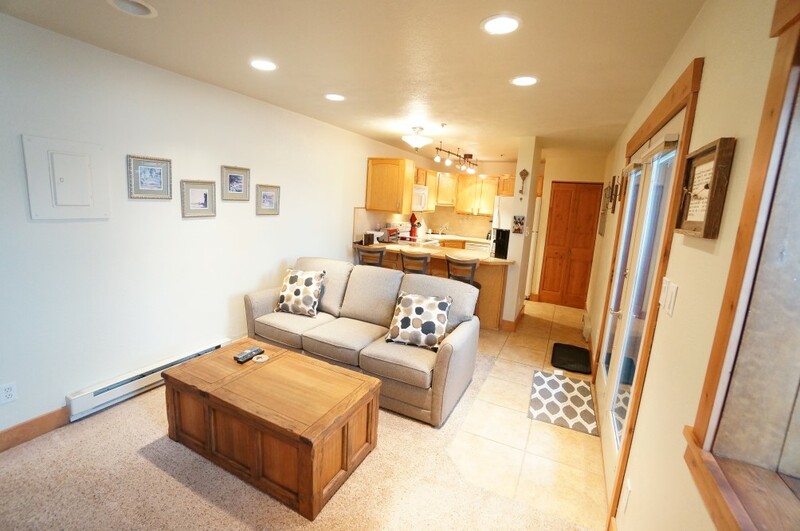 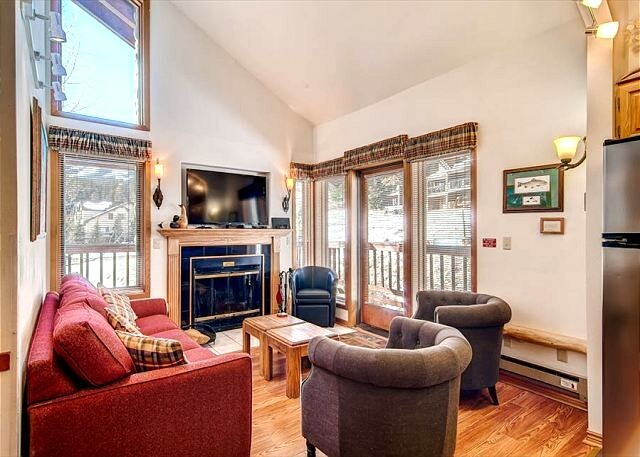 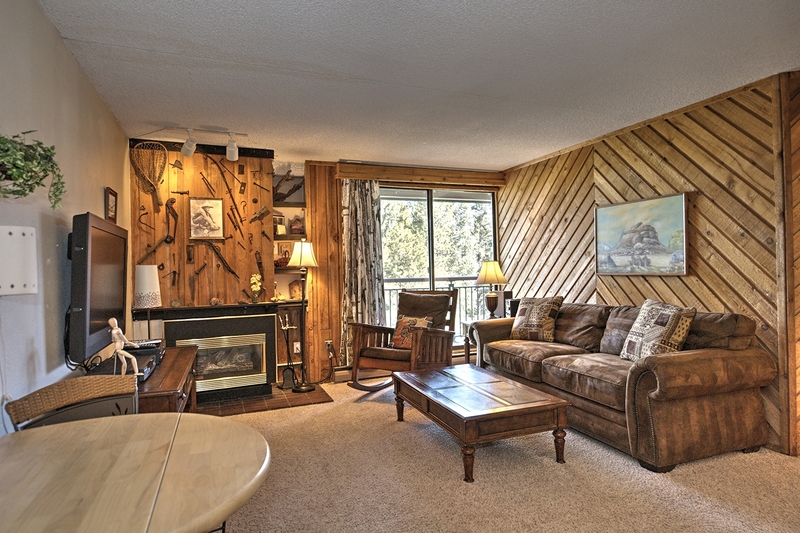 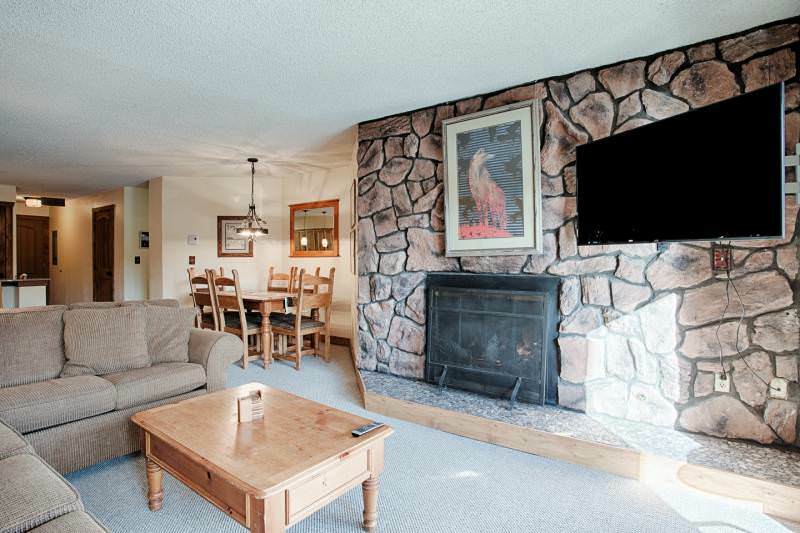 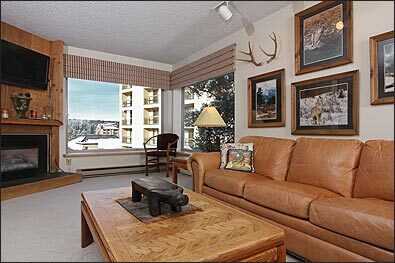 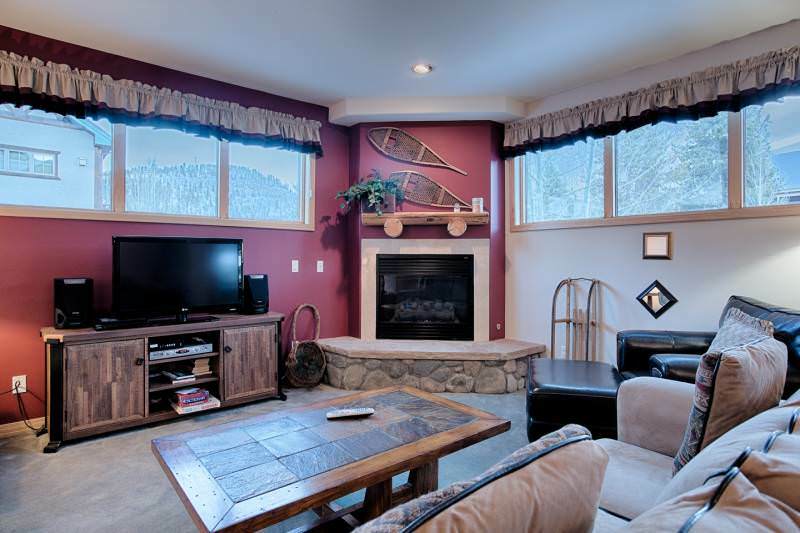 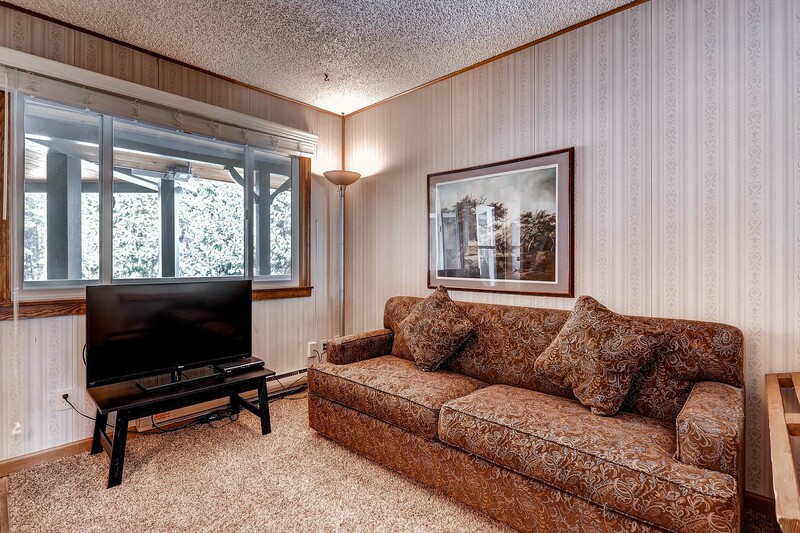 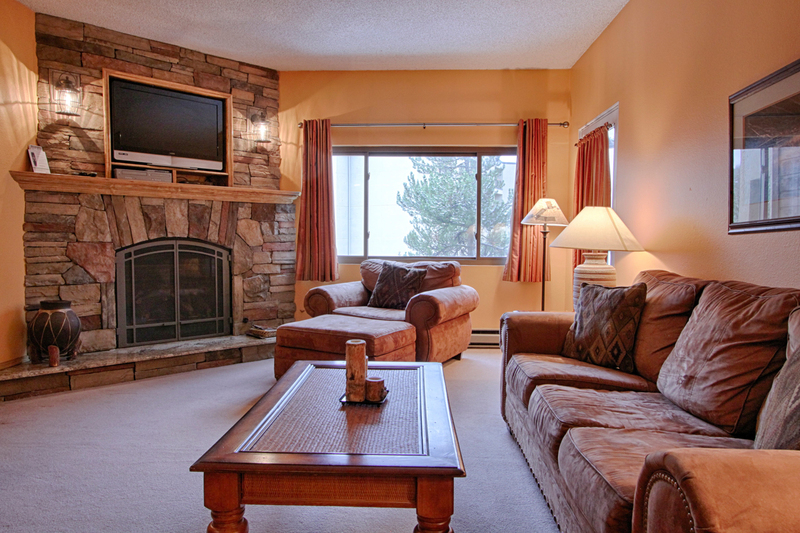 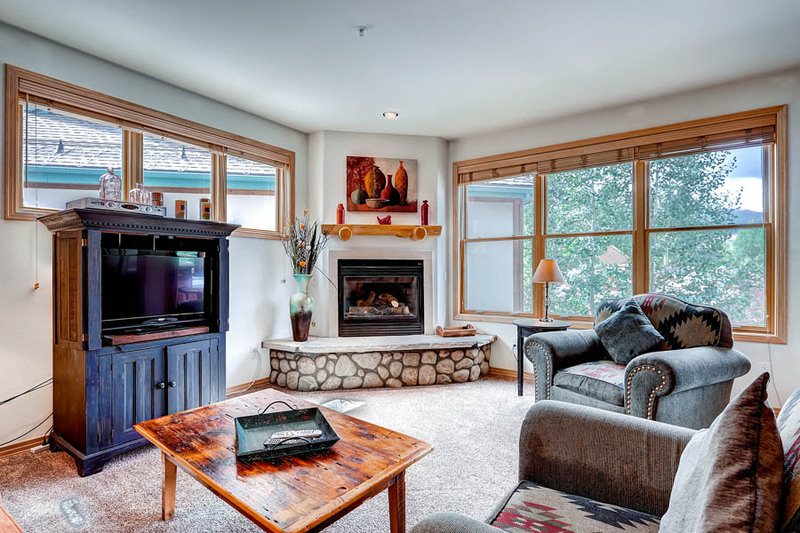 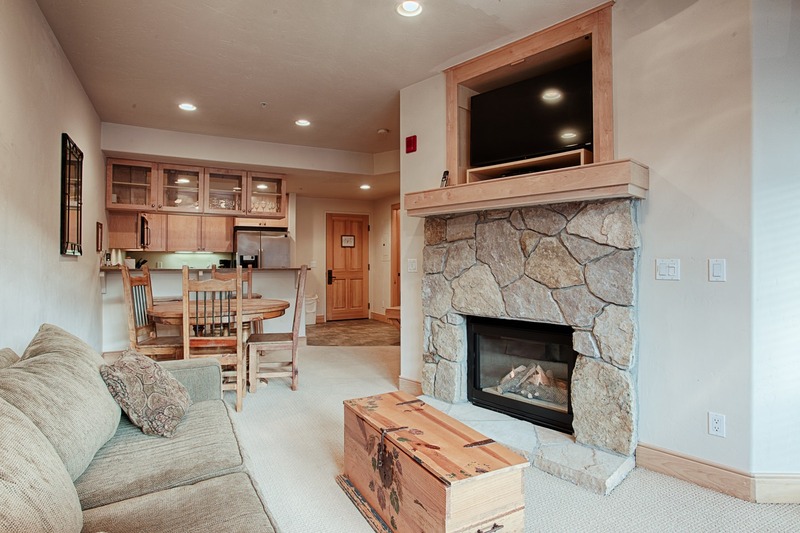 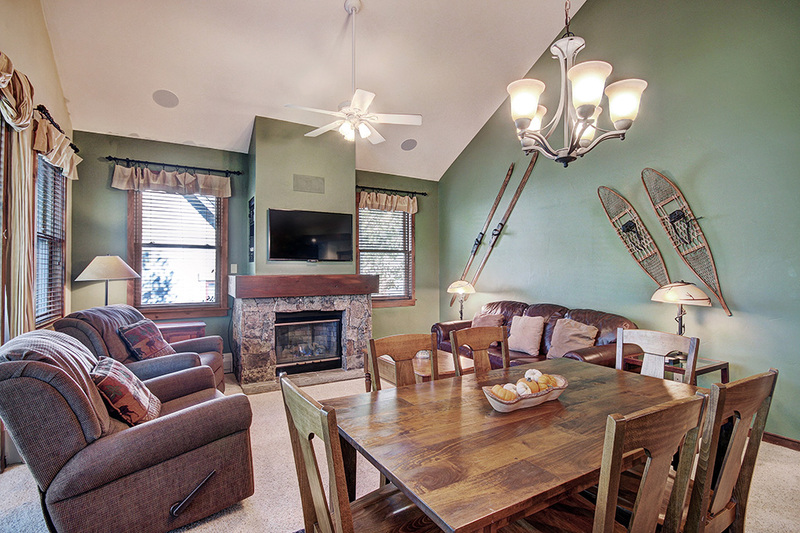 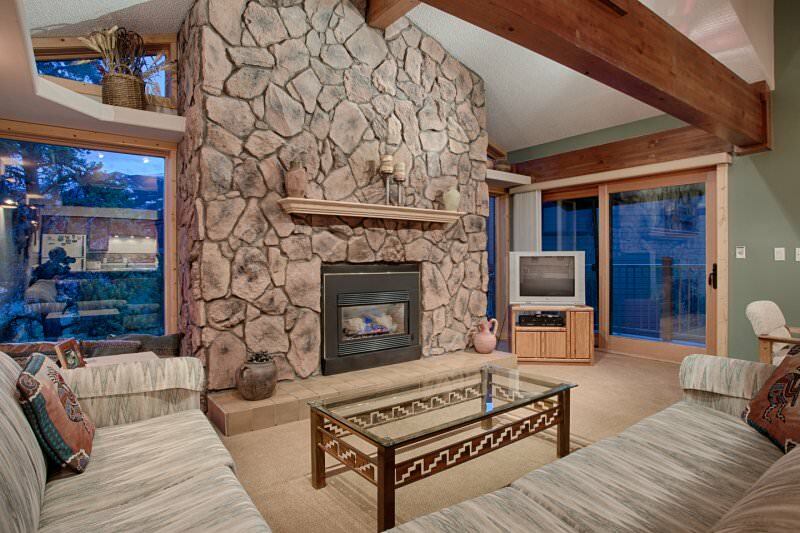 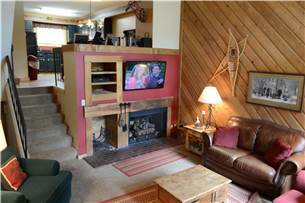 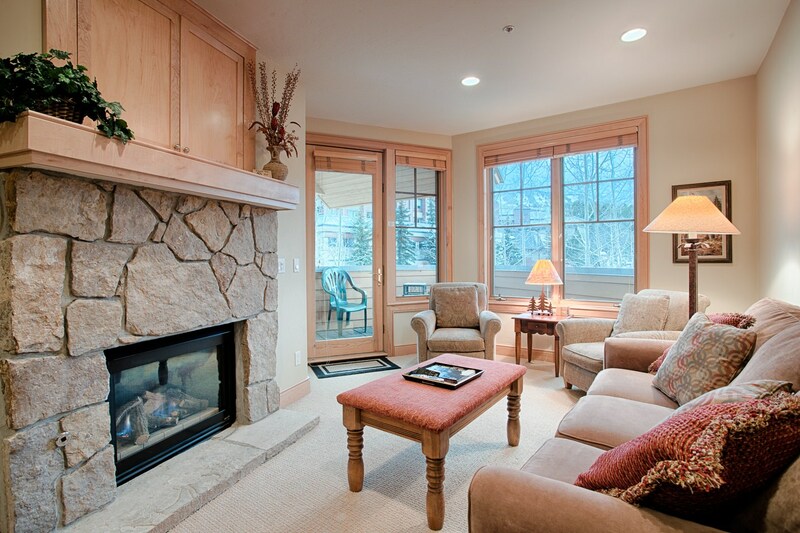 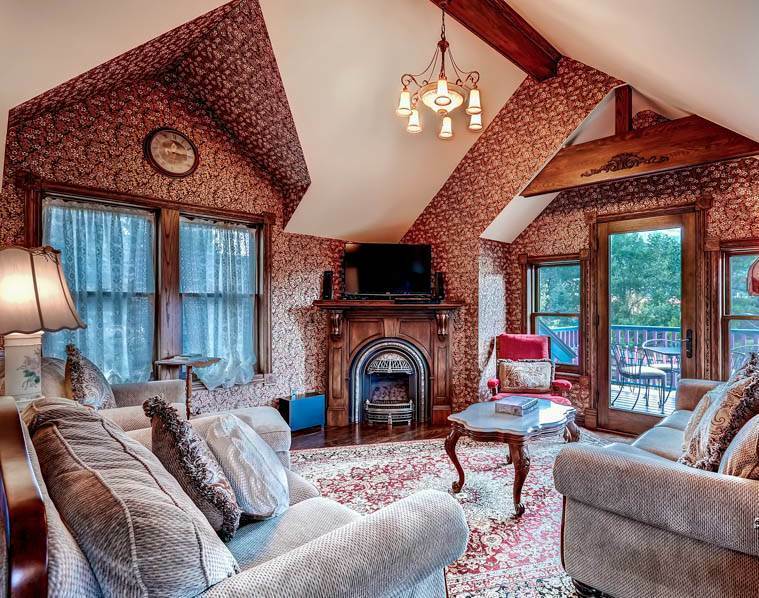 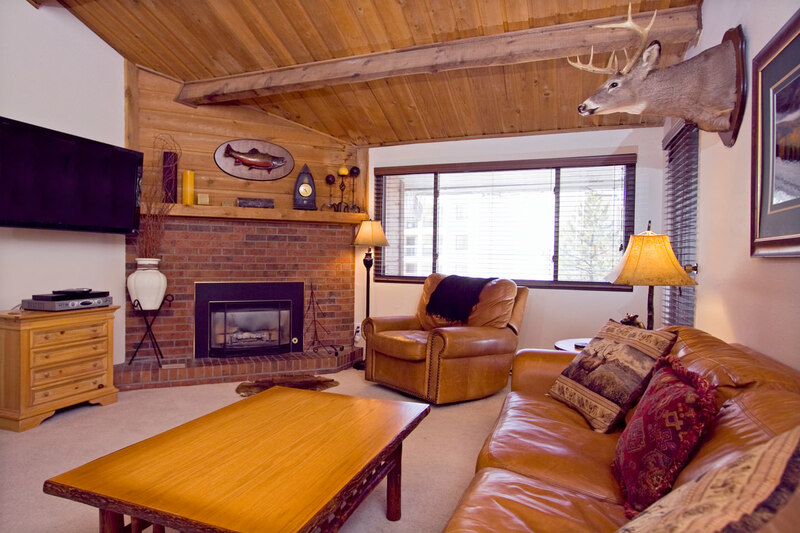 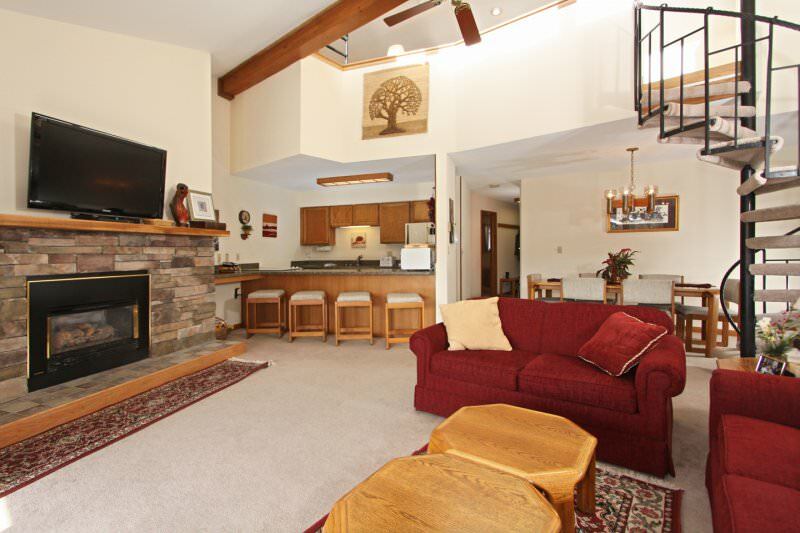 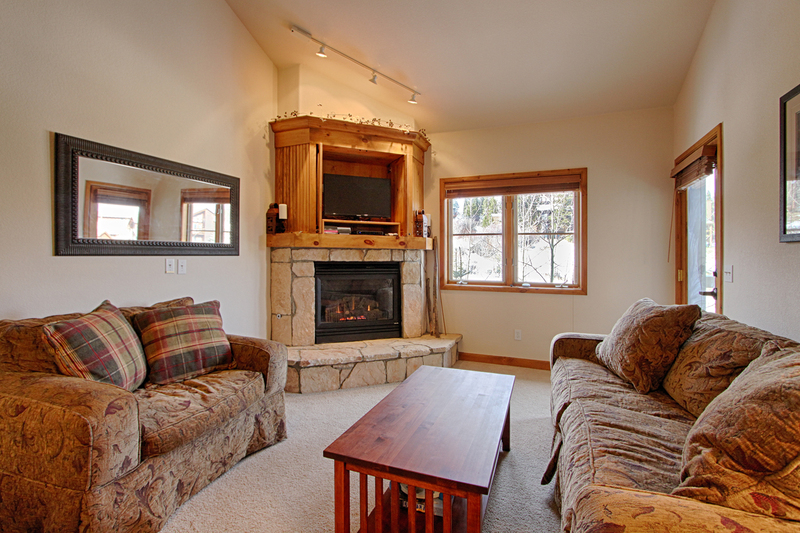 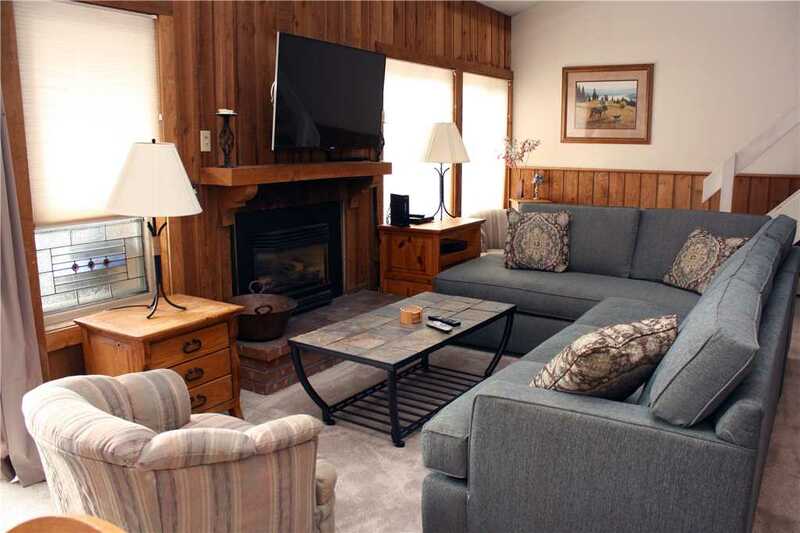 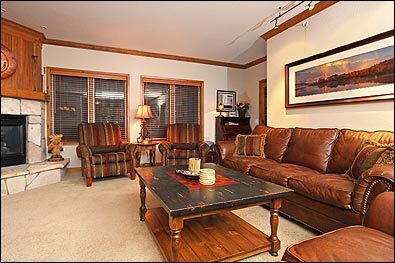 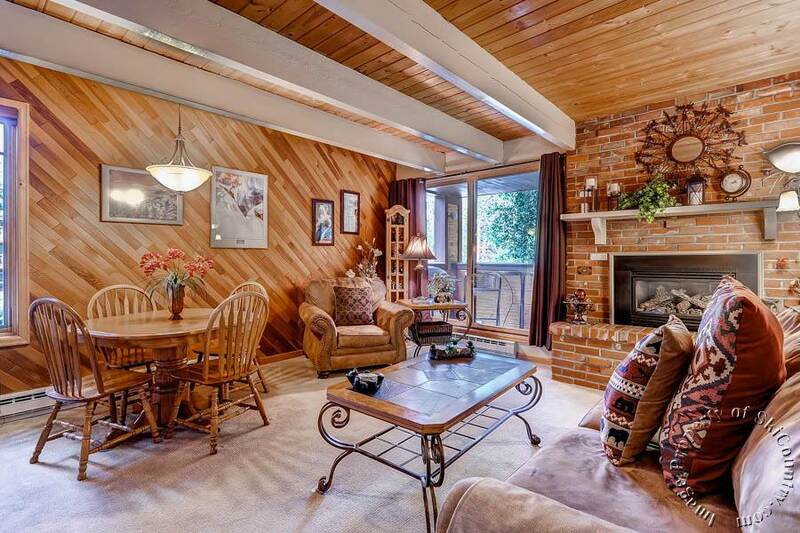 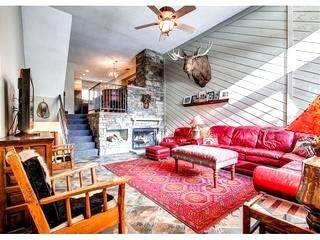 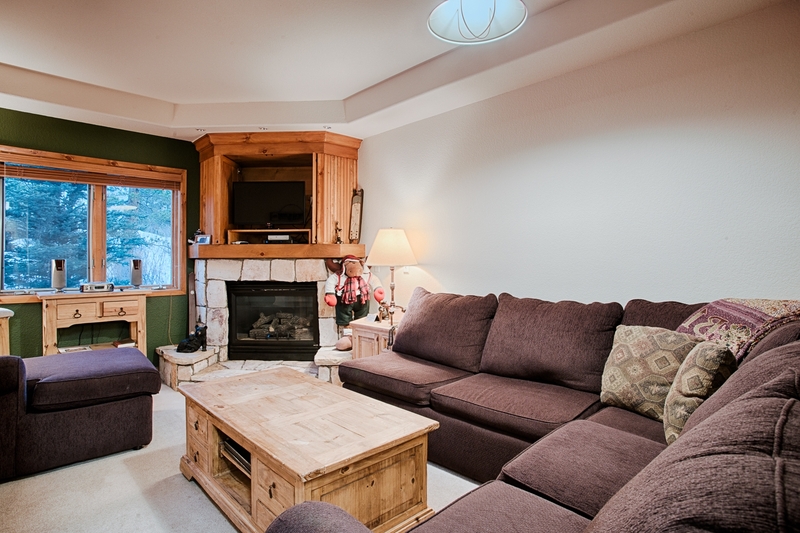 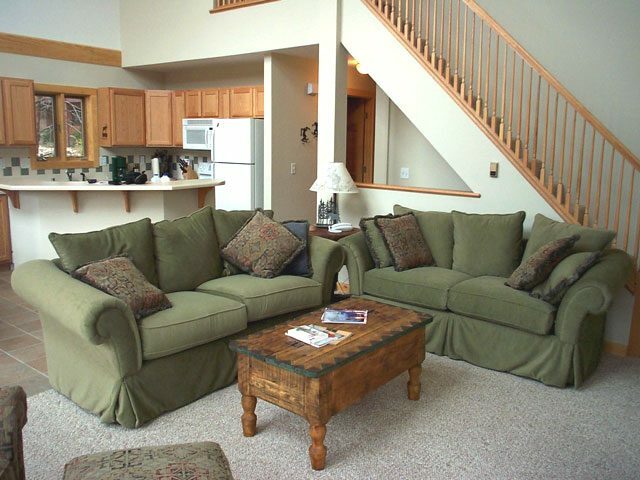 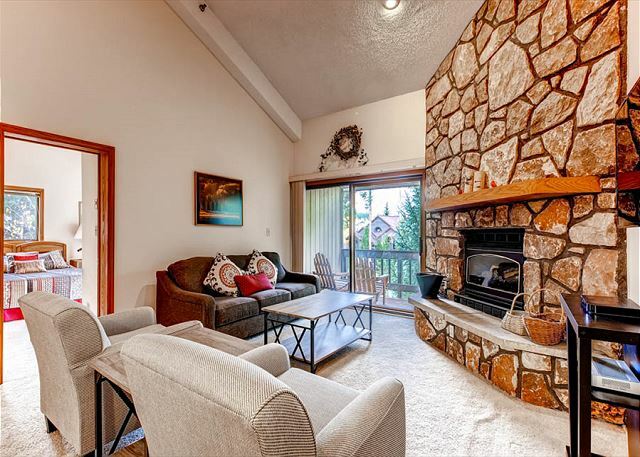 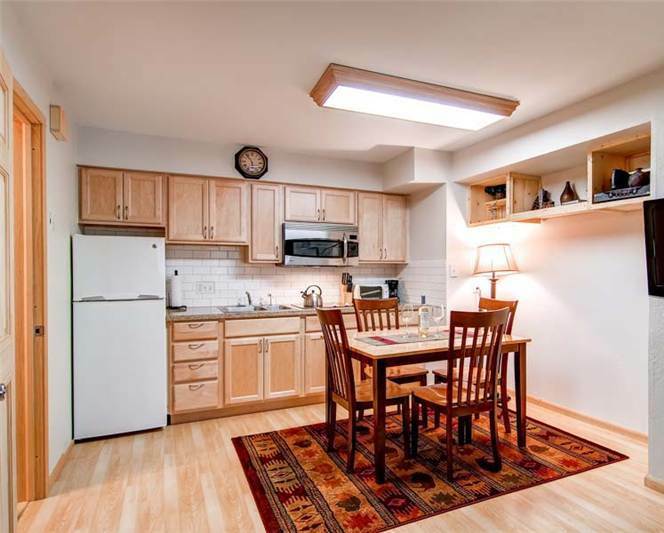 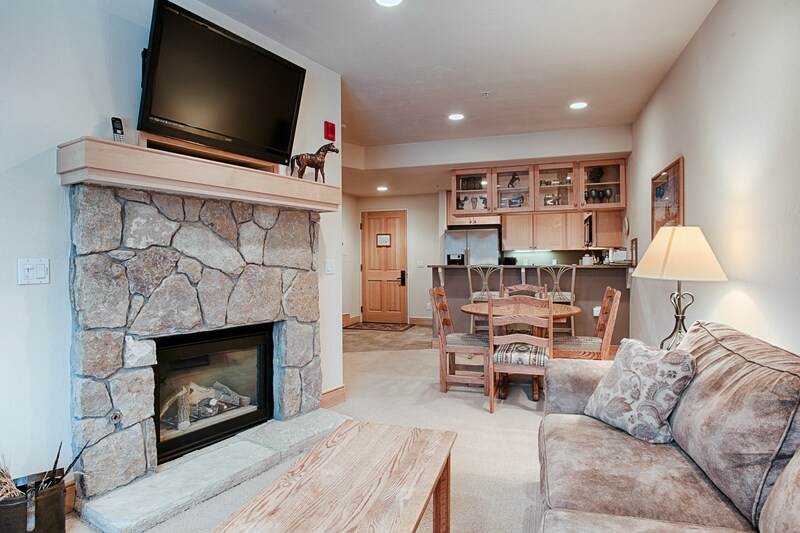 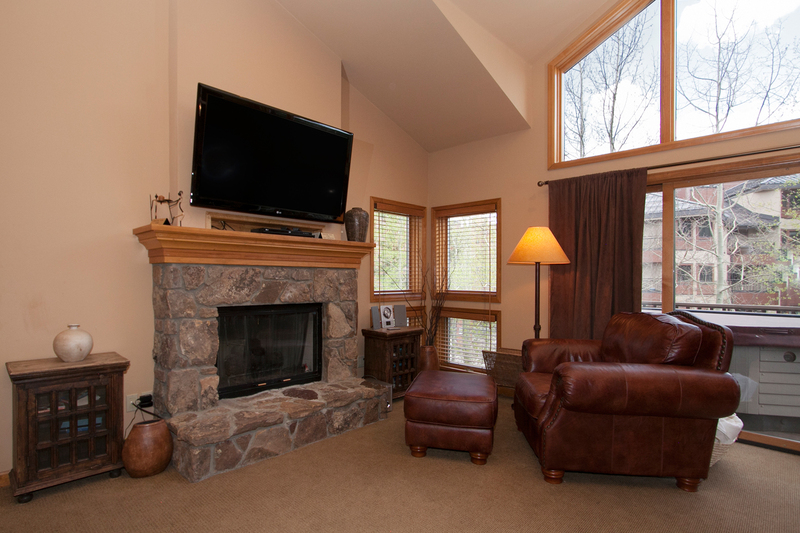 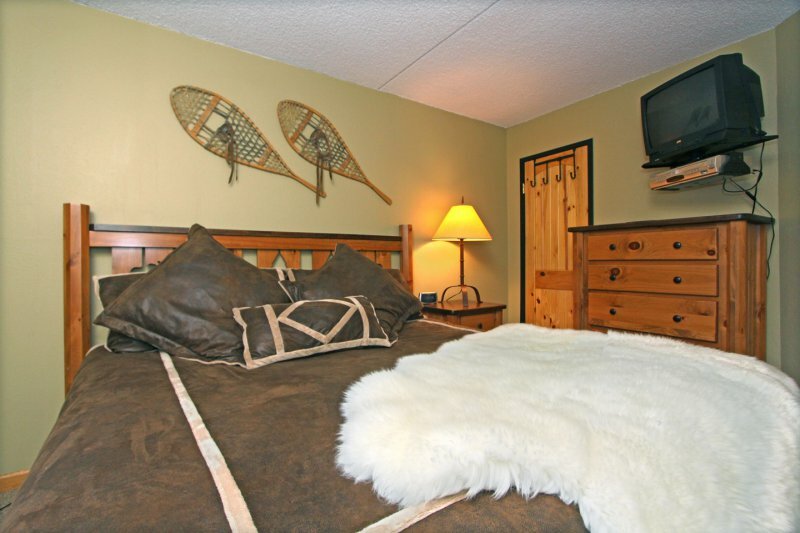 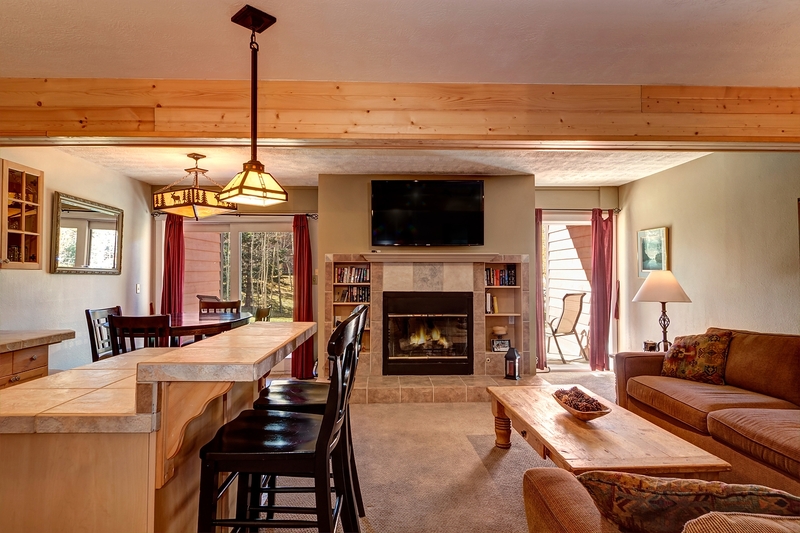 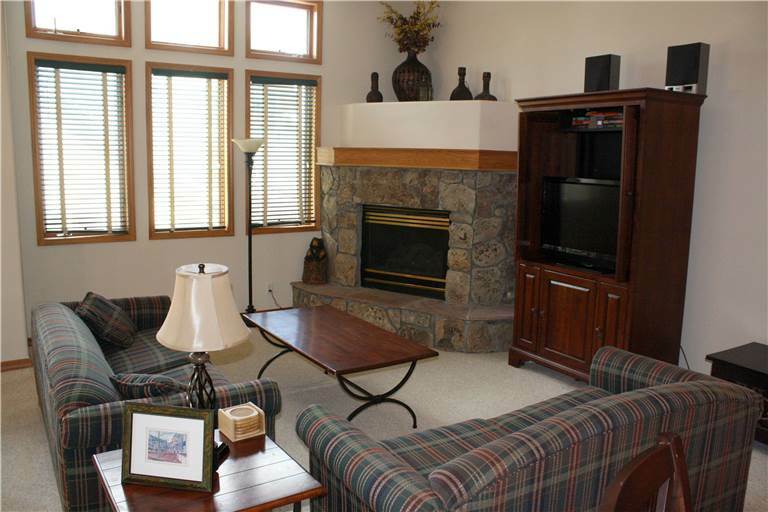 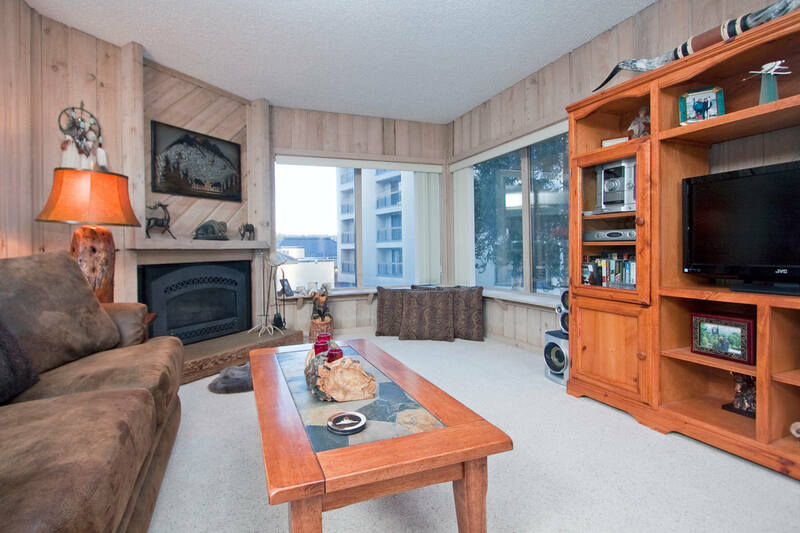 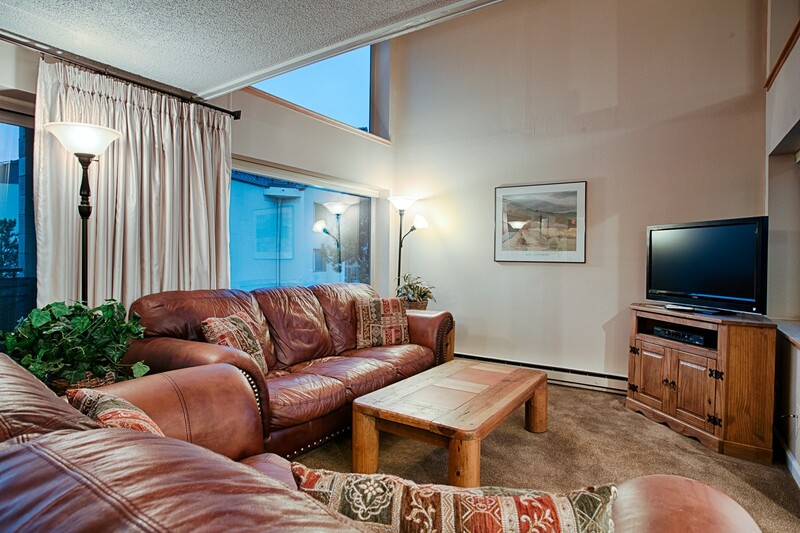 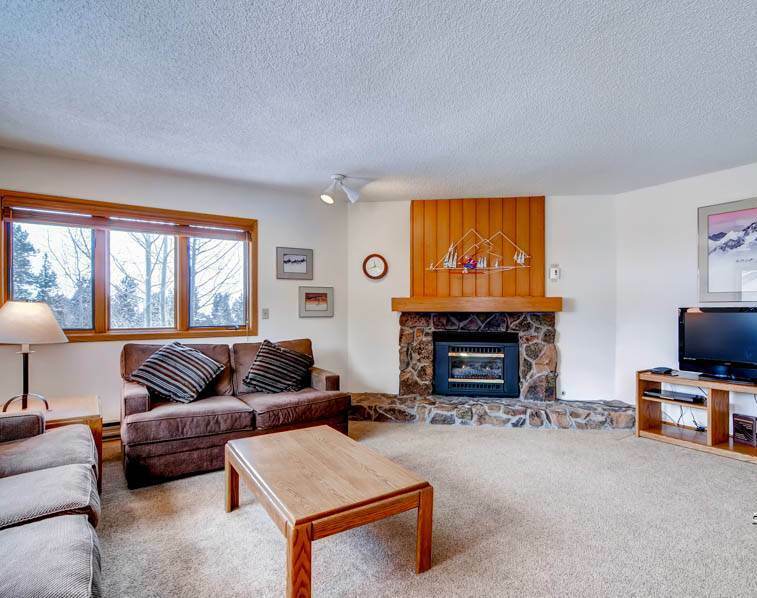 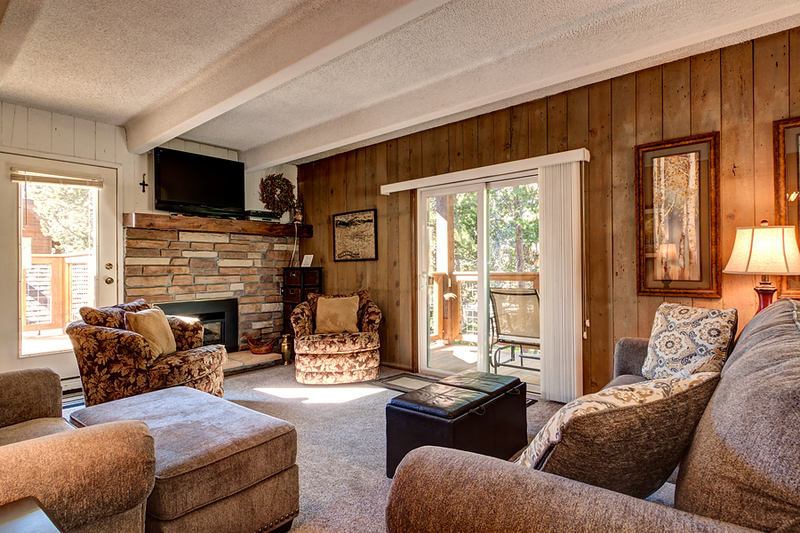 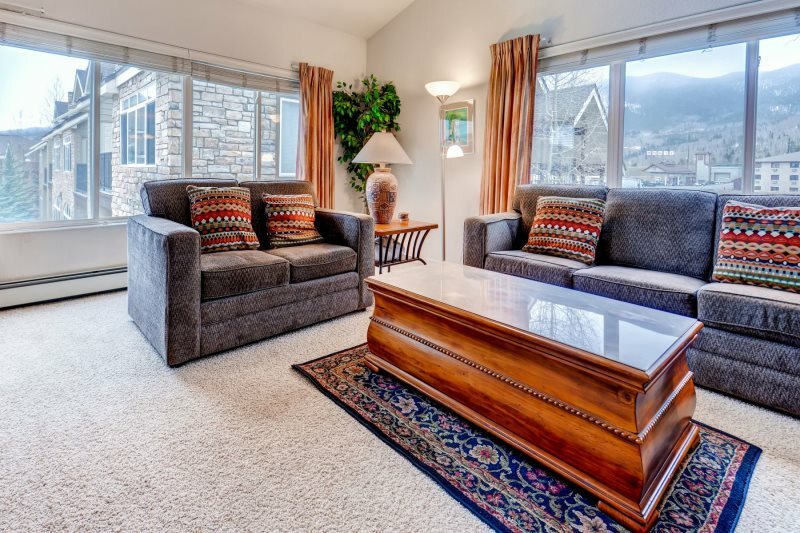 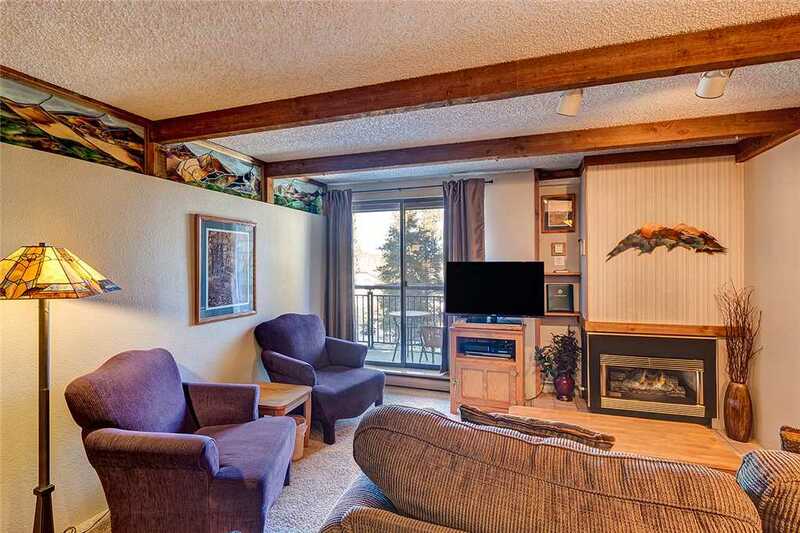 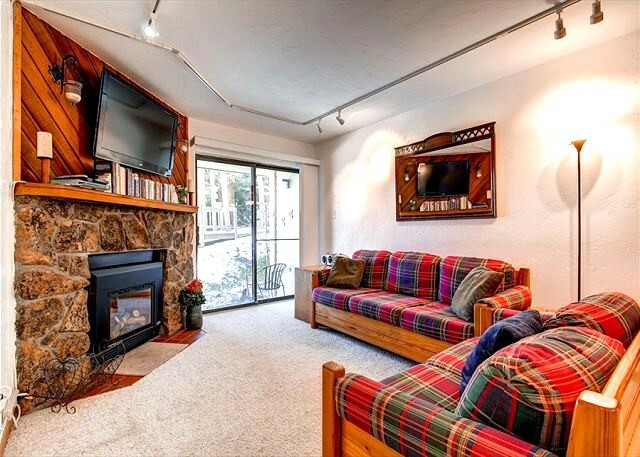 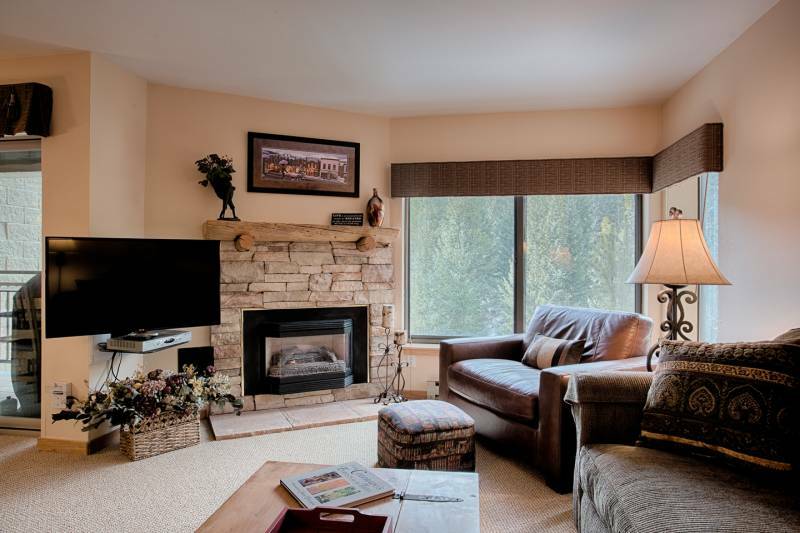 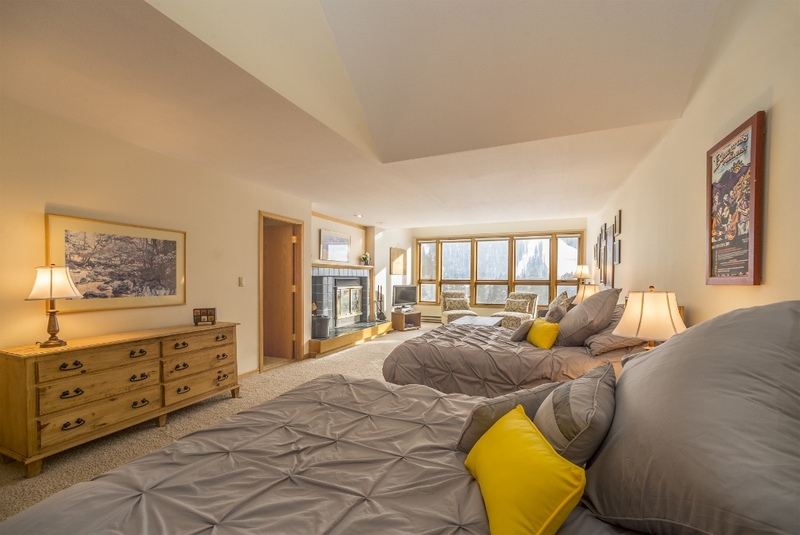 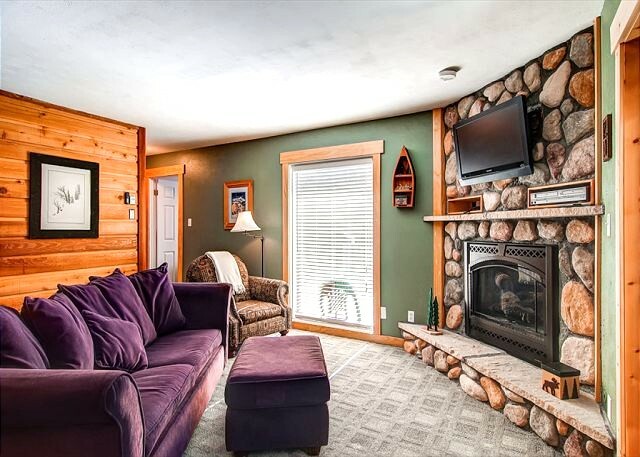 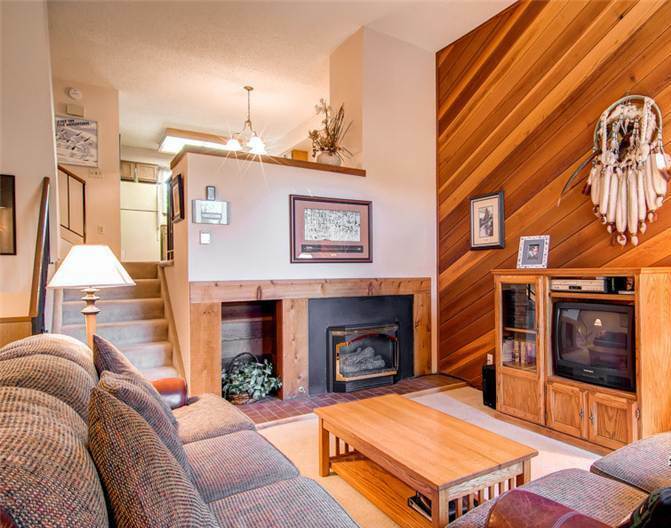 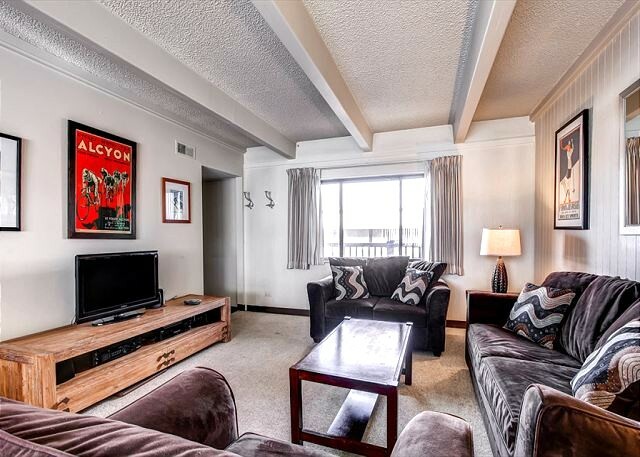 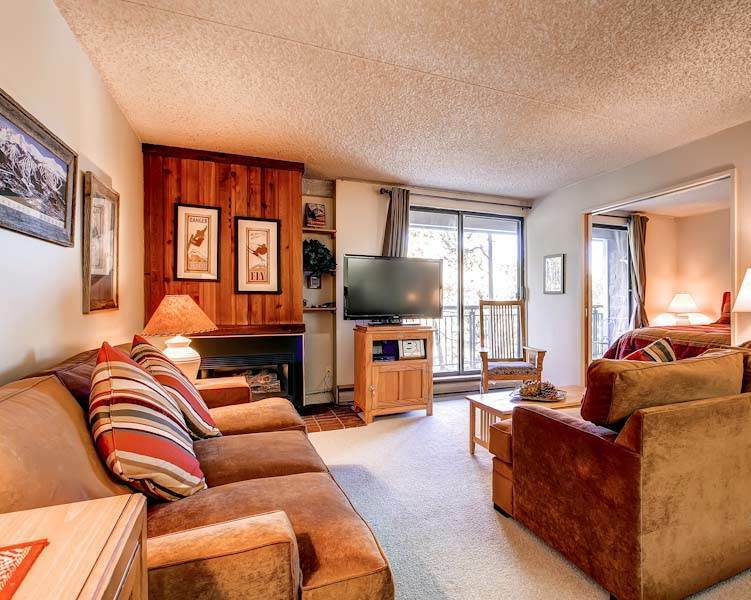 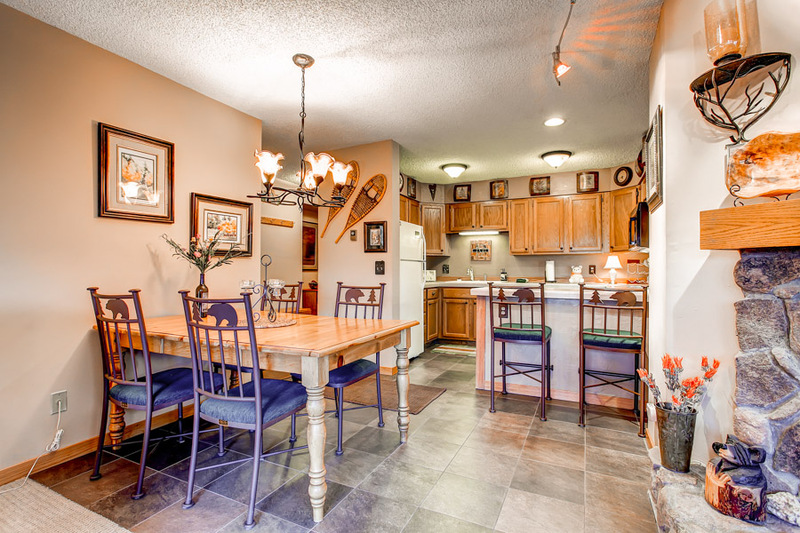 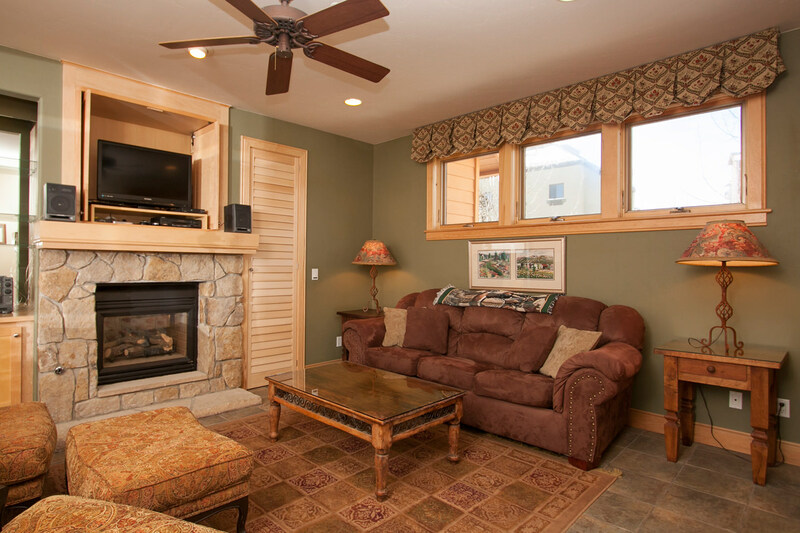 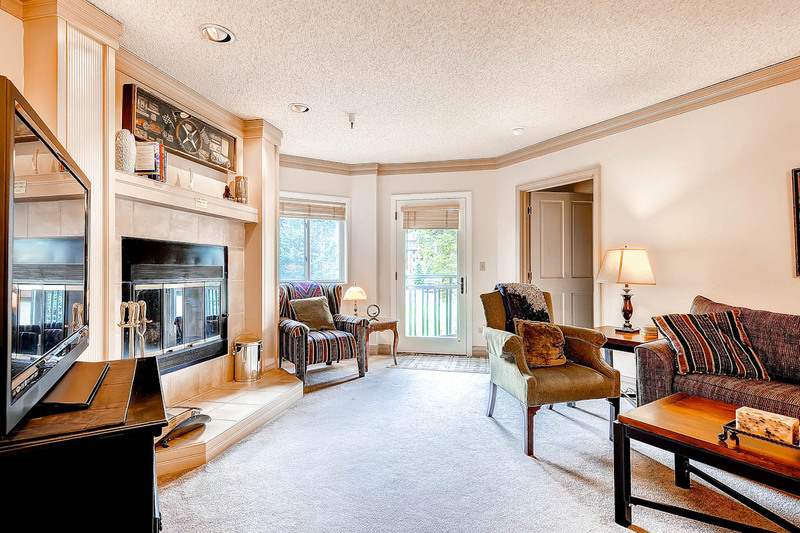 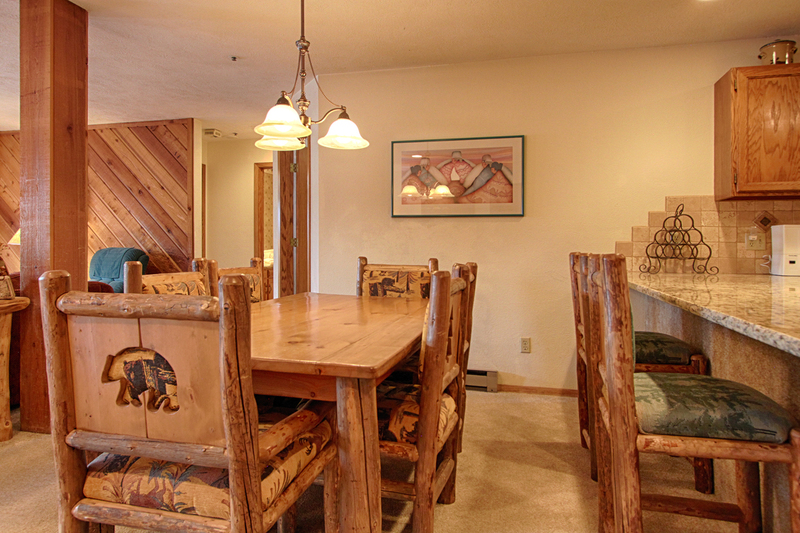 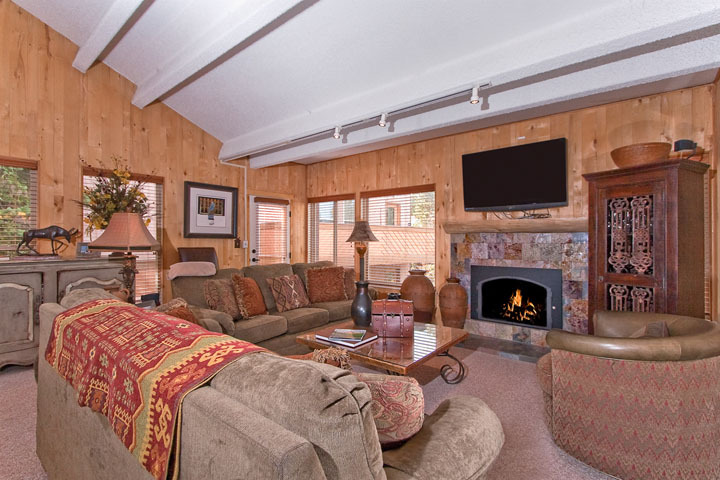 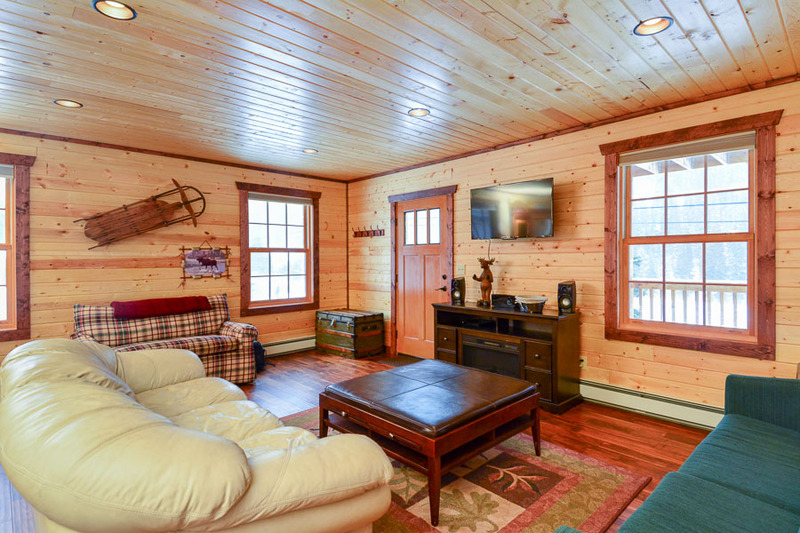 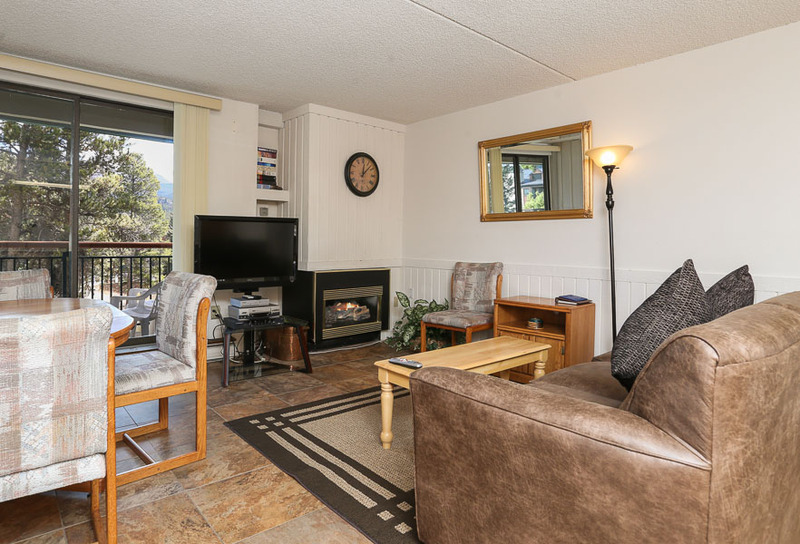 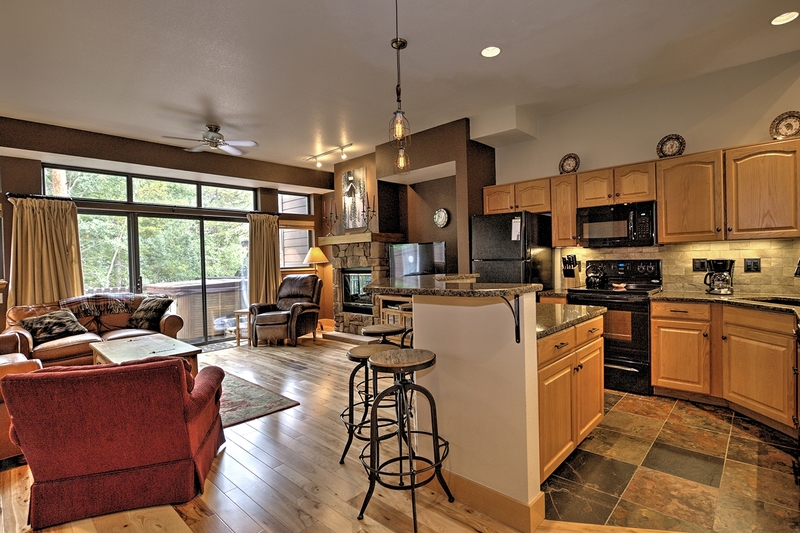 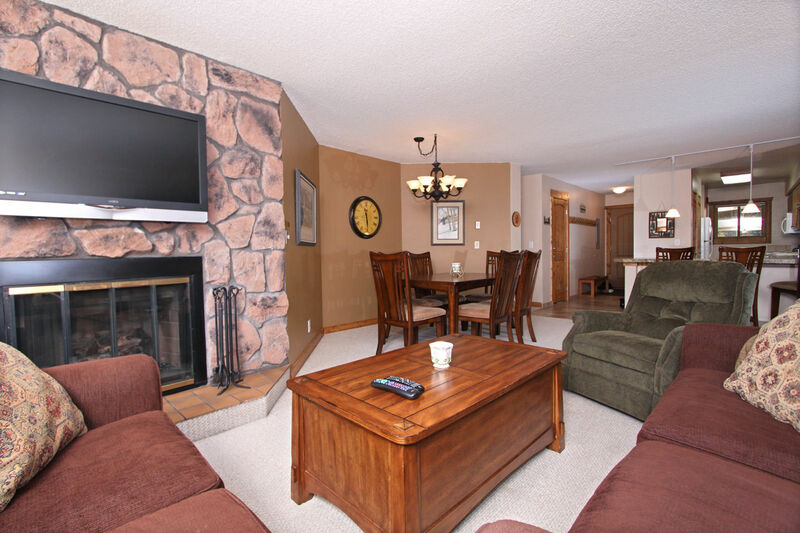 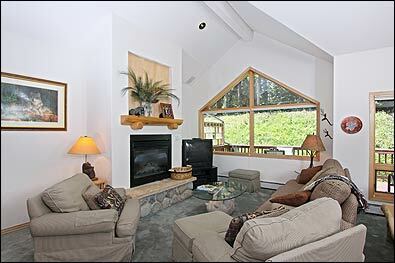 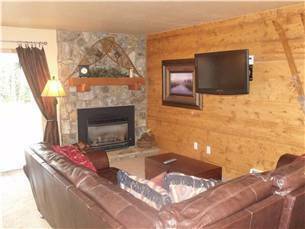 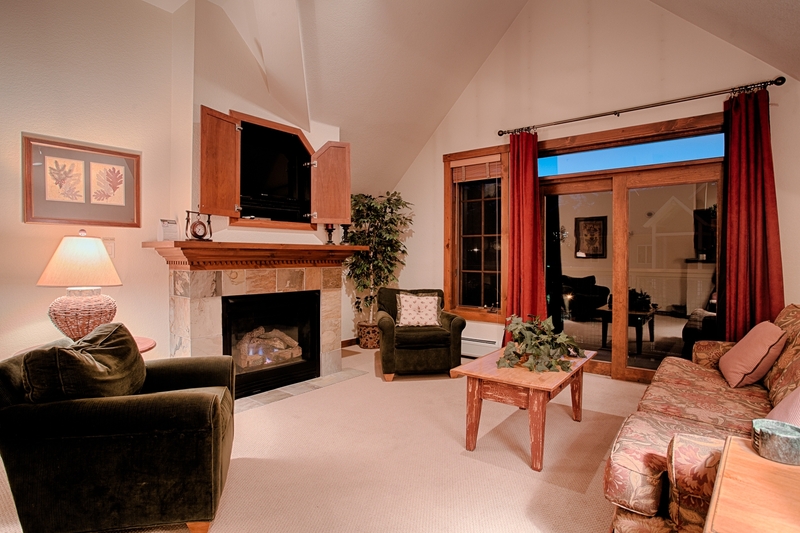 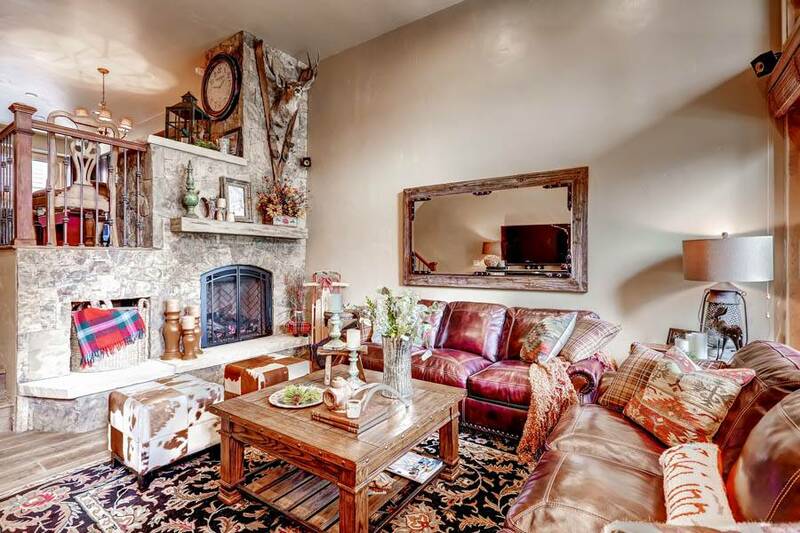 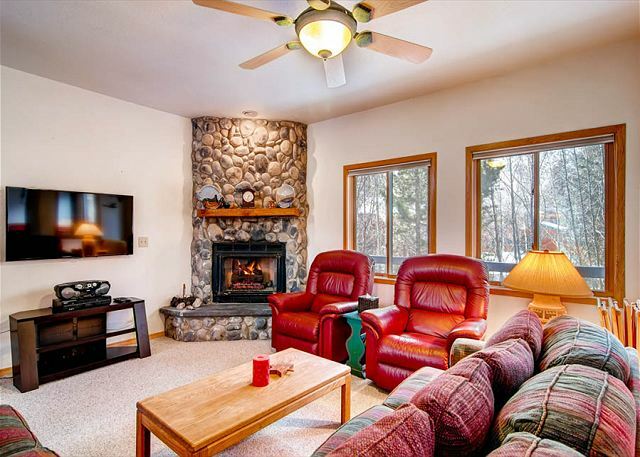 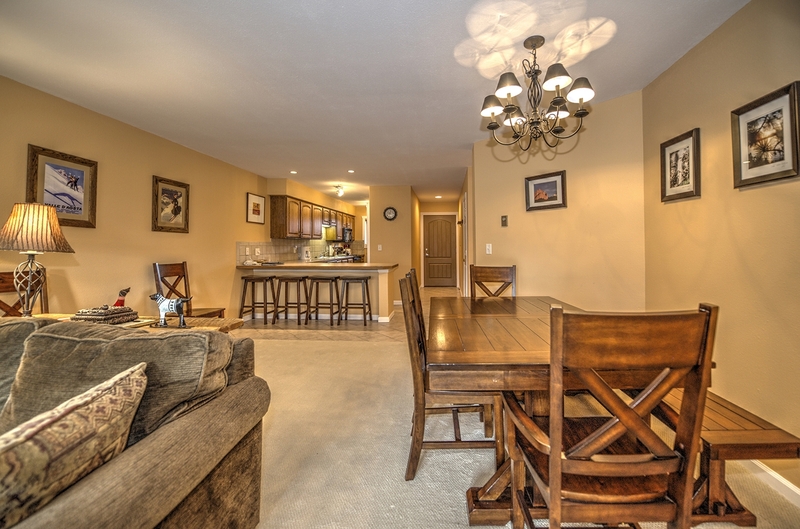 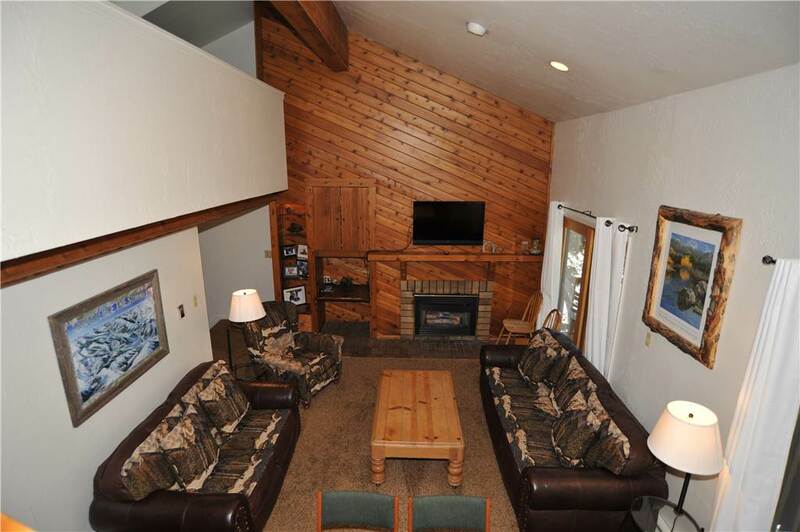 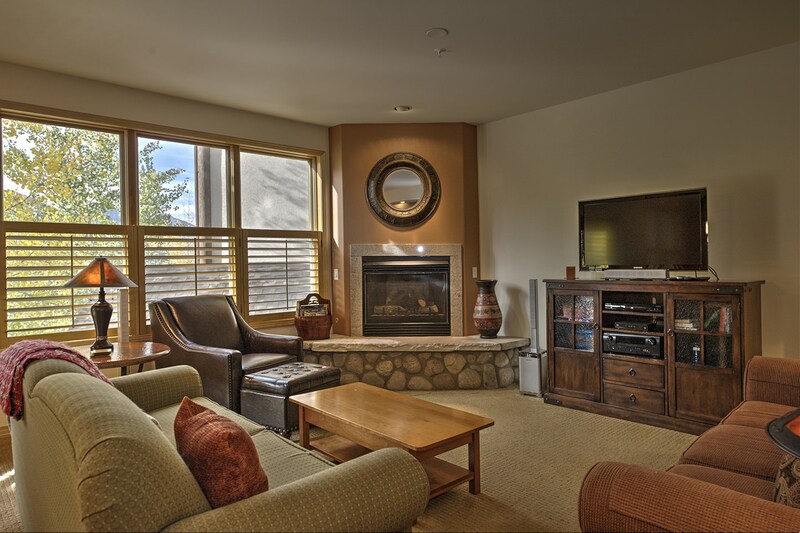 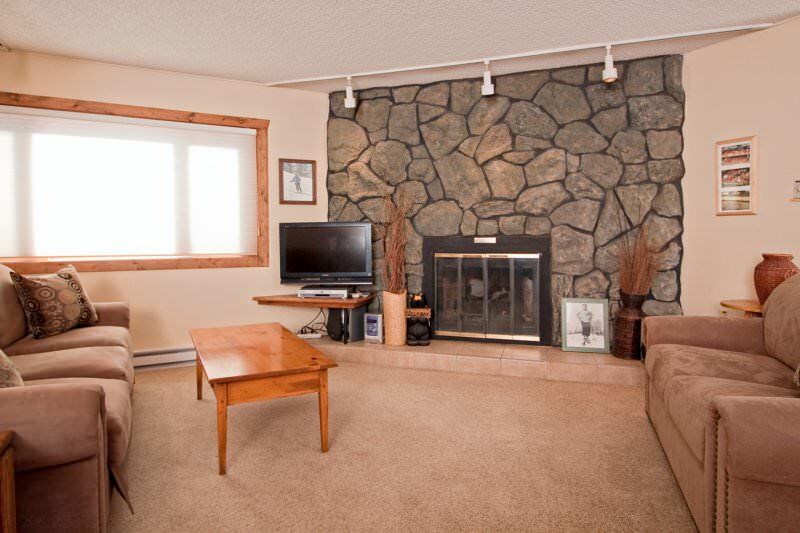 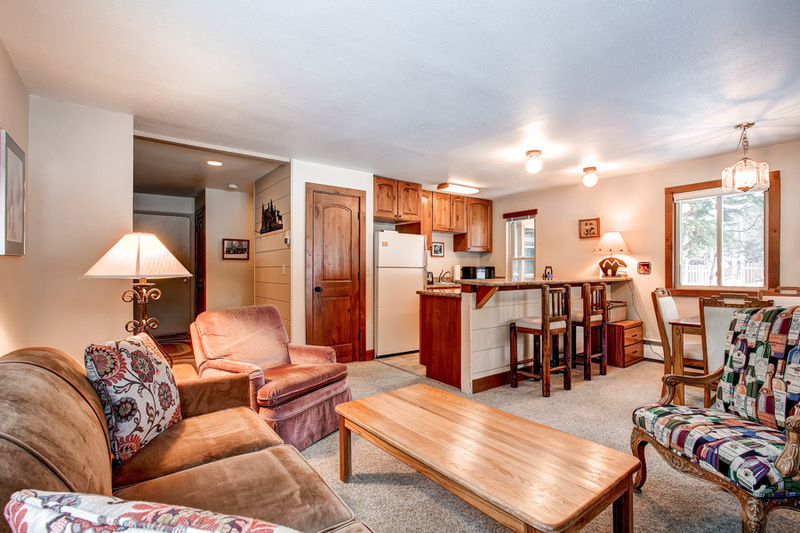 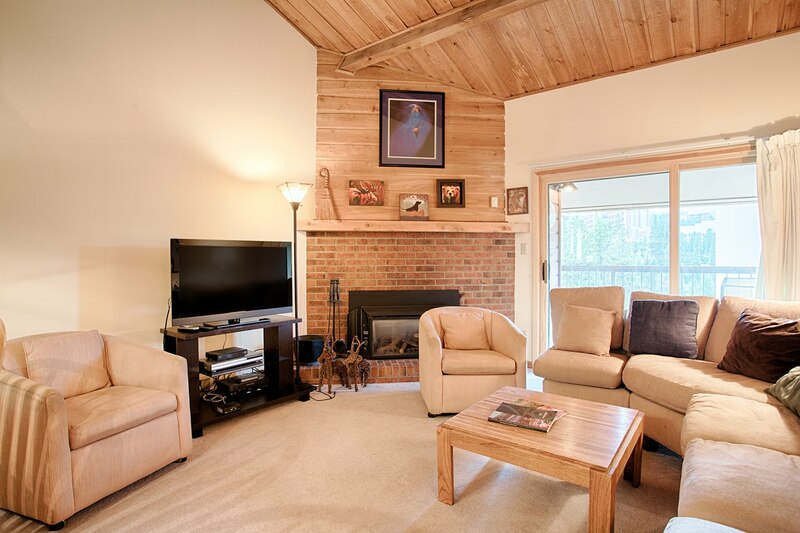 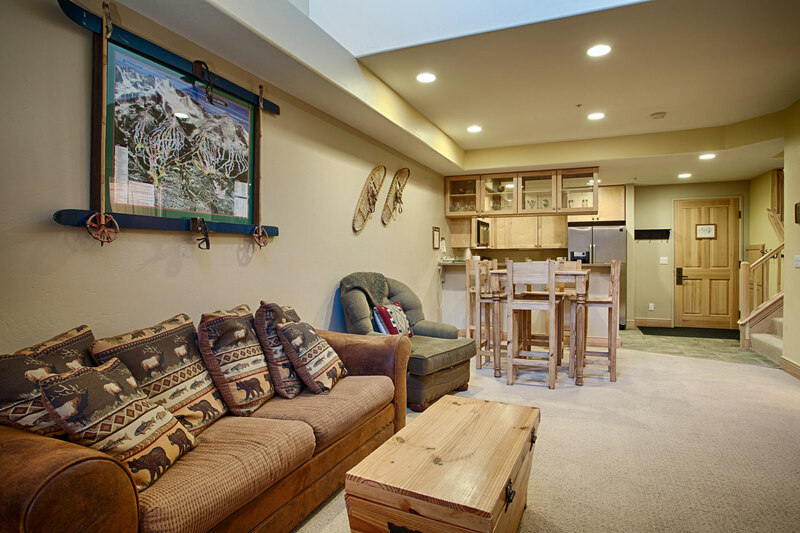 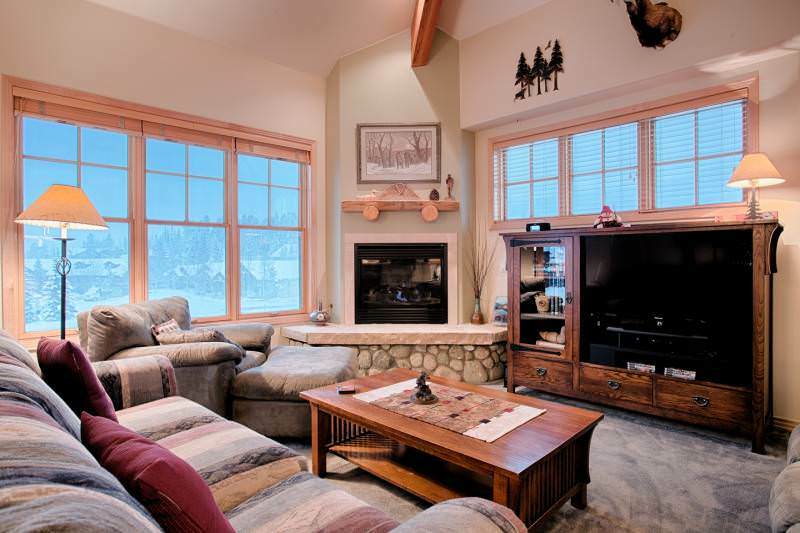 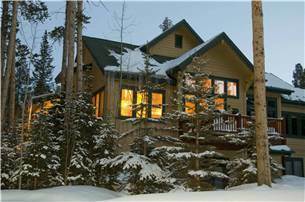 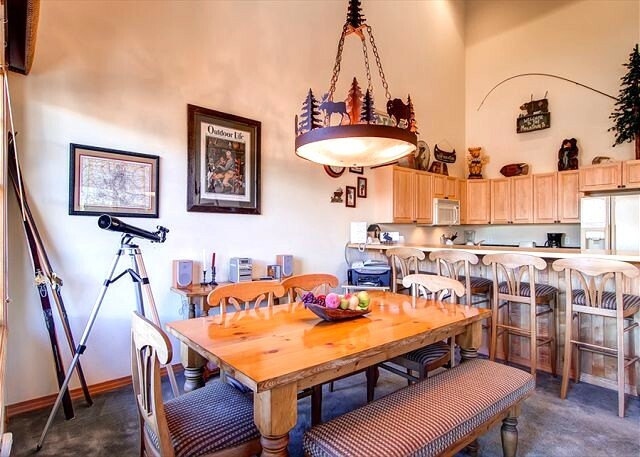 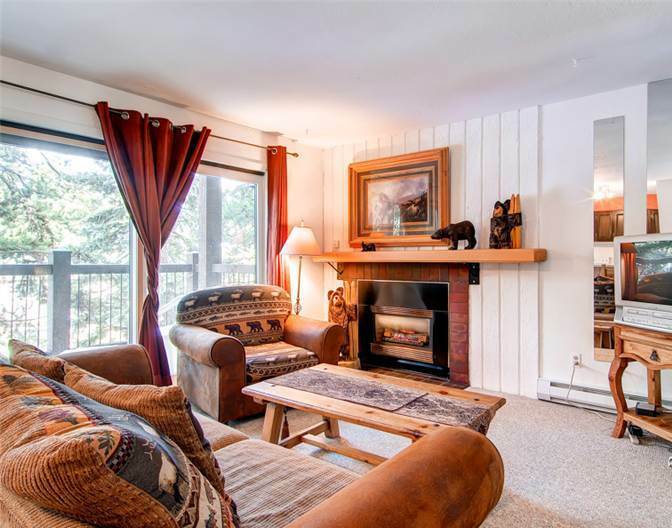 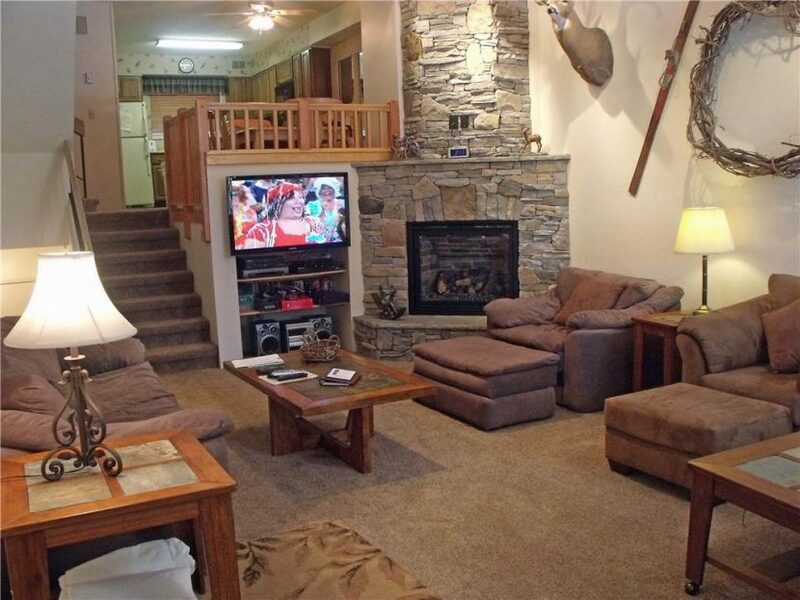 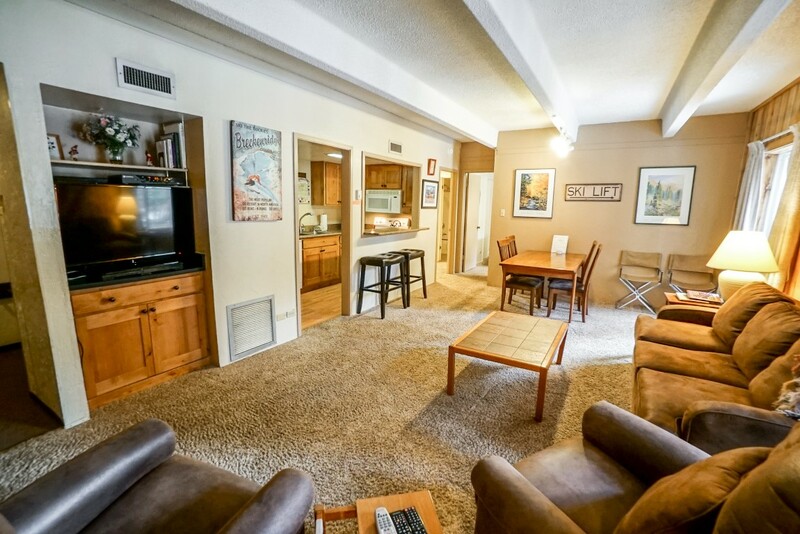 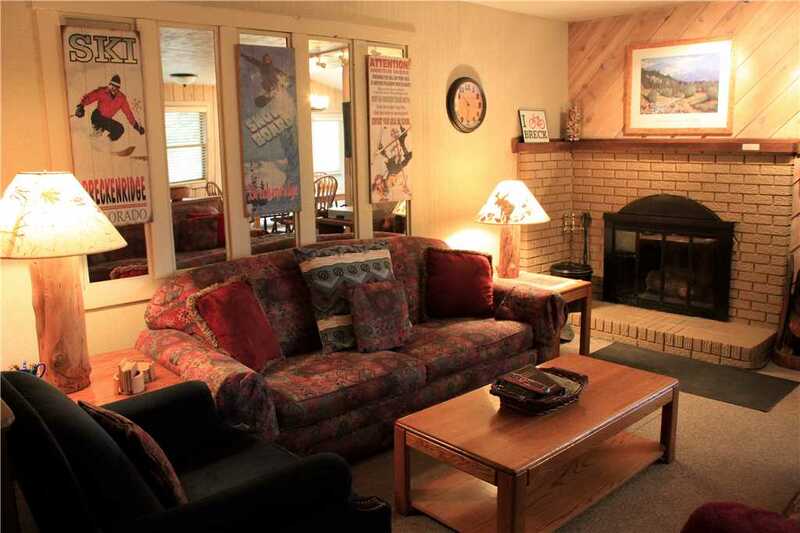 This adorable, 510 square foot, studio unit offers a hometown ski feel with its wood furniture and quaint layout. 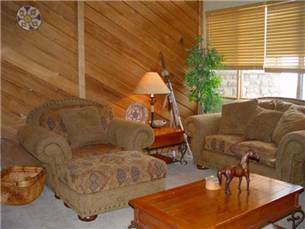 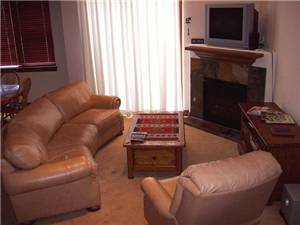 There is comfortable seating on the cozy couch and side chair that are bedside all with viewing pleasure to the TV with DVD. 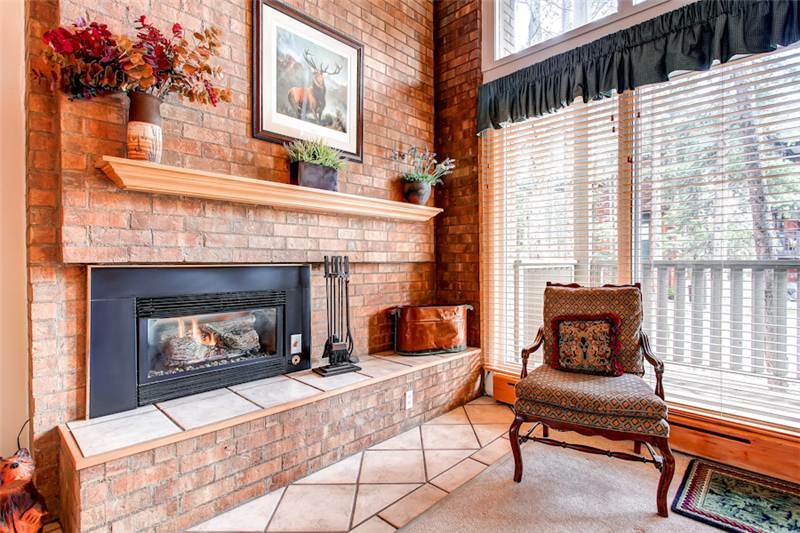 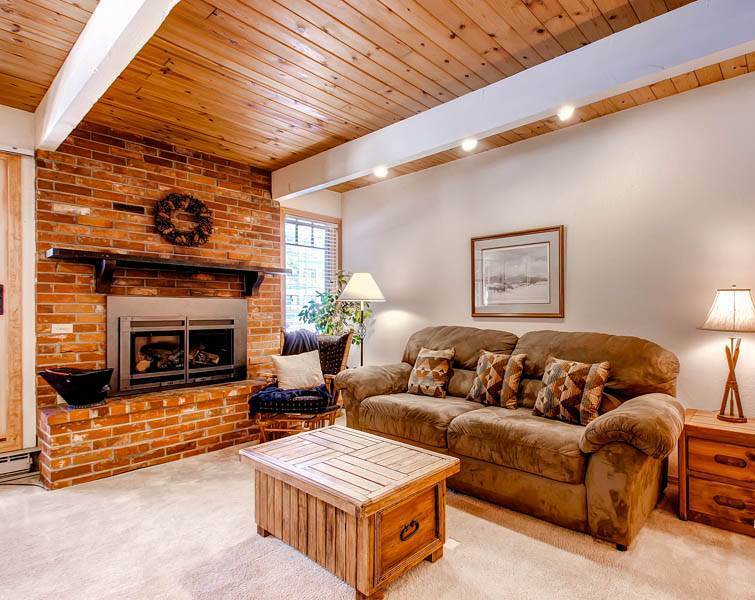 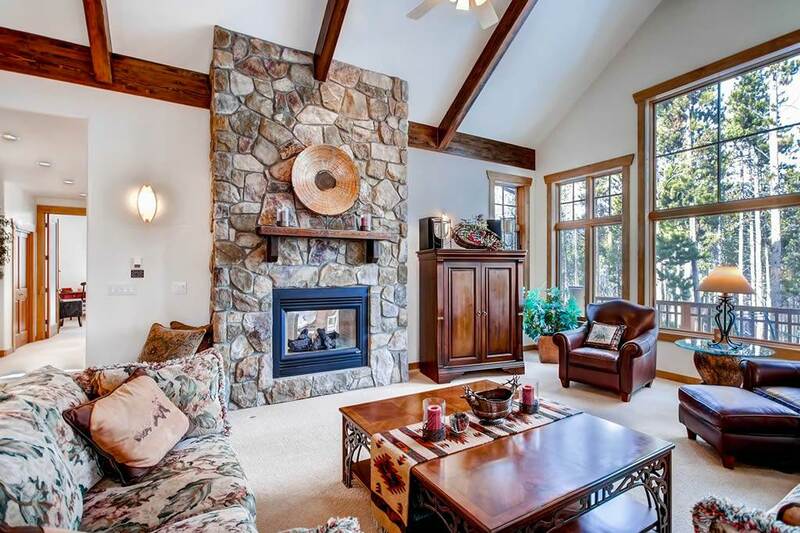 The wood burning fireplace is outlined in the original rustic brick and expels the wood fragrance while heating the unit. 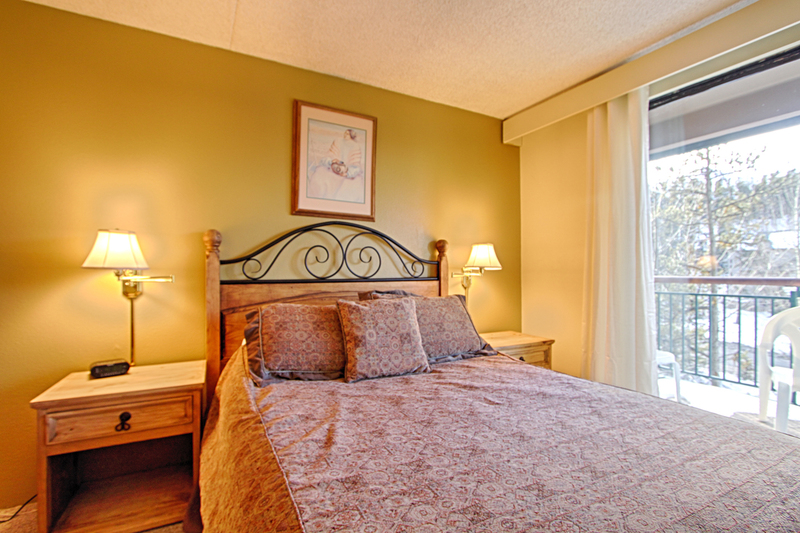 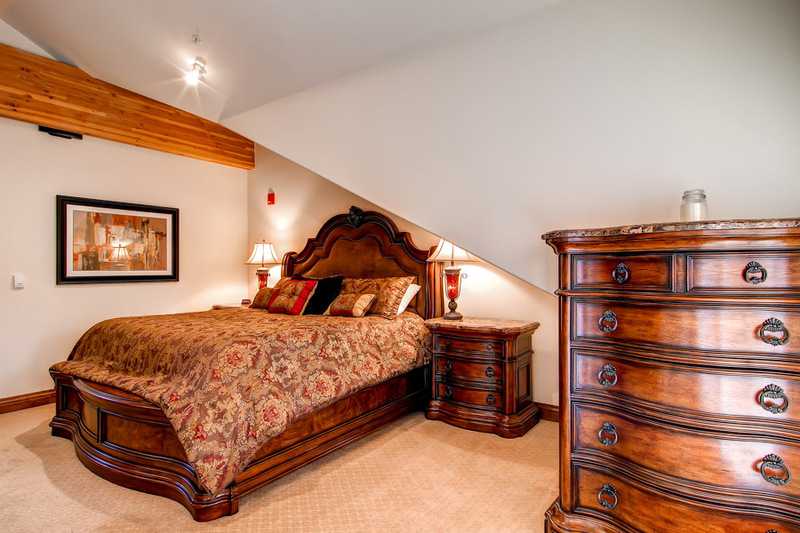 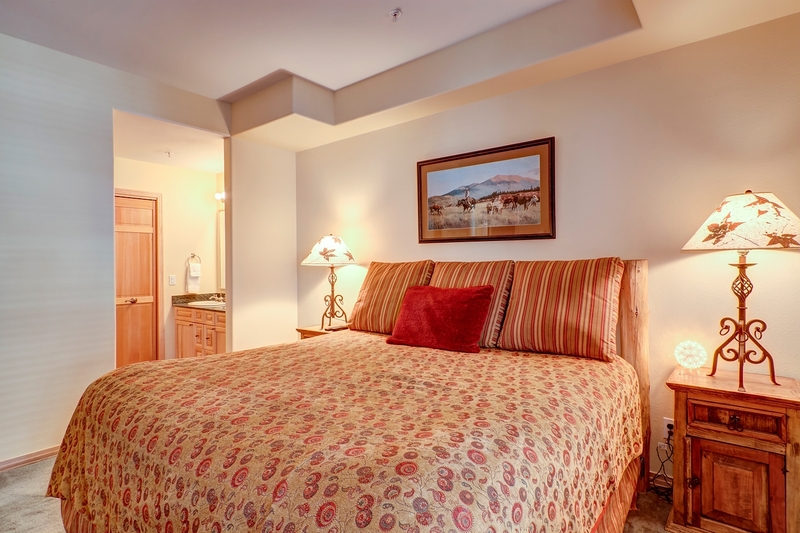 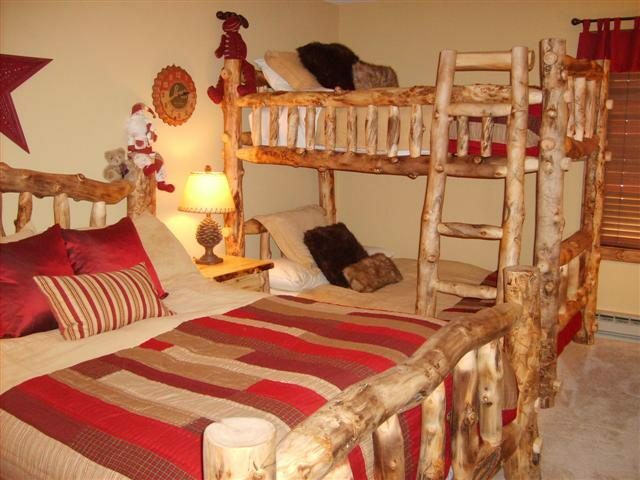 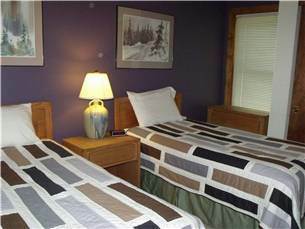 The unit is furnished with a four poster queen bed that is beautifully decorated with elegant bedding. 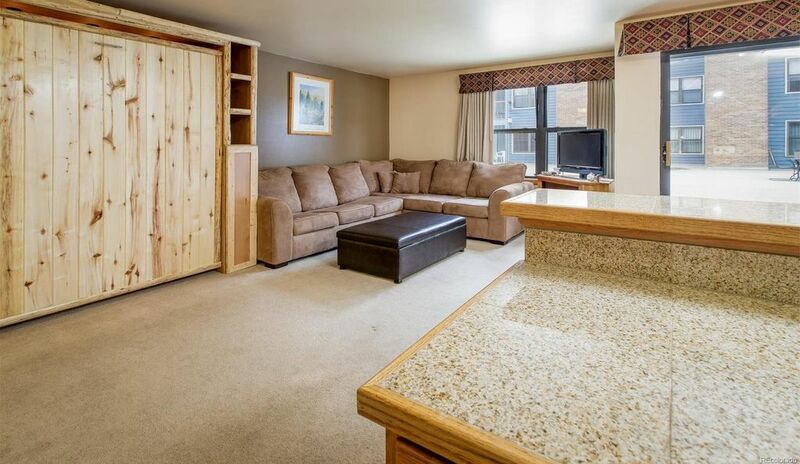 If you love a good book while on vacation, this studio unit is your perfect destination. 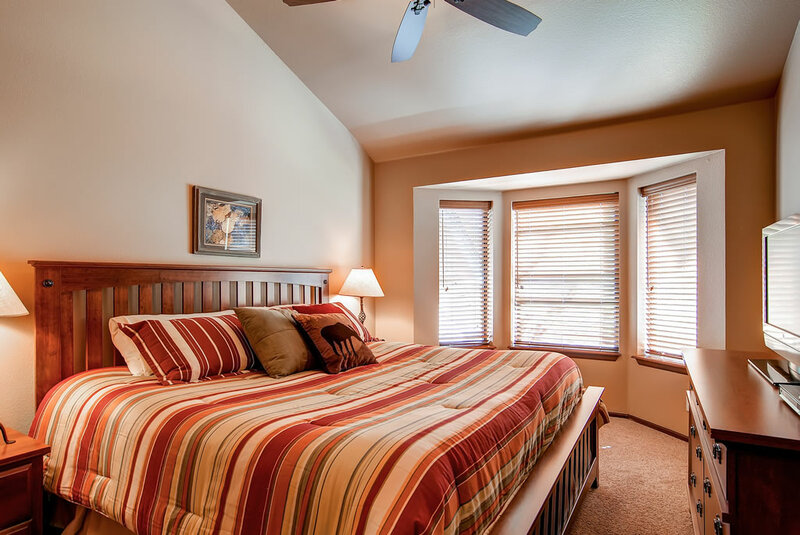 The layout allows you to relax and sink into comfort when reading your choice book. 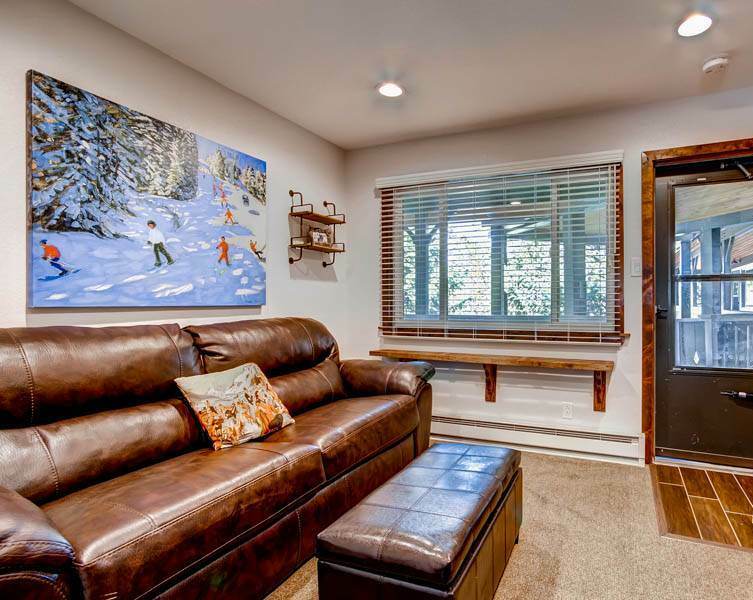 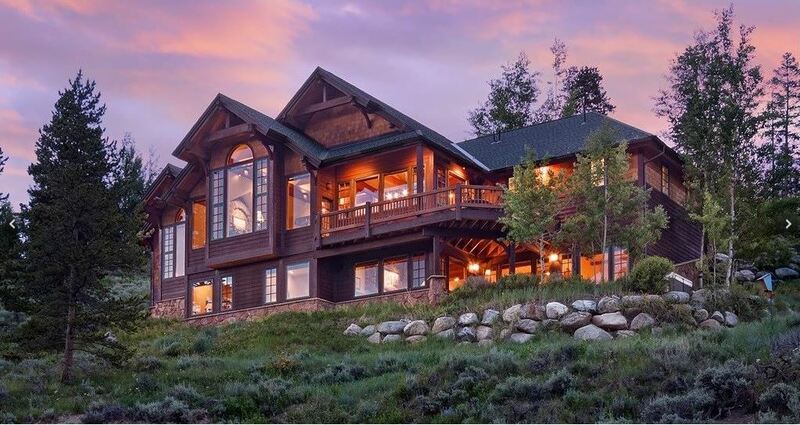 If you are interested in reading outdoors, this unit features a quiet, private deck with seating to relish in the warm winter days and beautiful summers. 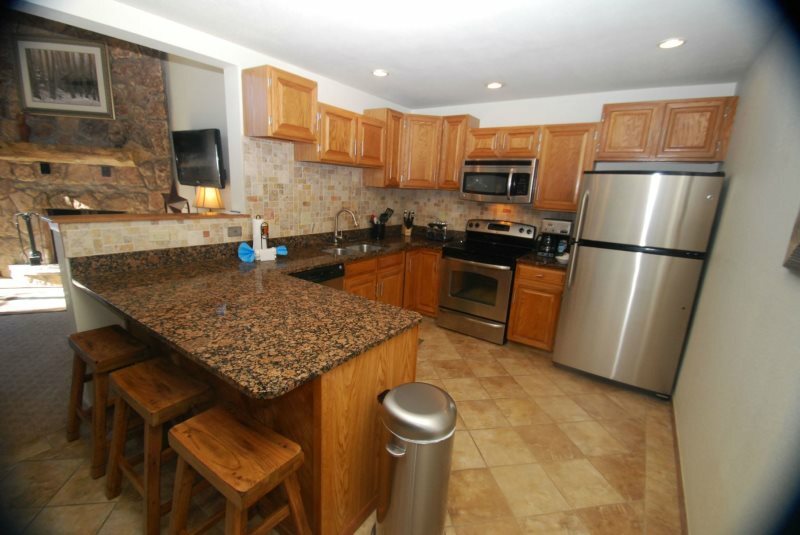 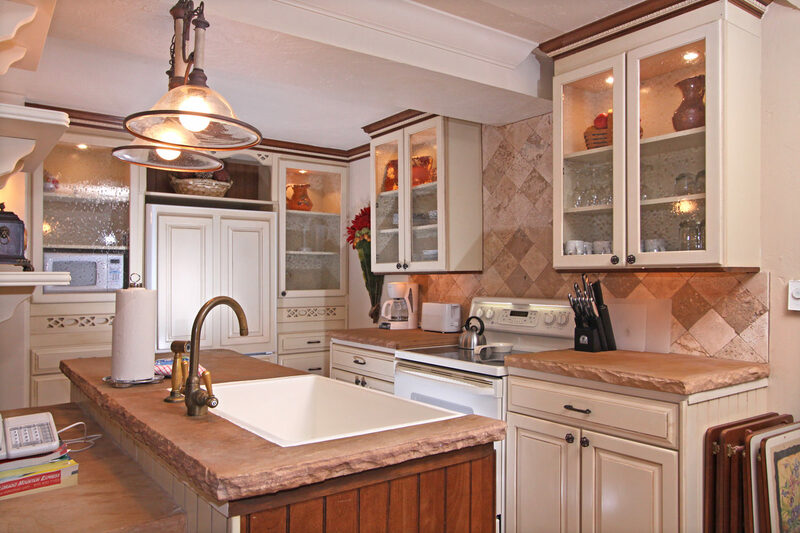 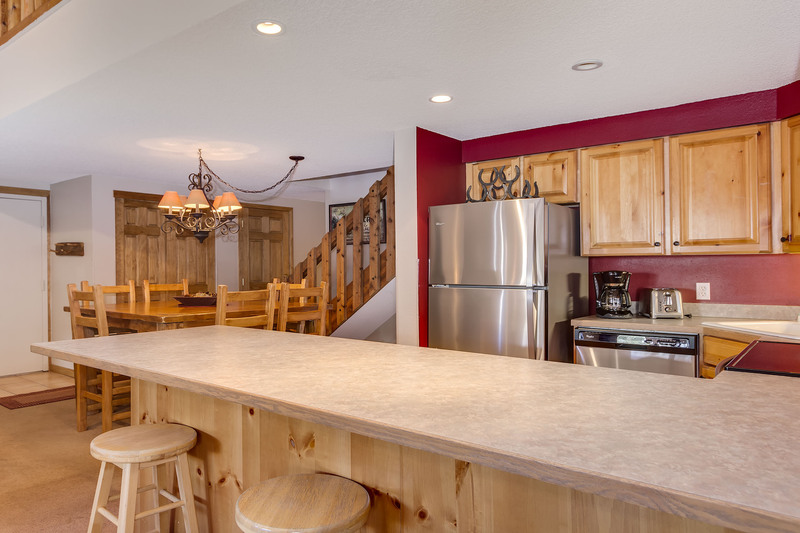 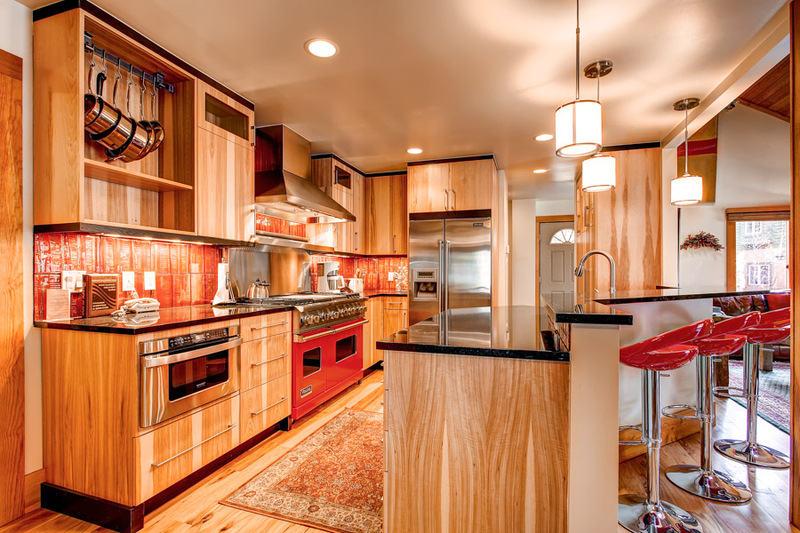 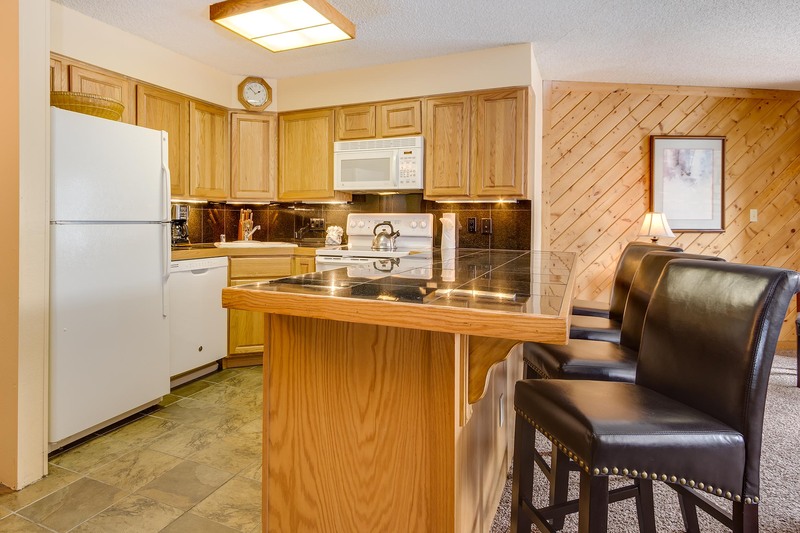 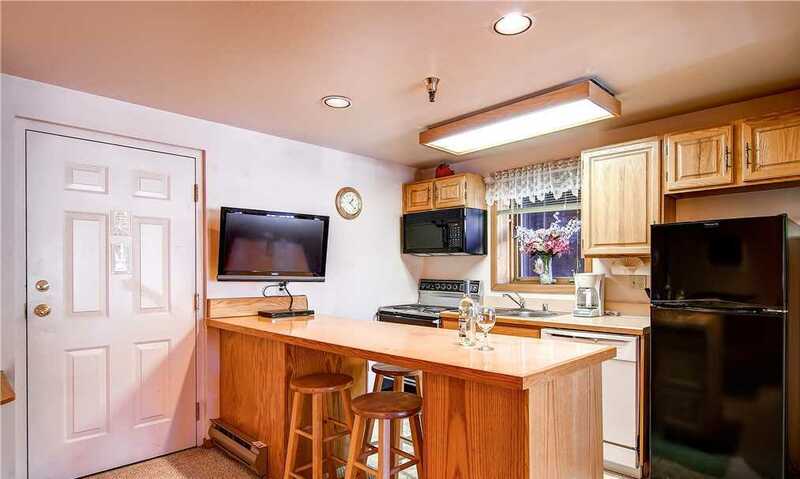 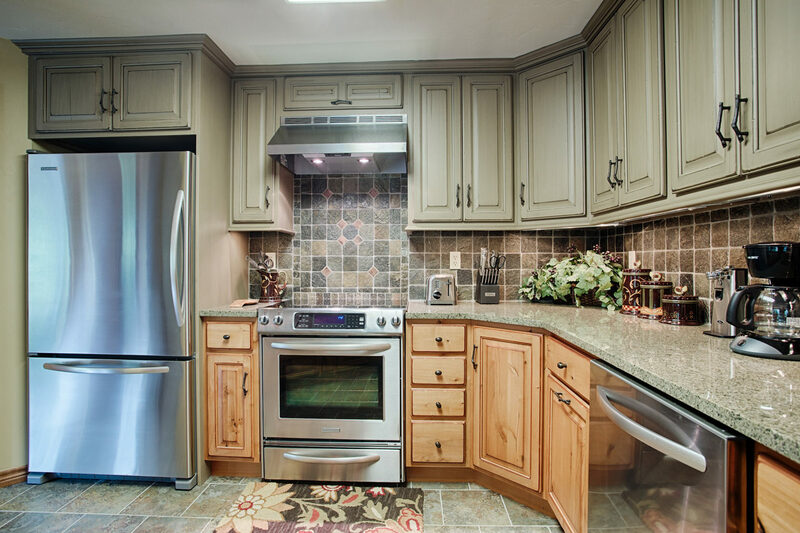 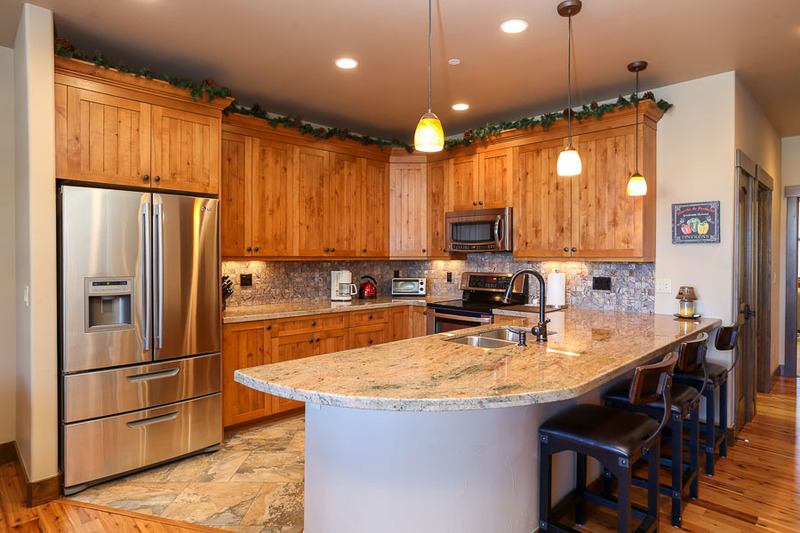 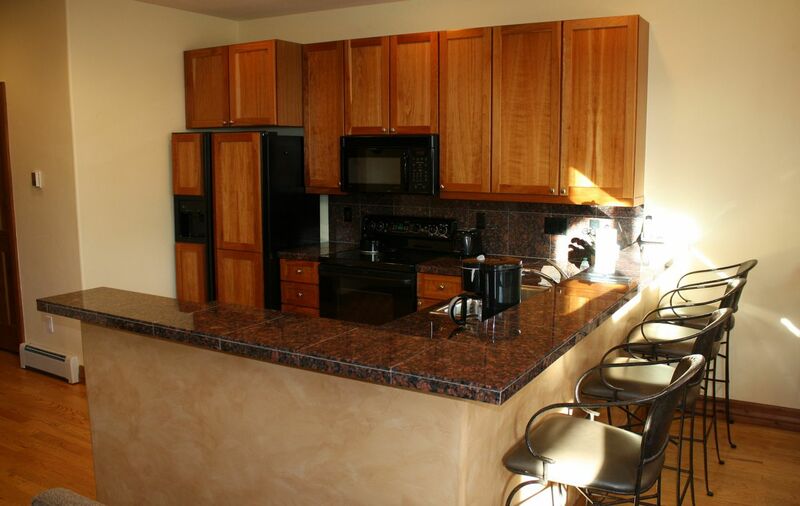 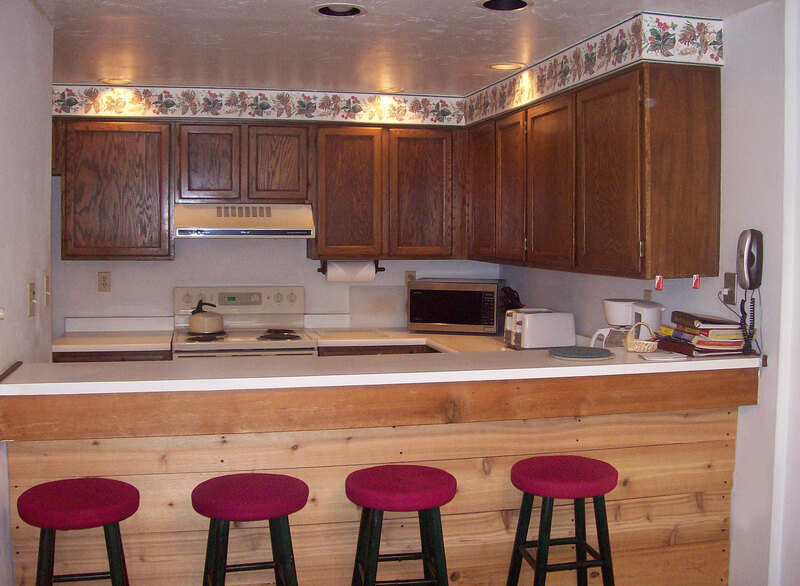 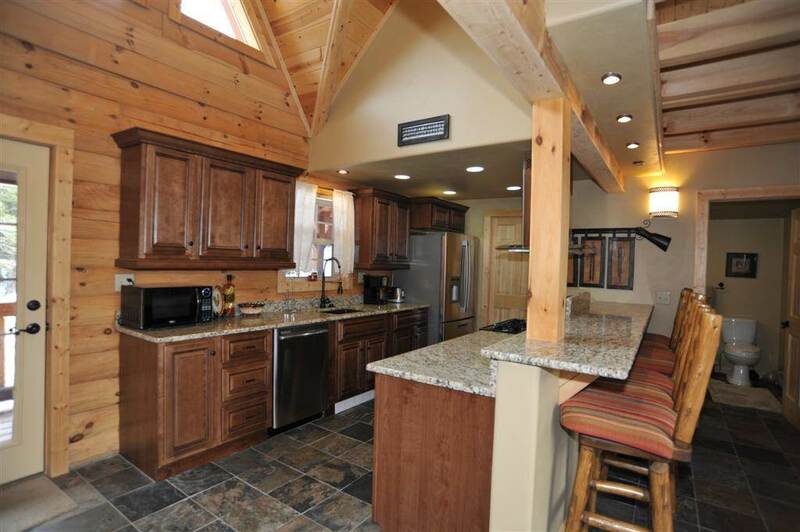 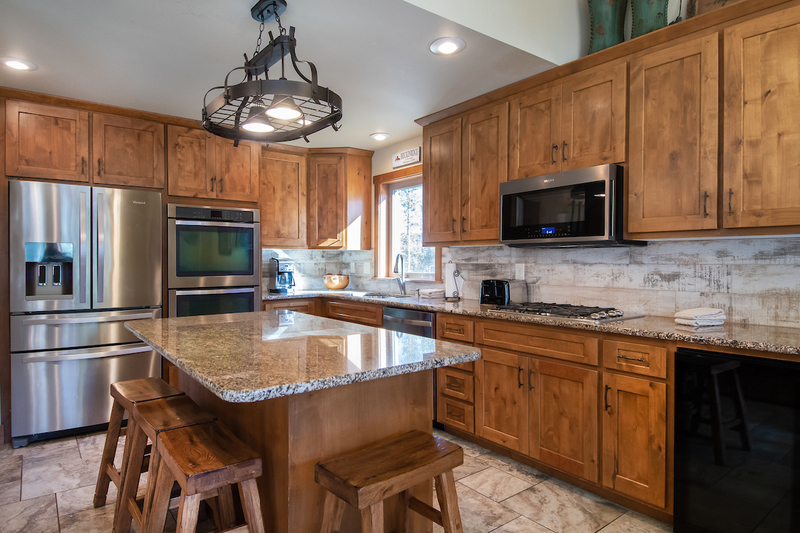 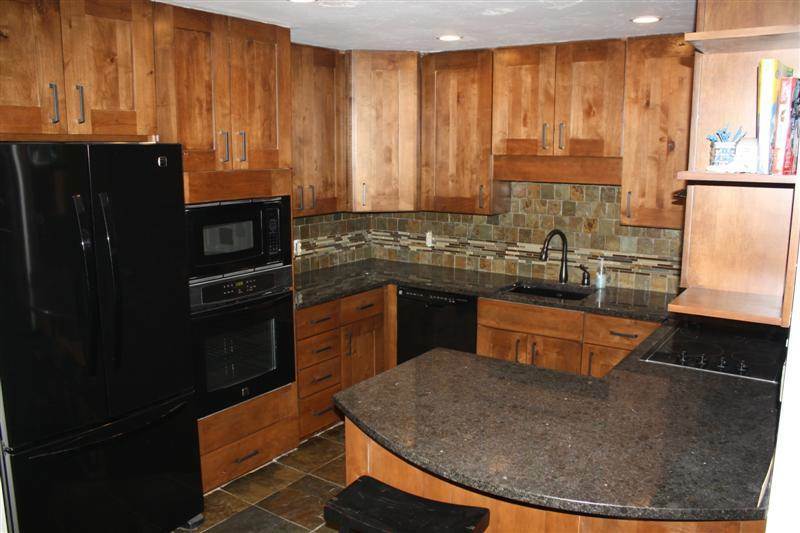 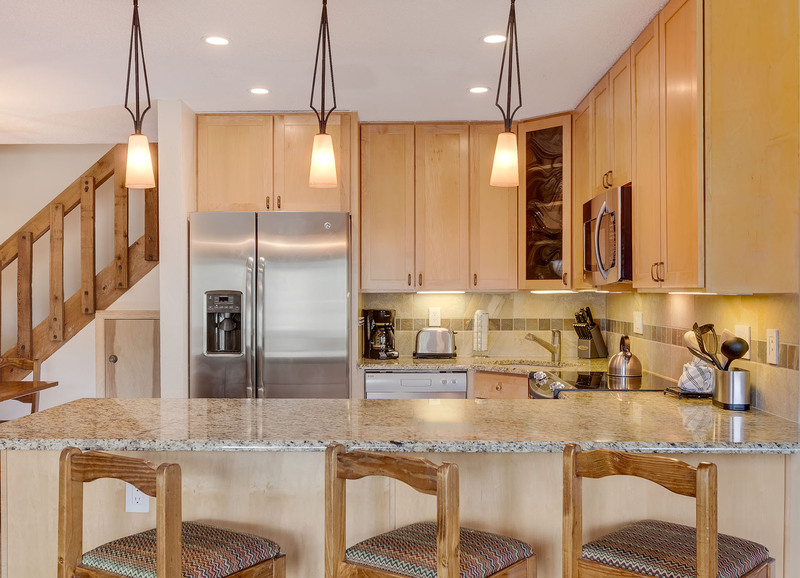 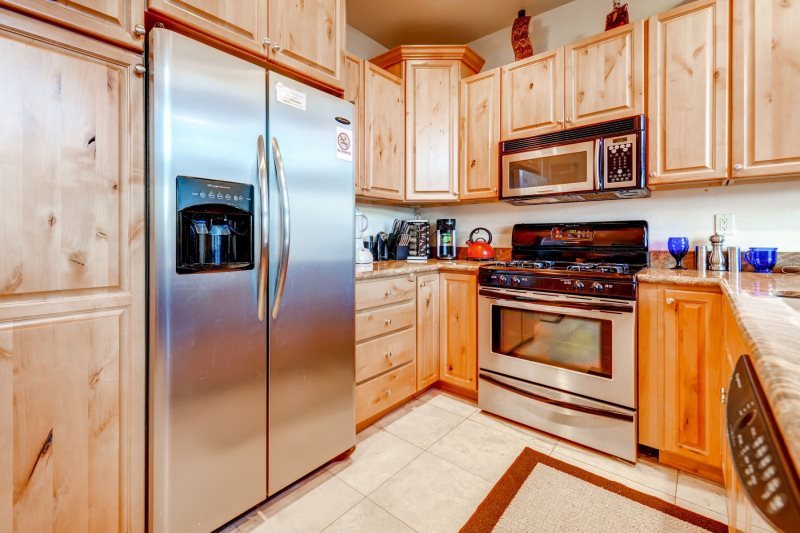 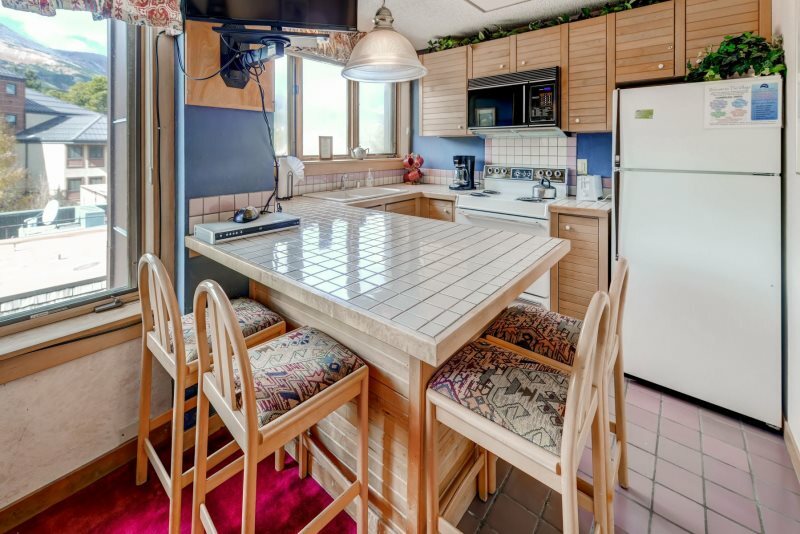 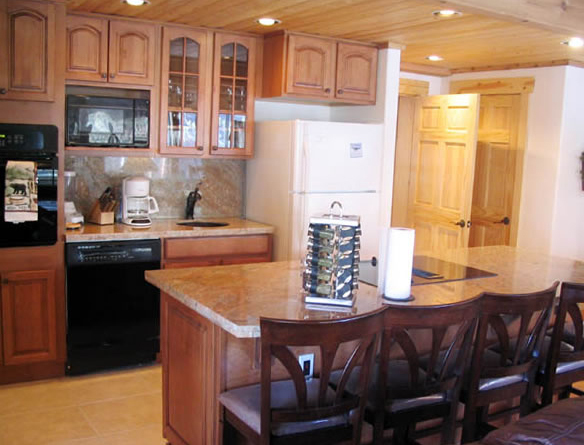 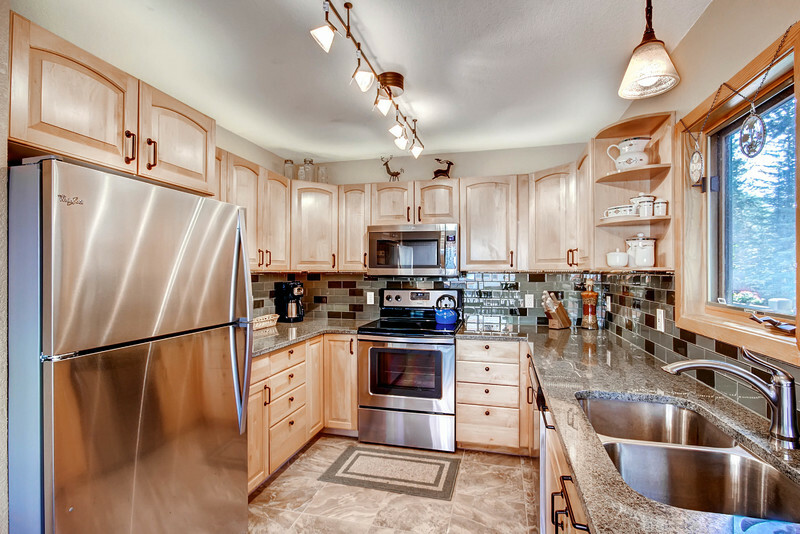 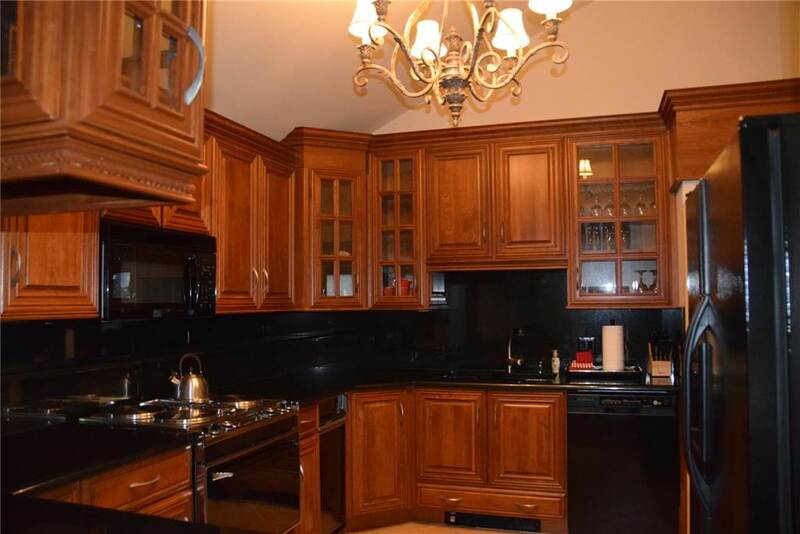 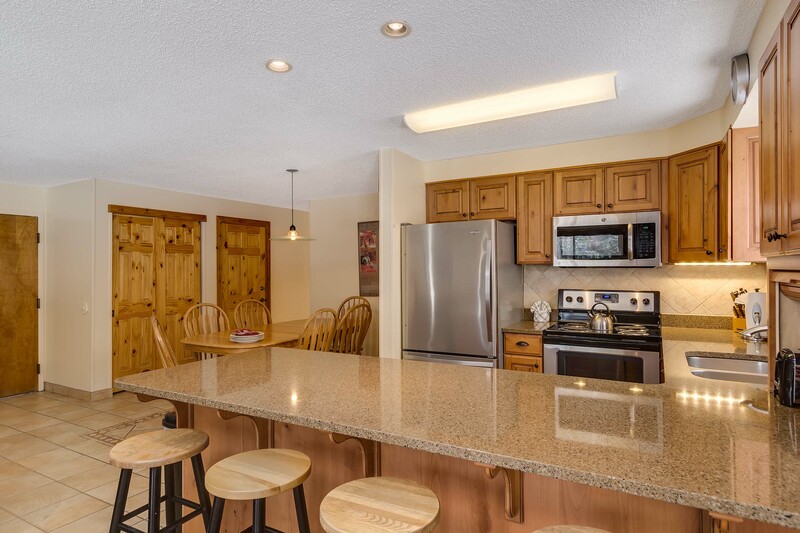 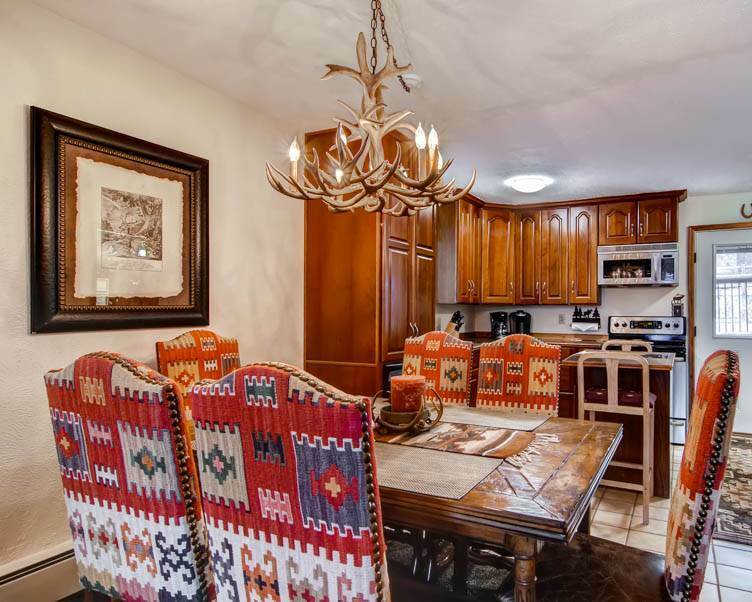 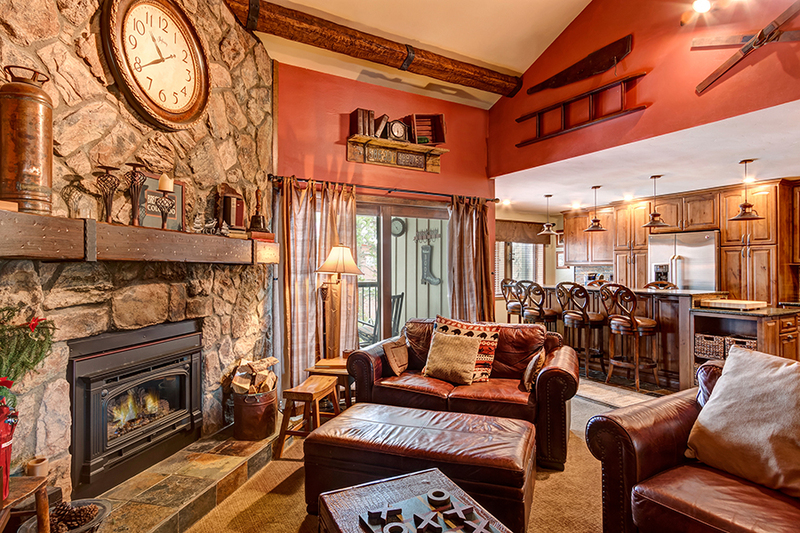 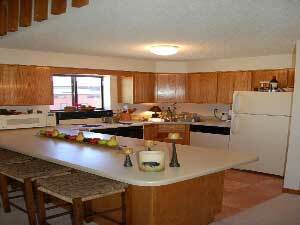 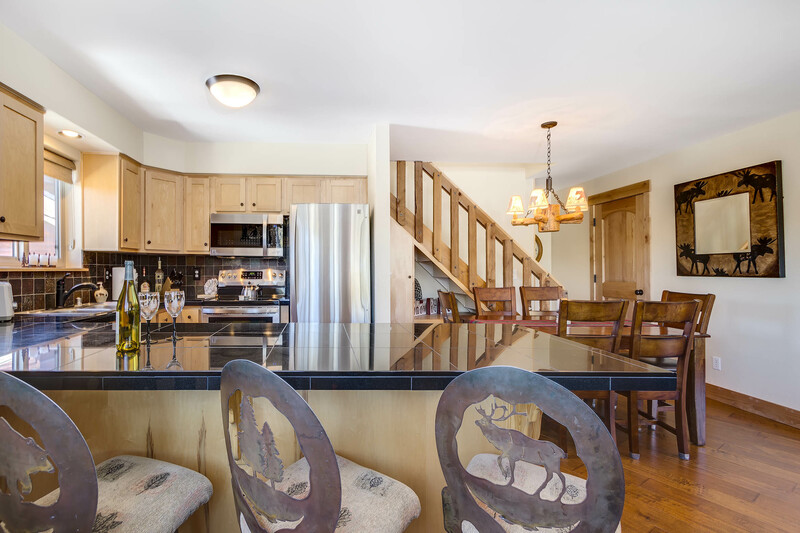 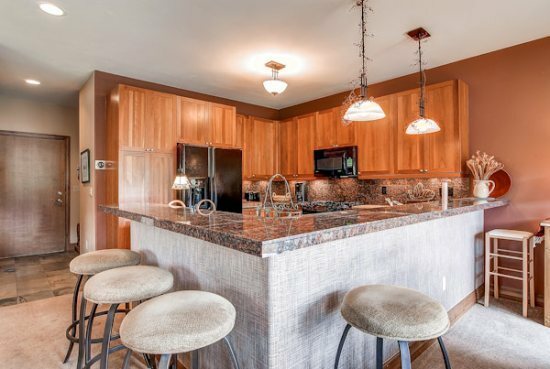 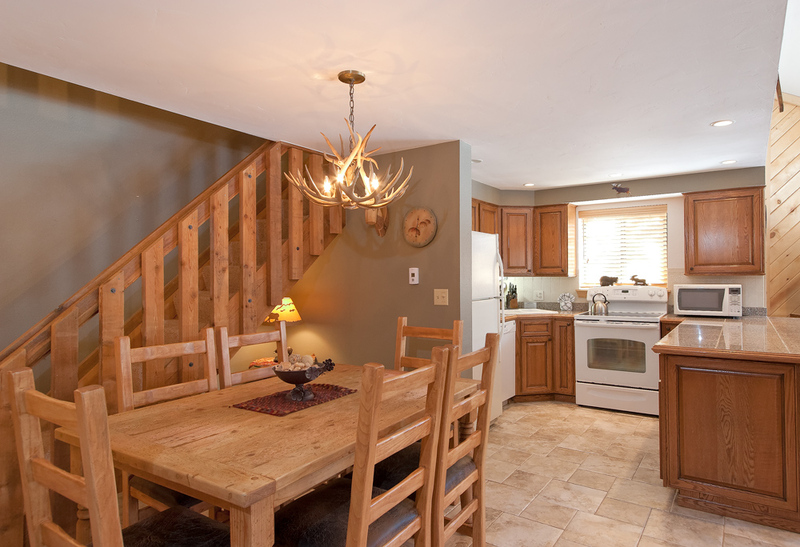 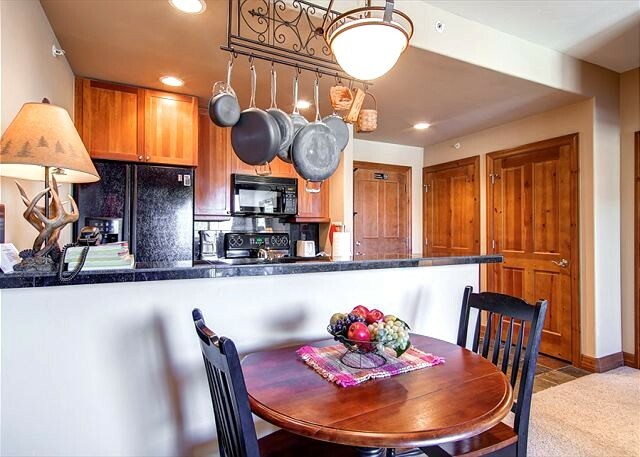 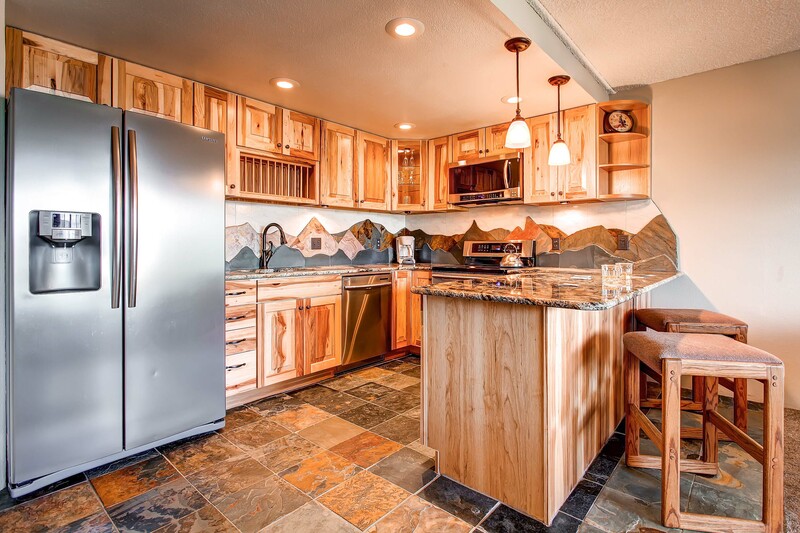 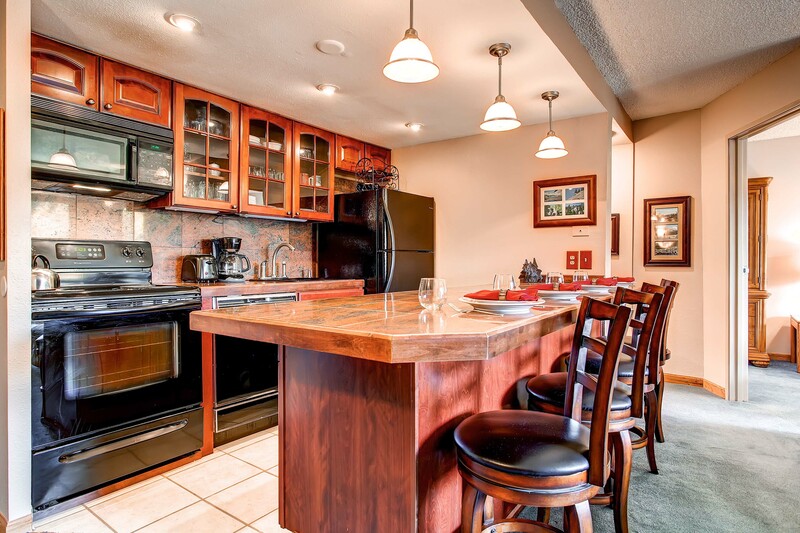 The fully loaded kitchenette is suitably stocked with all necessary cooking and dining utensils, refrigerator, stove, oven, microwave, coffee maker, and even a tea kettle to make a warm, soothing beverage after a rewarding day on the mountain. 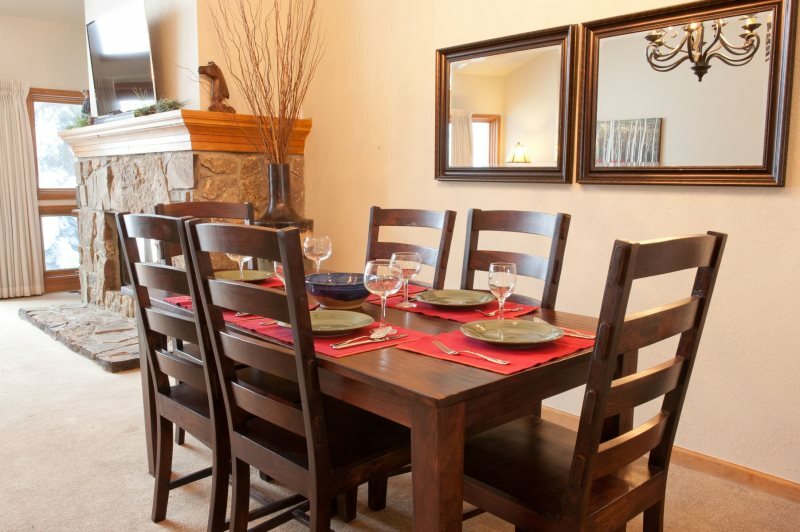 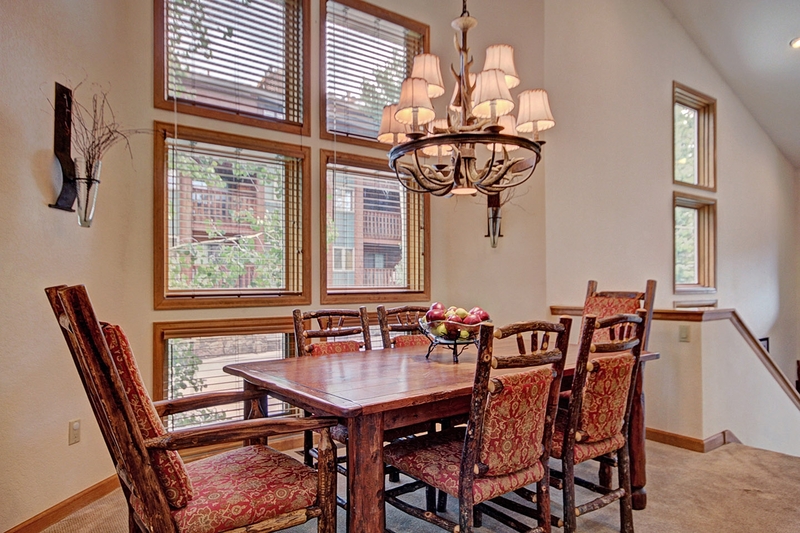 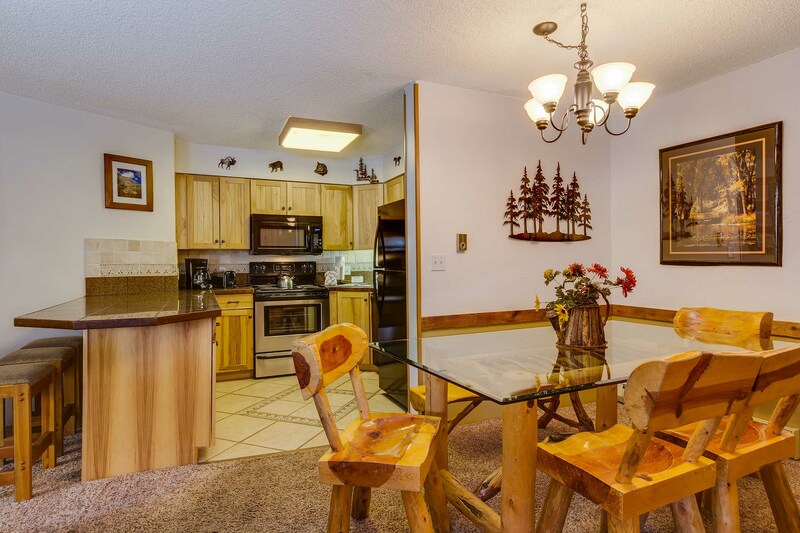 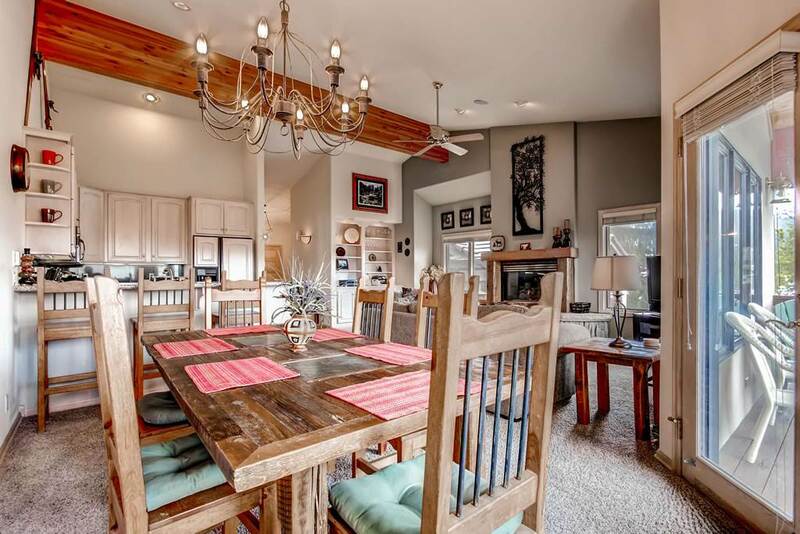 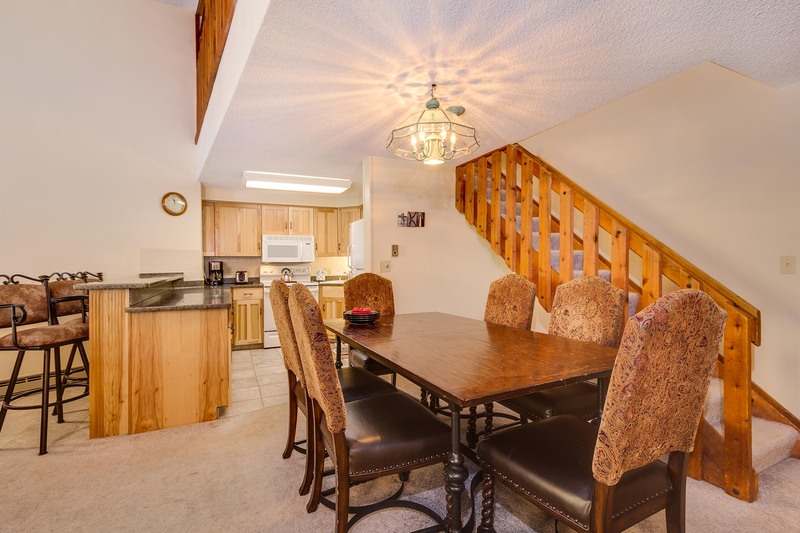 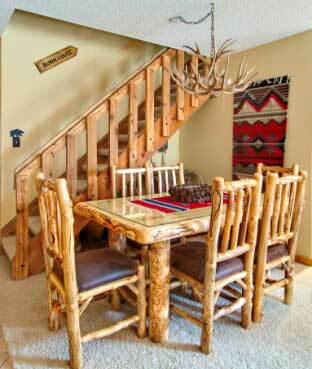 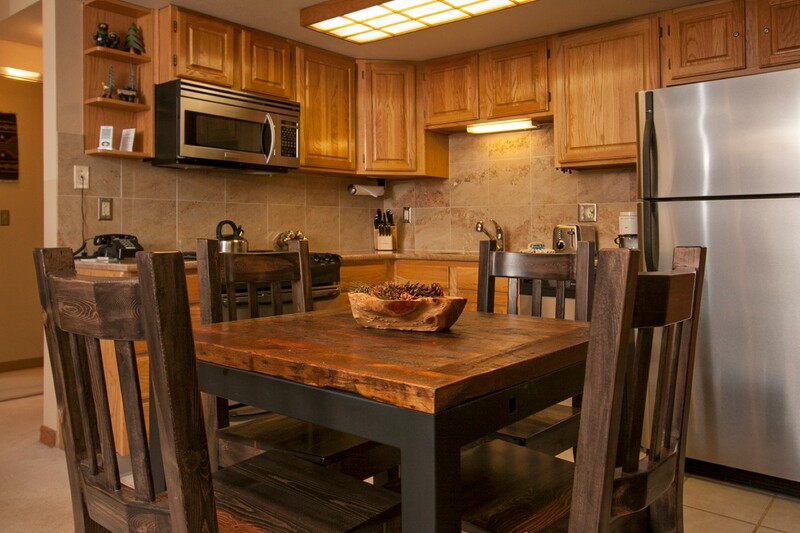 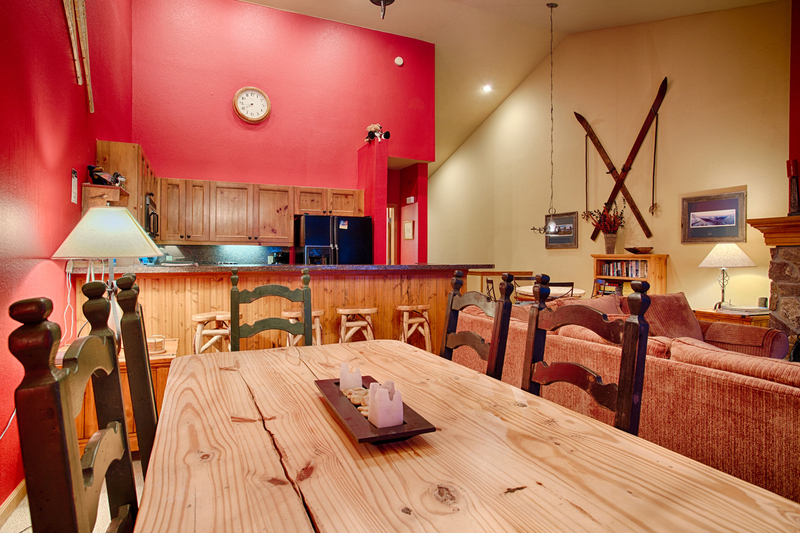 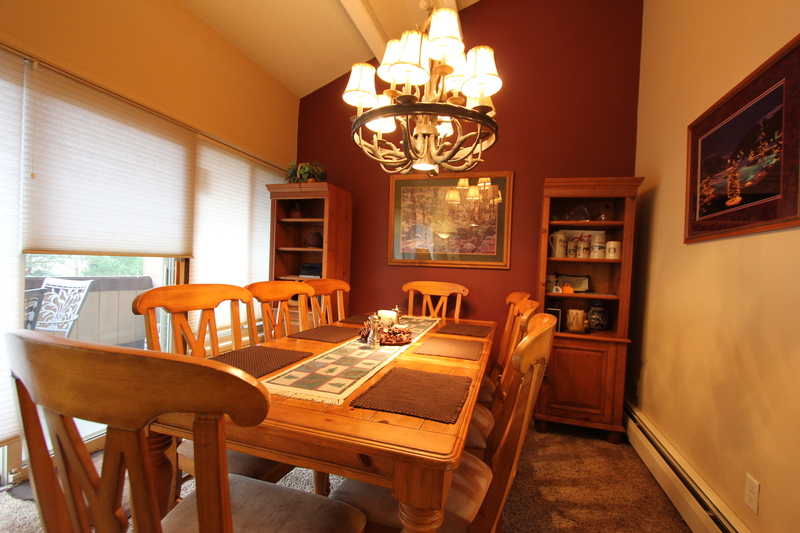 Enjoy a home cooked meal from the comfort of your own unit at the rustic wood dining table with seating for four people. 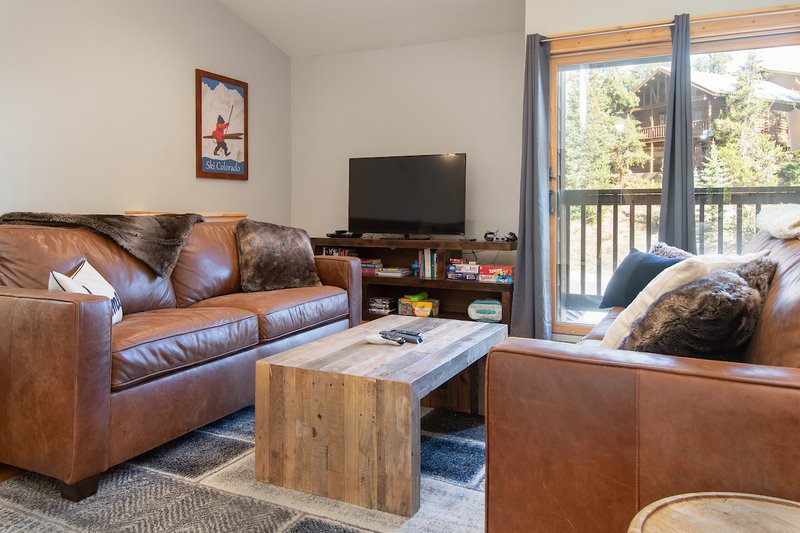 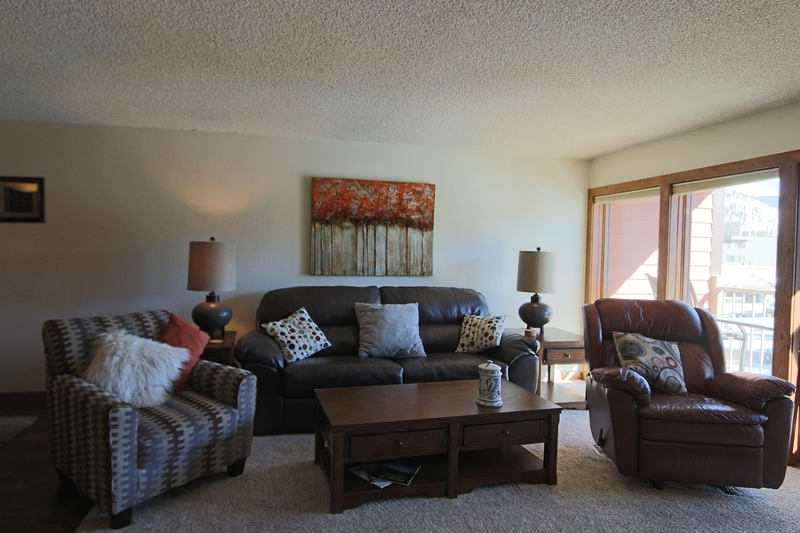 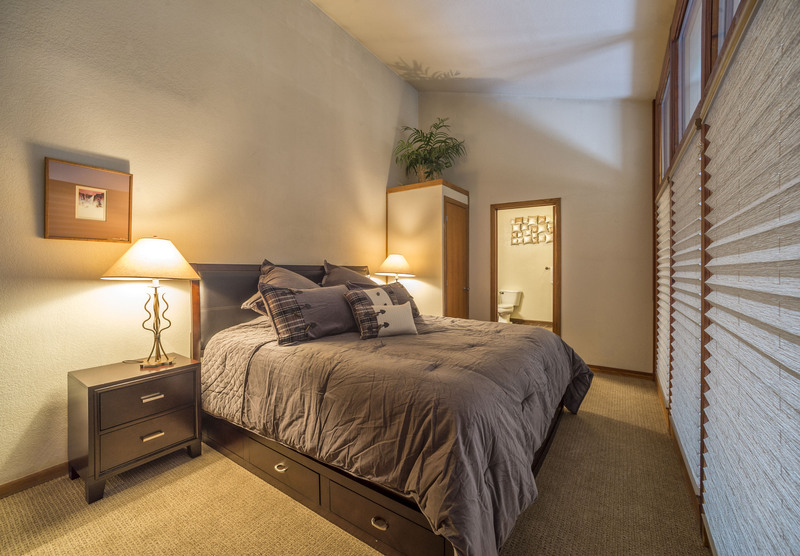 The unit is furnished with a dresser, night stands, coffee table and if you need additional sleeping space, the couch does provide a queen sofa sleeper allowing this unit to accommodate four people. 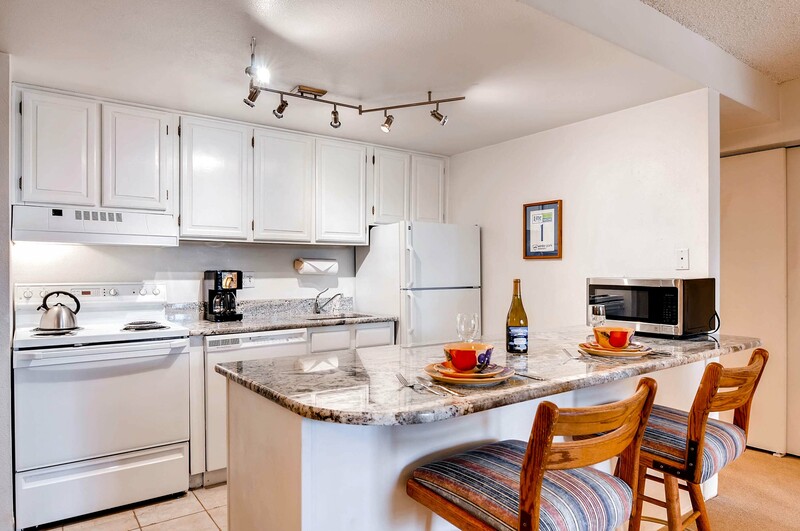 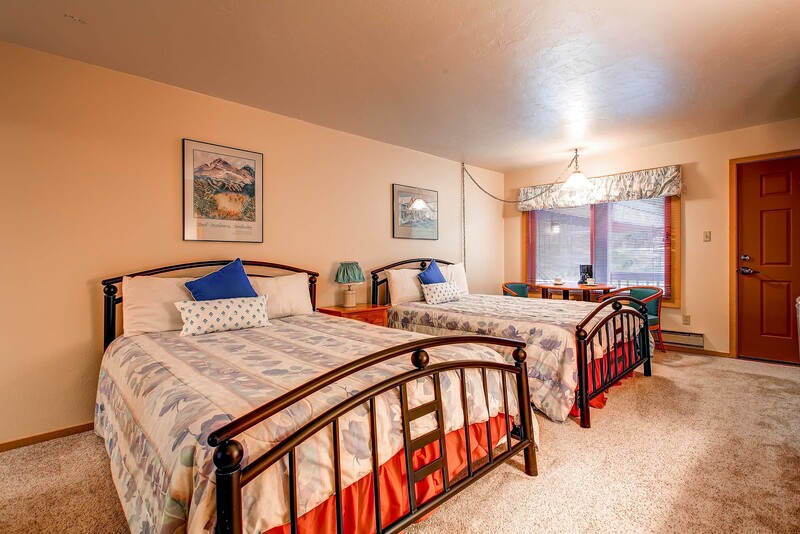 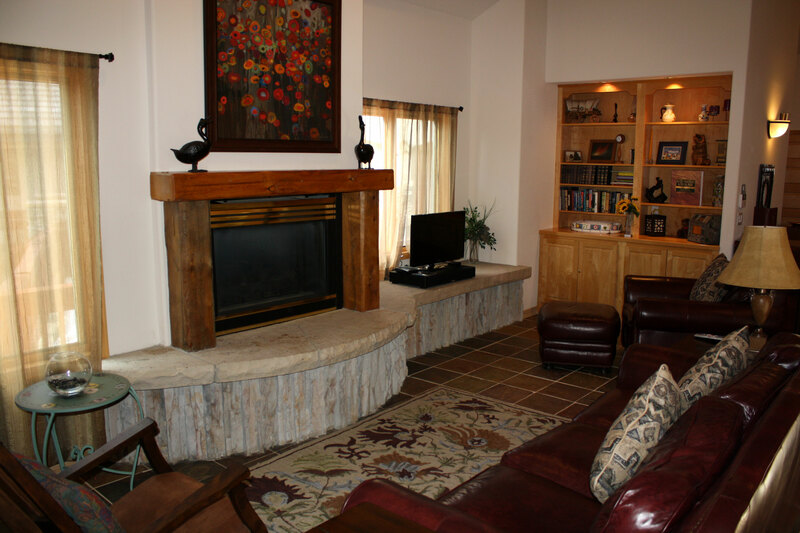 Besides the hot tub, other common areas to the Der Steiermark complex feature the local’s favorite Mi Casa Mexican Restaurant and Cantina located on the middle level, on-site laundry facilities and a heated parking garage.